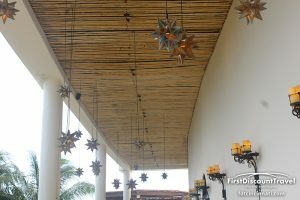 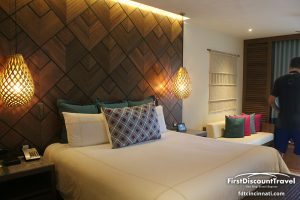 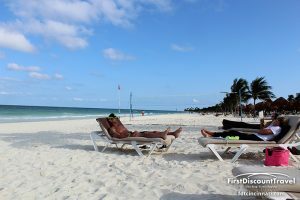 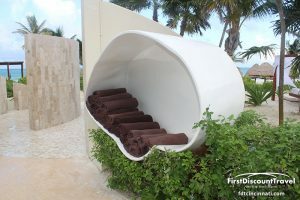 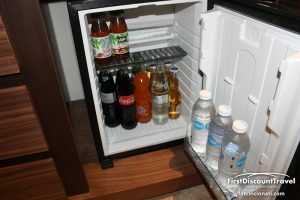 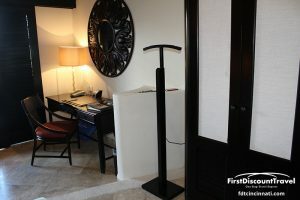 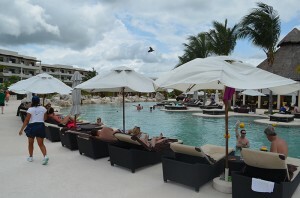 Secrets Maroma Beach Riviera Cancun, a AAA Five Diamond Resort, is tucked away on secluded Maroma Beach, voted the World’s Best Beach by the Travel Channel four years in a row. 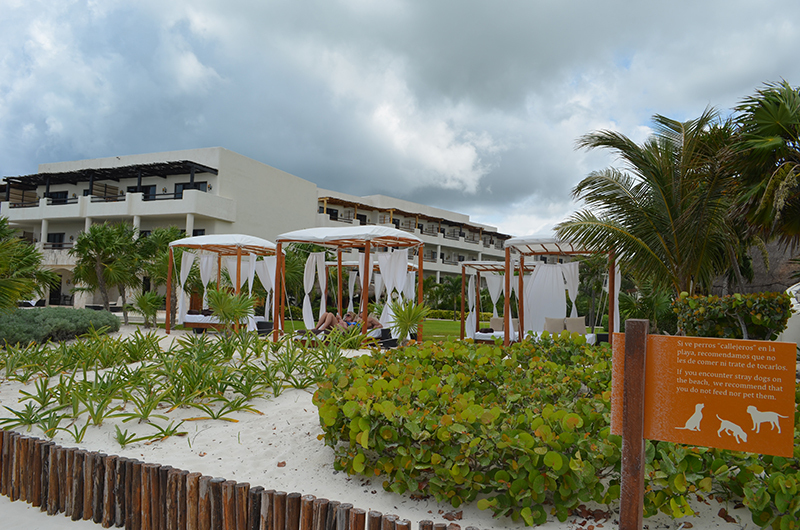 This Unlimited-Luxury® haven provides opulence to the most discerning traveler with apure white sand beach and stunning ocean views stretching as far as the eye can see, yet is located only 20 miles south of Cancun’s International Airport. 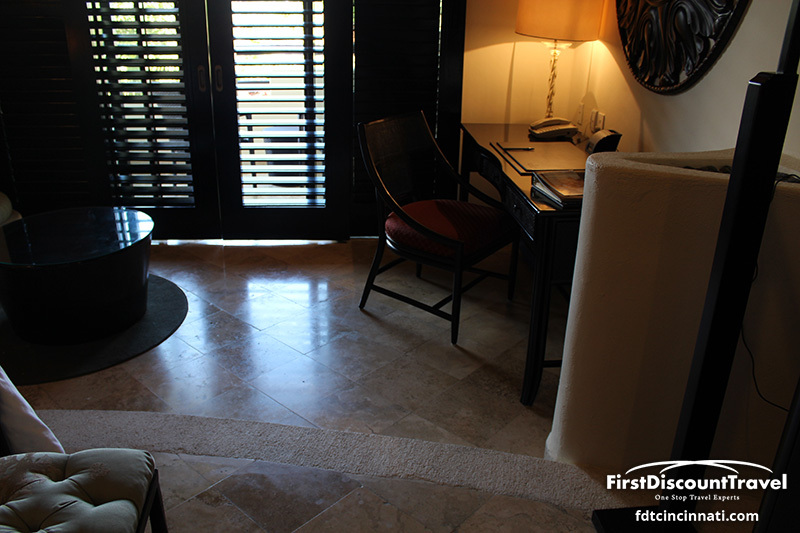 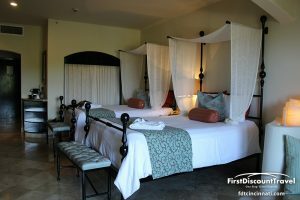 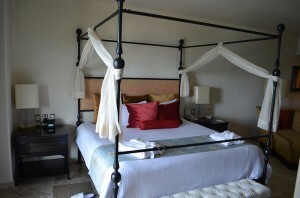 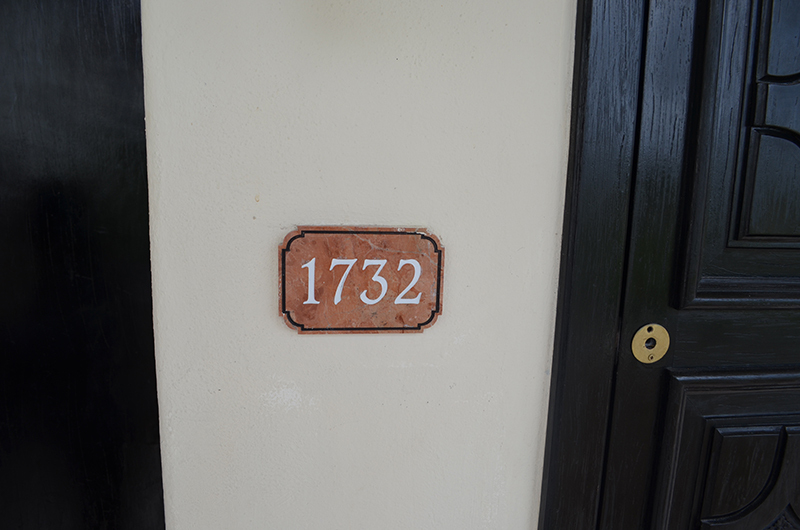 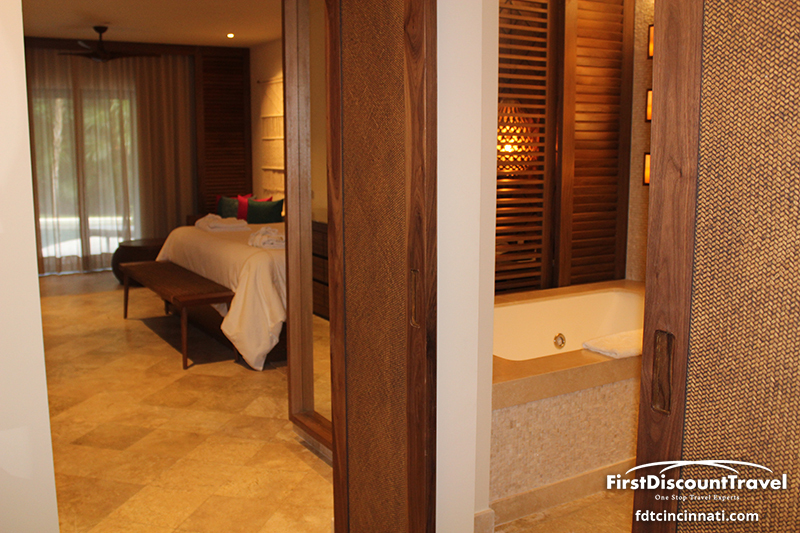 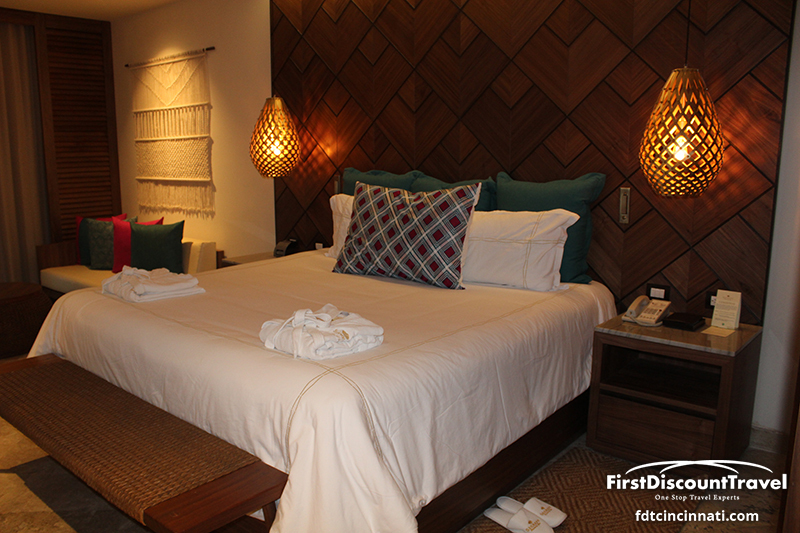 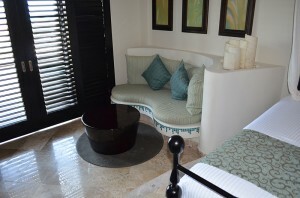 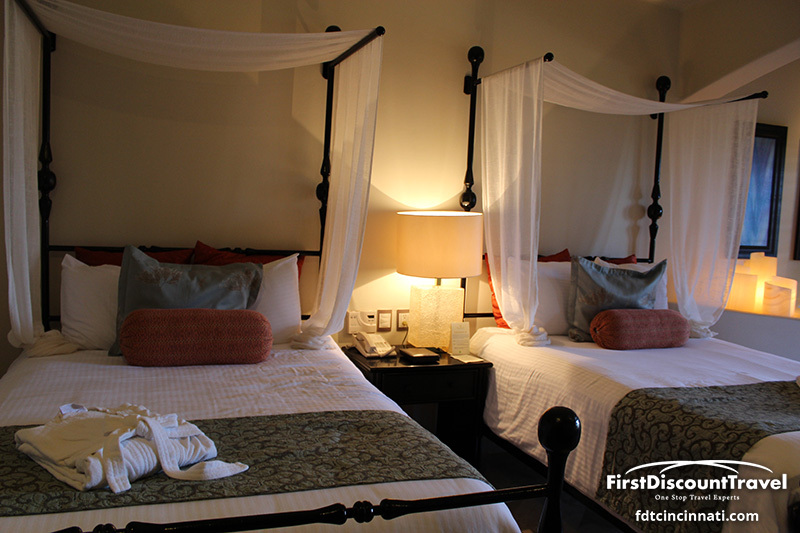 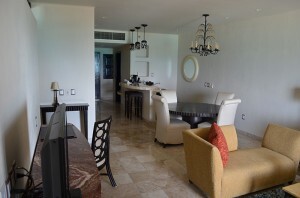 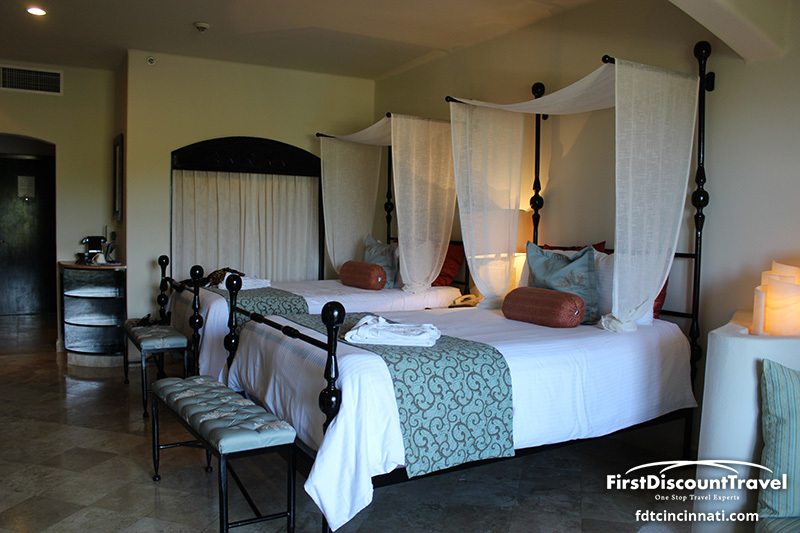 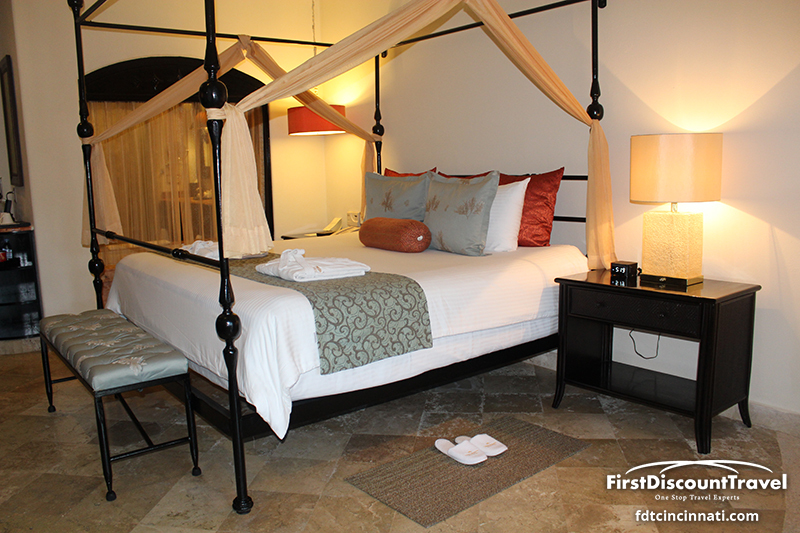 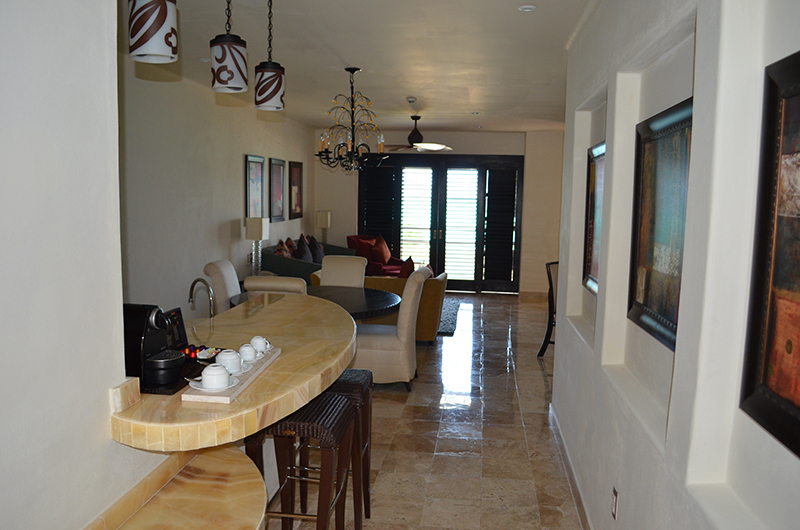 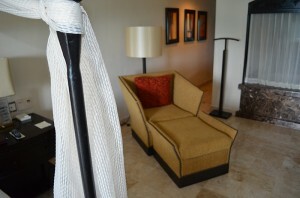 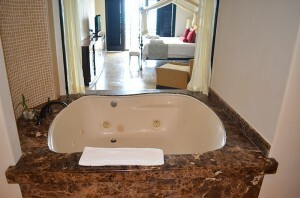 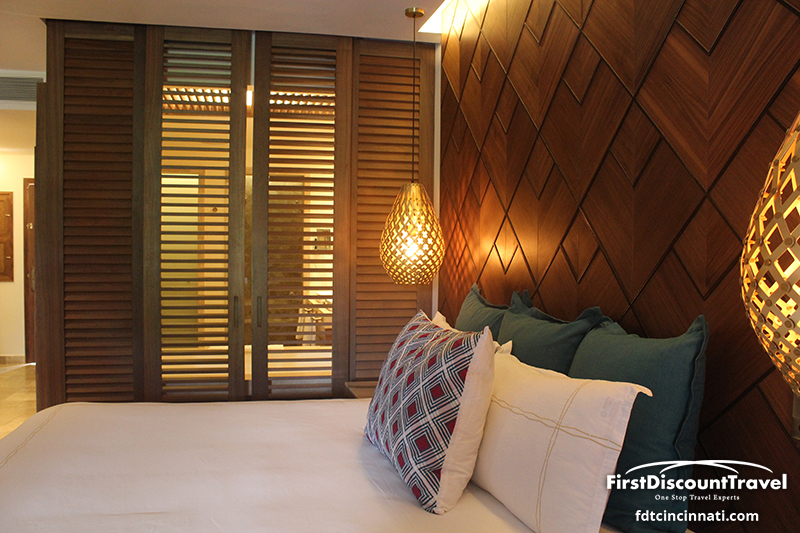 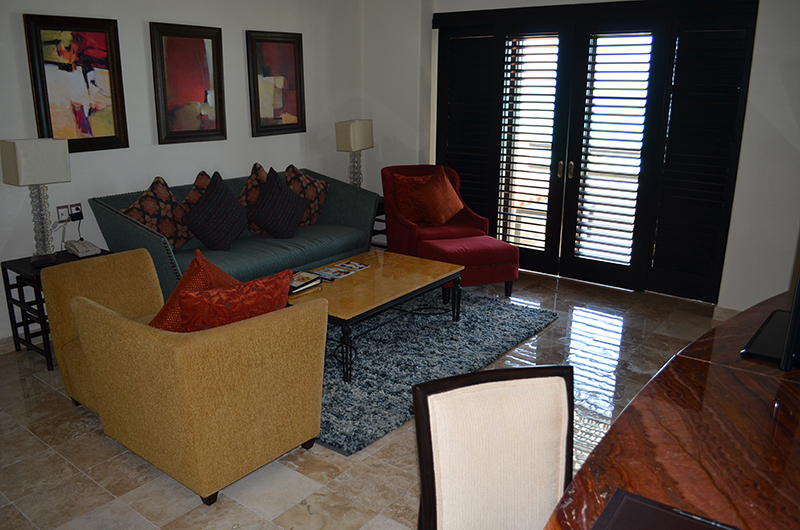 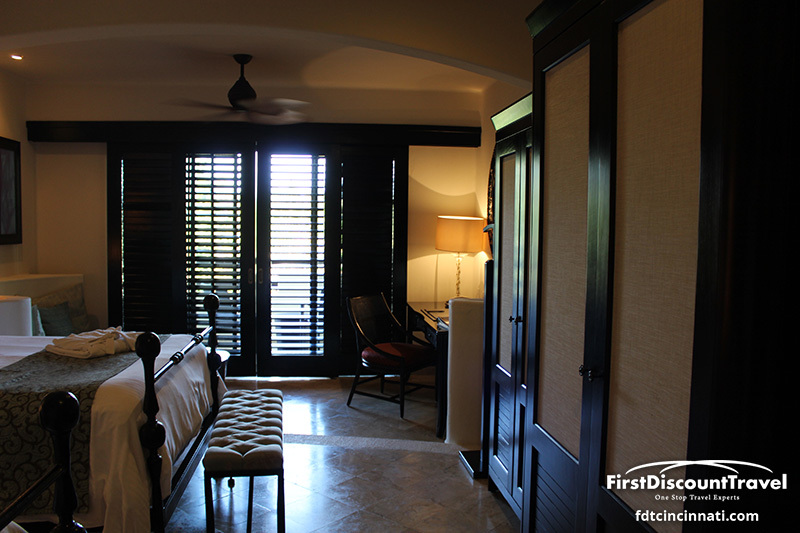 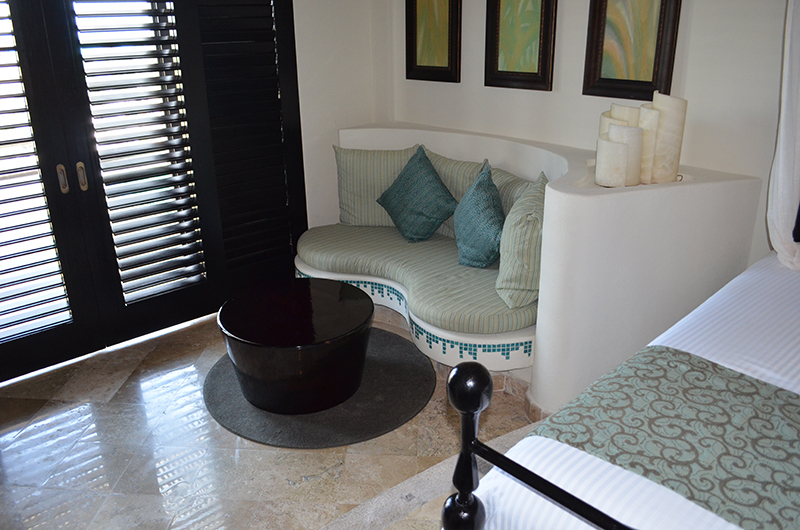 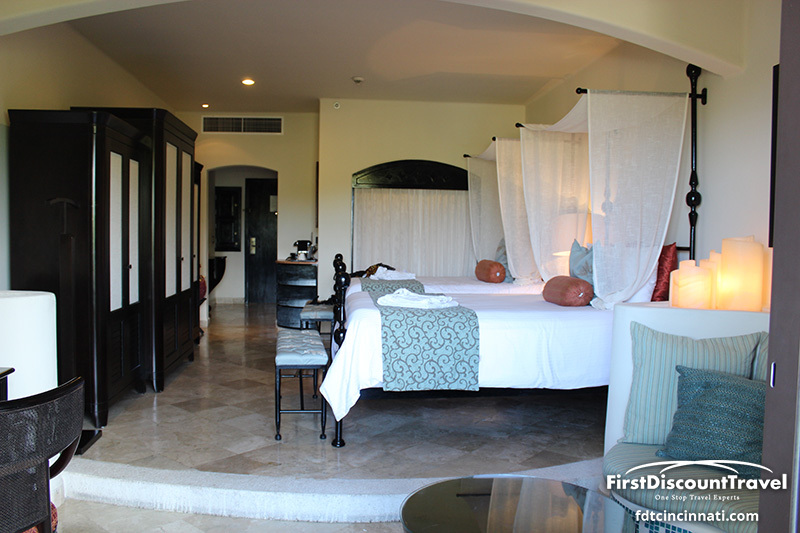 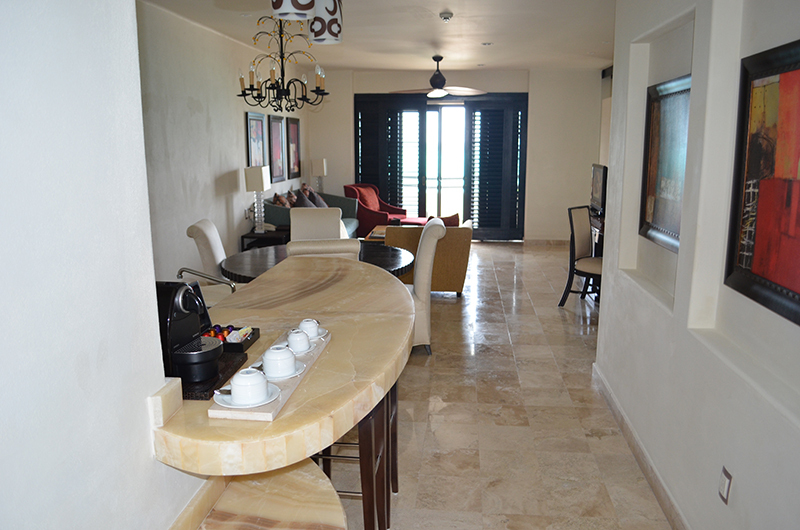 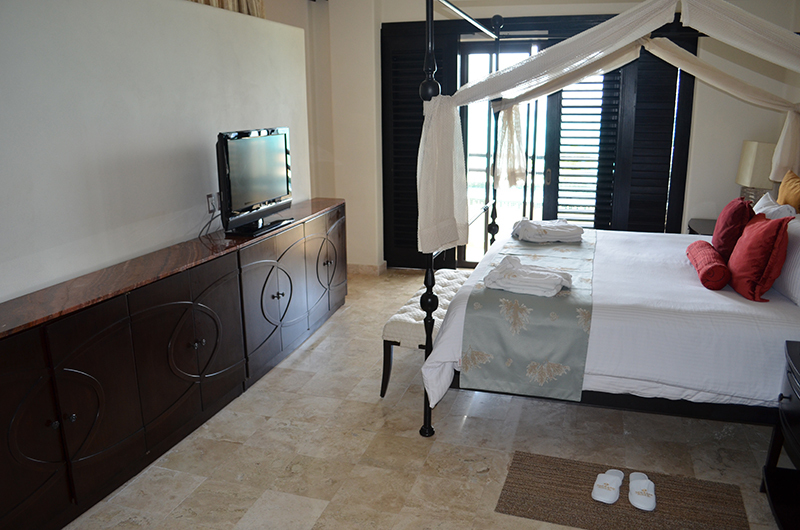 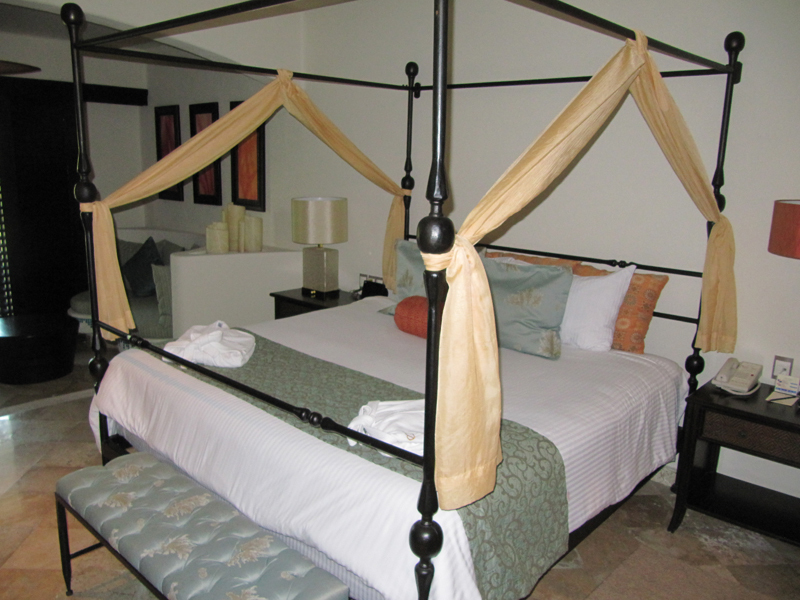 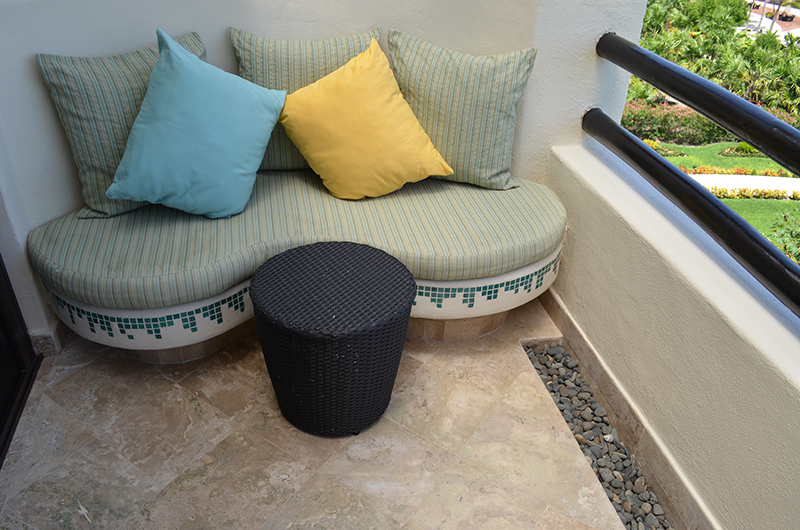 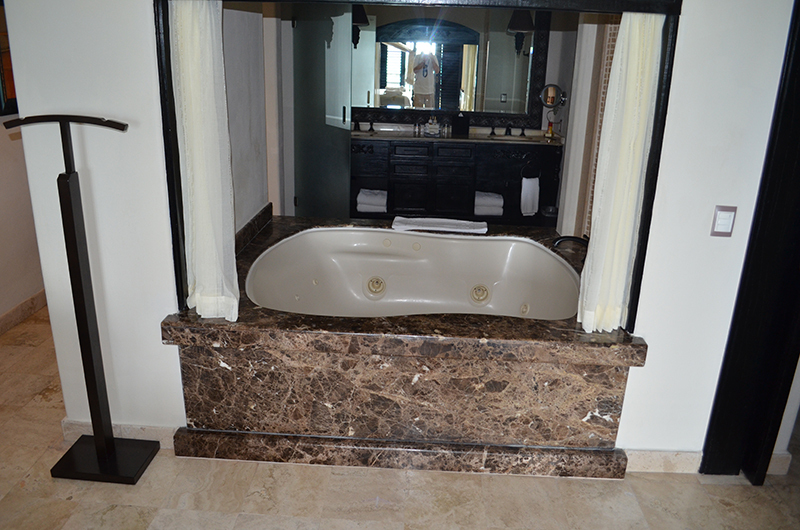 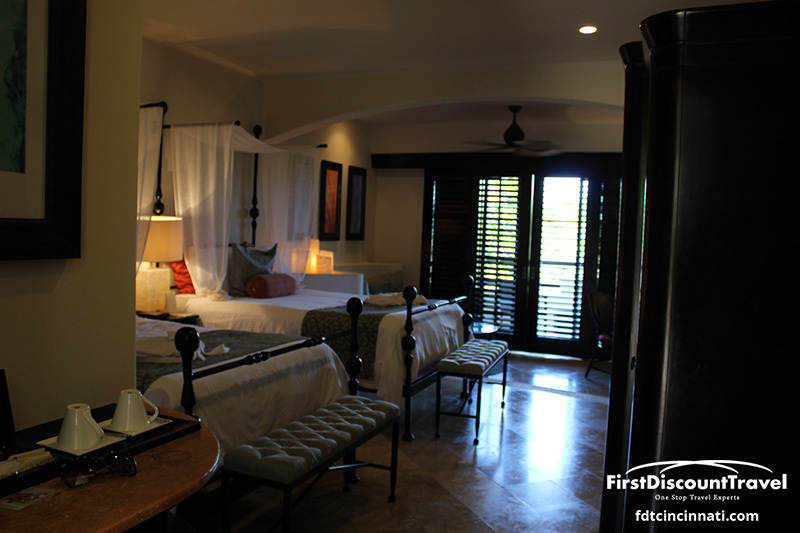 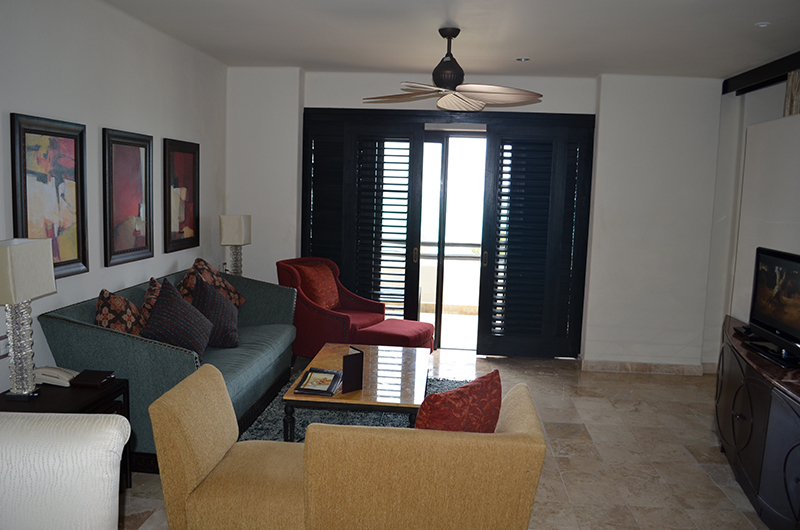 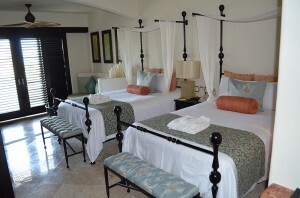 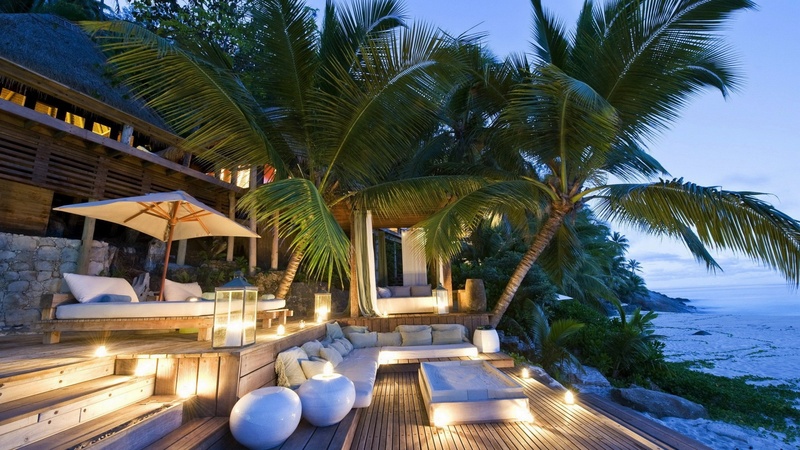 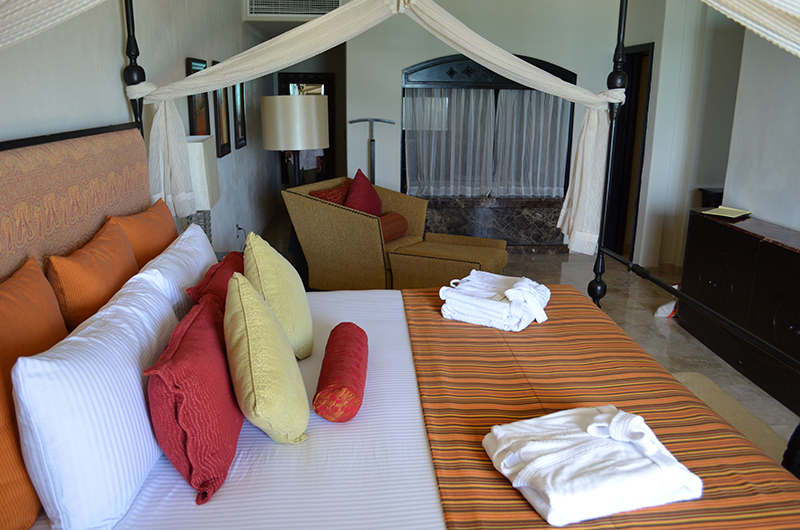 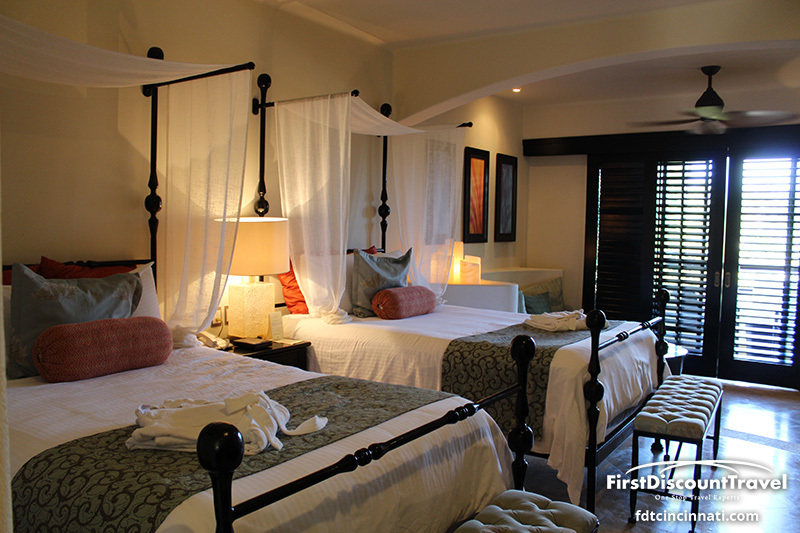 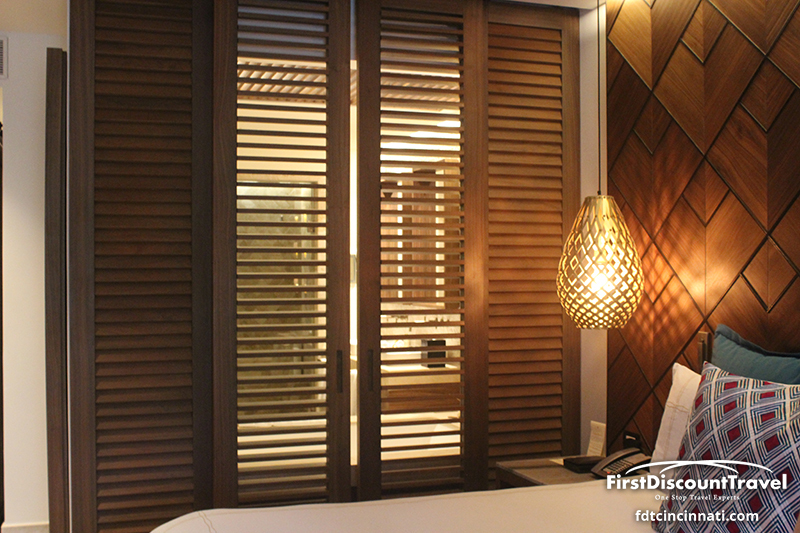 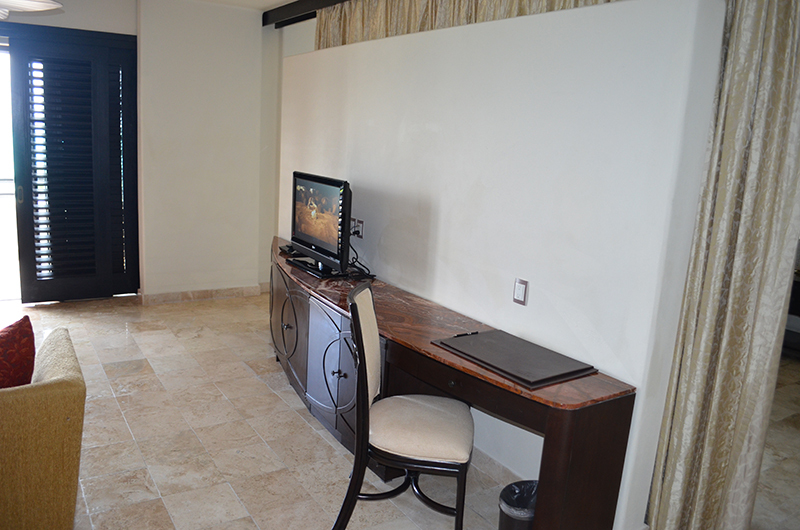 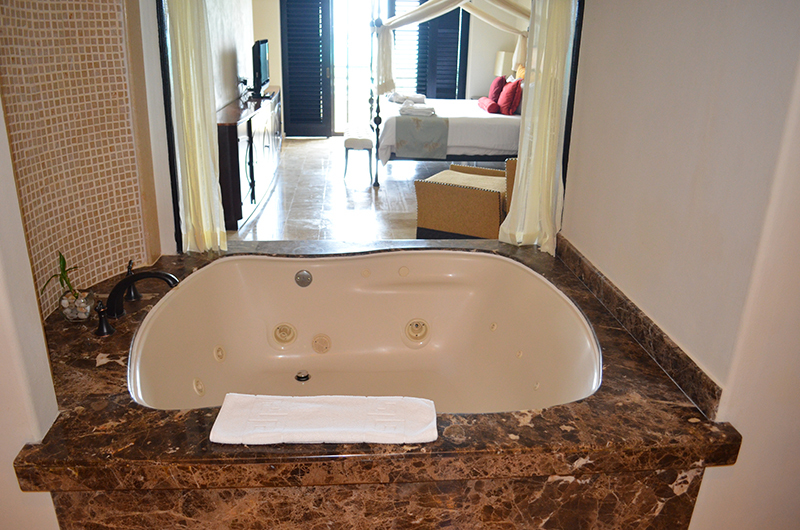 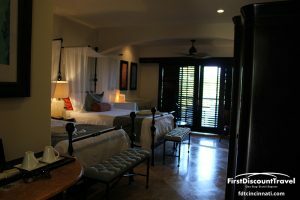 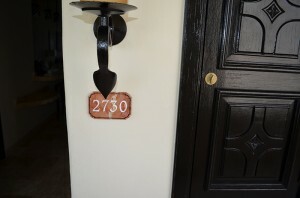 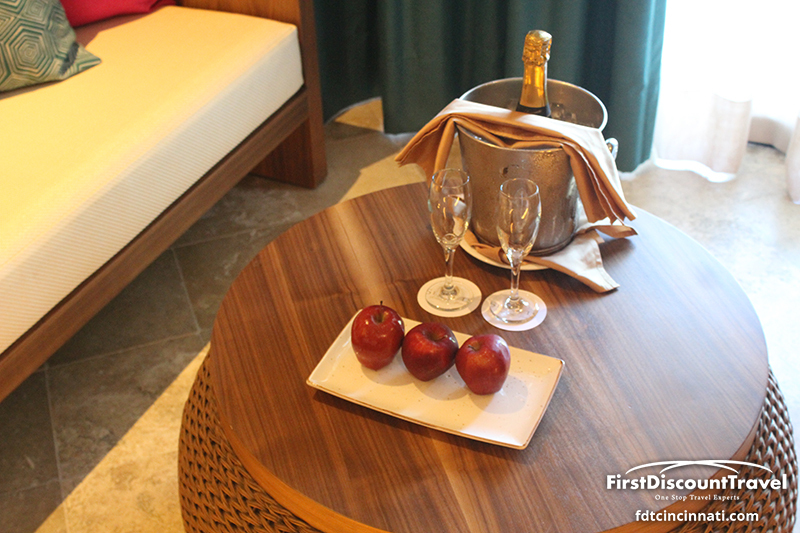 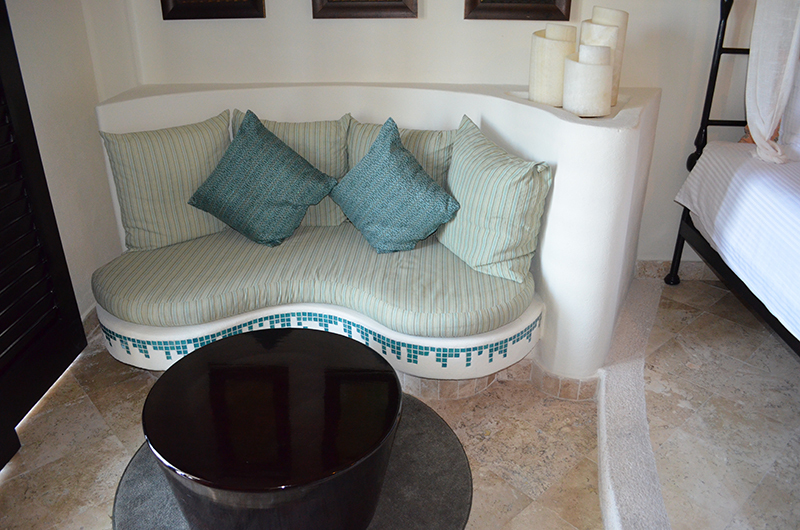 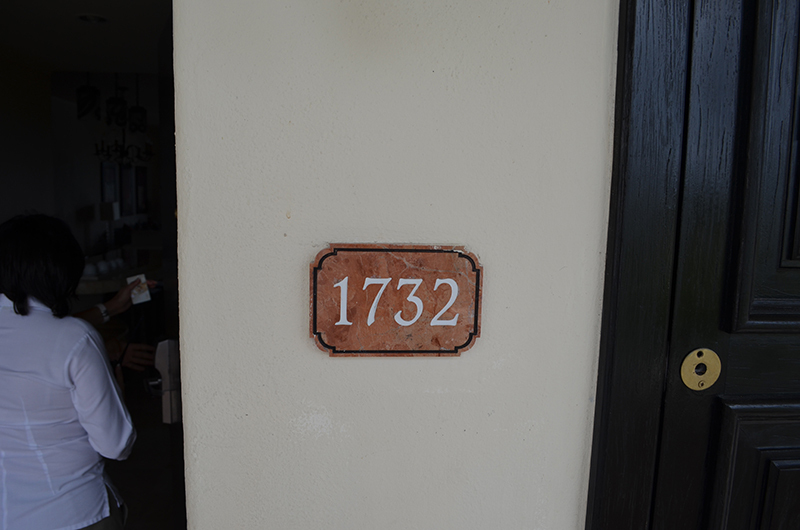 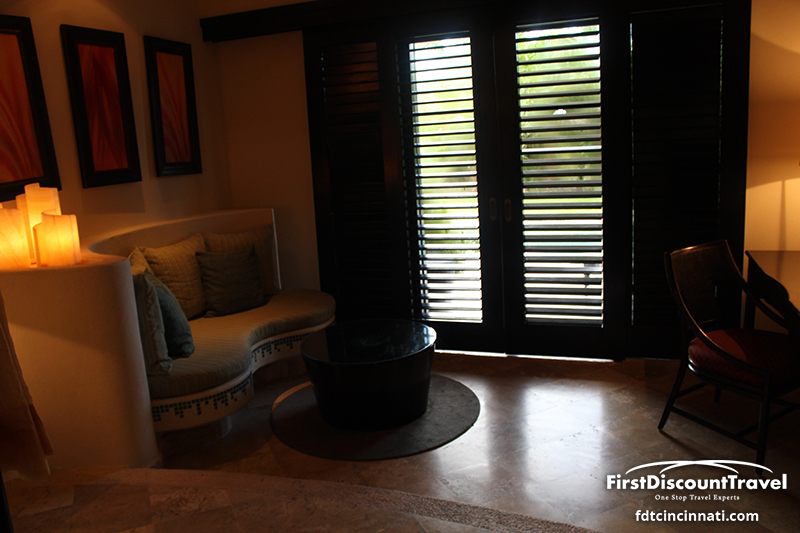 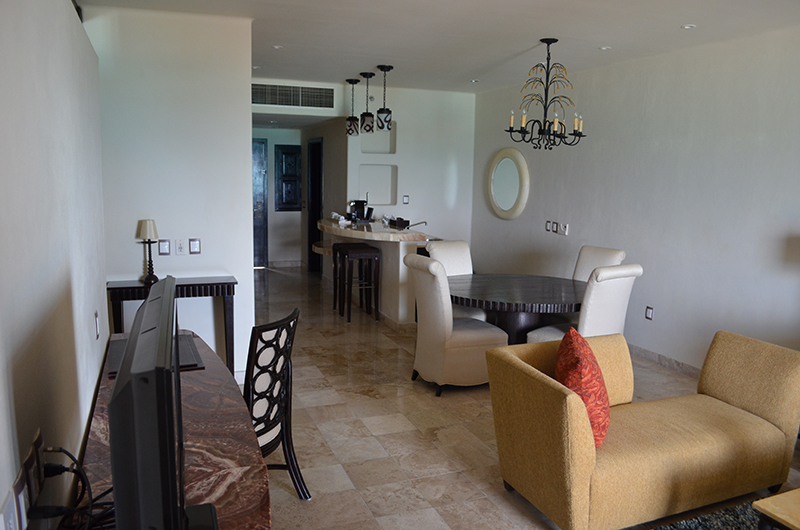 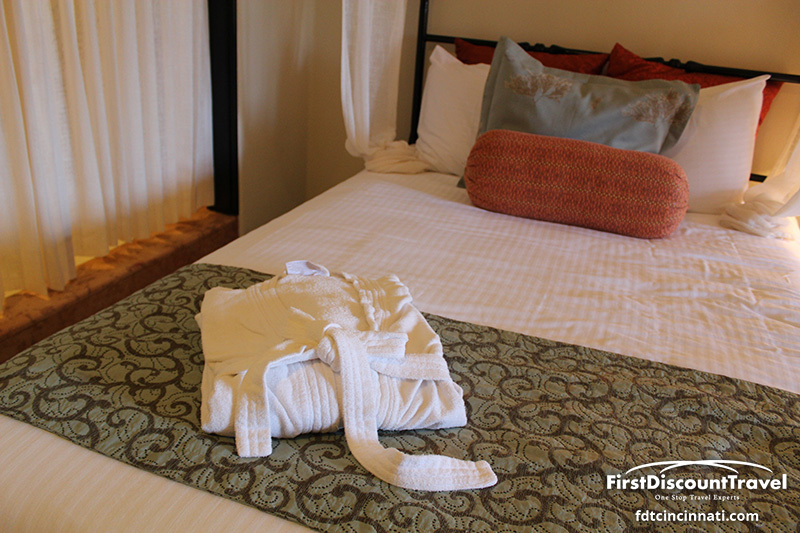 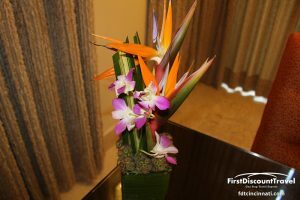 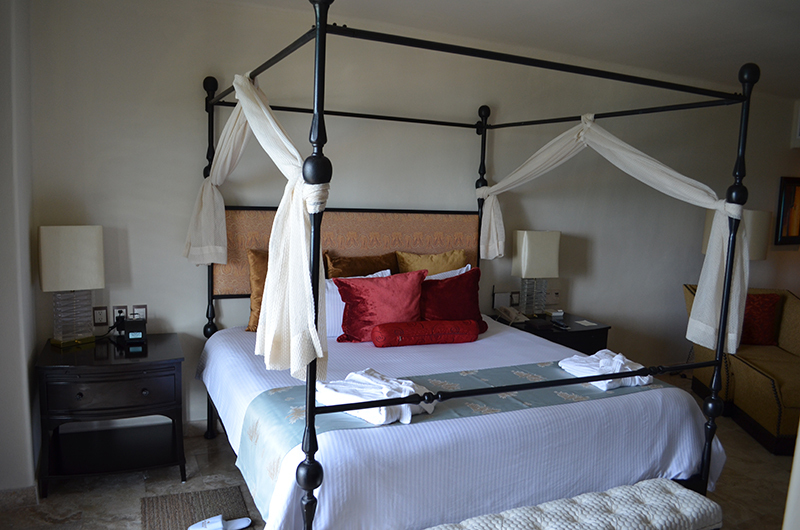 Each suite is truly deluxe featuring inspiring views of the expansive gardens or crystal-clear Caribbean. 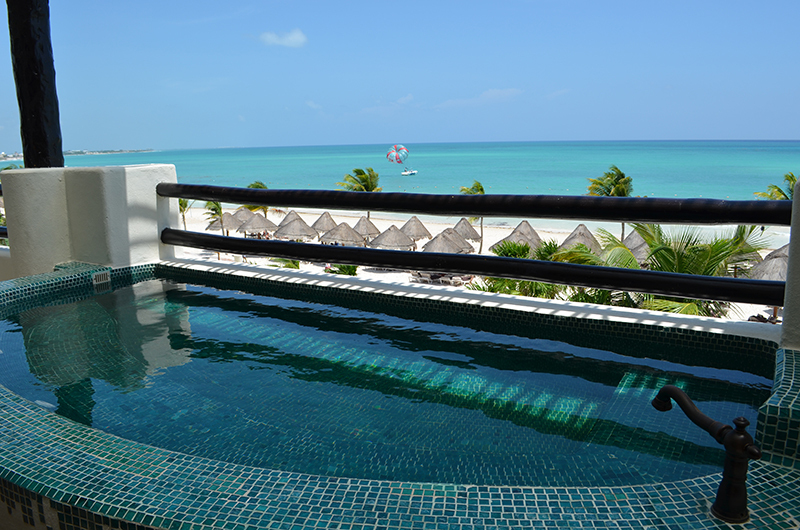 Twelve smaller pools offer several suites private swim out access, while the pristine infinity pool provides breathtaking views stretching to the horizon. 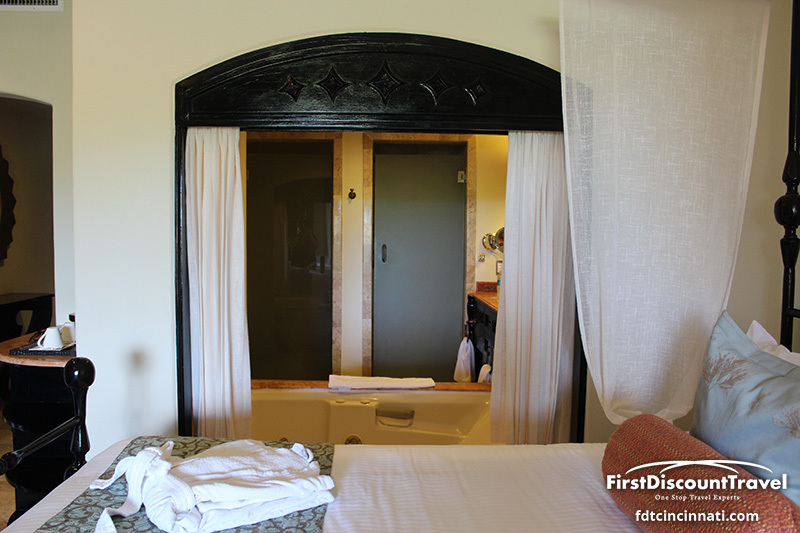 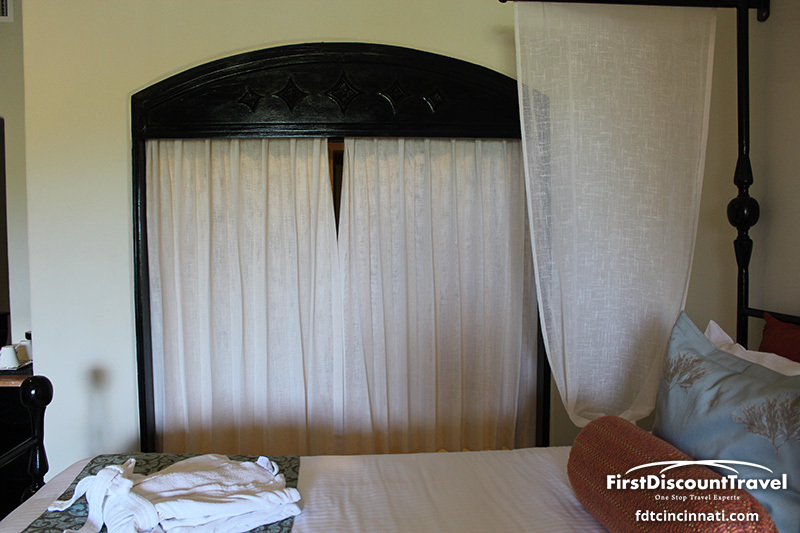 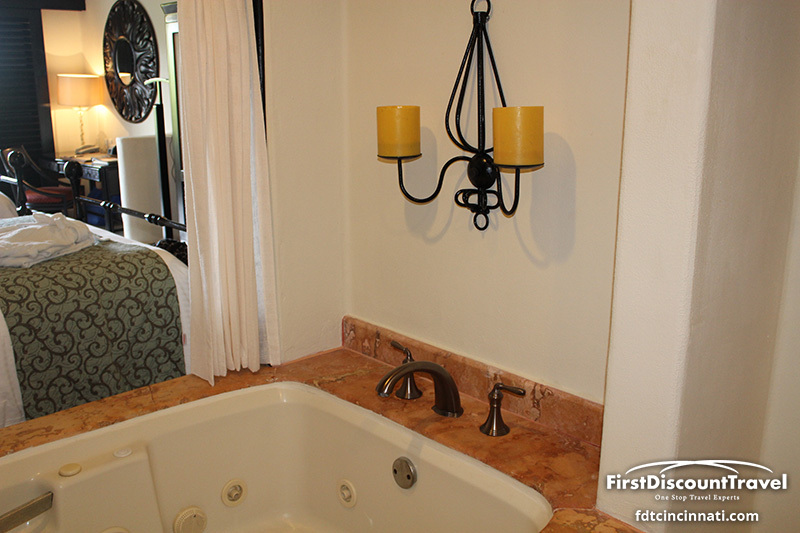 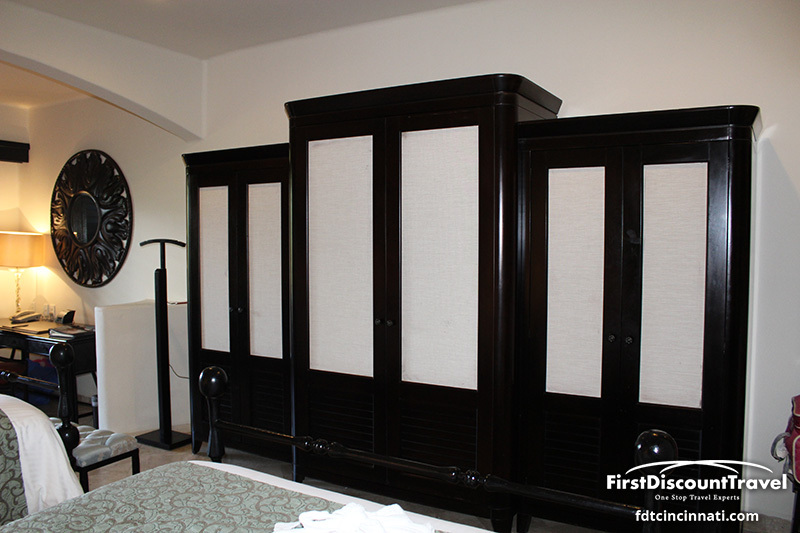 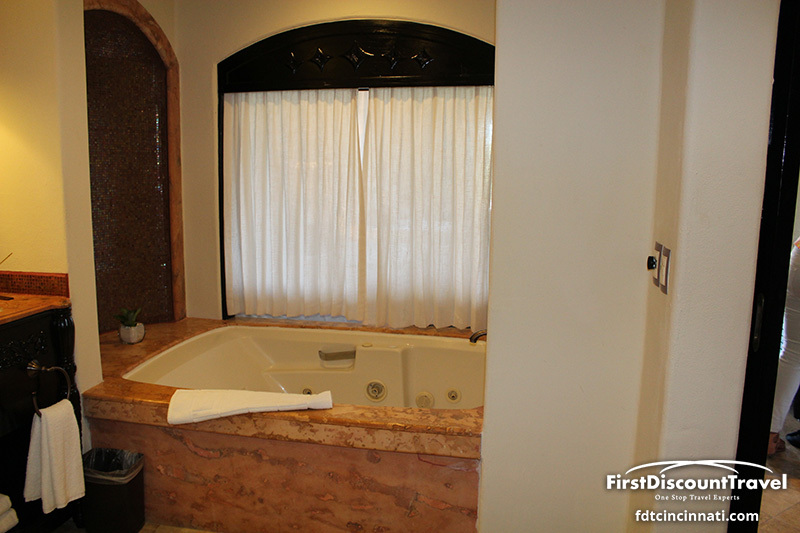 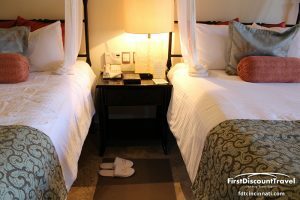 Finely-appointed suites offer four-poster canopy king size beds, private and furnished terraces with plunge tubs, full Italian marble bathrooms with jetted whirlpool baths, daily refreshed mini-bars and 24-hour room and concierge services. 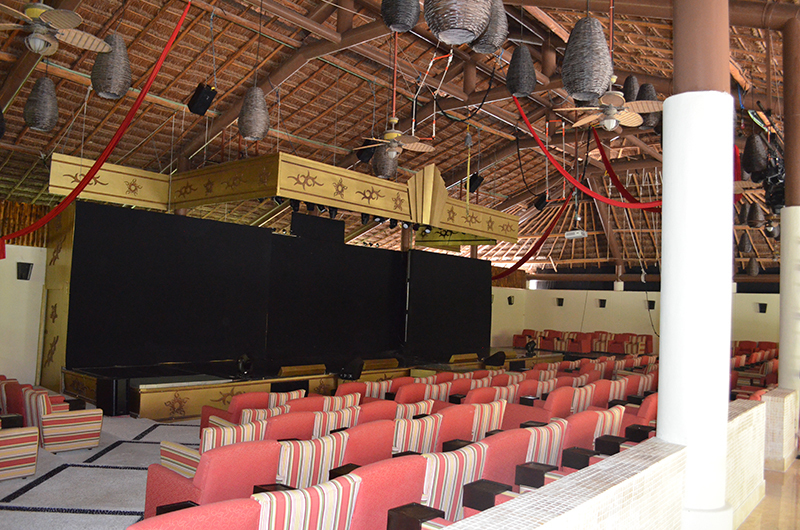 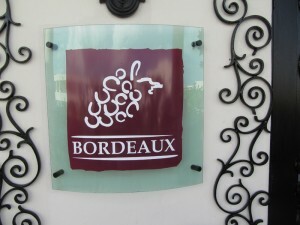 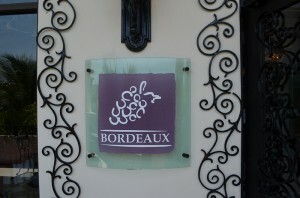 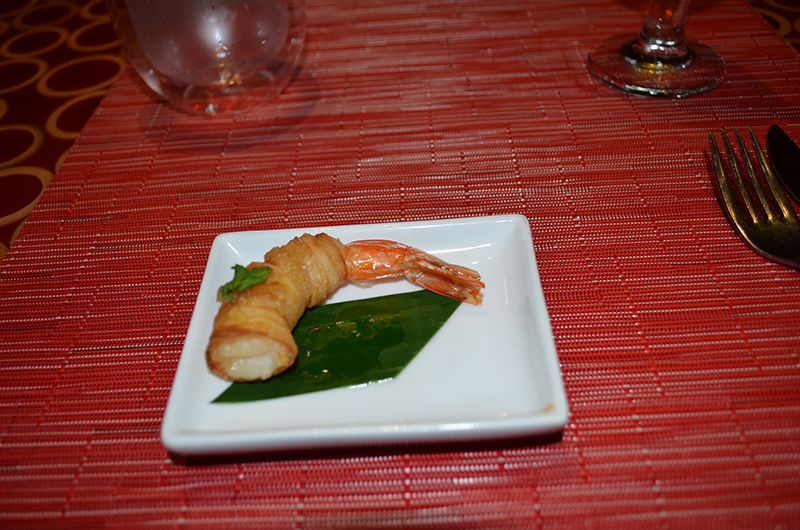 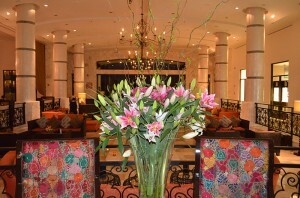 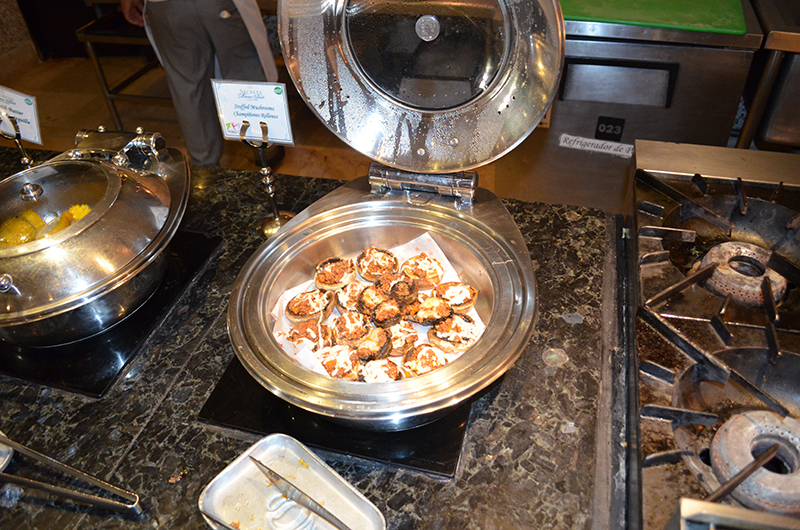 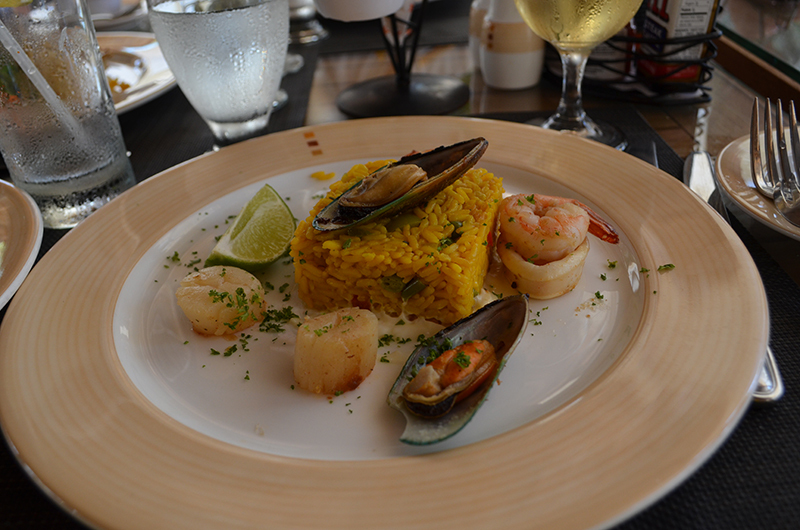 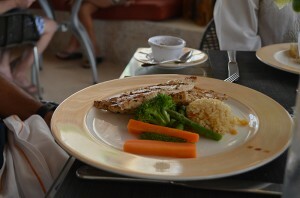 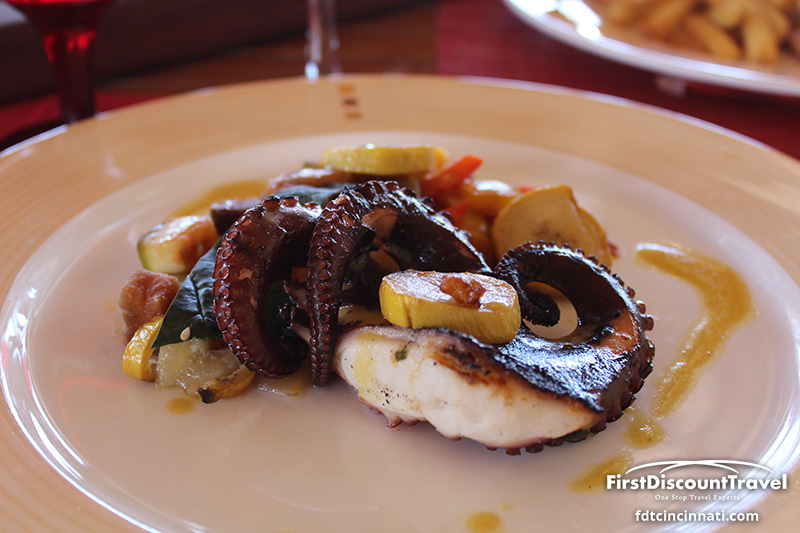 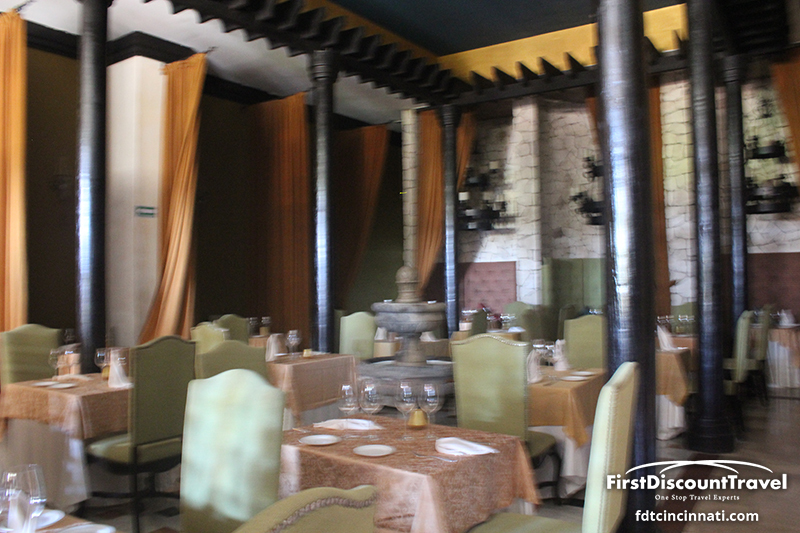 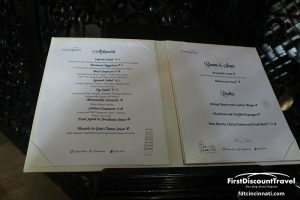 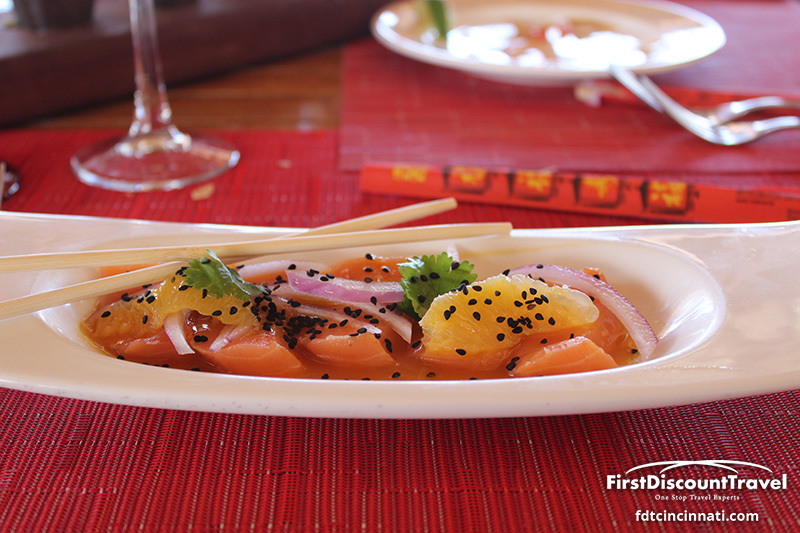 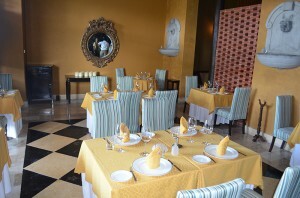 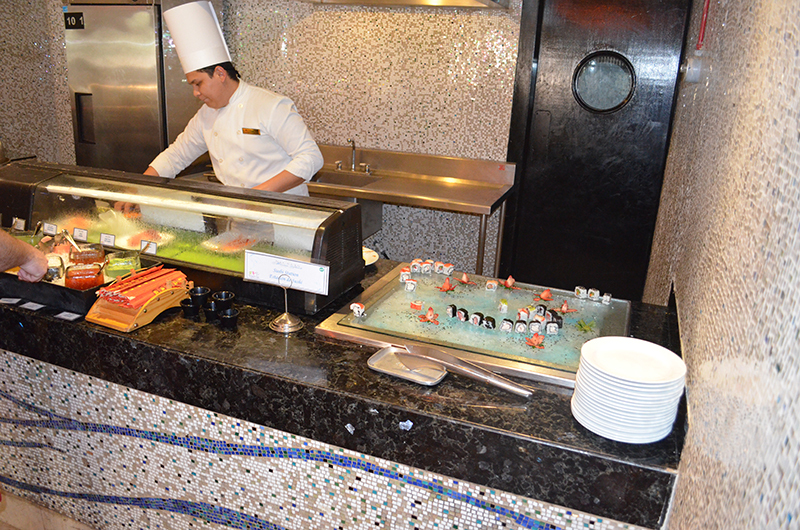 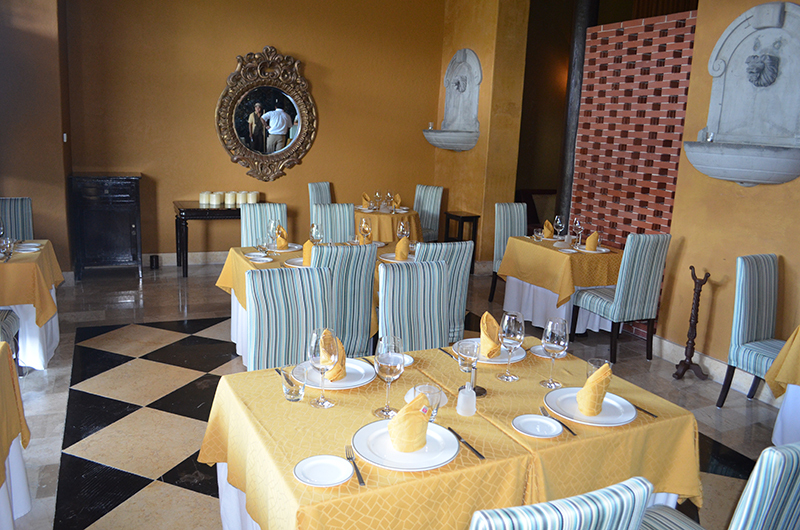 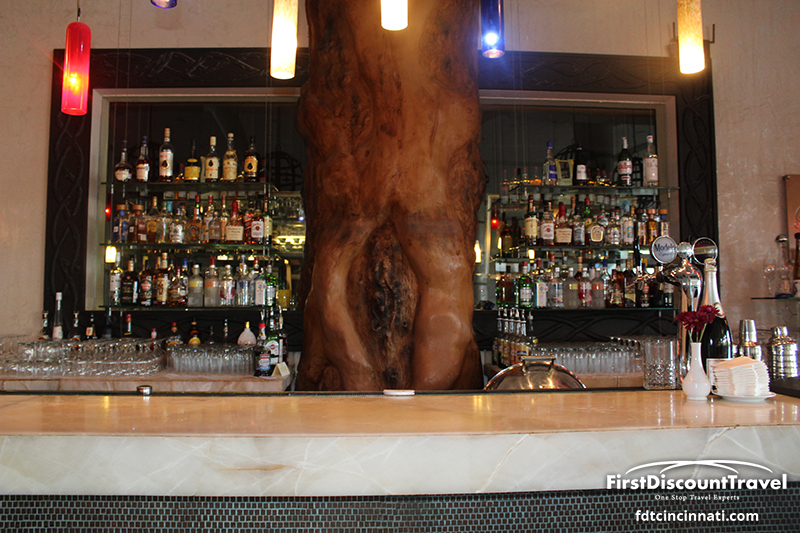 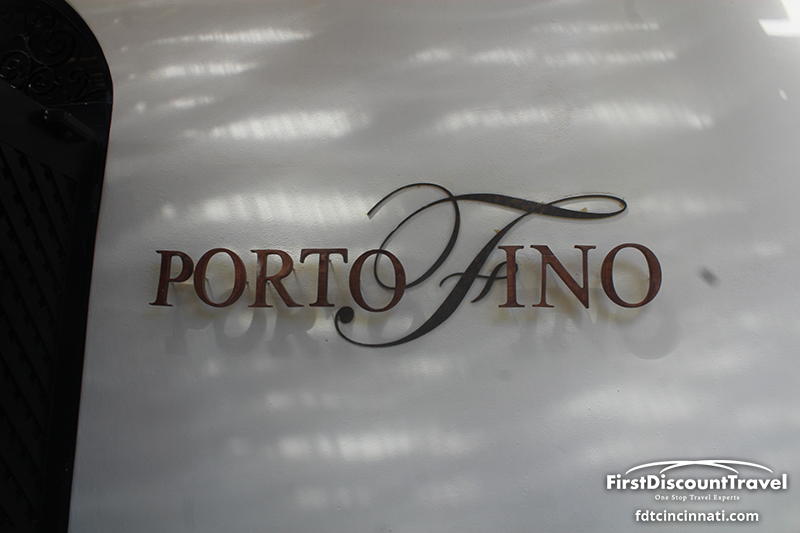 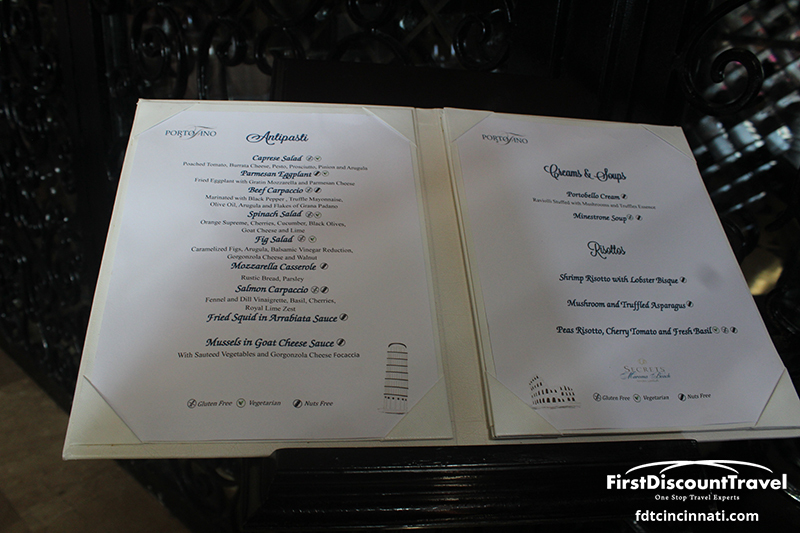 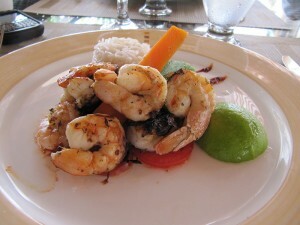 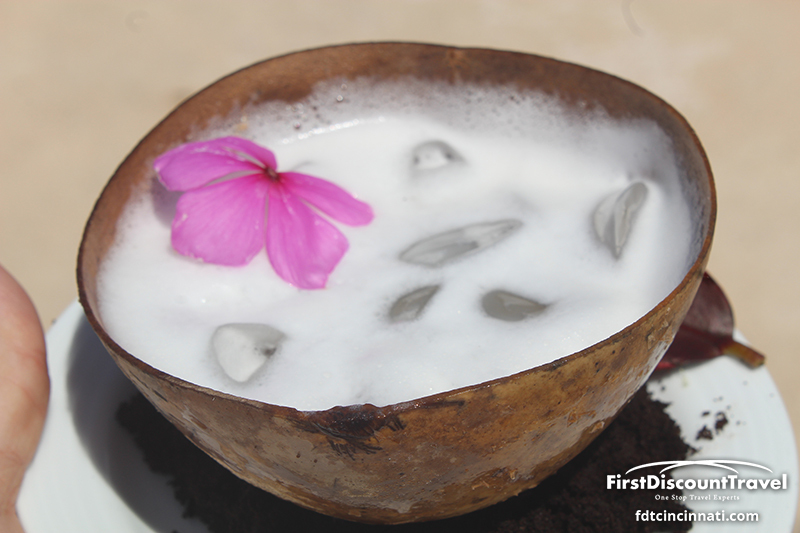 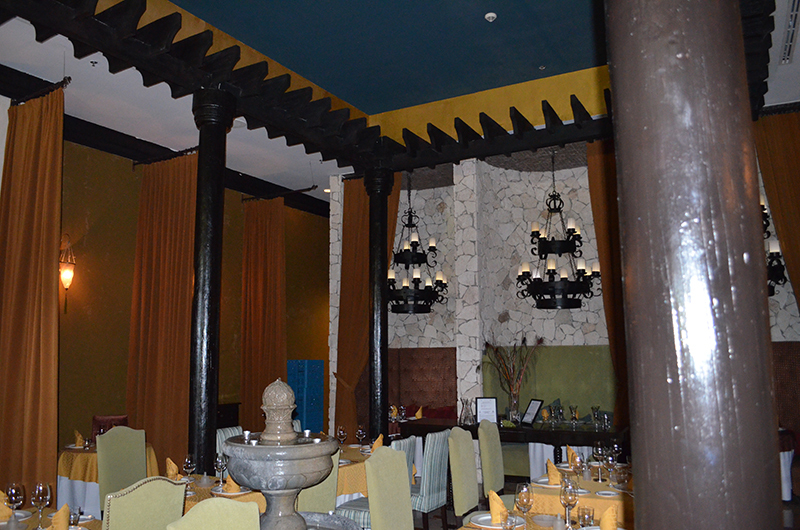 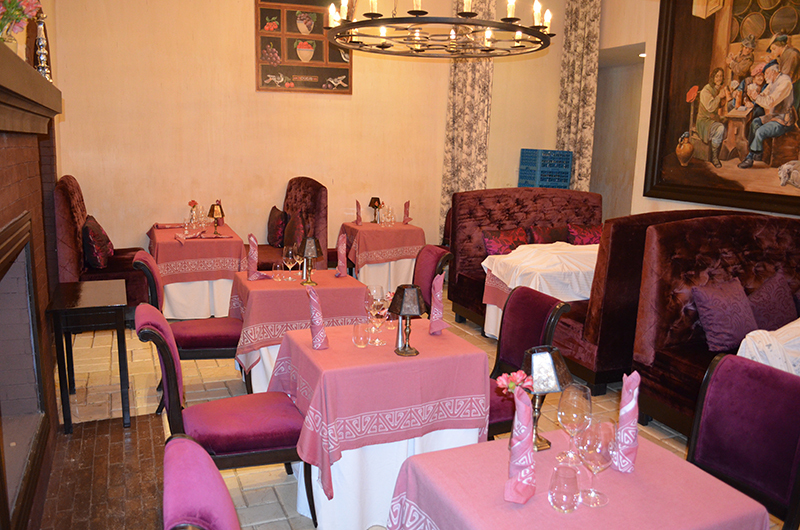 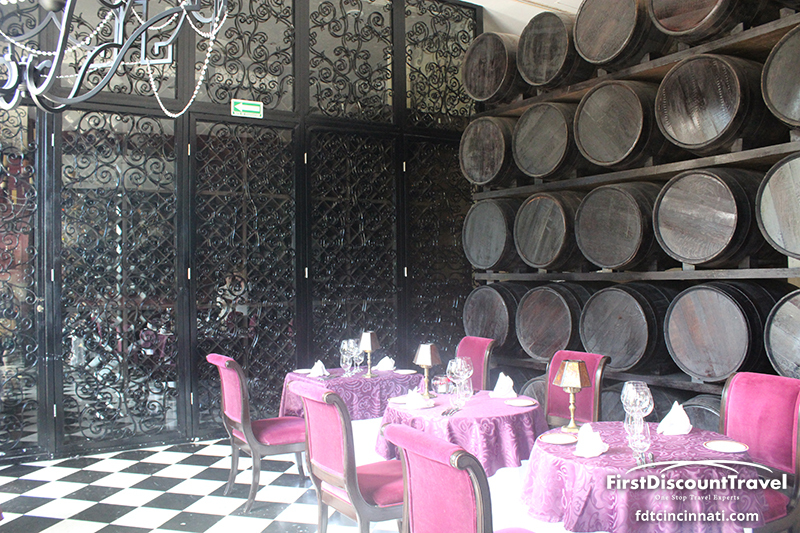 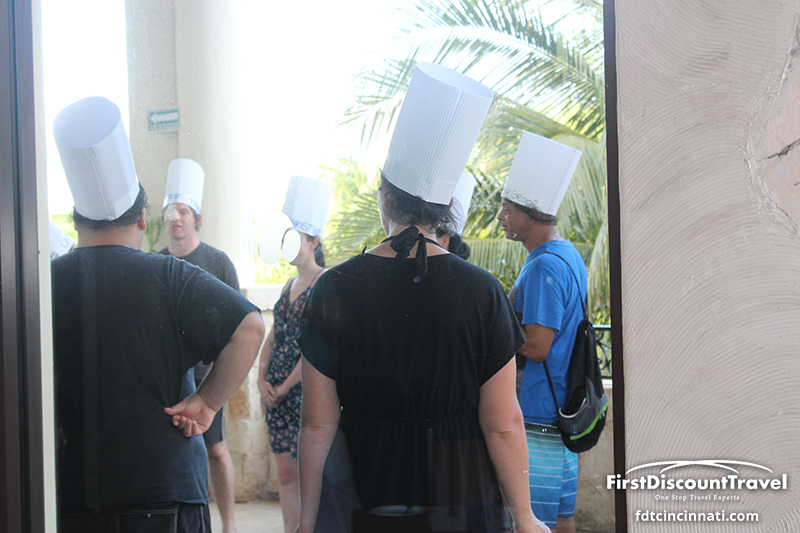 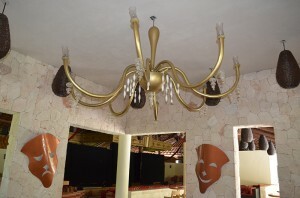 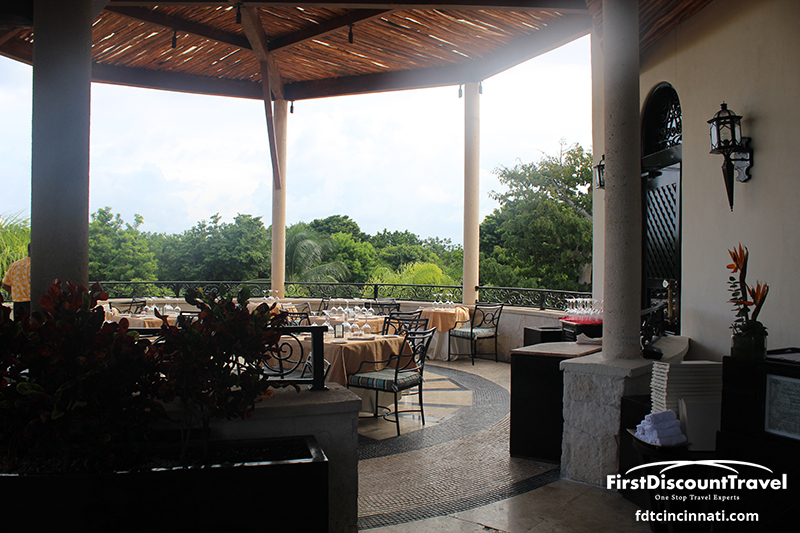 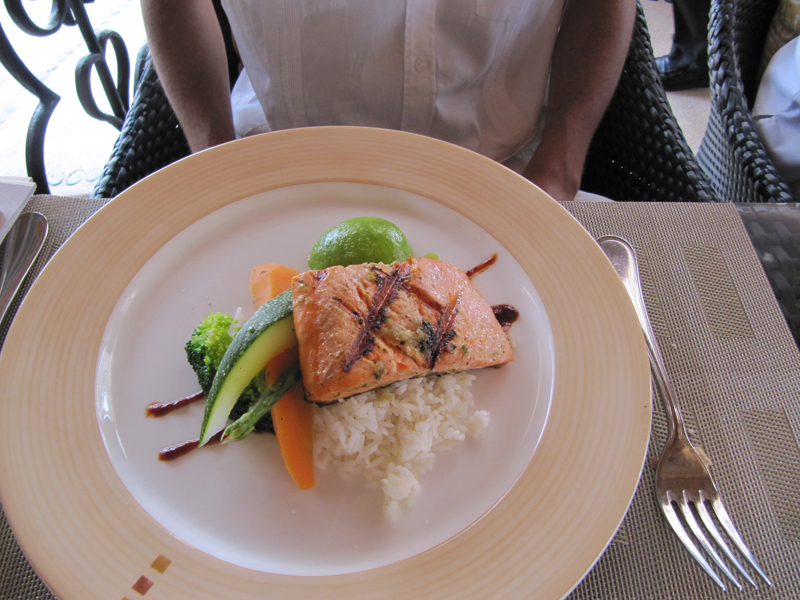 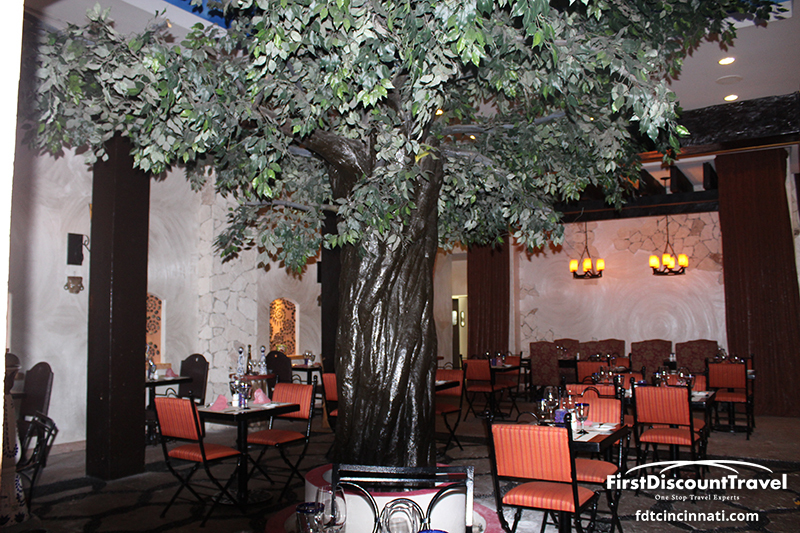 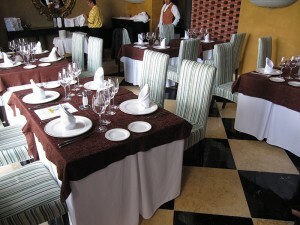 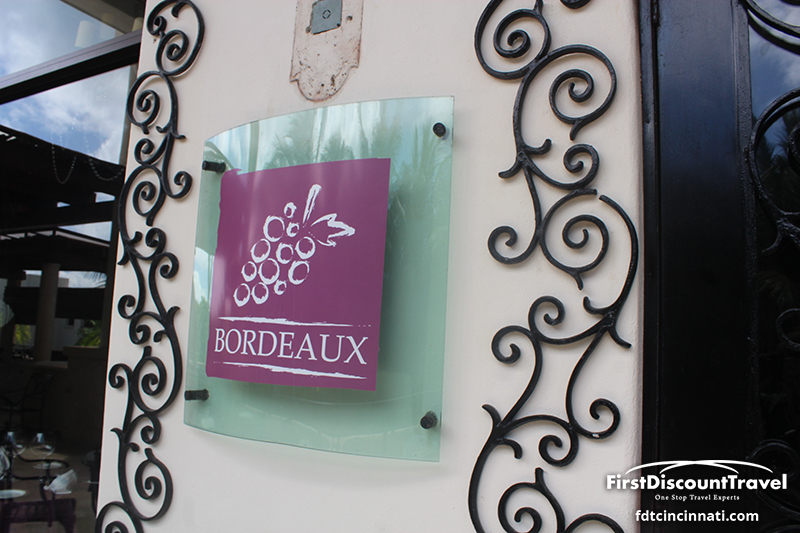 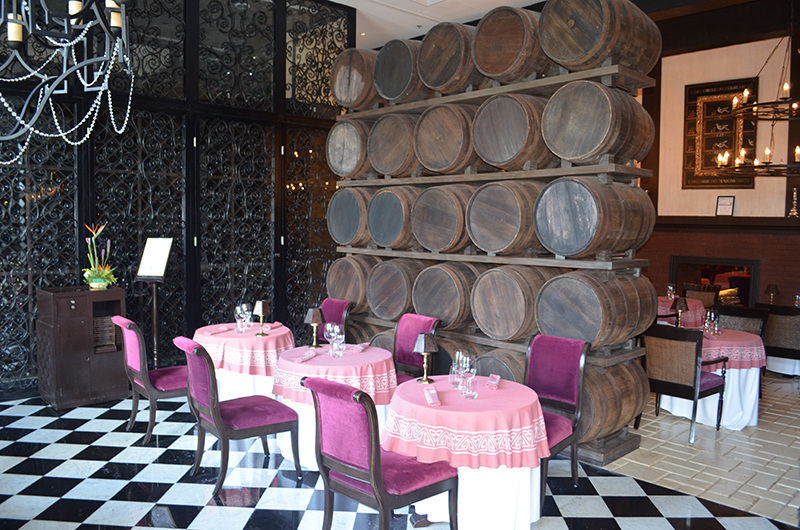 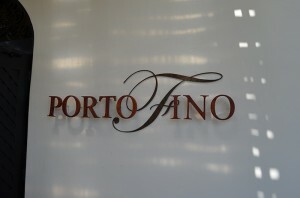 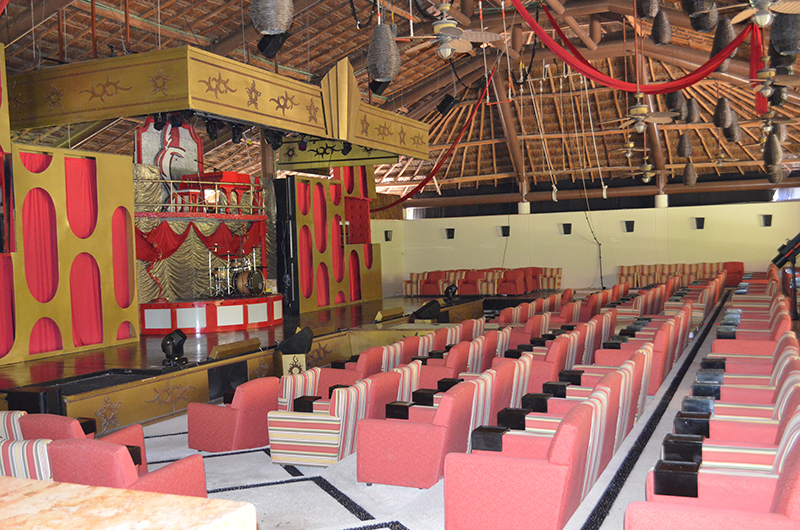 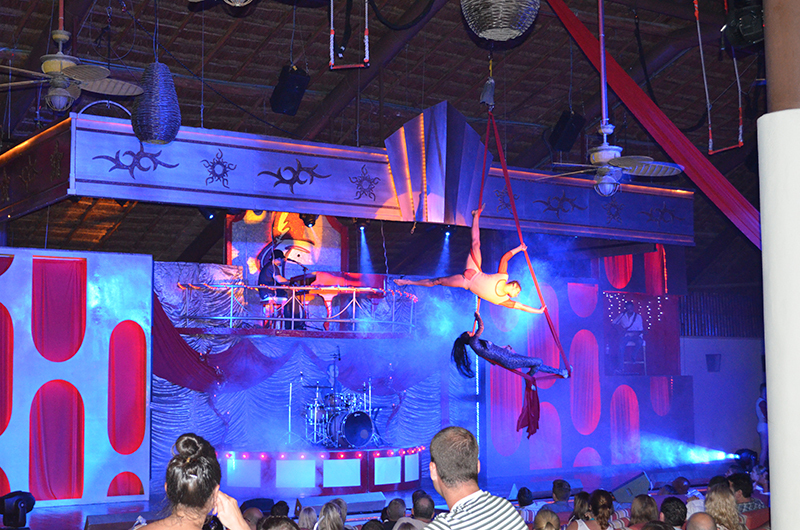 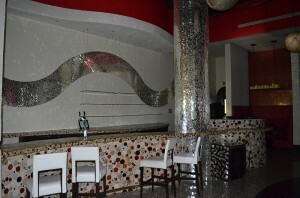 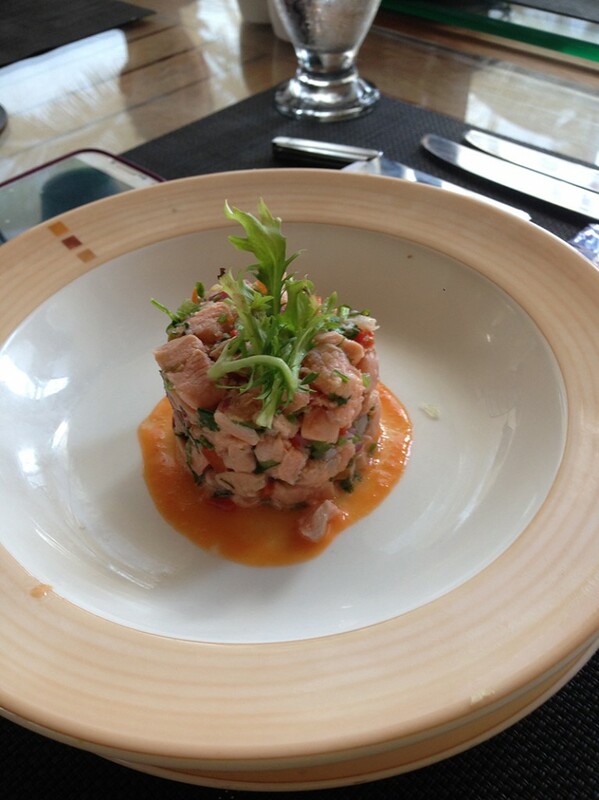 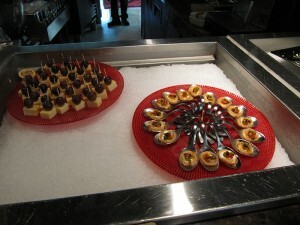 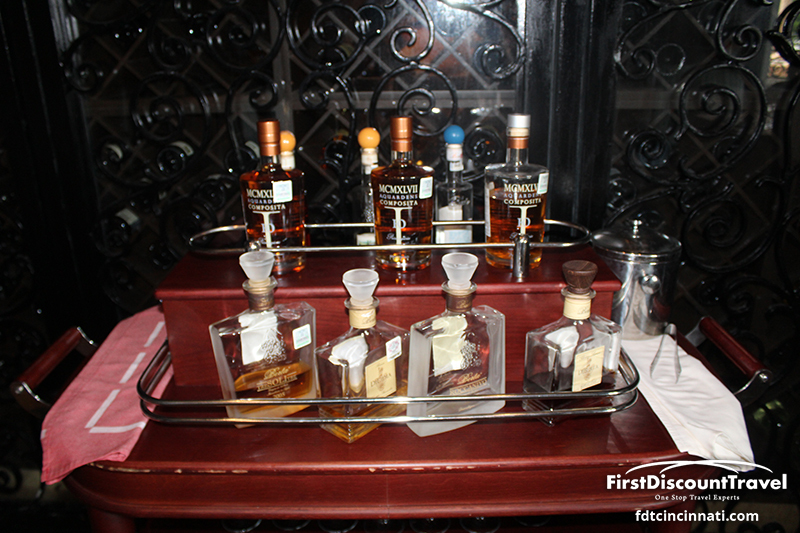 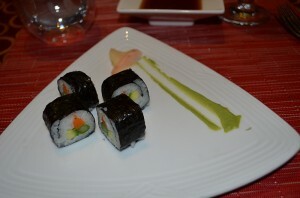 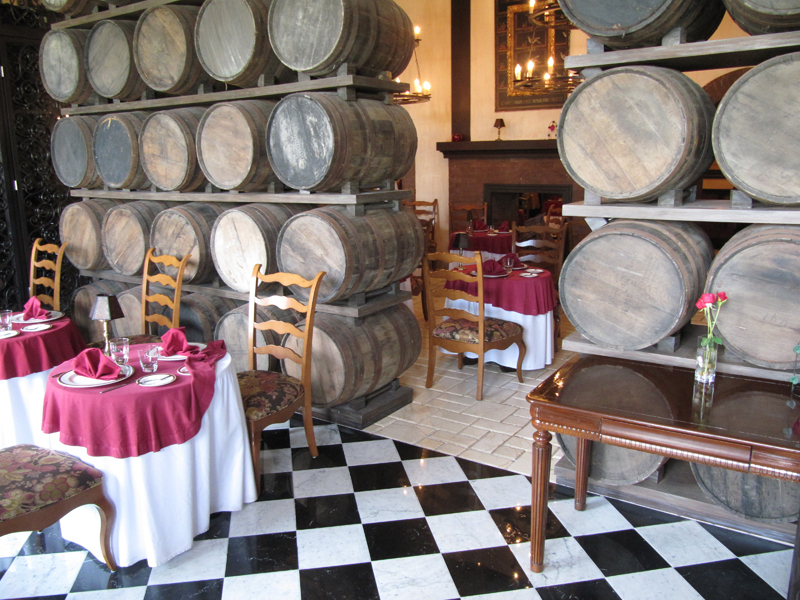 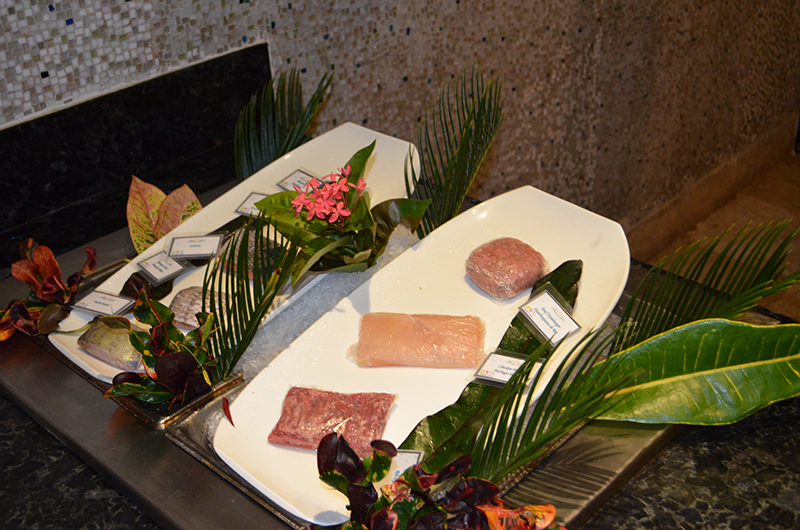 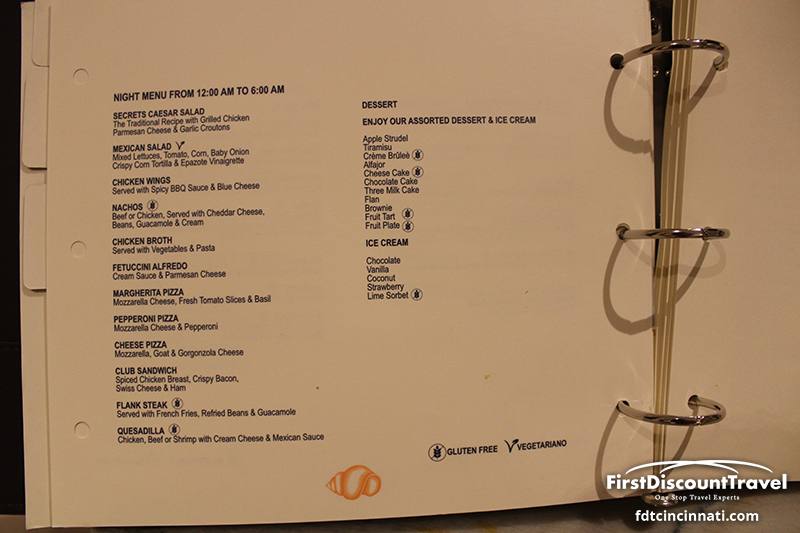 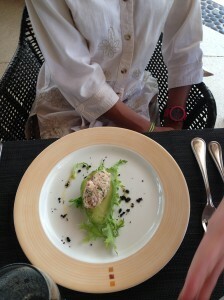 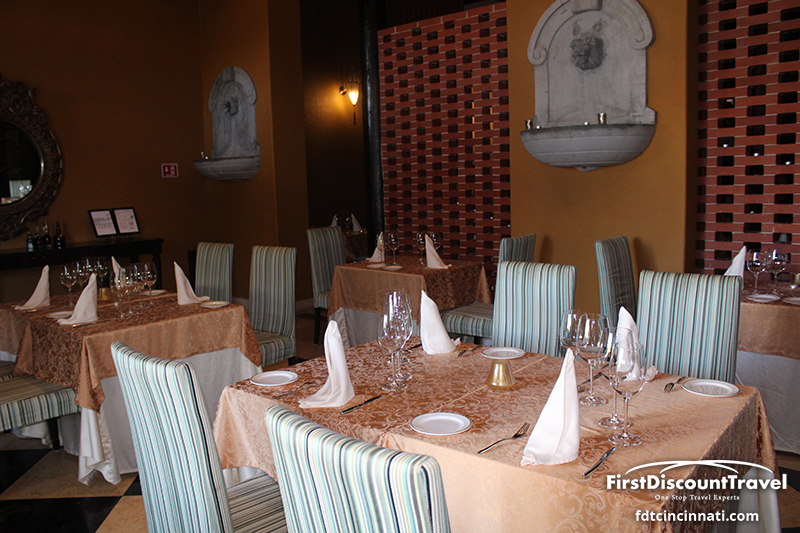 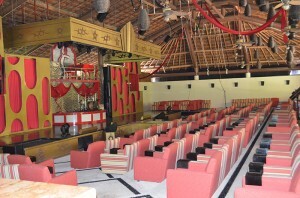 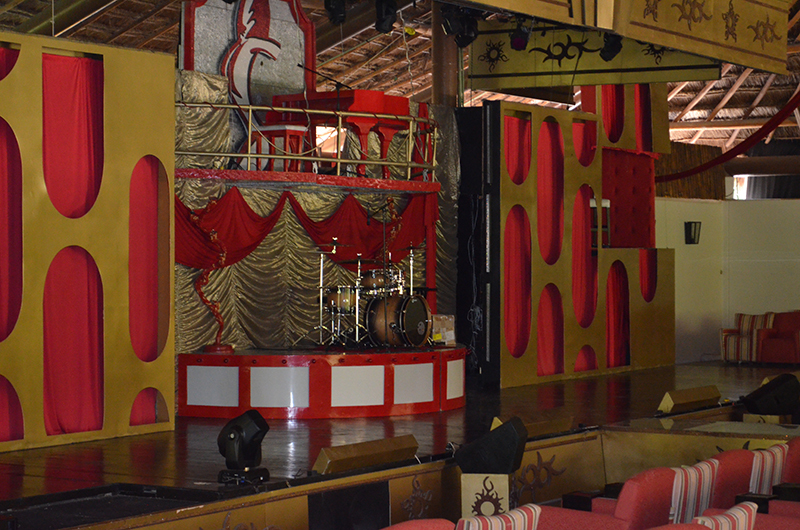 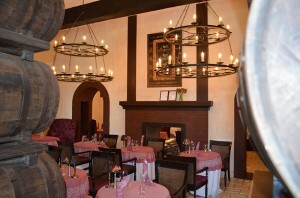 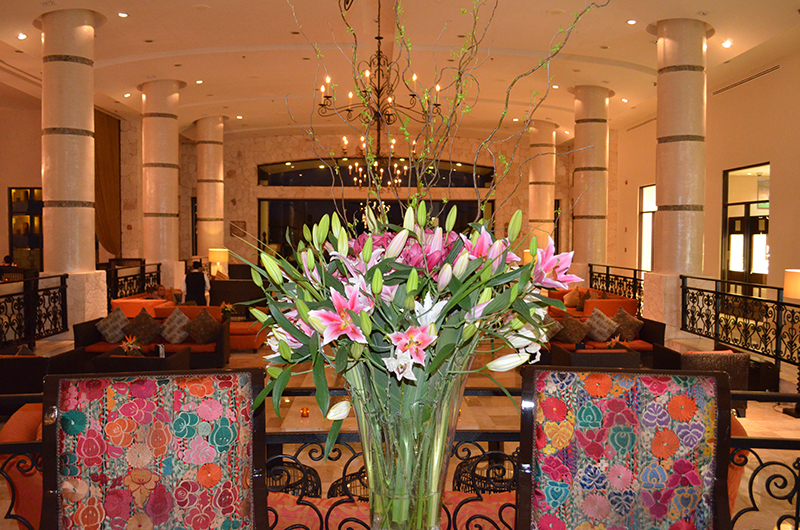 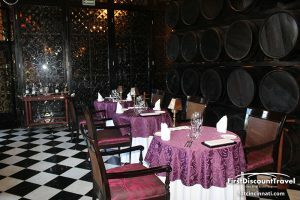 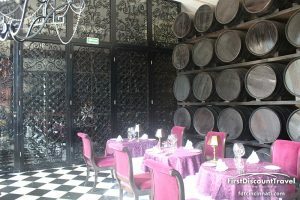 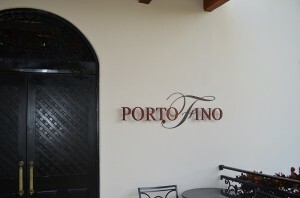 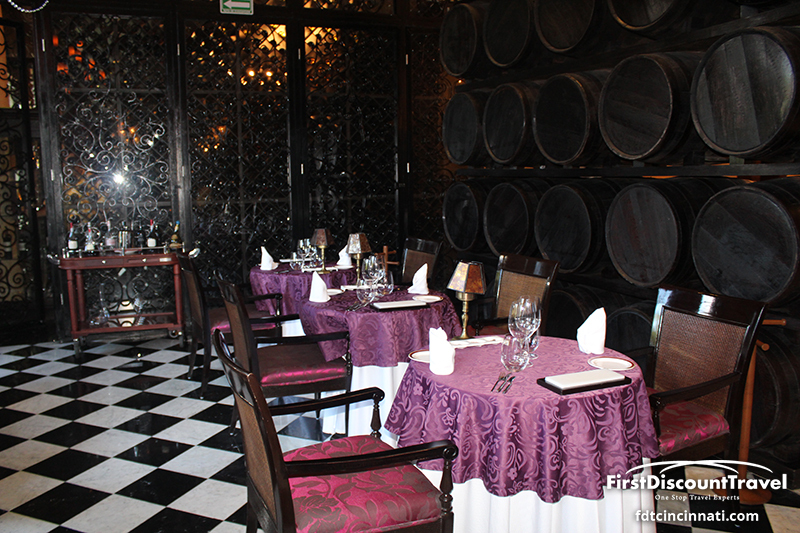 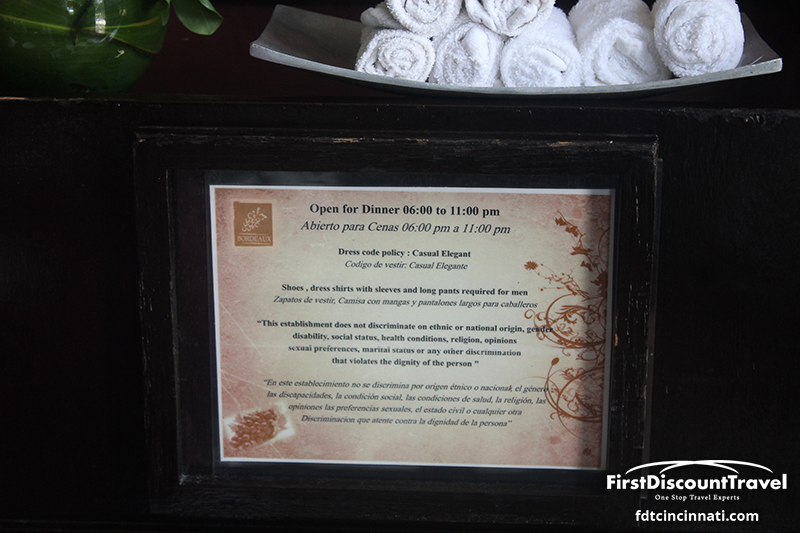 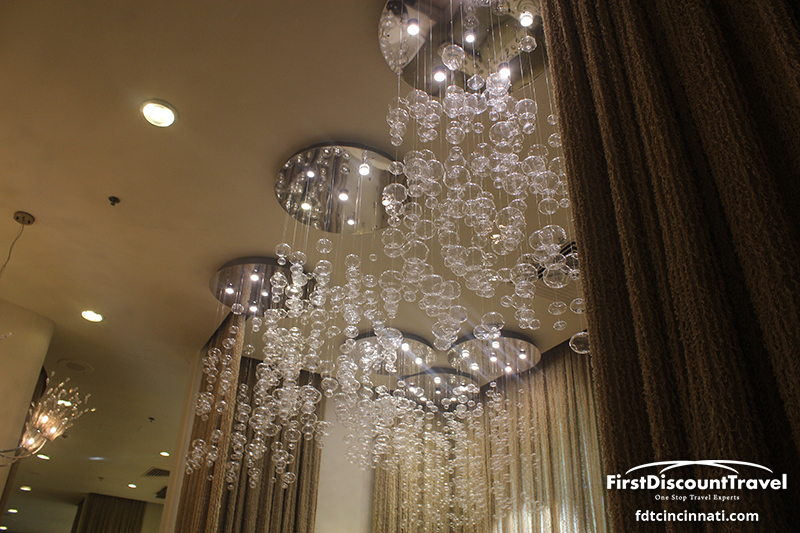 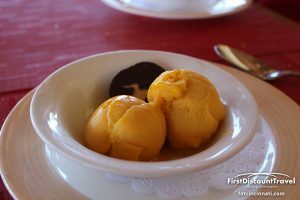 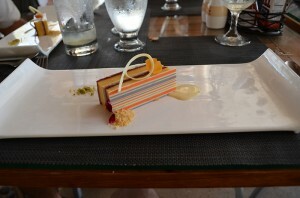 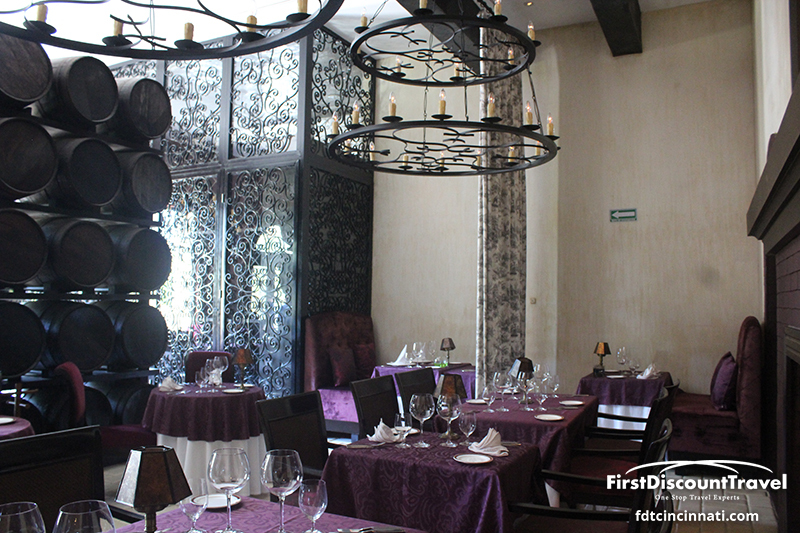 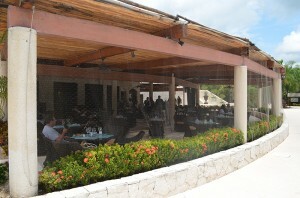 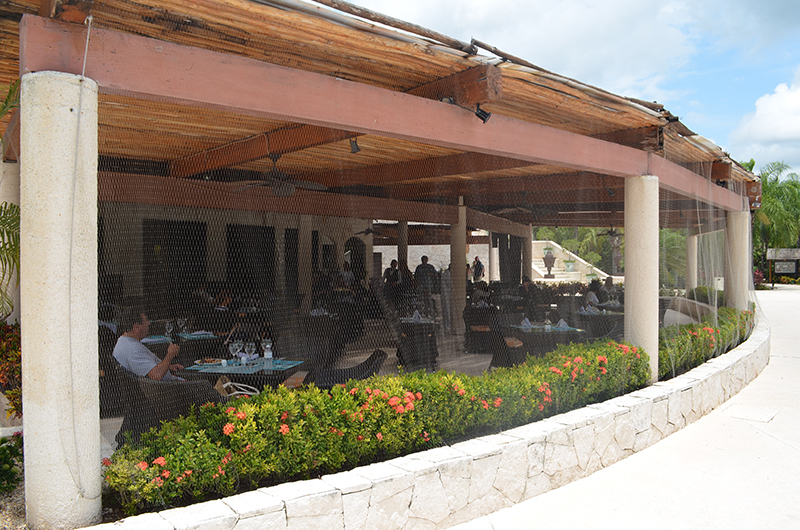 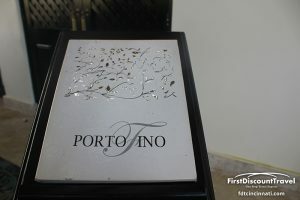 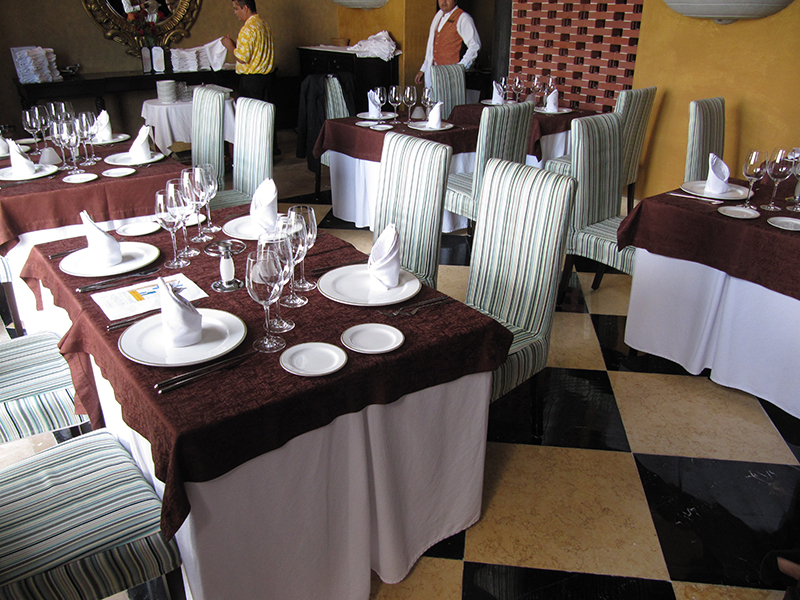 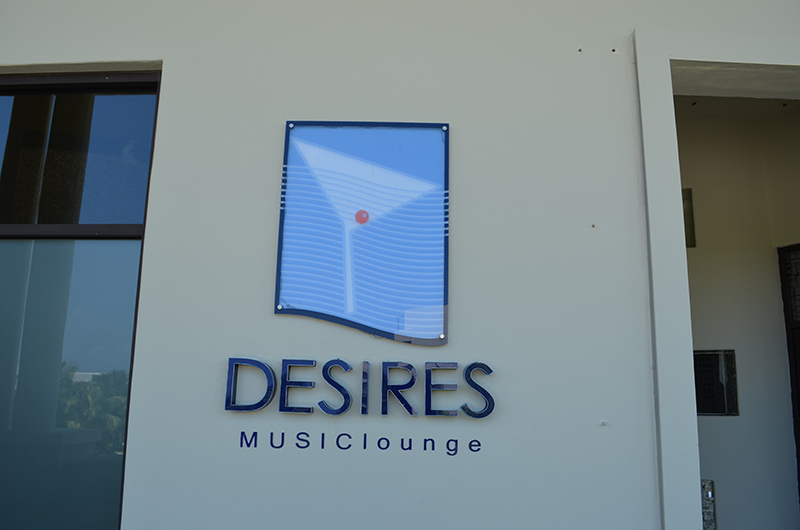 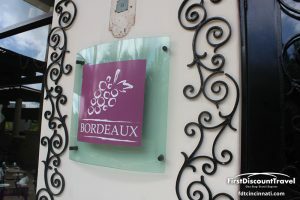 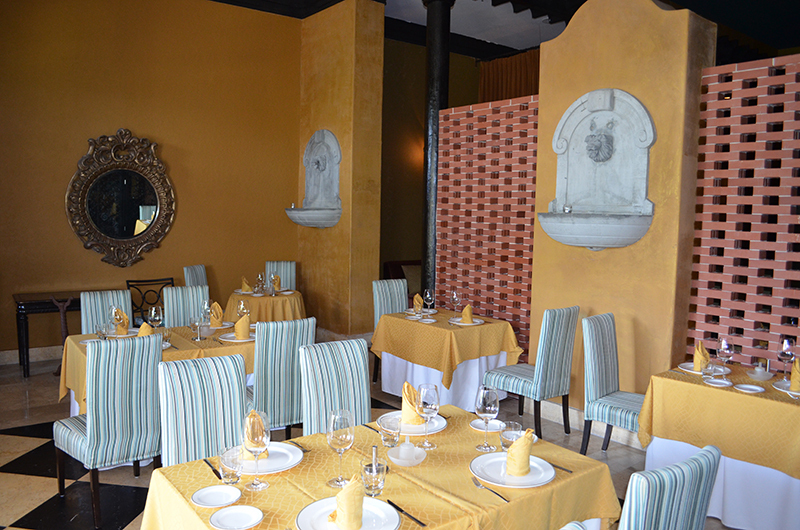 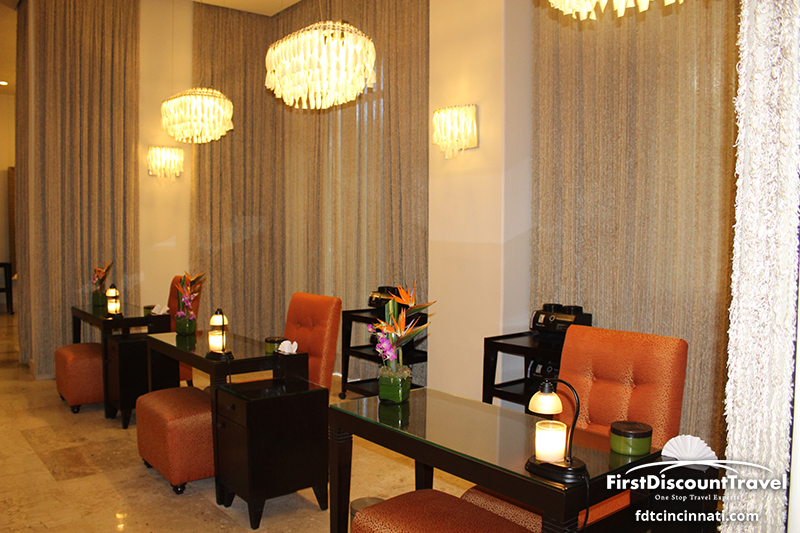 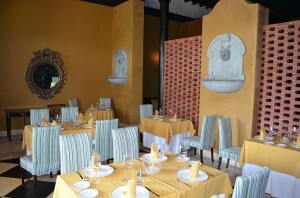 Six gourmet à la carte restaurants plus a fine buffet intrigue the most discerning palate. 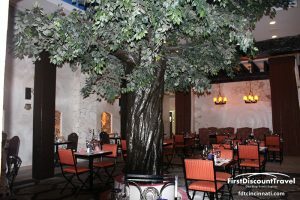 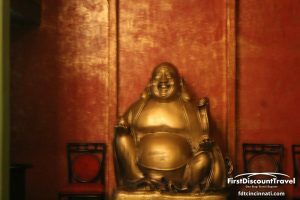 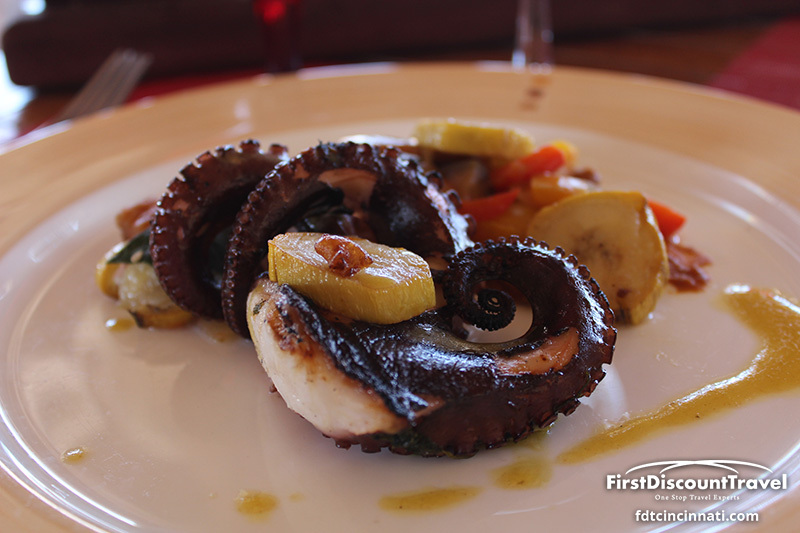 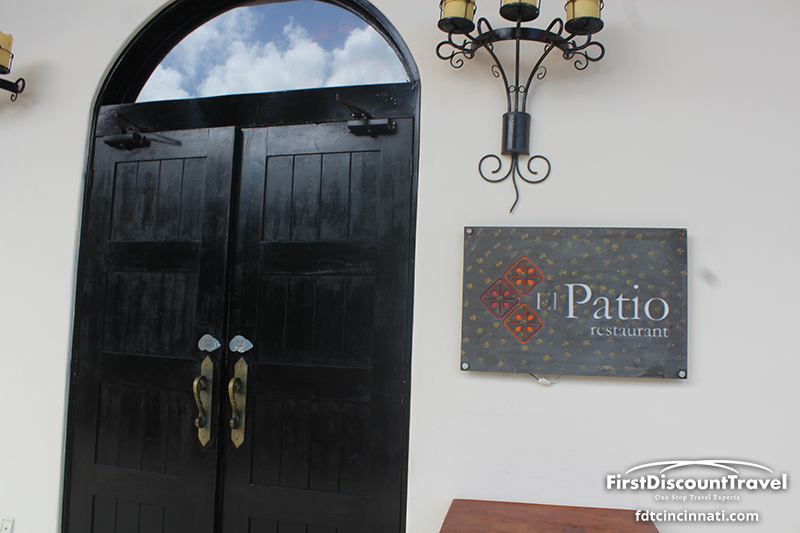 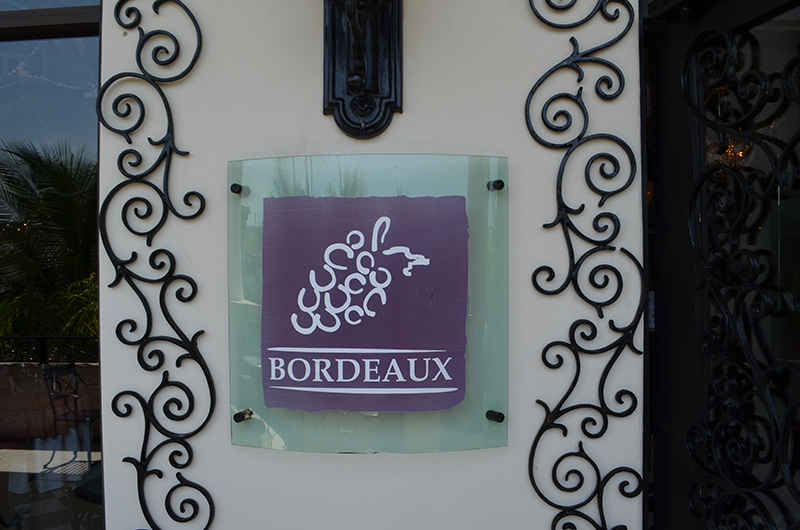 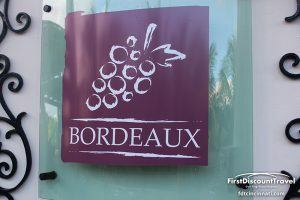 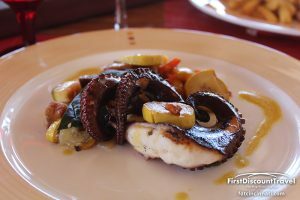 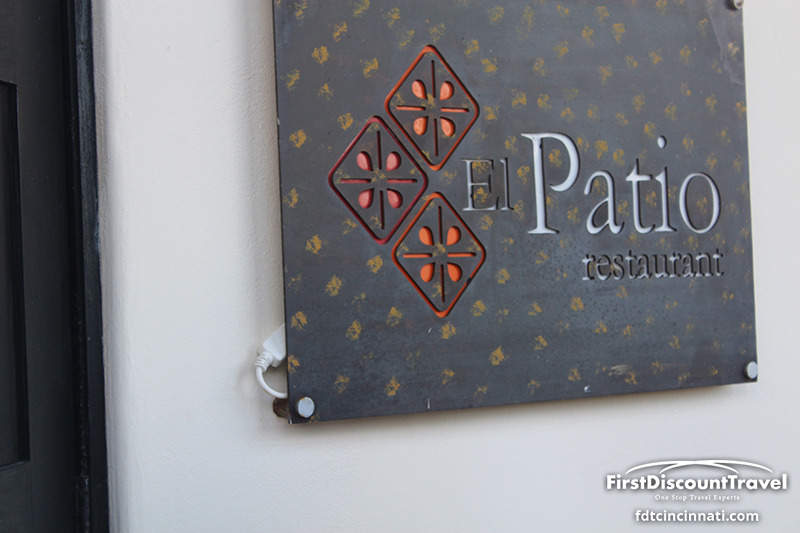 Savor Pan-Asian cuisine at Himitsu, Mediterranean flavors at Portofino, authentic Mexican favorites at El Patio, and delectable French cuisine served at Bordeaux. 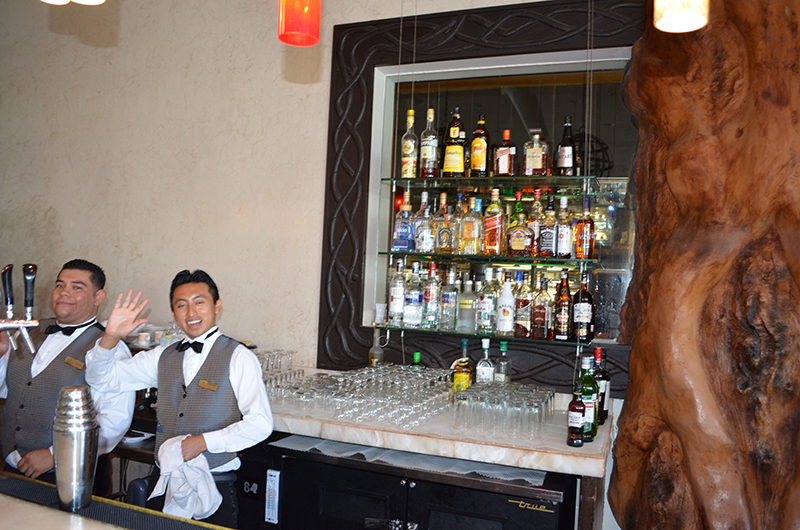 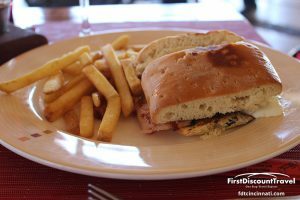 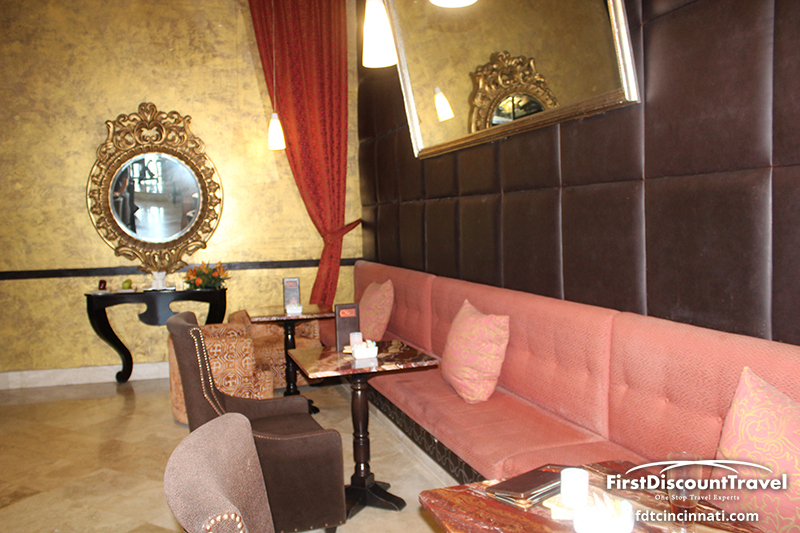 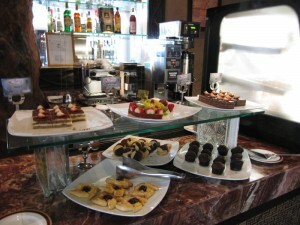 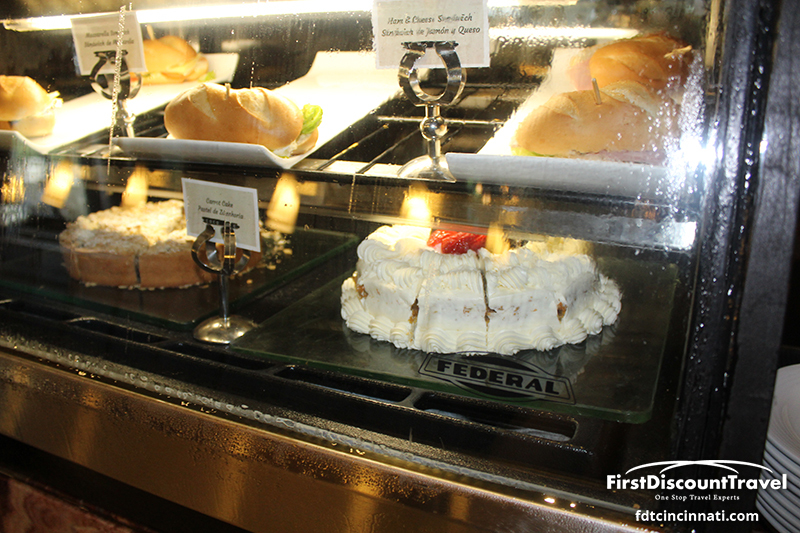 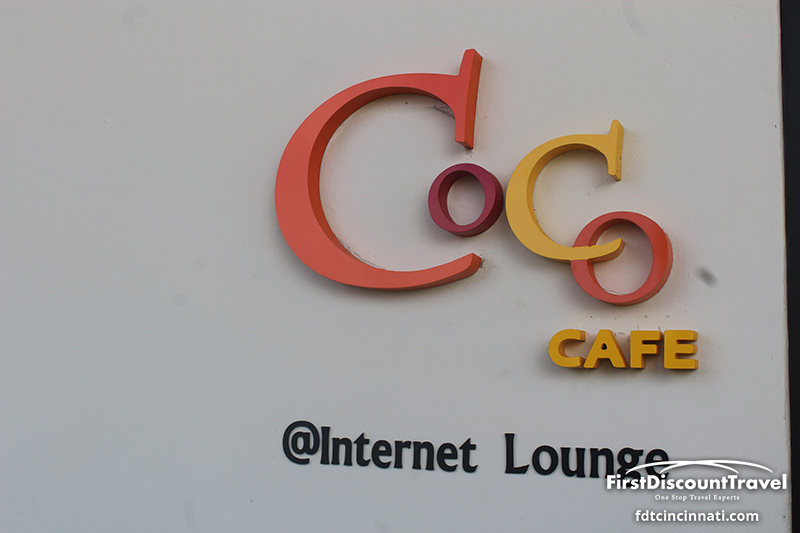 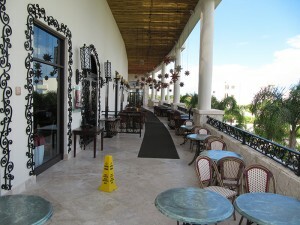 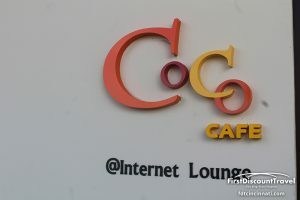 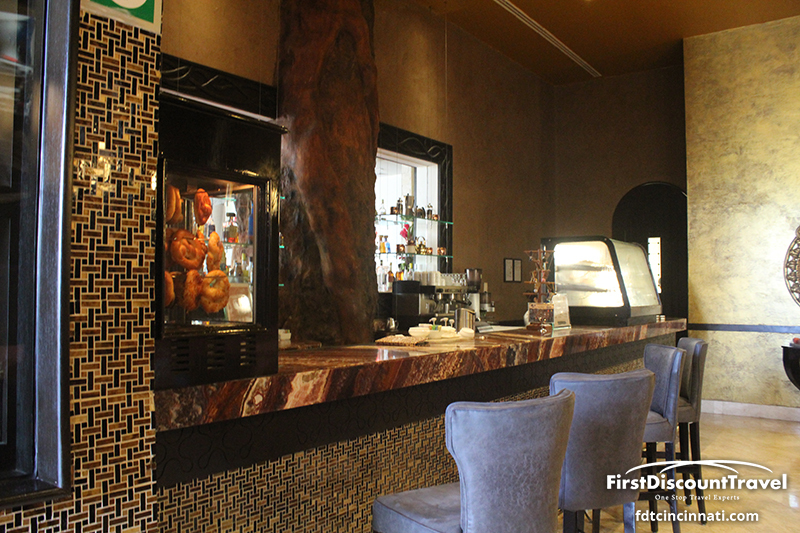 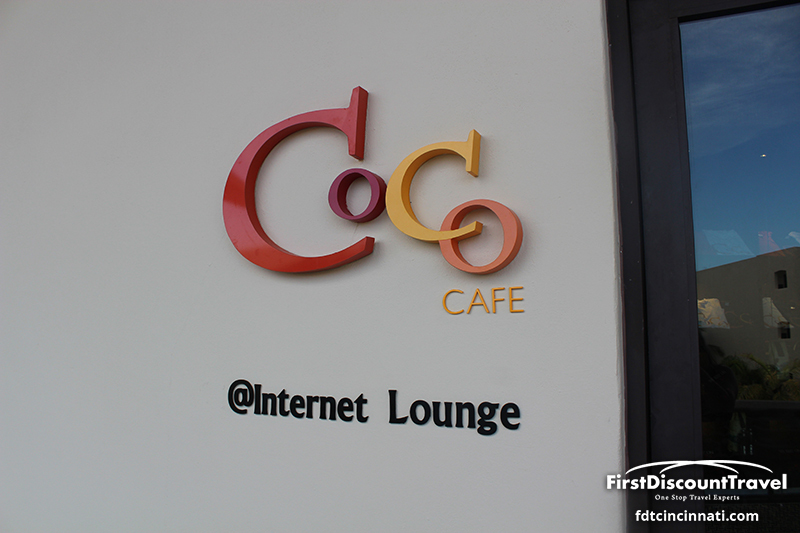 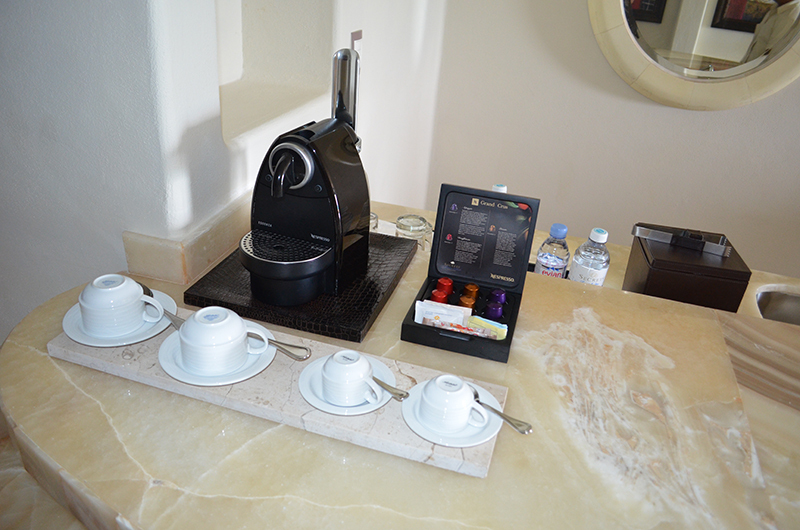 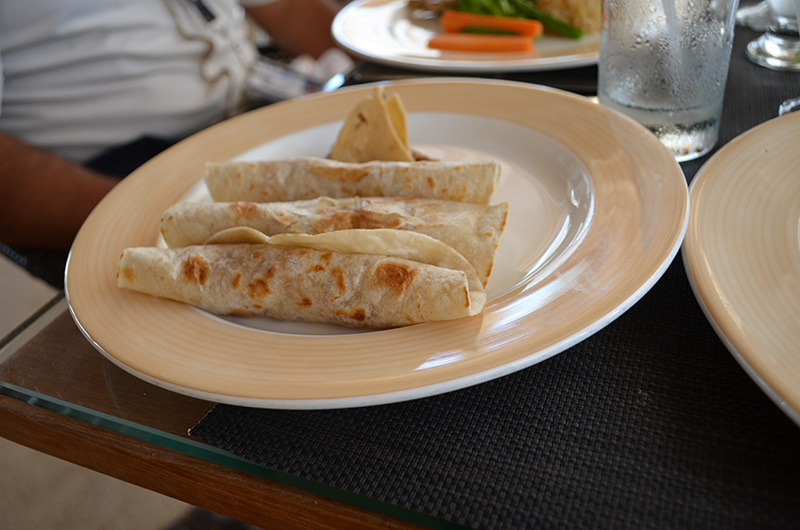 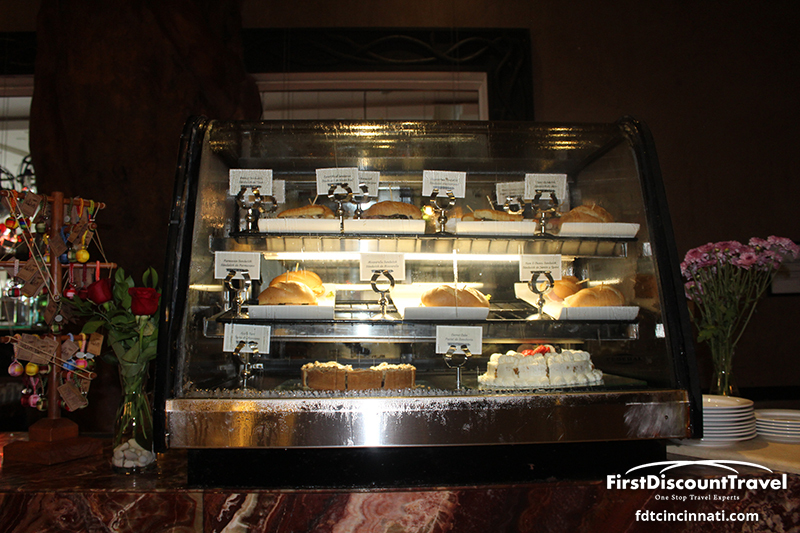 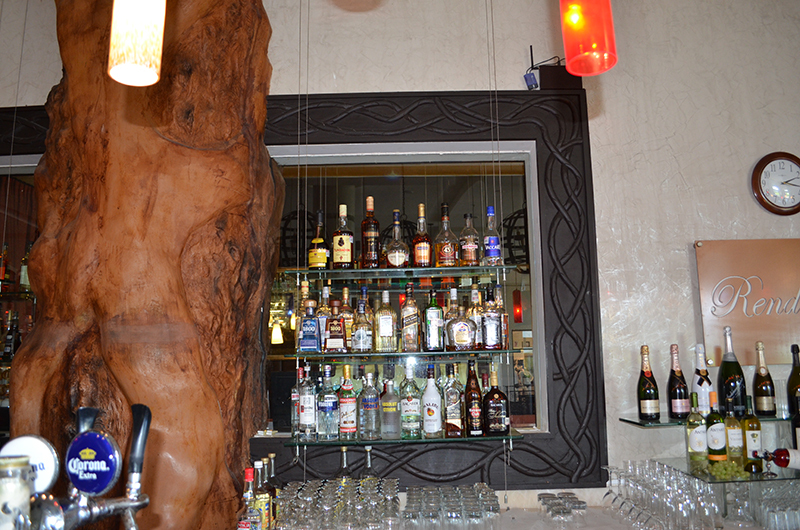 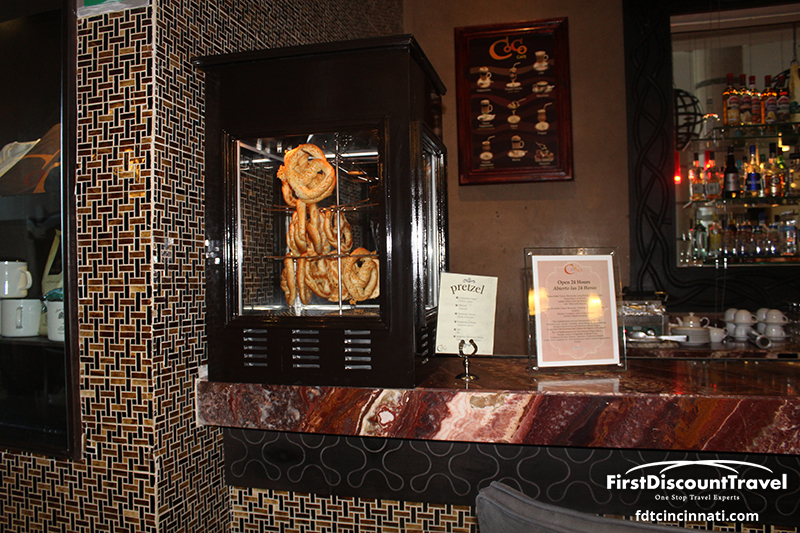 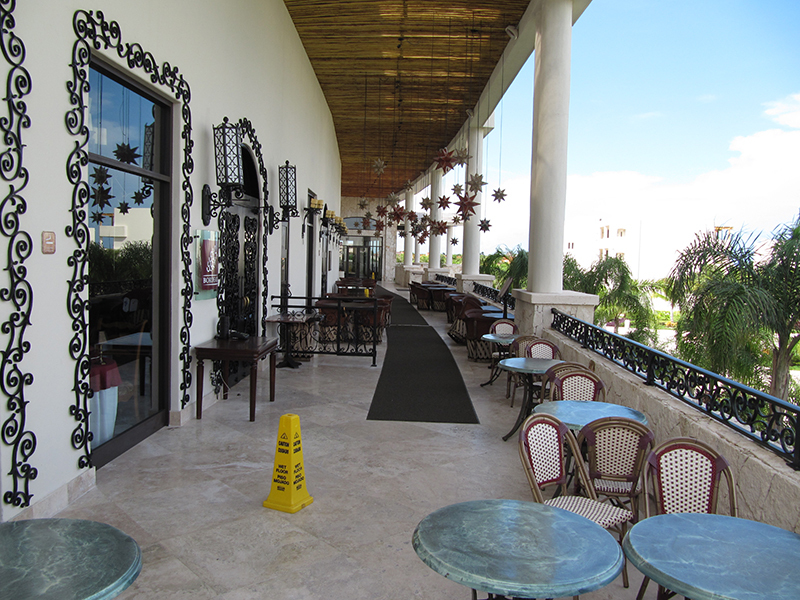 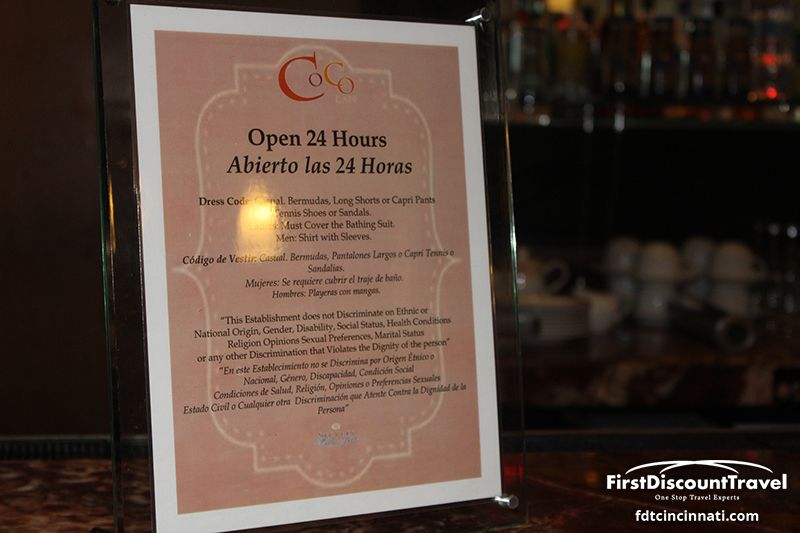 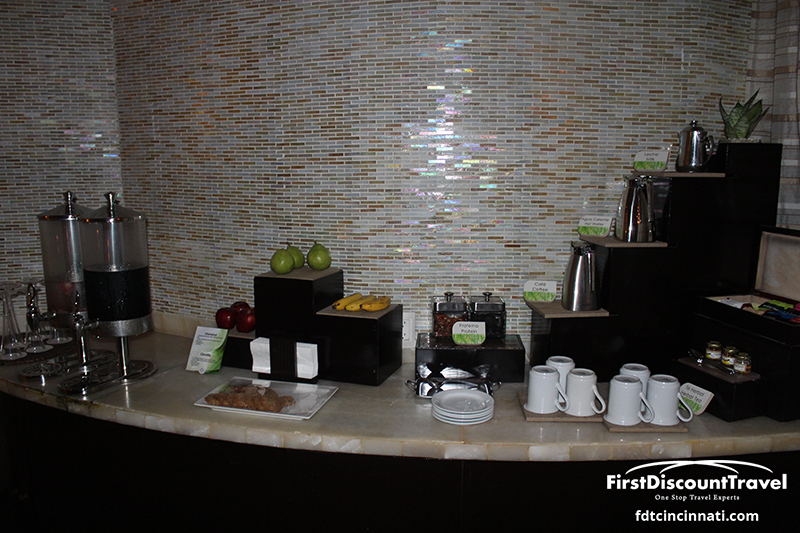 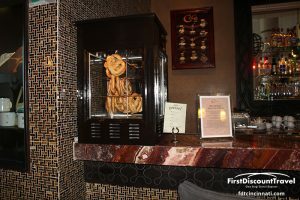 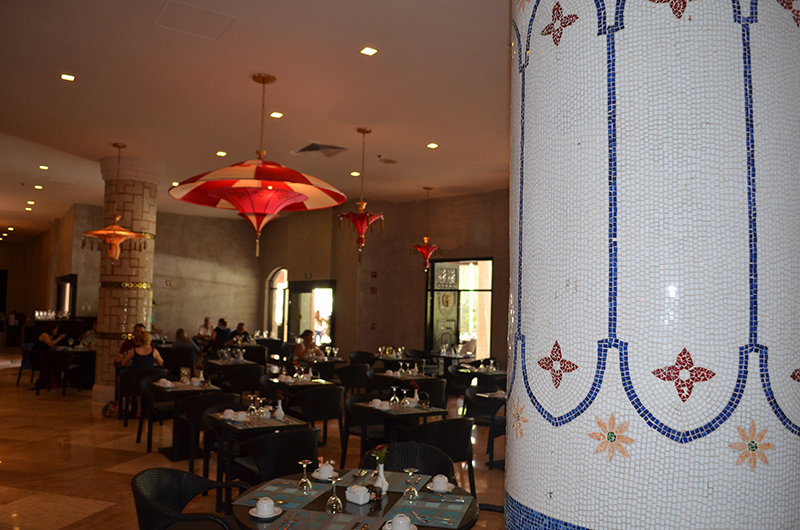 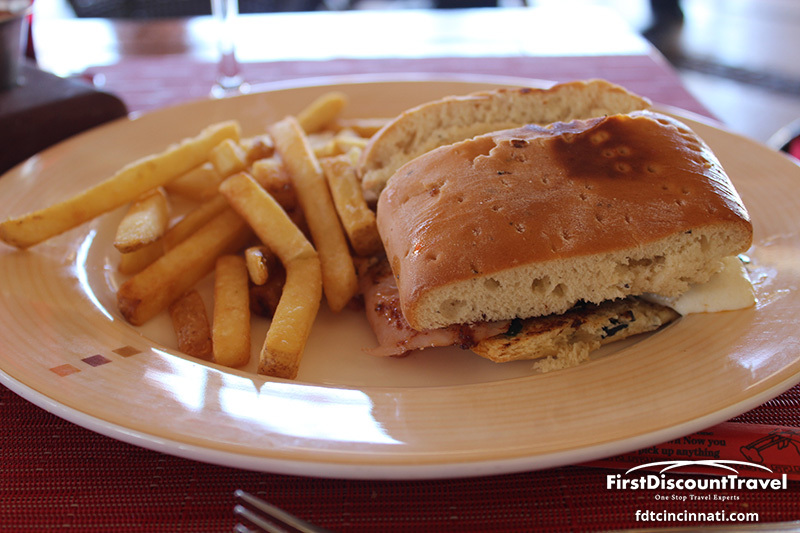 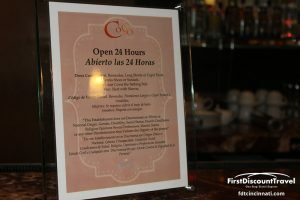 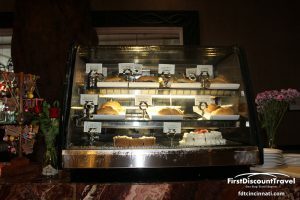 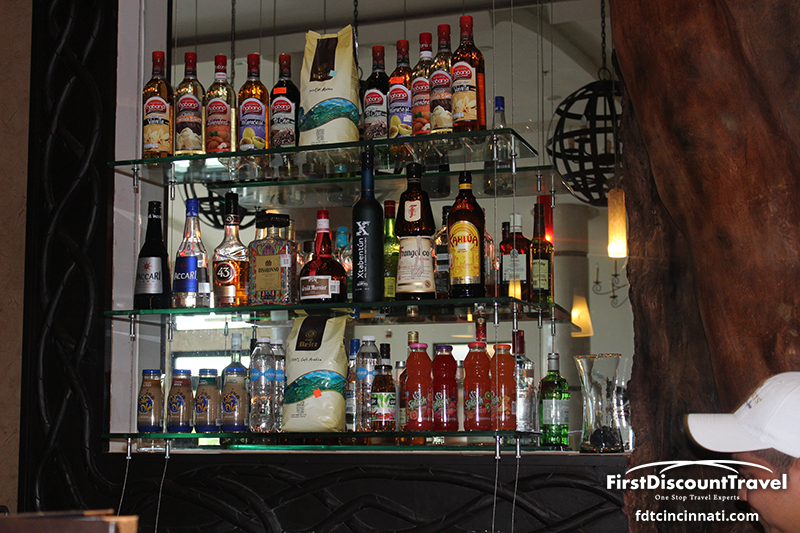 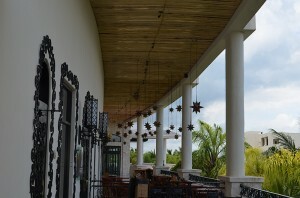 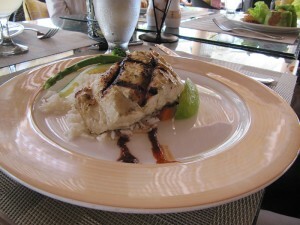 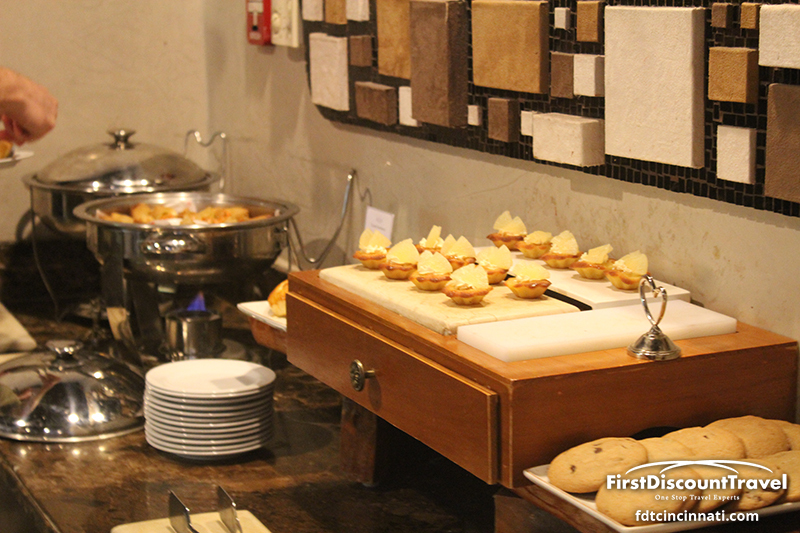 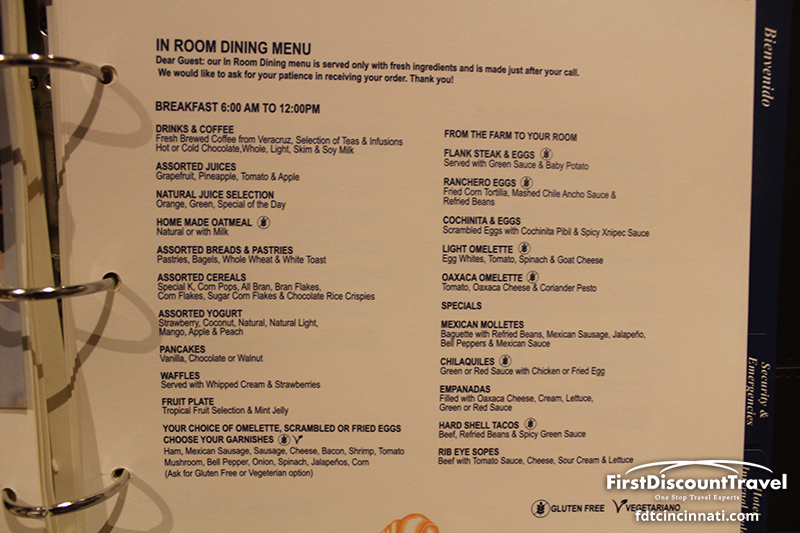 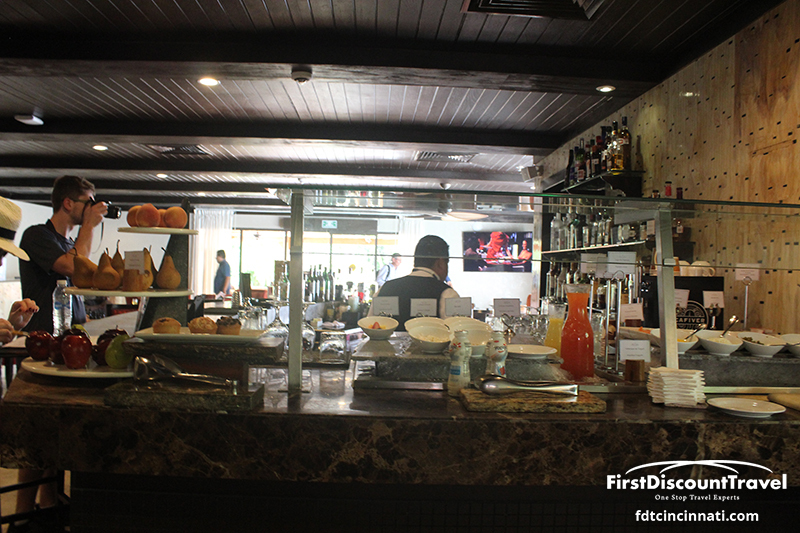 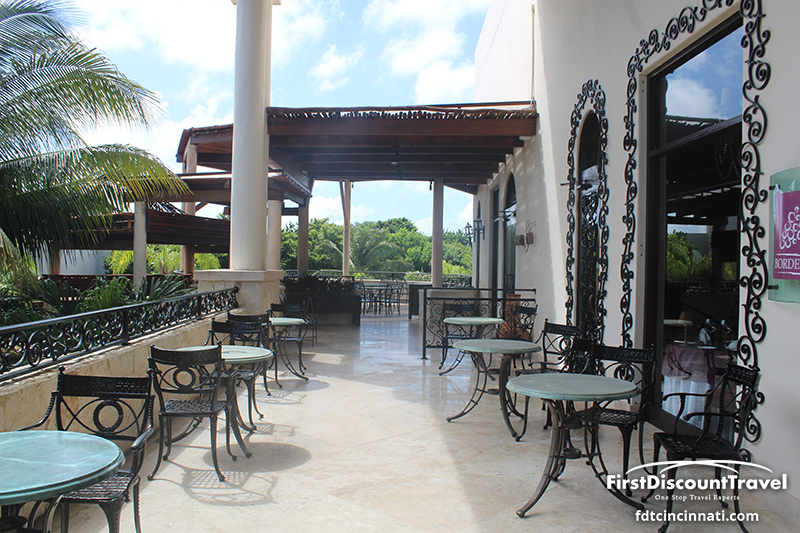 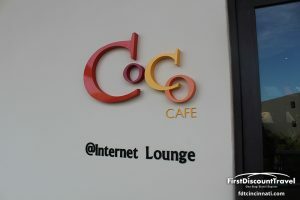 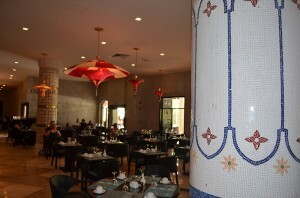 For lighter fare come to CoCo Café and enjoy delicious coffee and savory pastries. 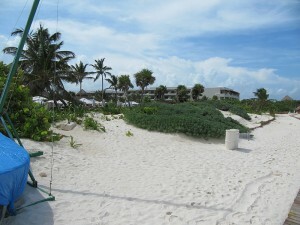 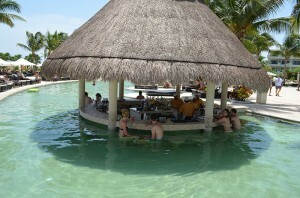 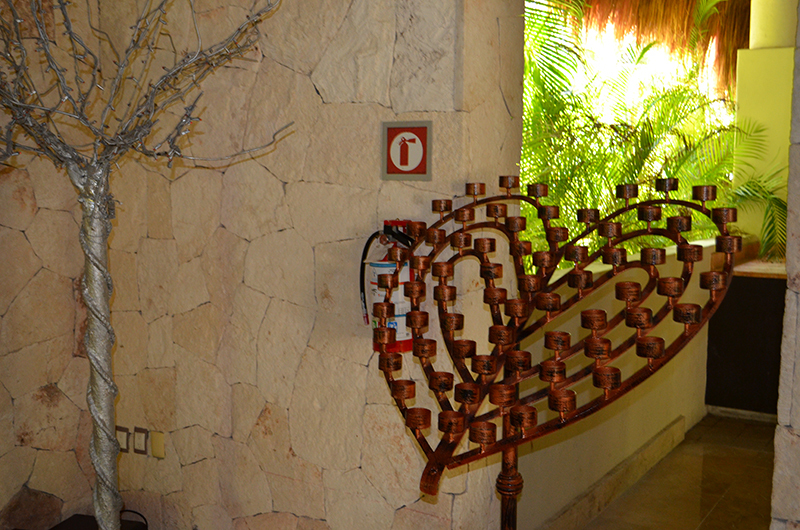 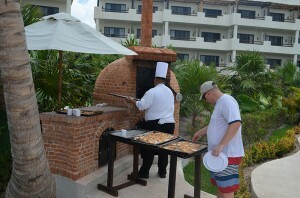 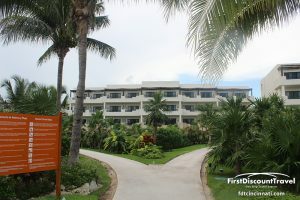 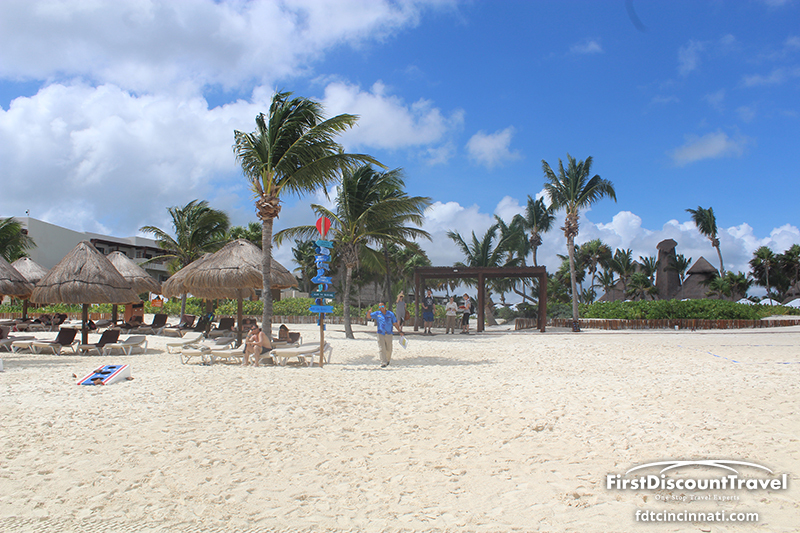 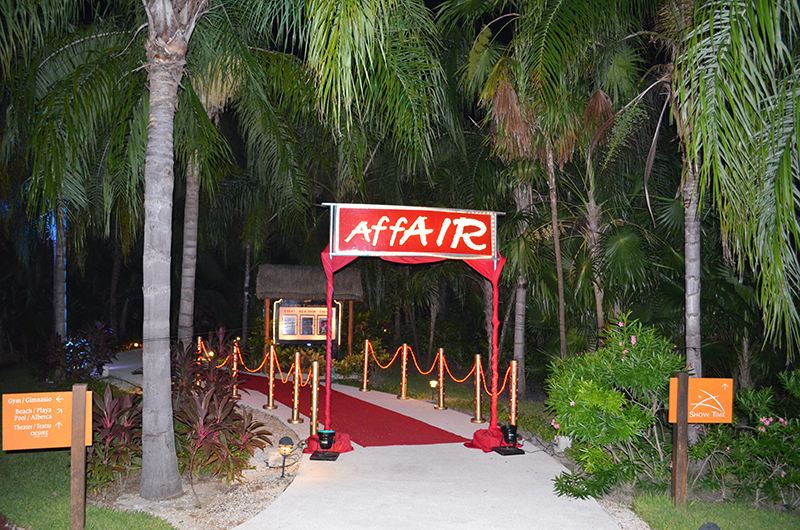 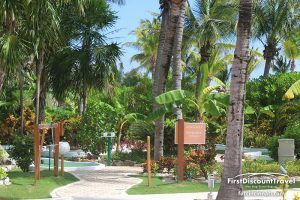 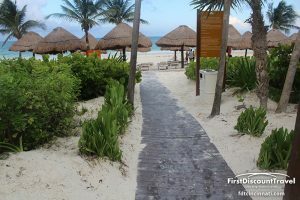 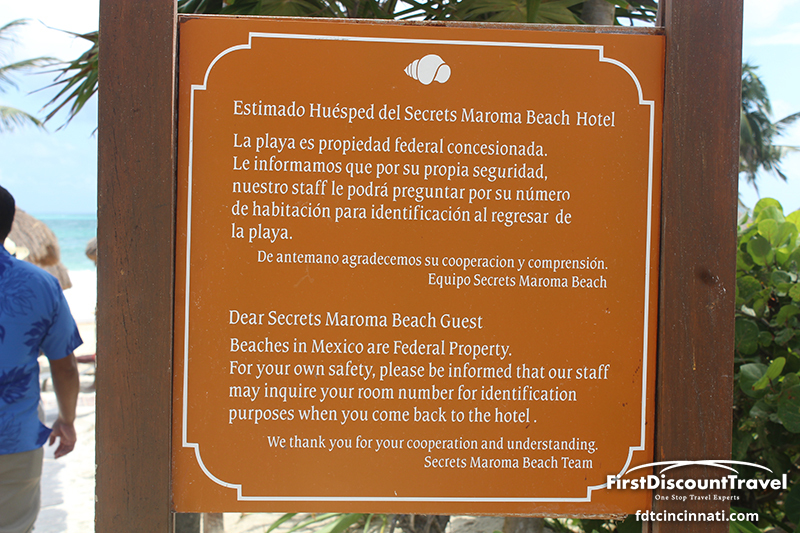 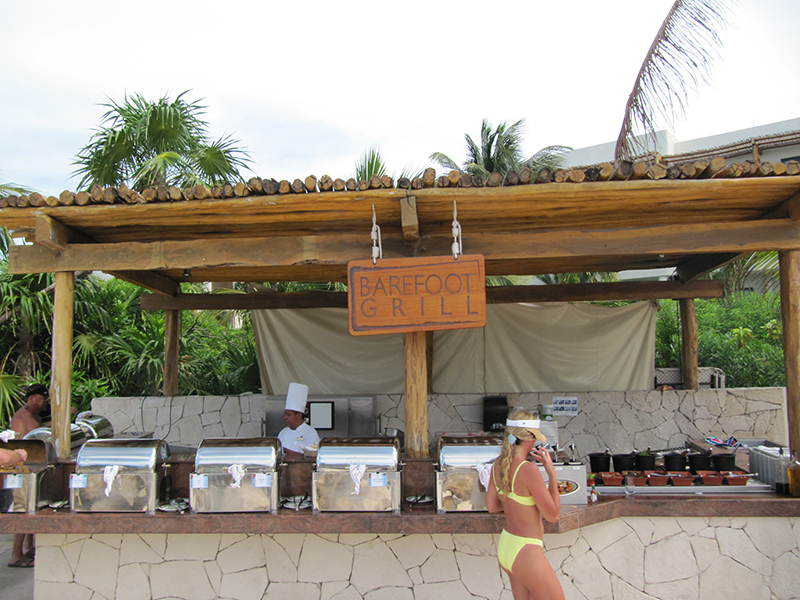 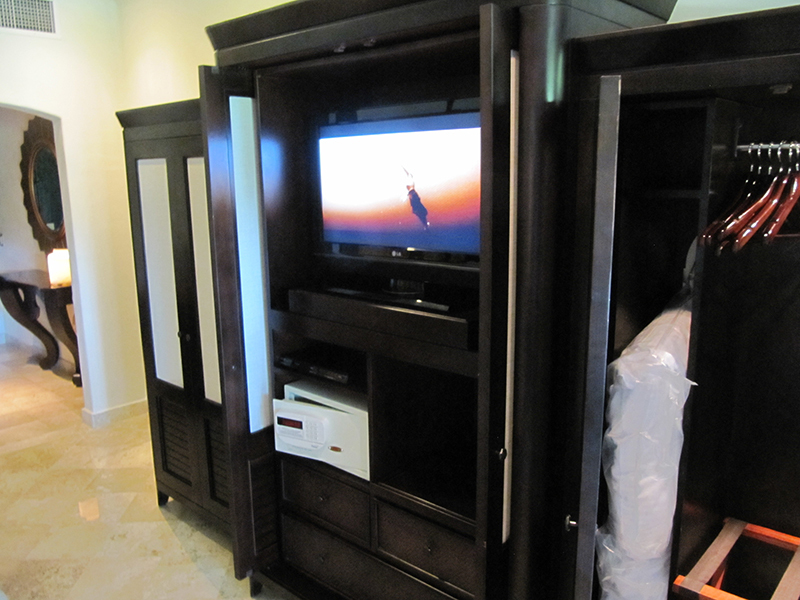 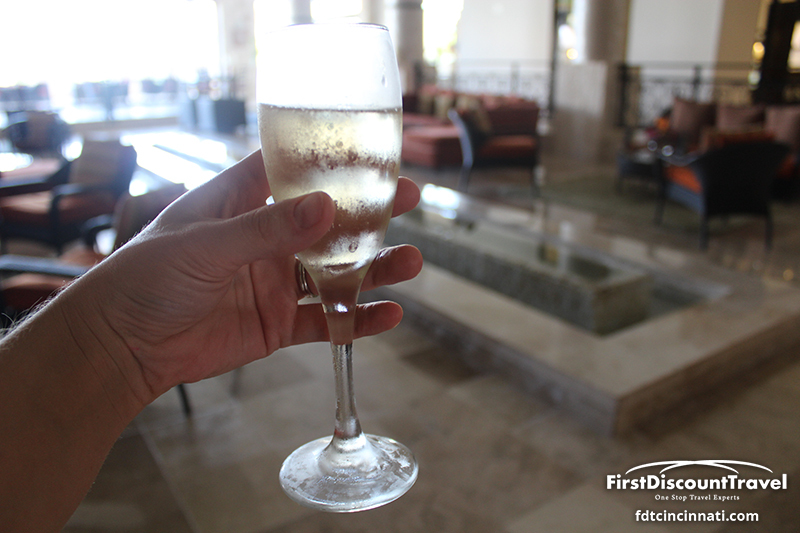 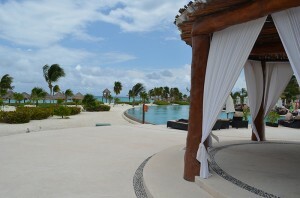 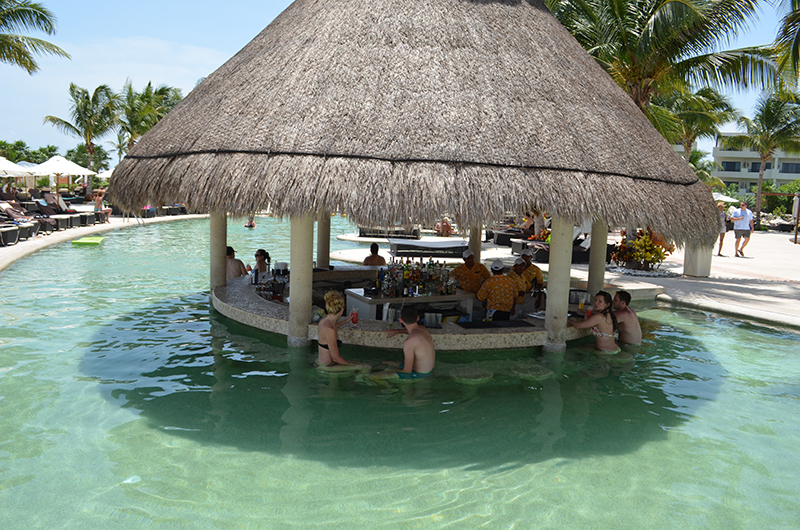 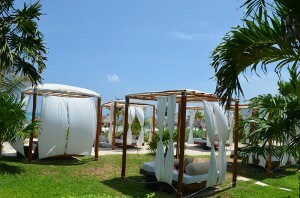 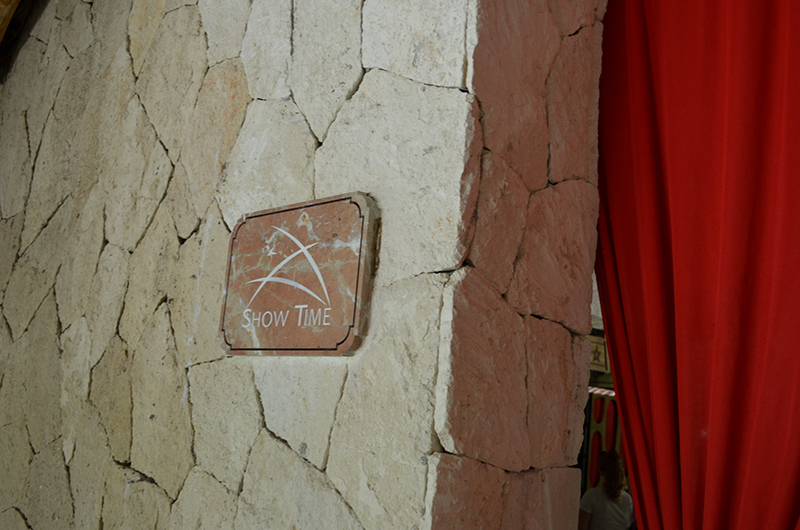 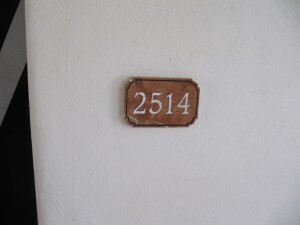 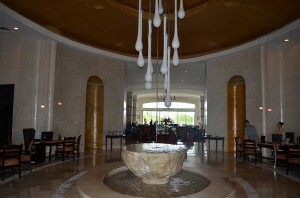 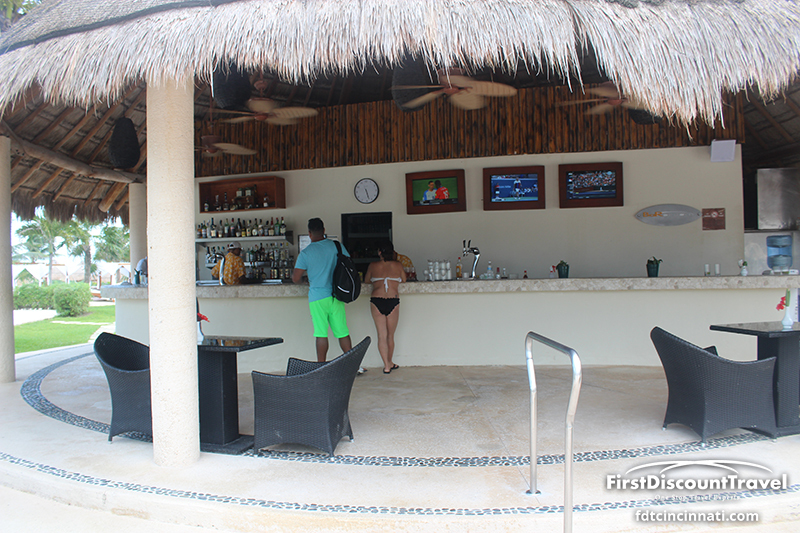 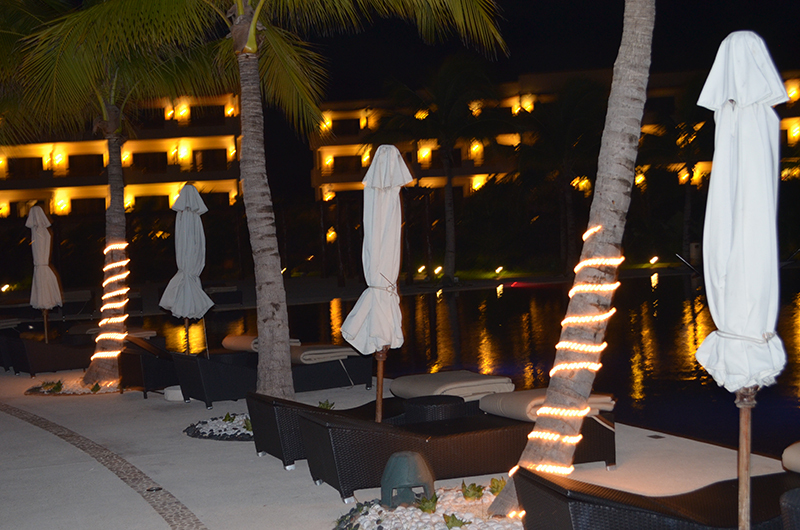 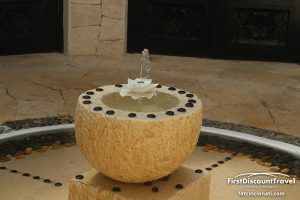 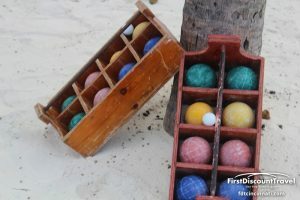 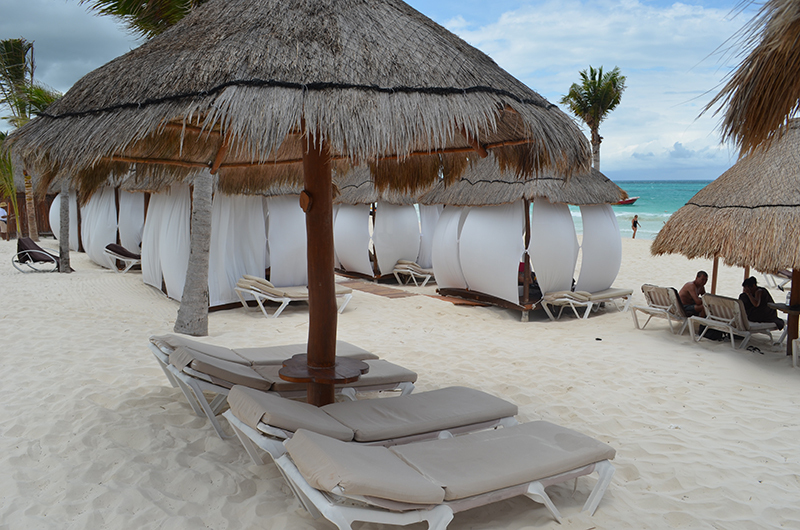 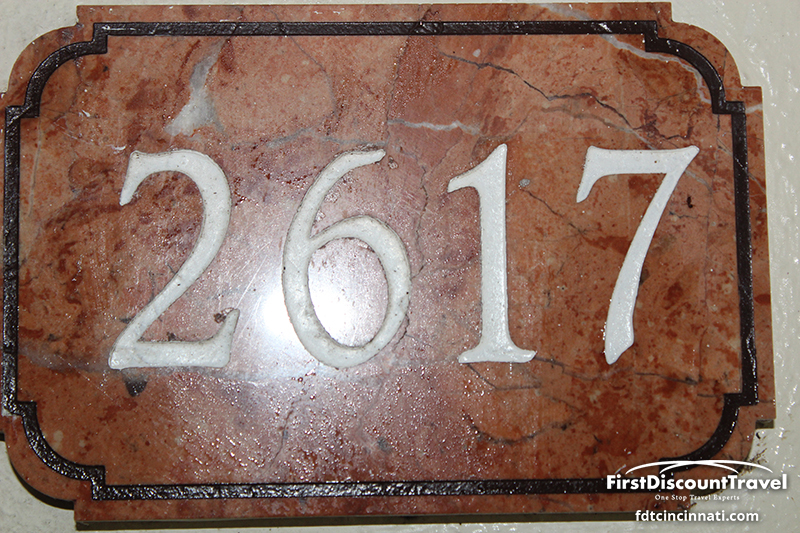 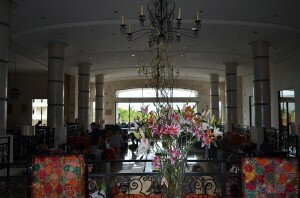 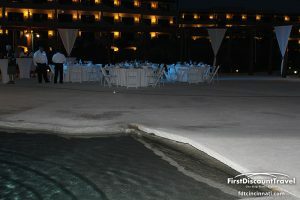 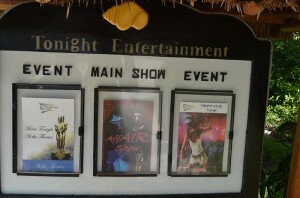 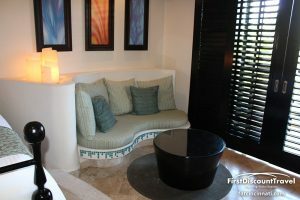 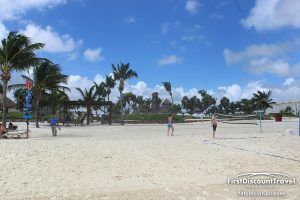 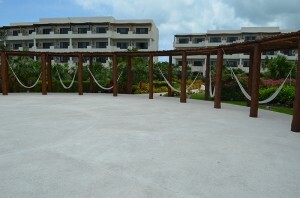 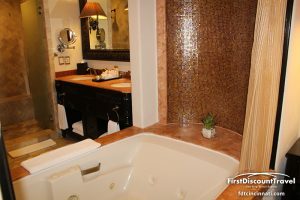 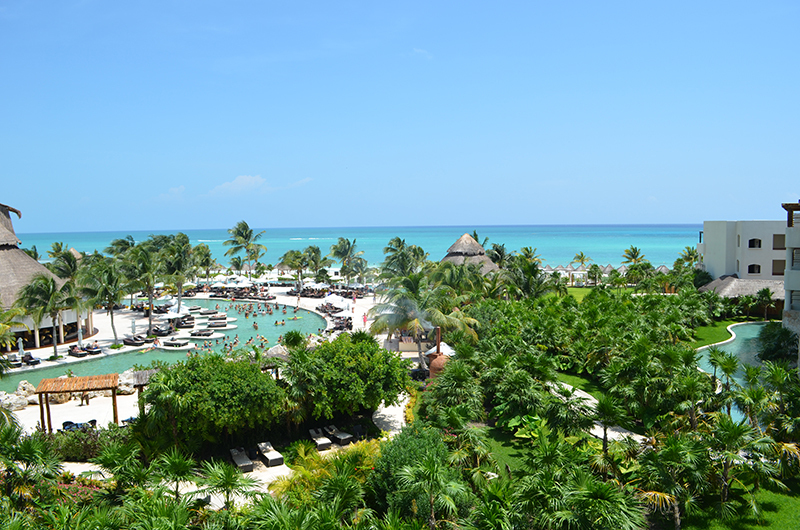 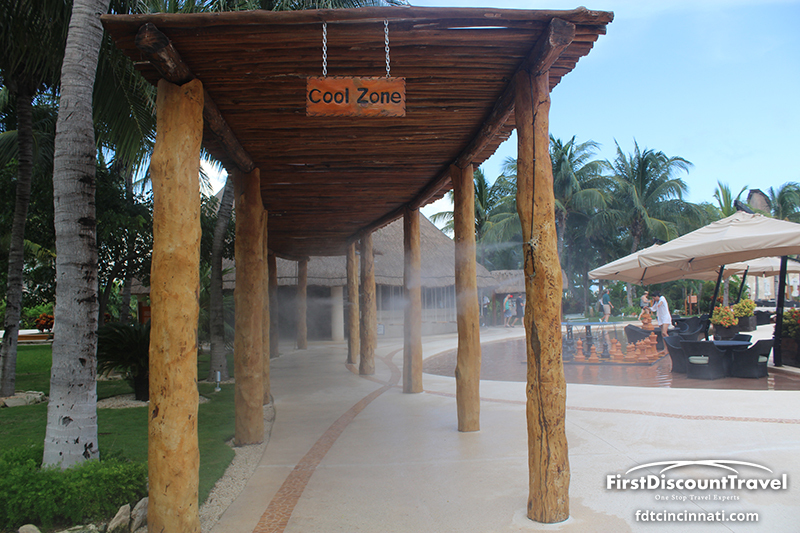 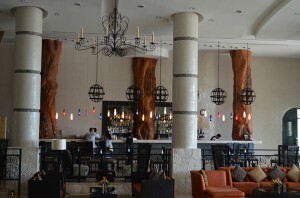 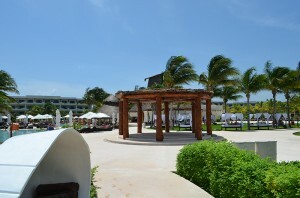 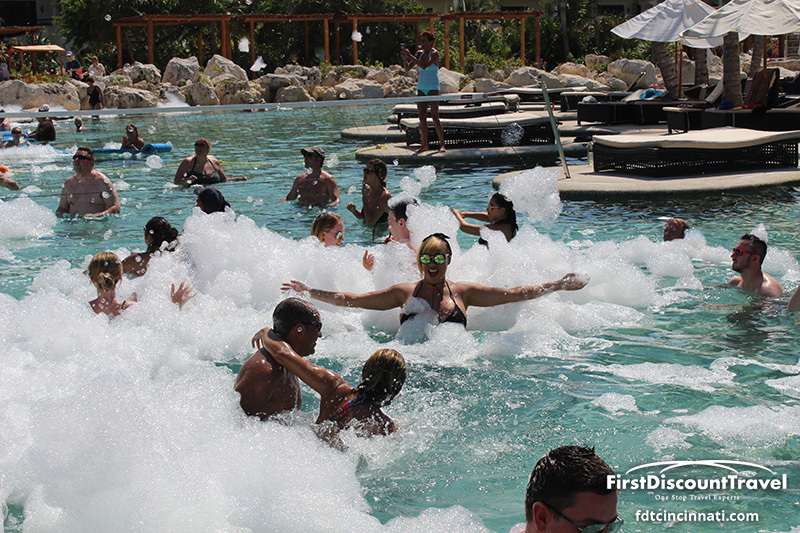 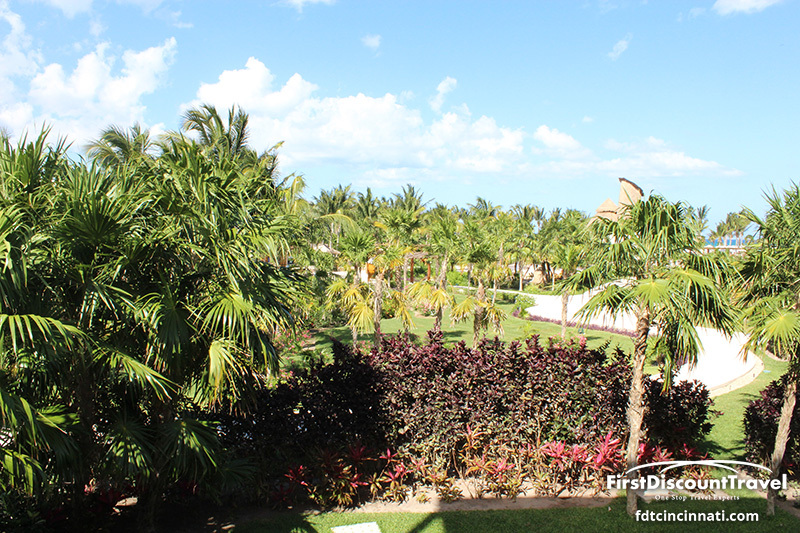 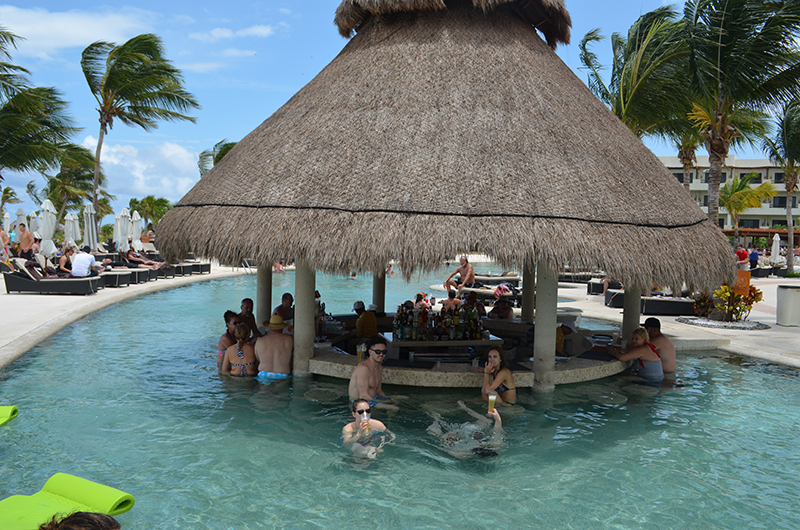 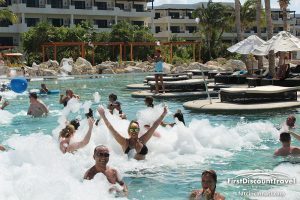 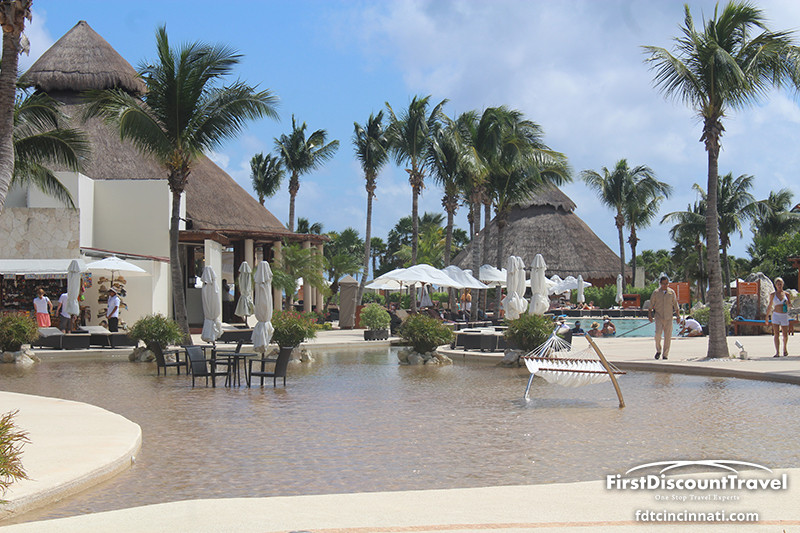 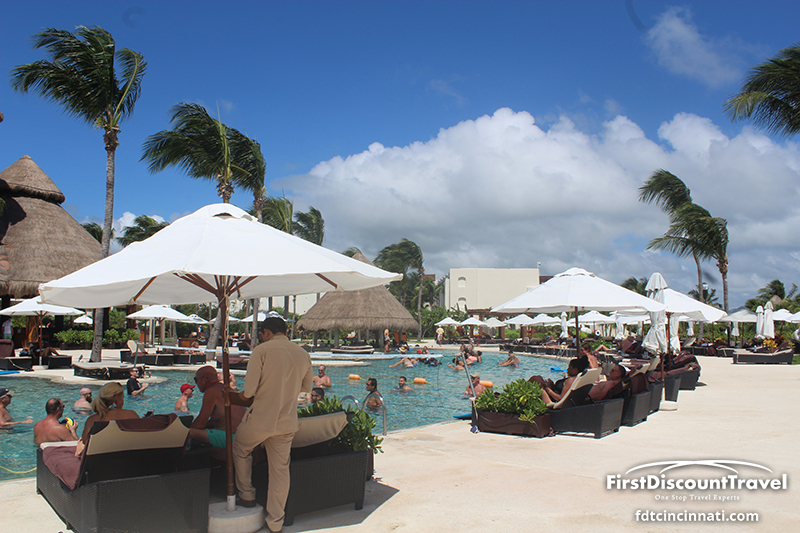 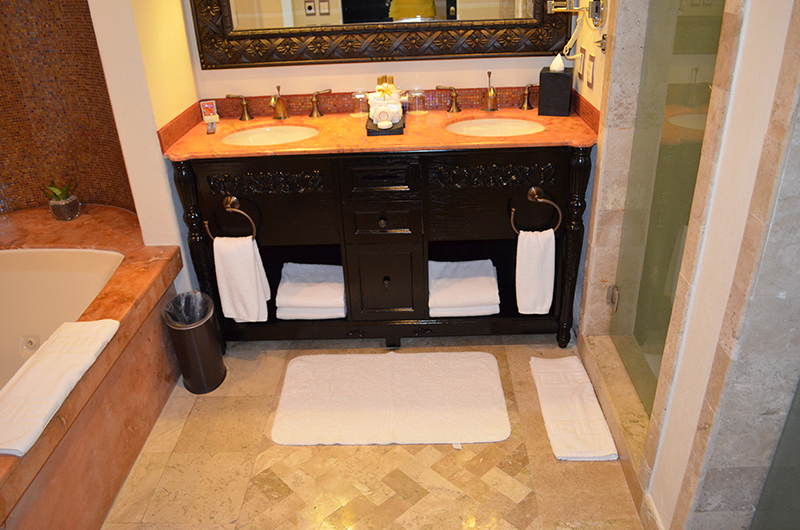 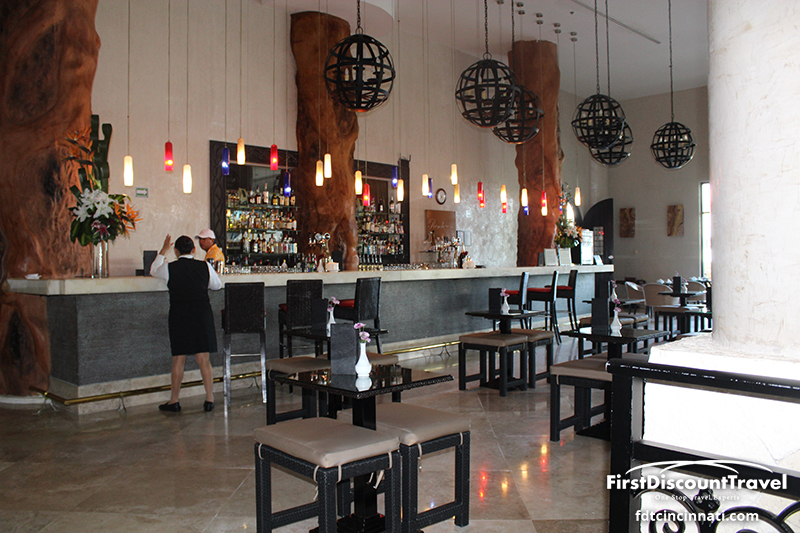 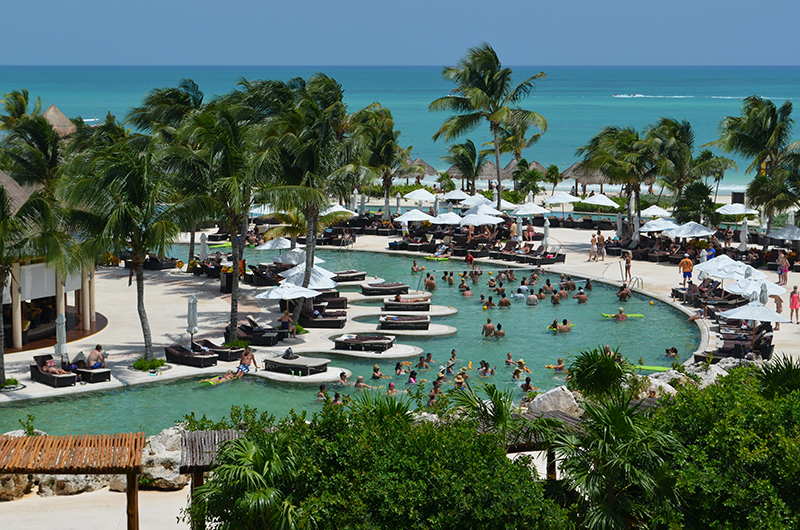 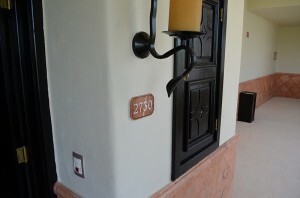 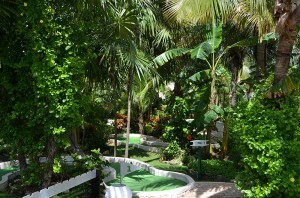 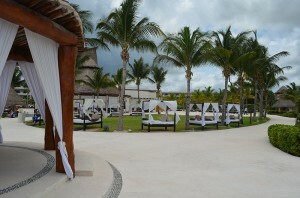 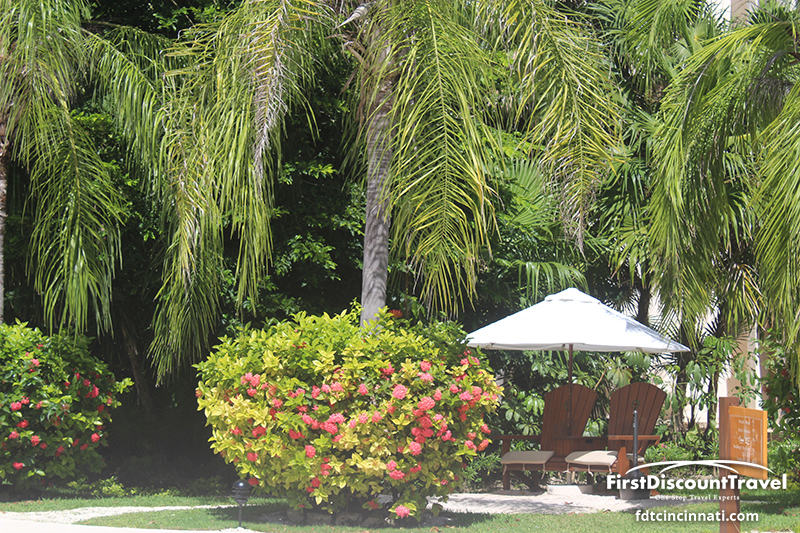 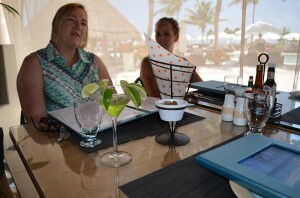 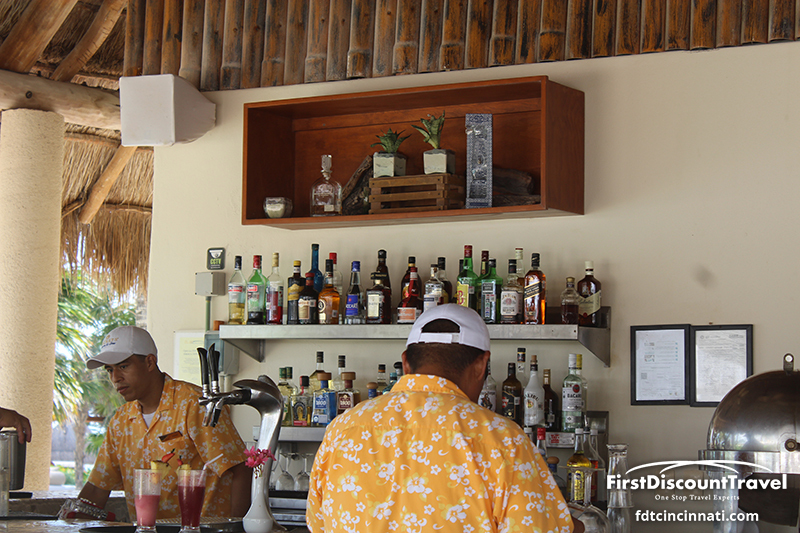 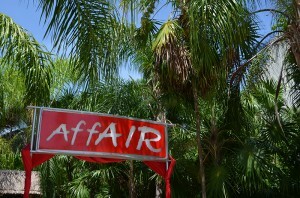 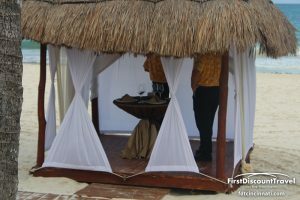 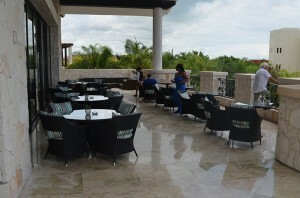 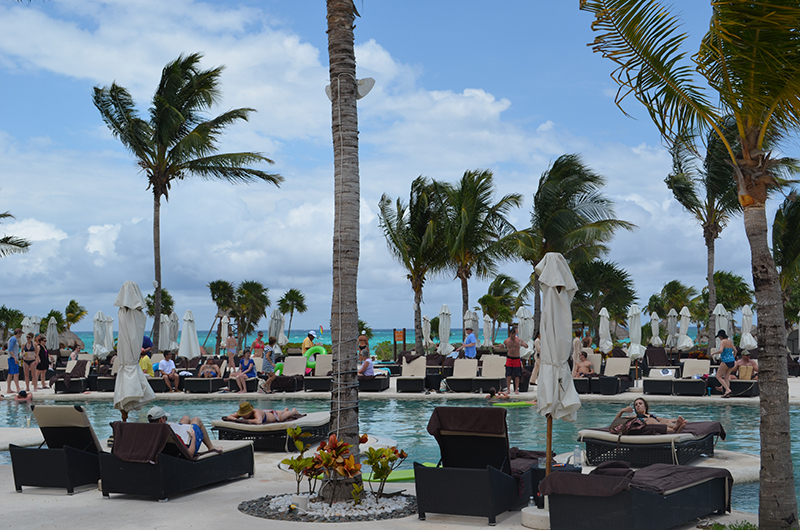 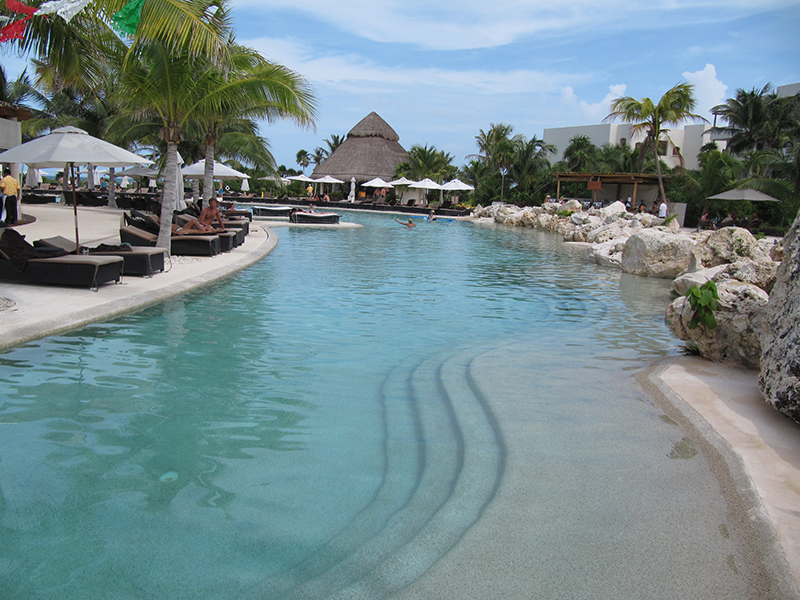 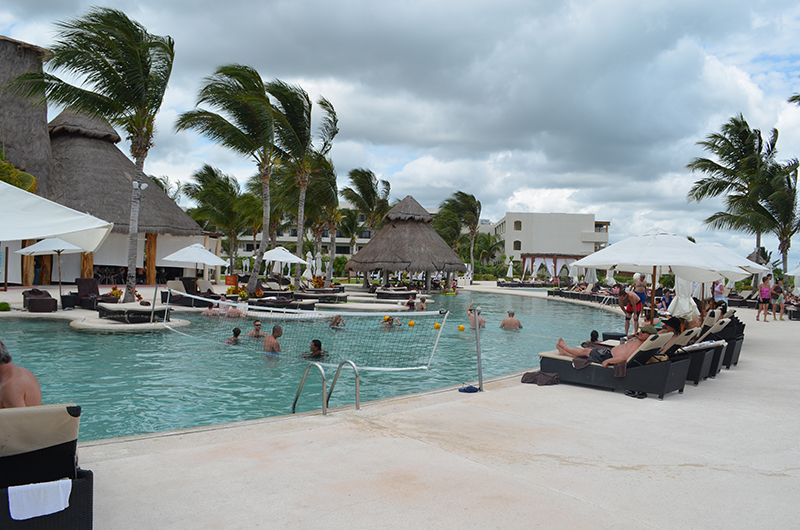 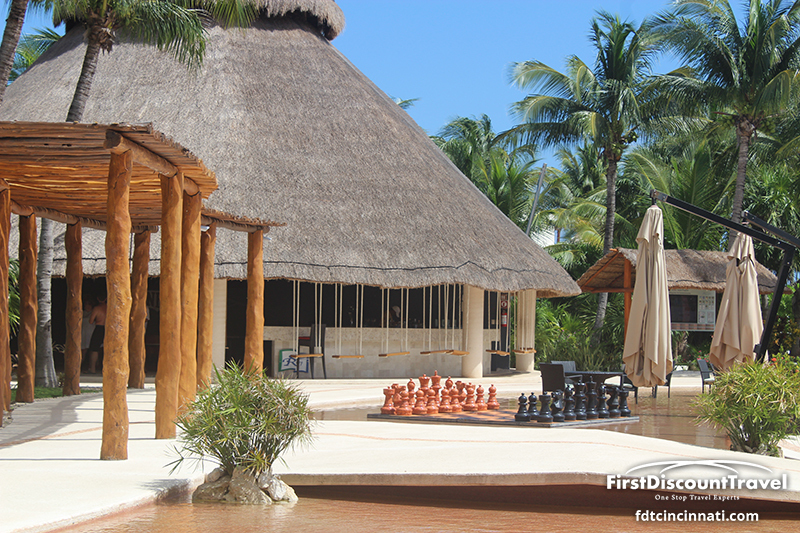 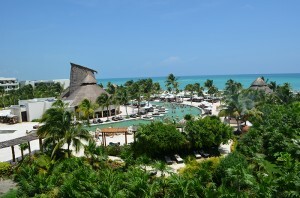 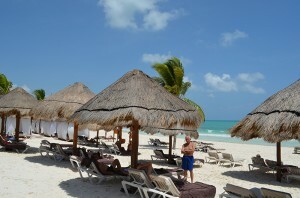 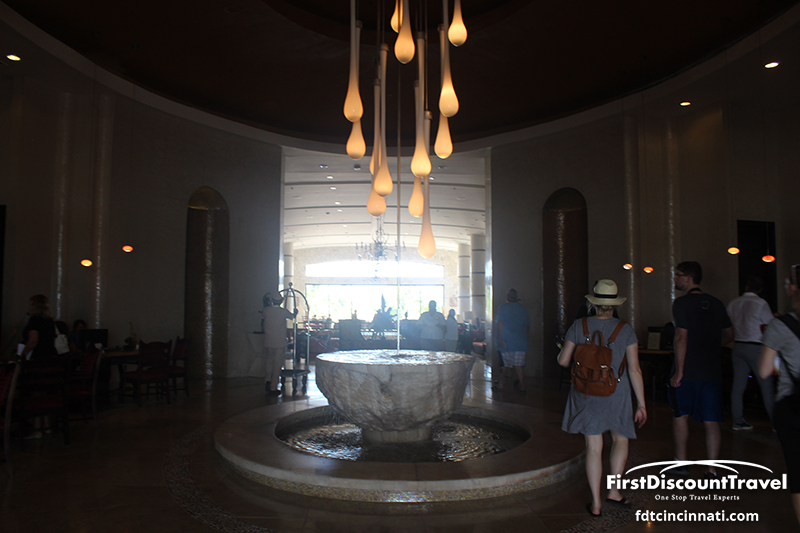 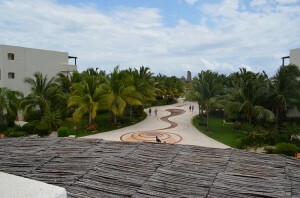 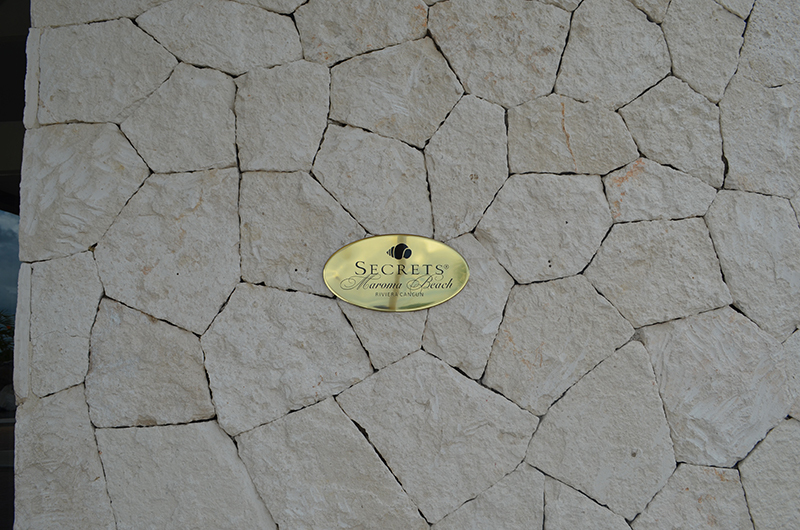 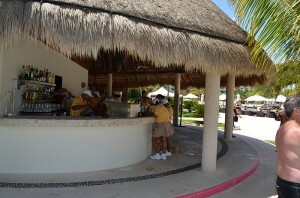 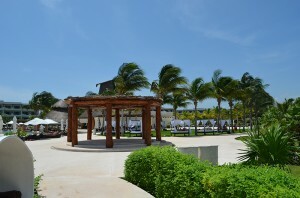 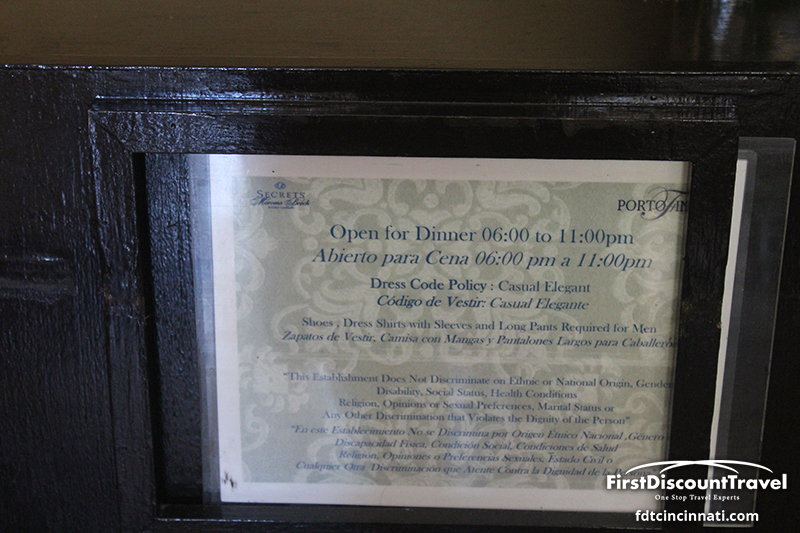 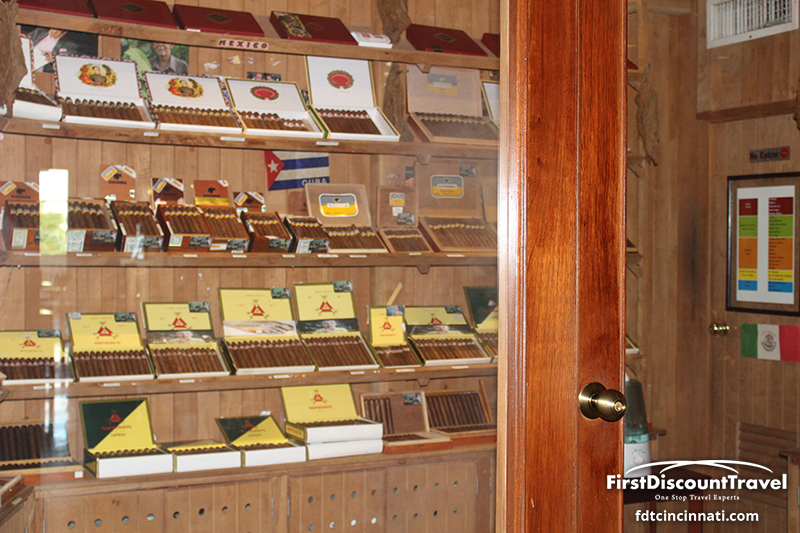 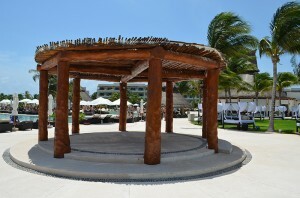 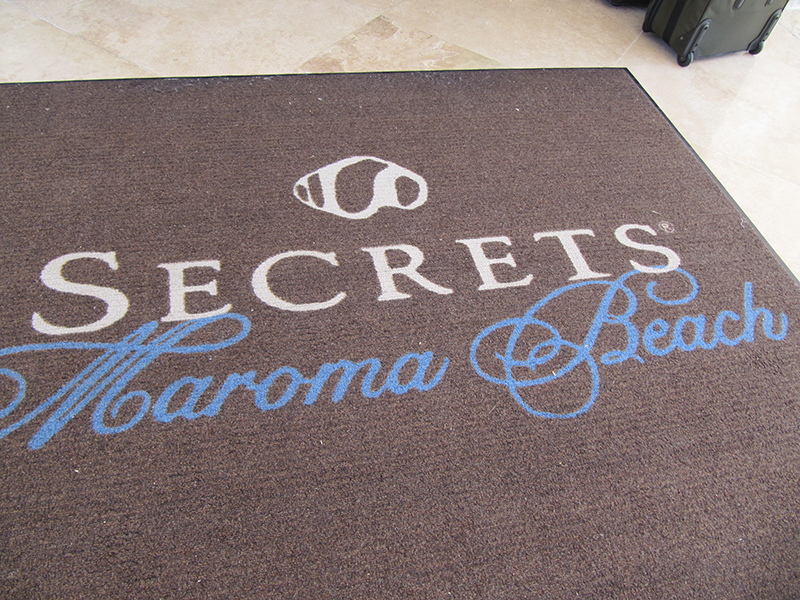 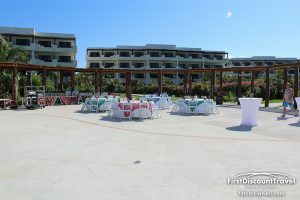 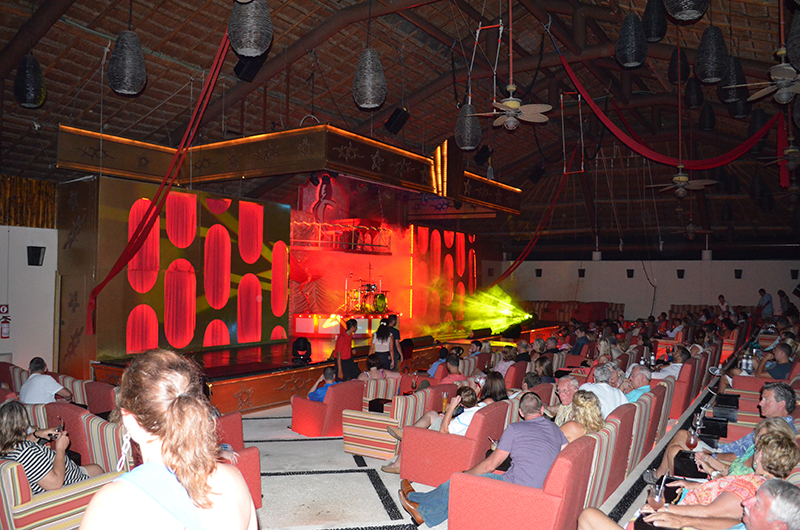 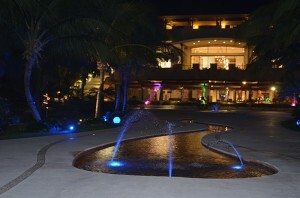 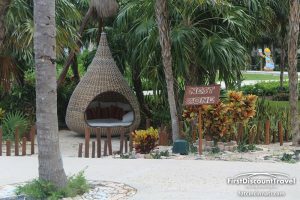 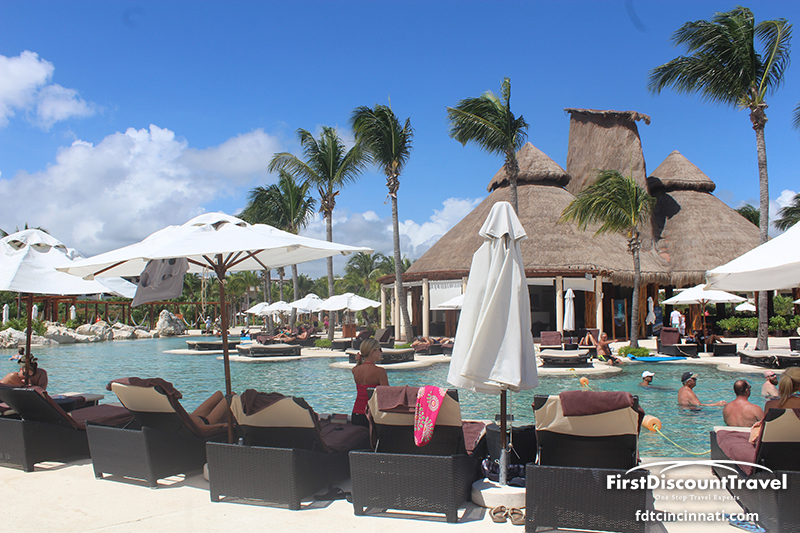 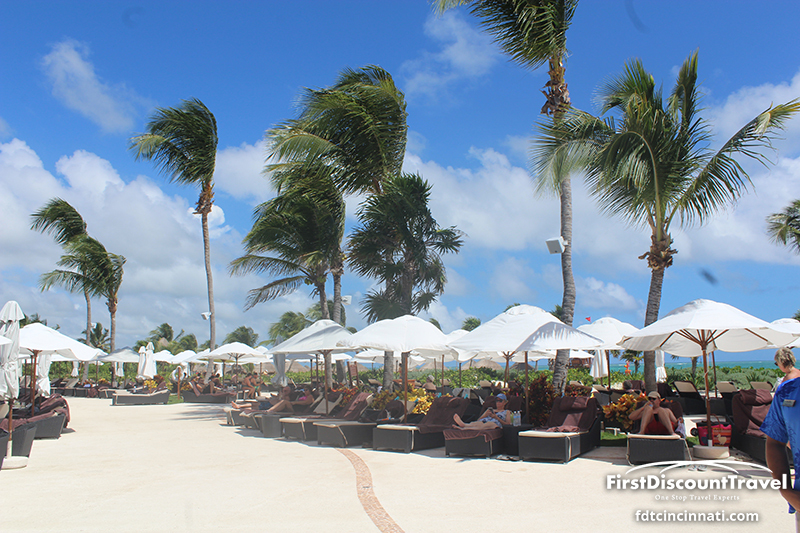 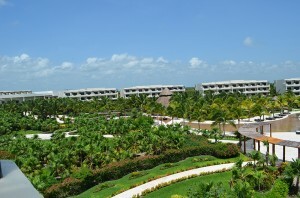 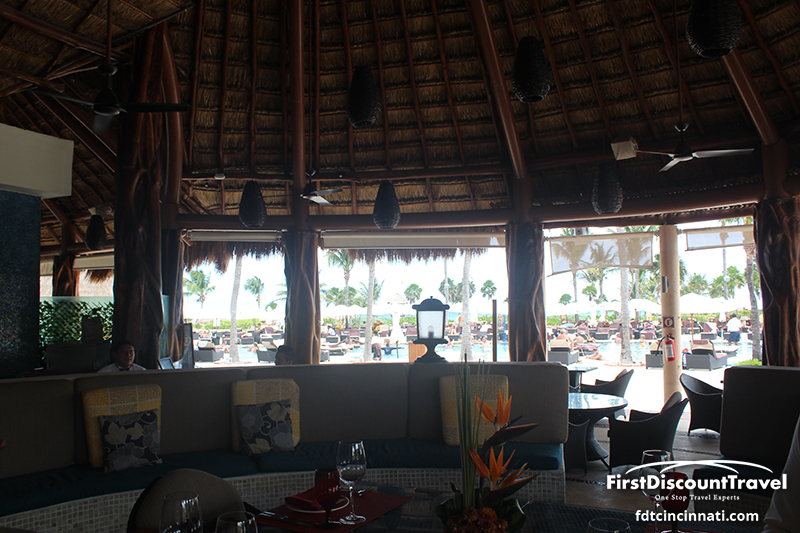 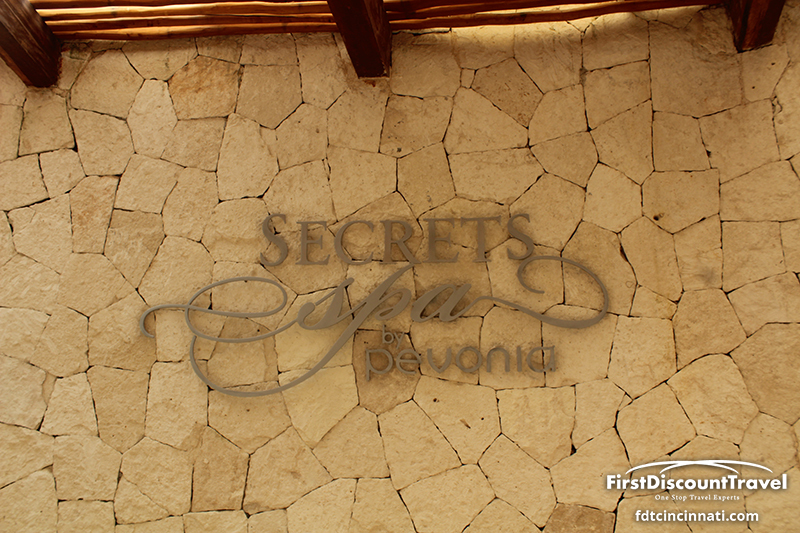 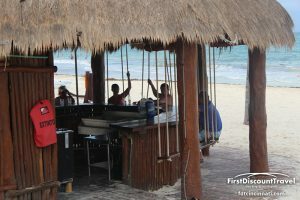 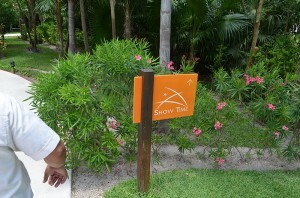 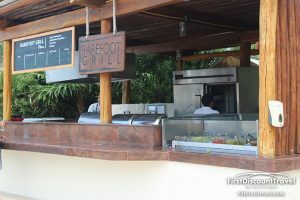 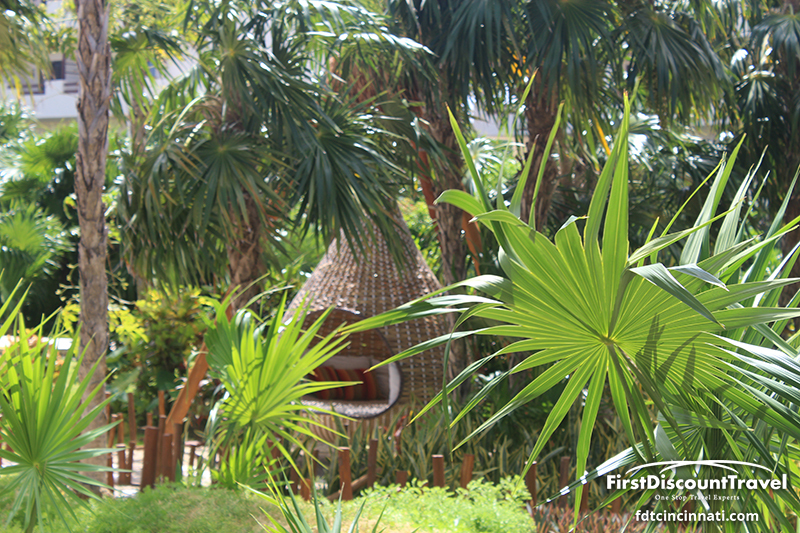 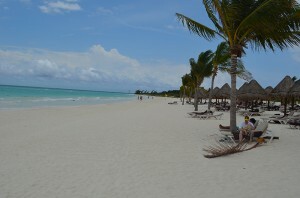 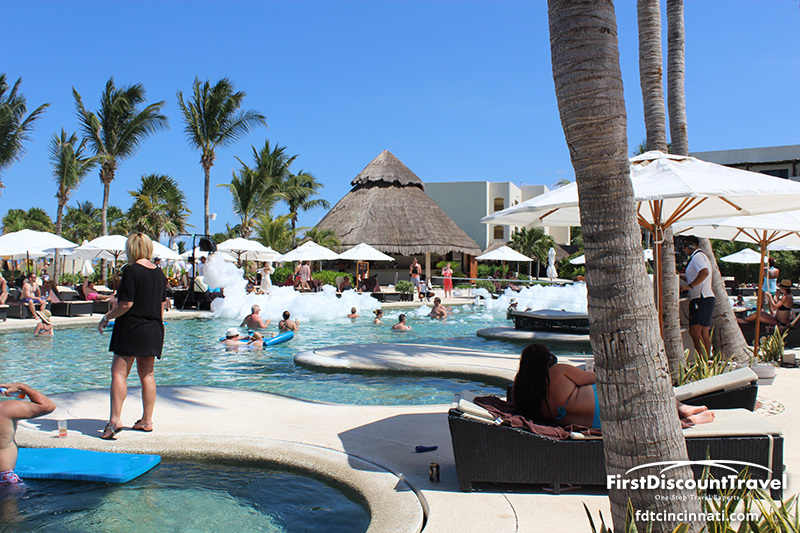 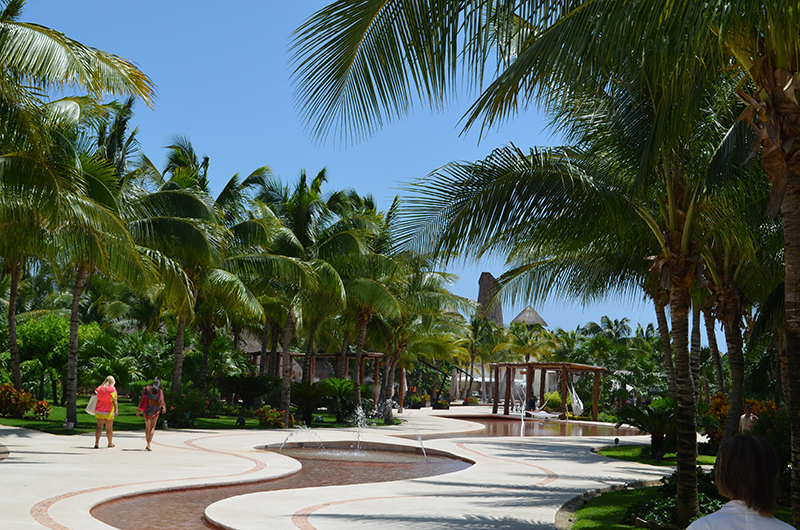 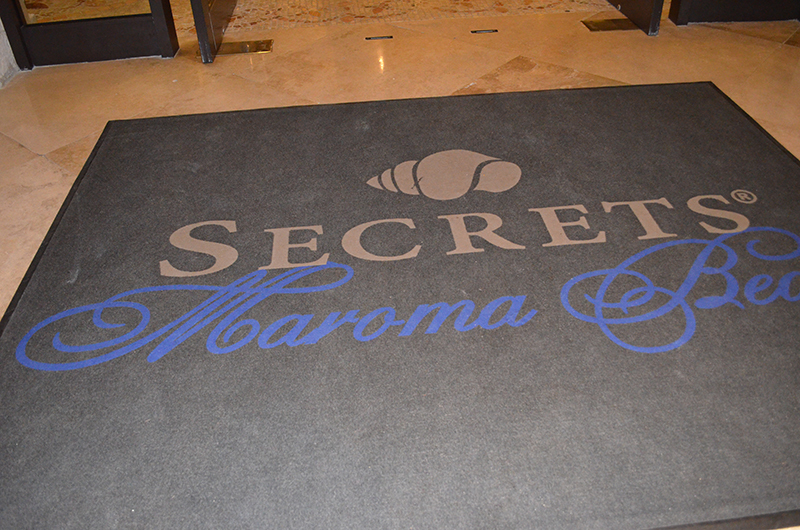 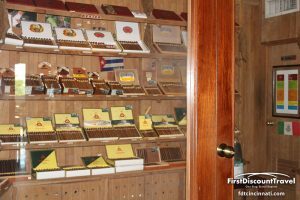 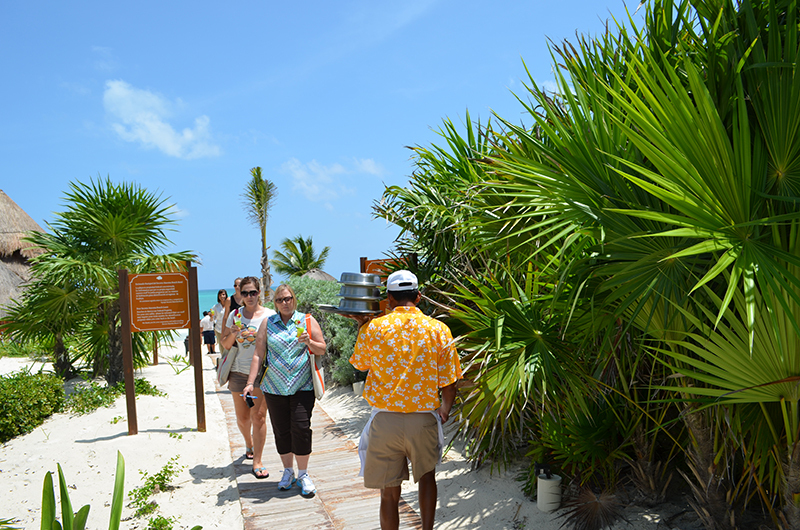 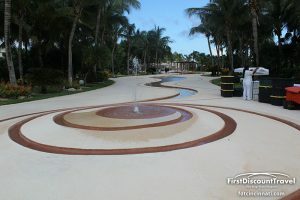 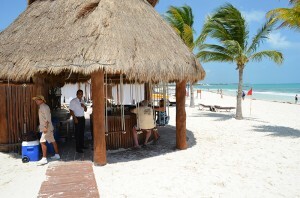 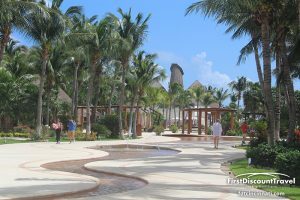 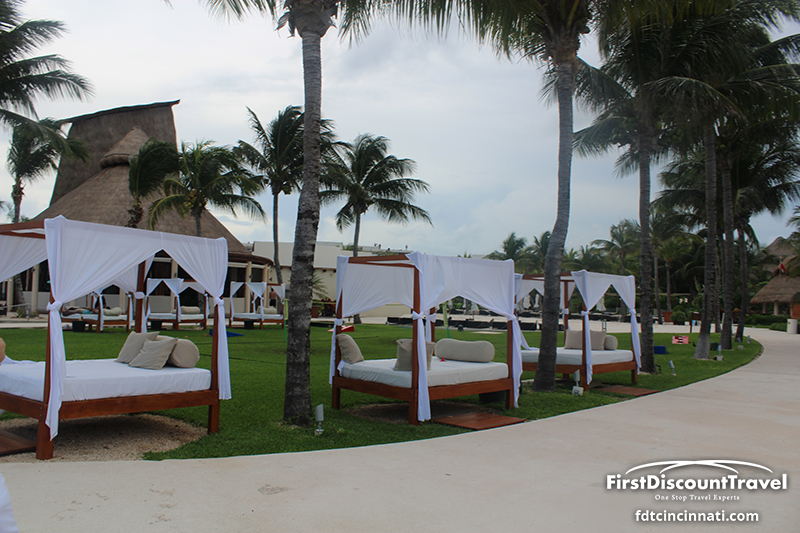 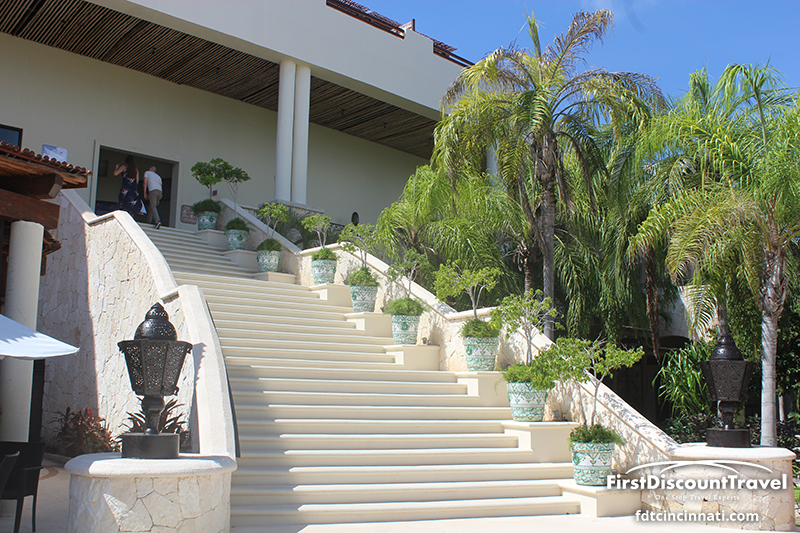 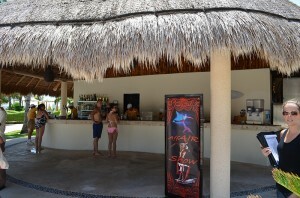 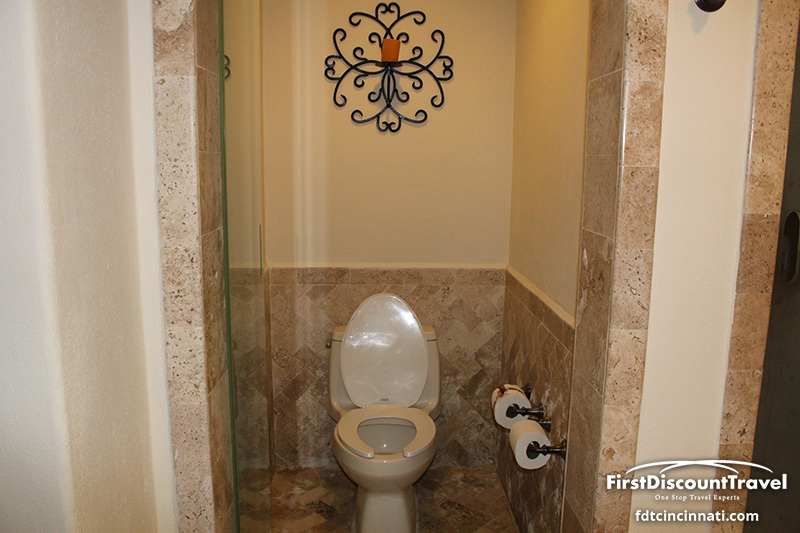 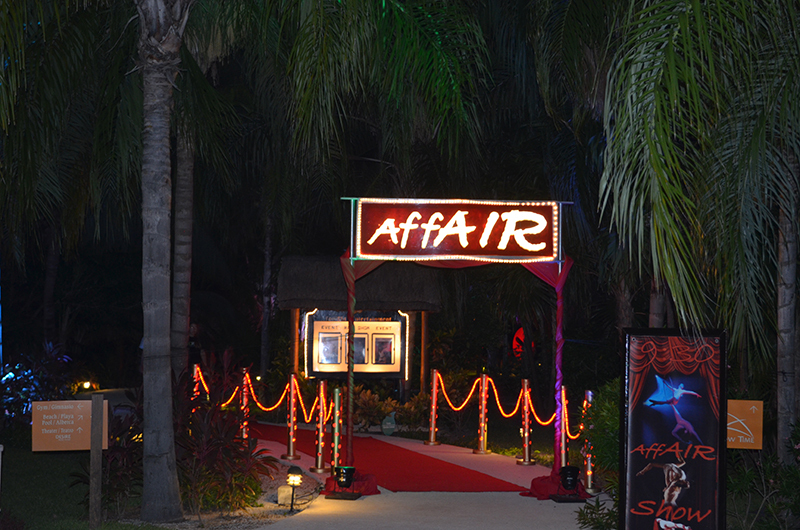 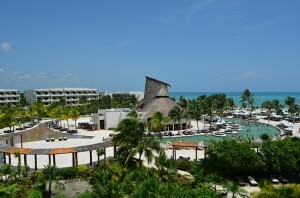 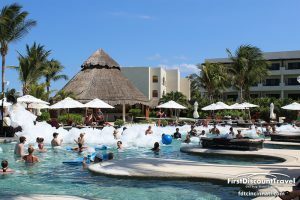 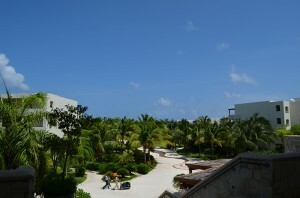 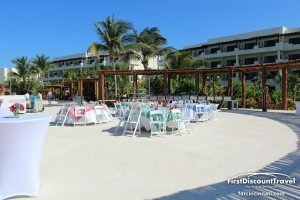 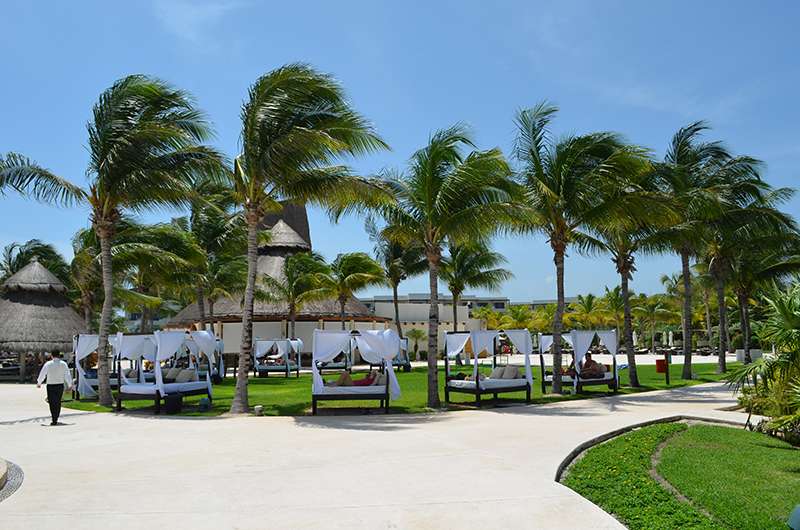 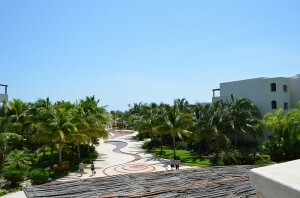 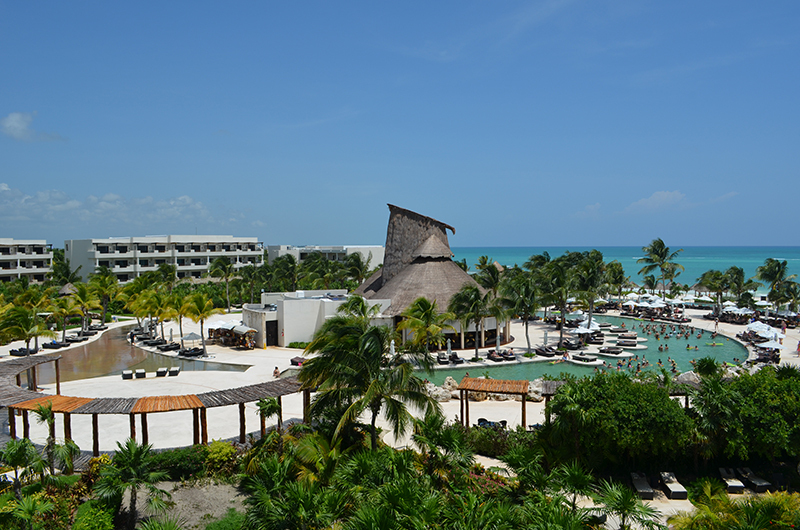 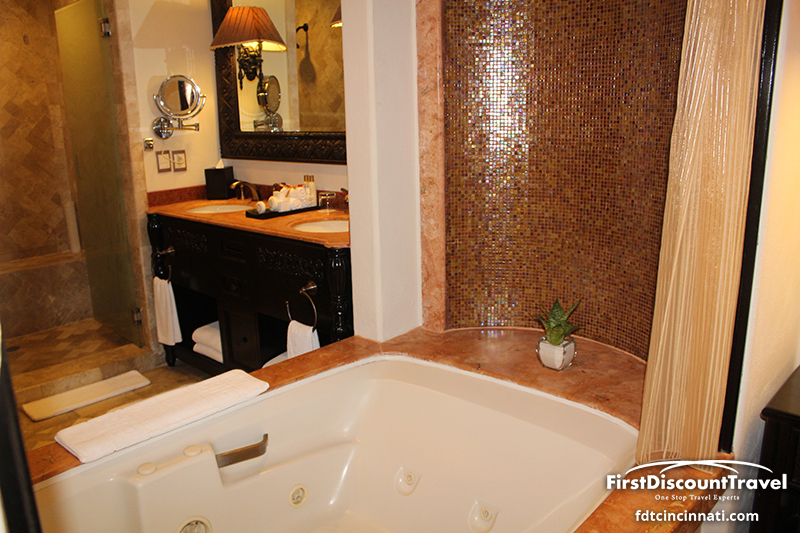 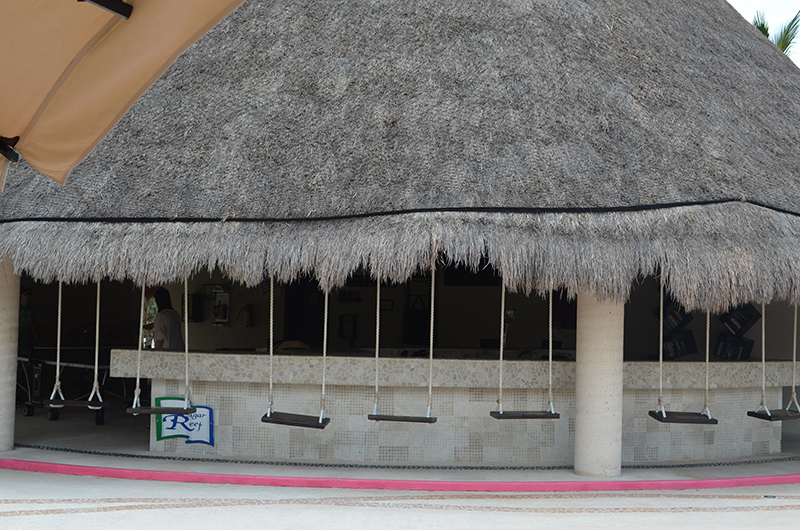 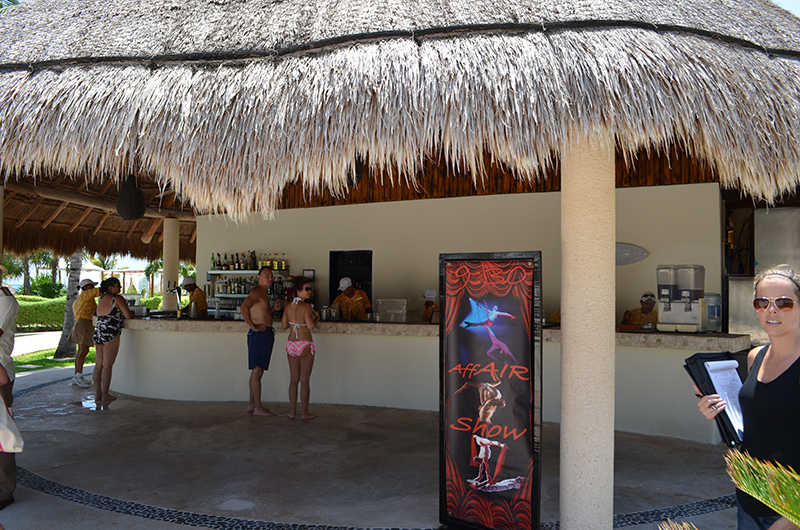 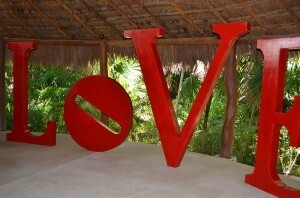 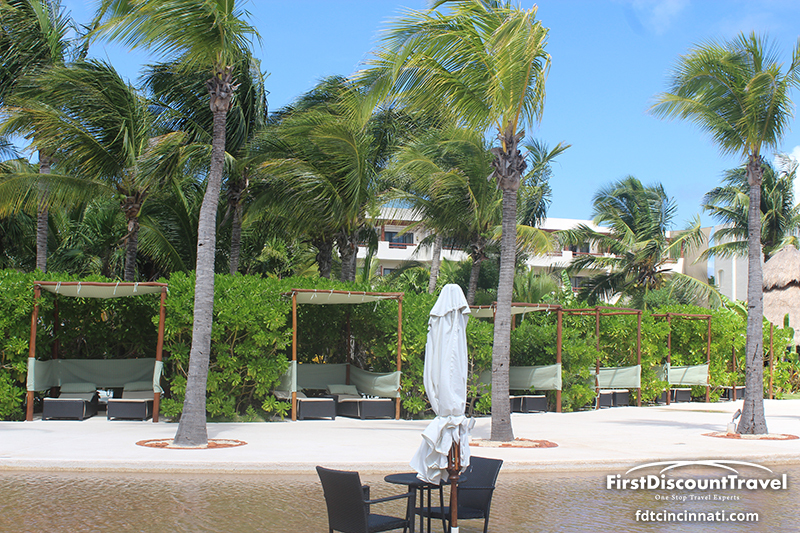 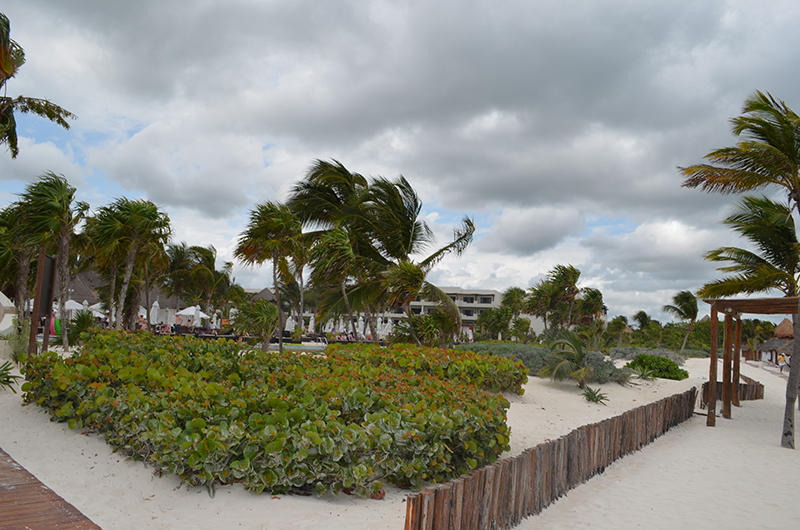 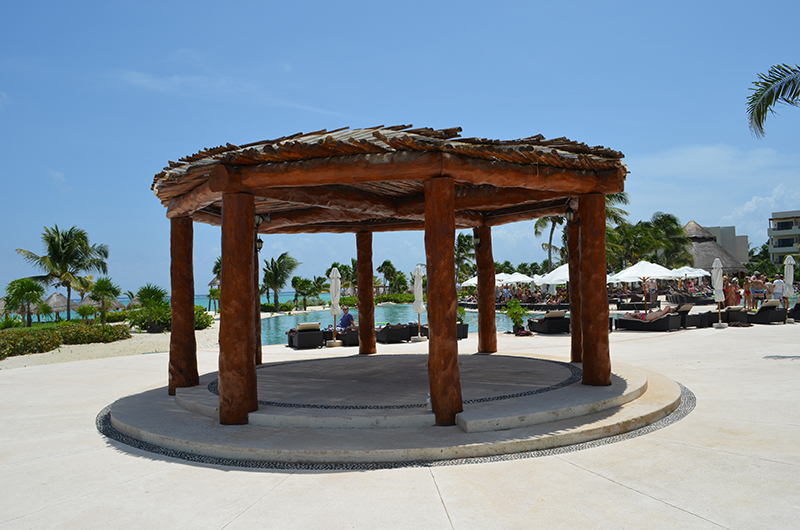 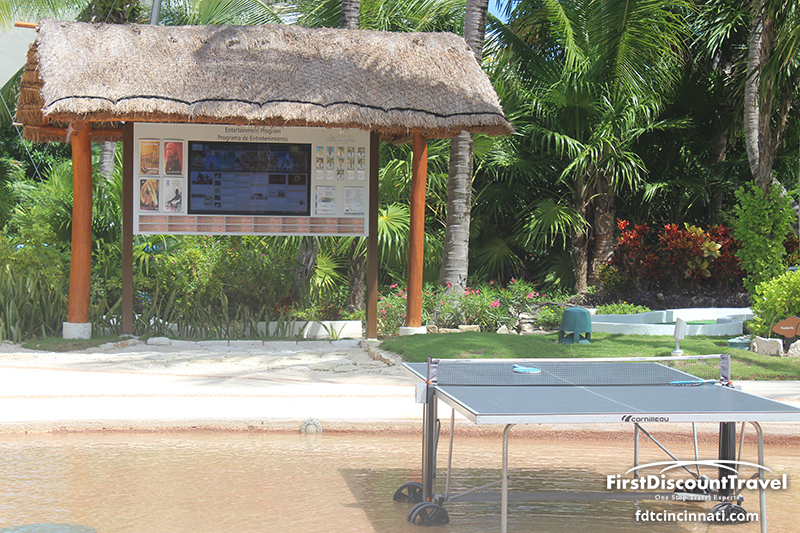 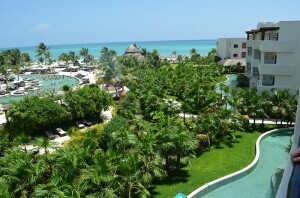 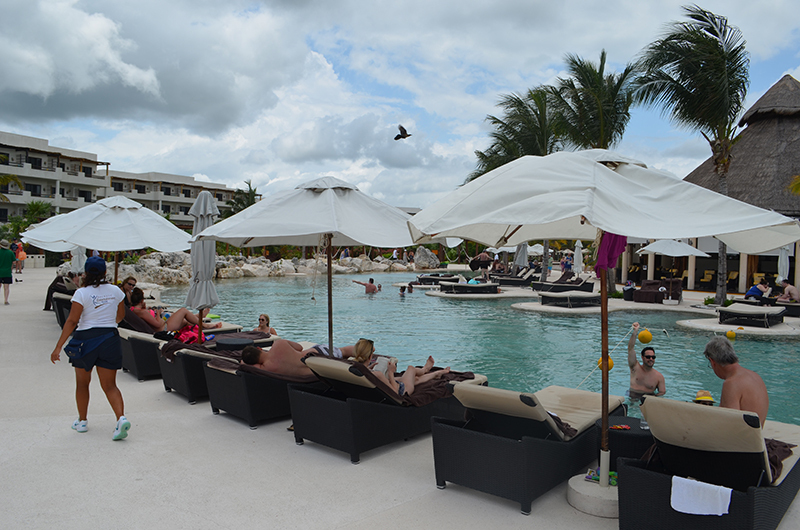 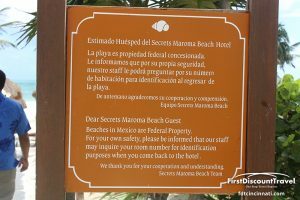 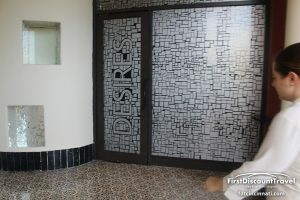 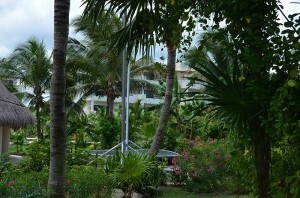 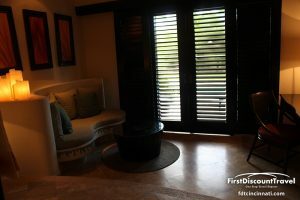 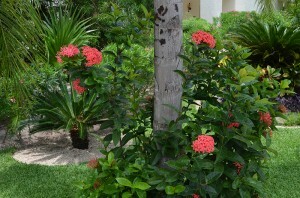 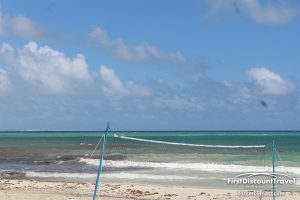 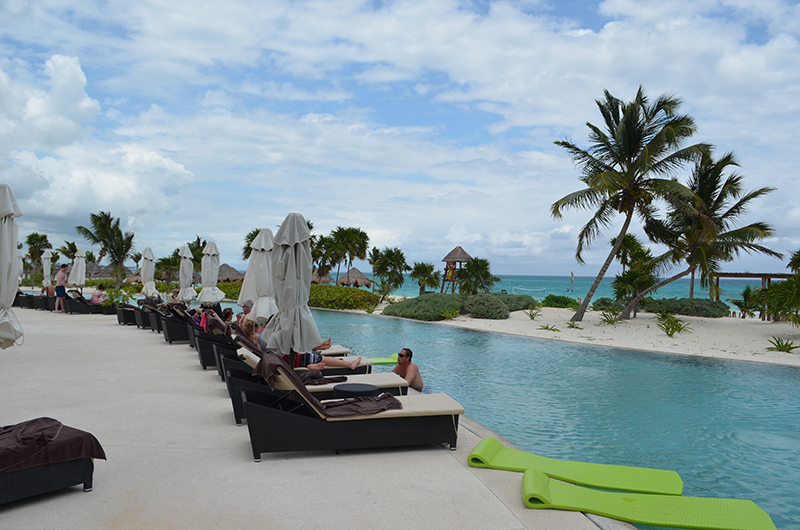 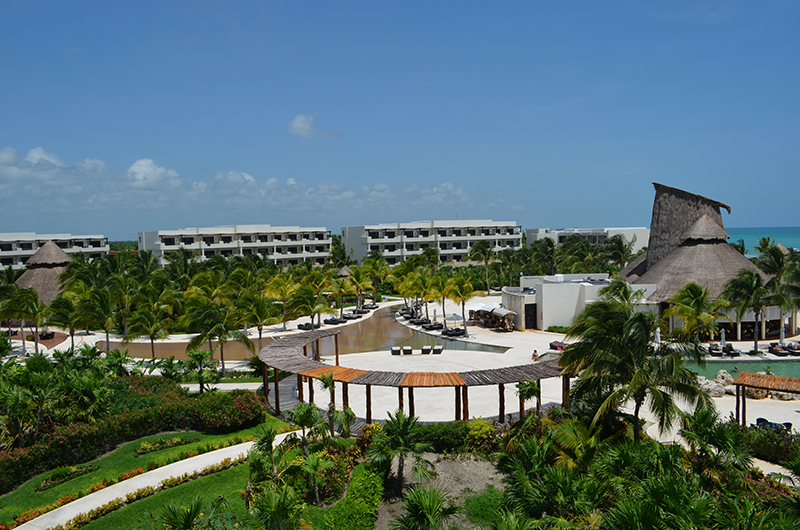 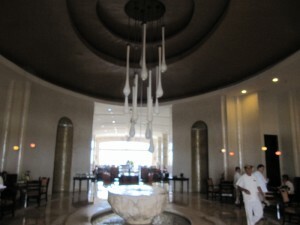 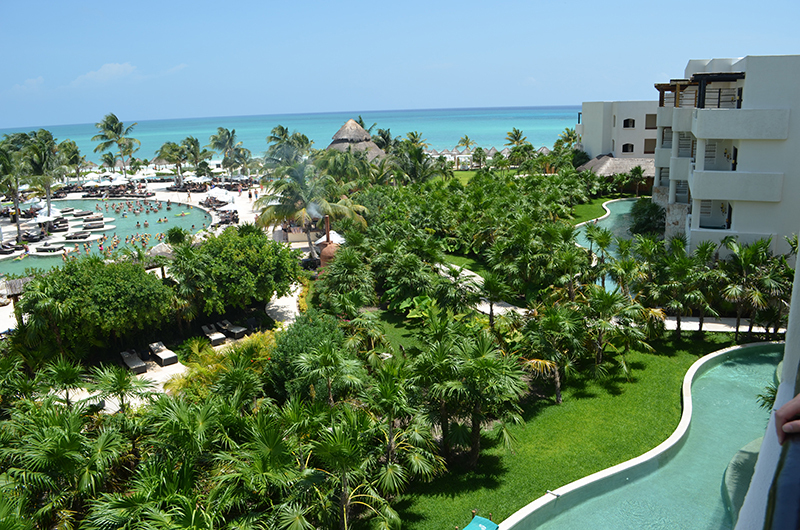 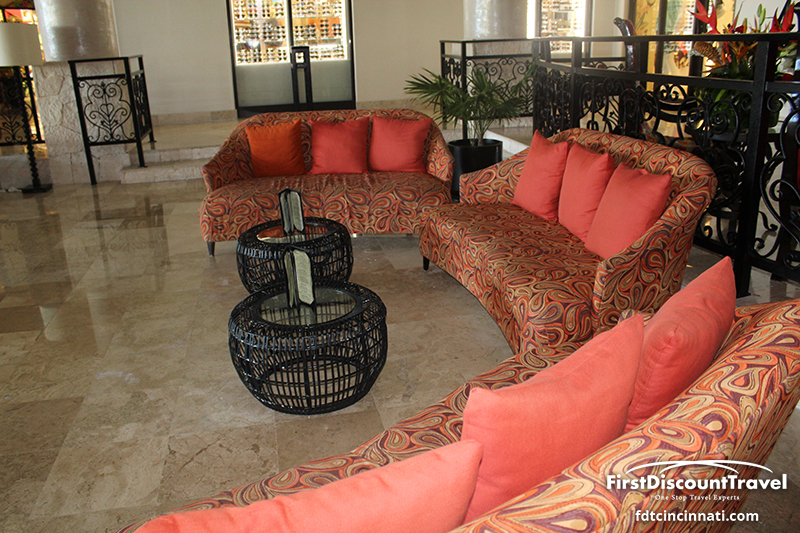 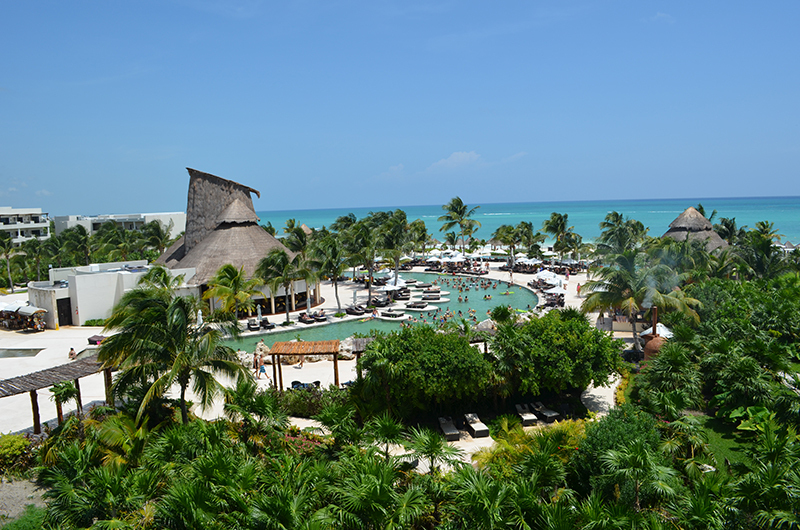 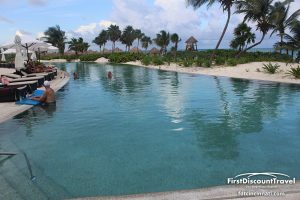 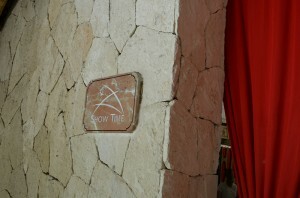 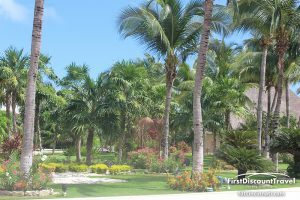 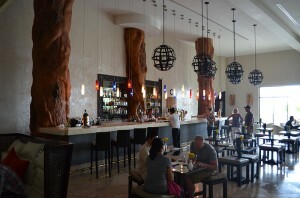 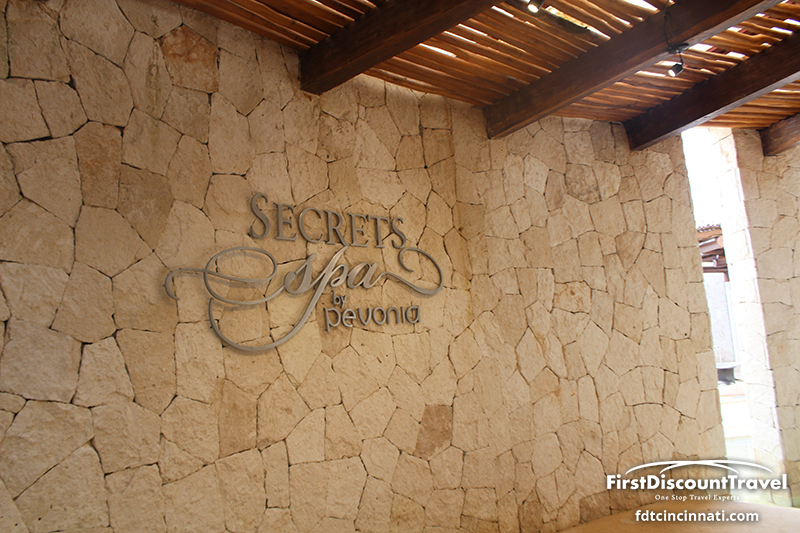 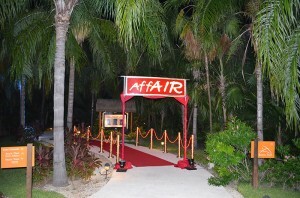 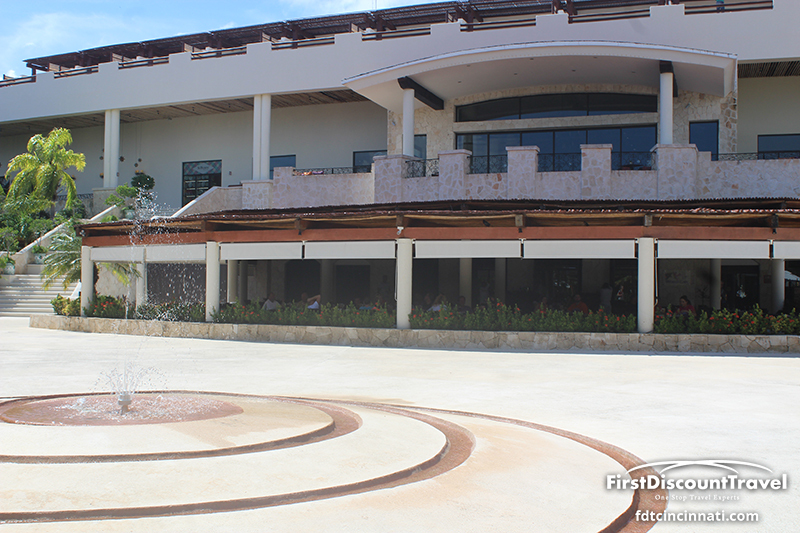 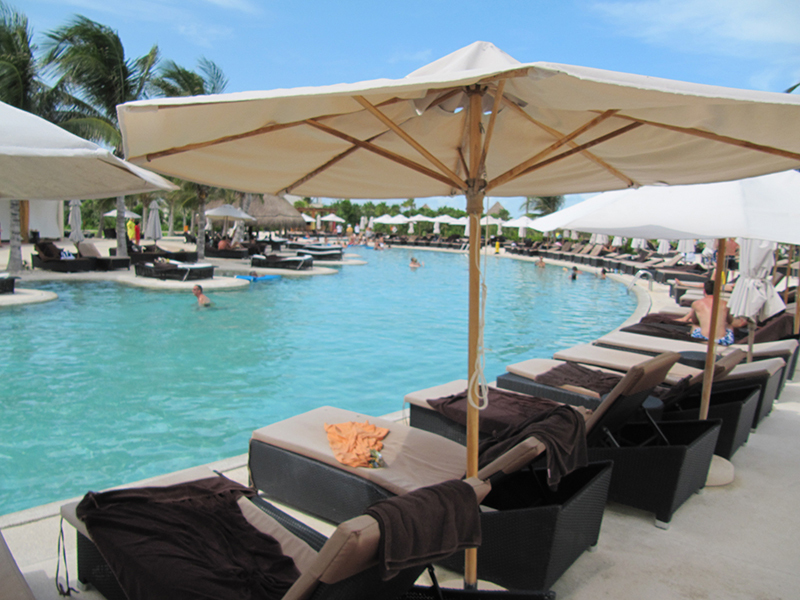 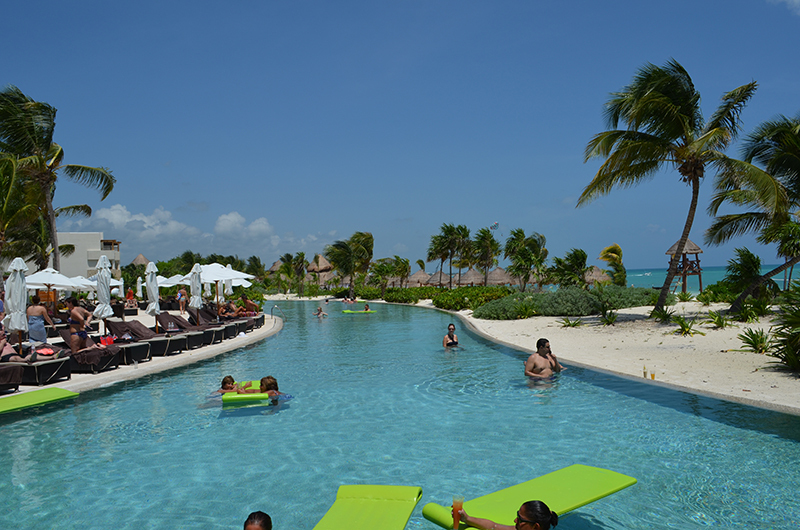 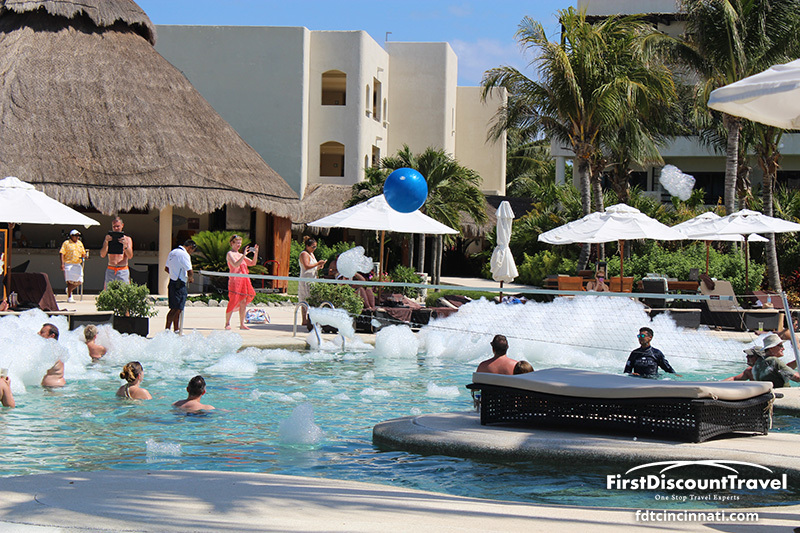 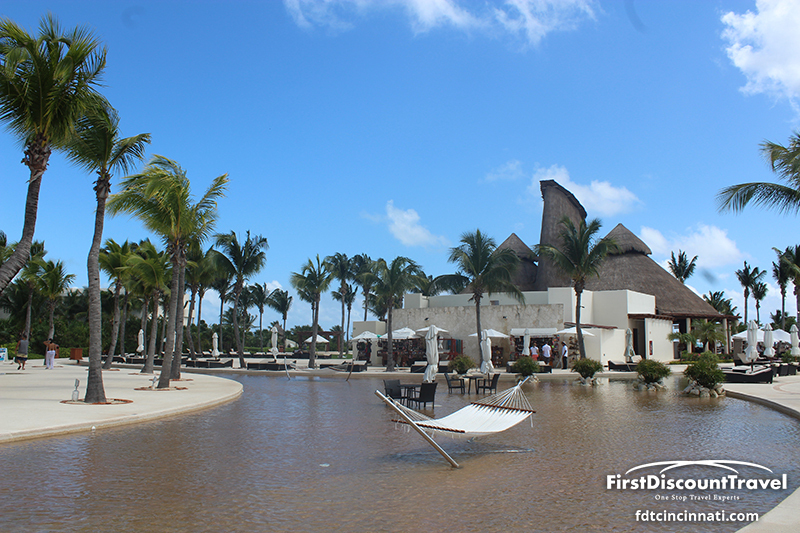 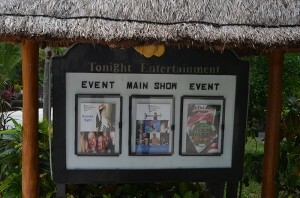 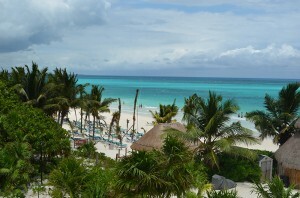 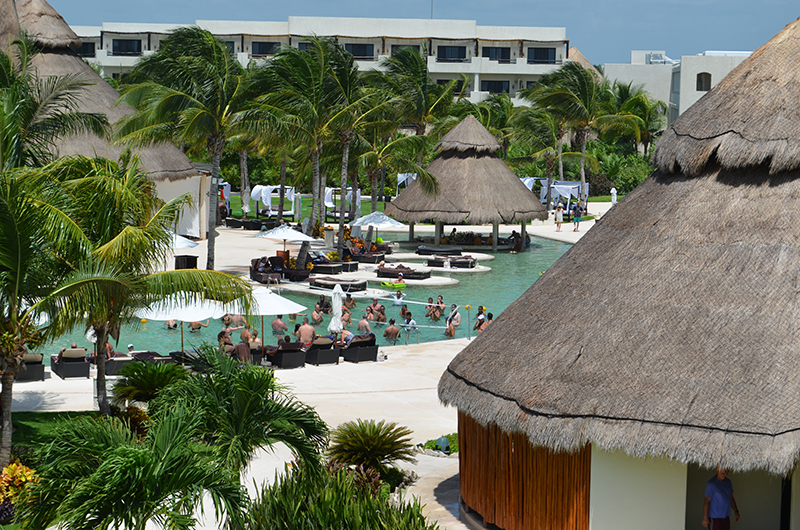 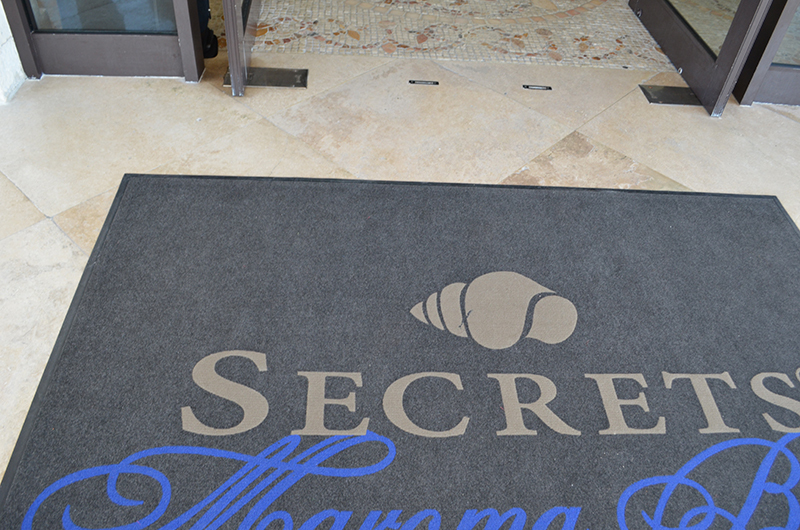 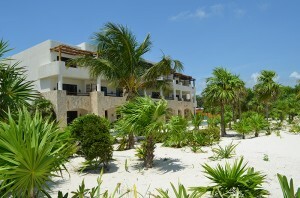 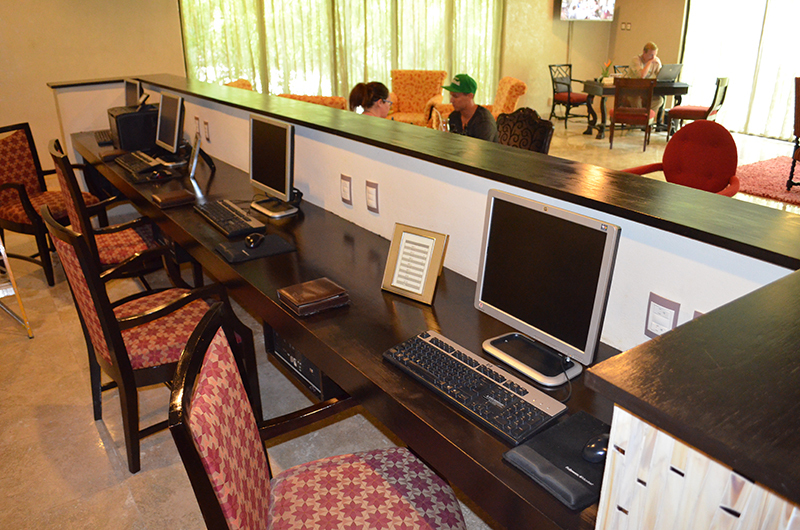 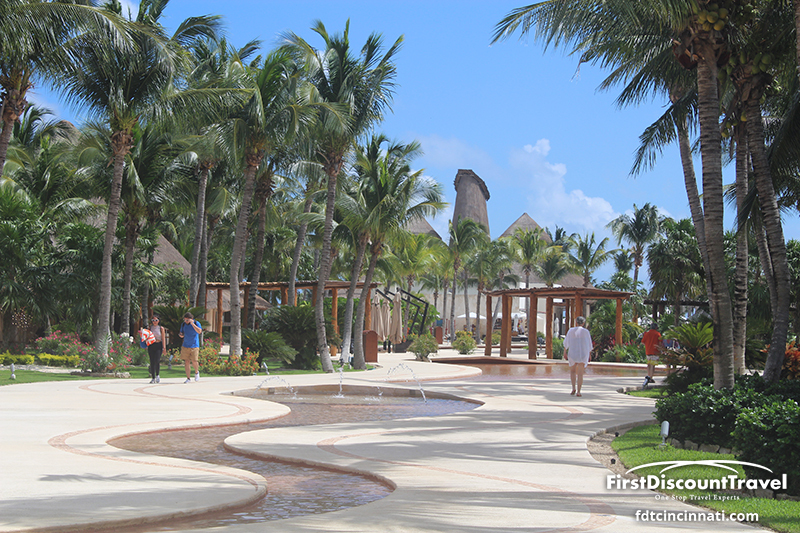 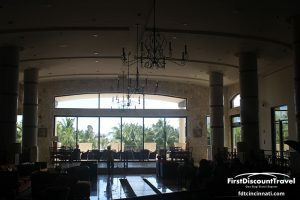 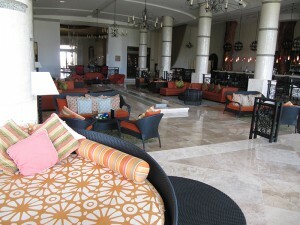 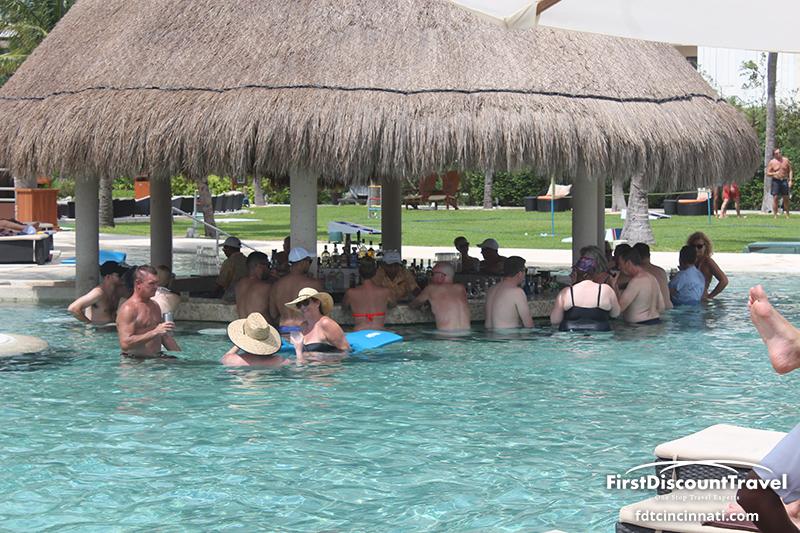 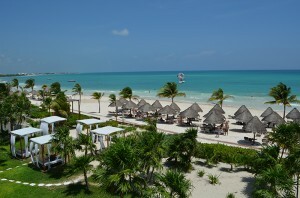 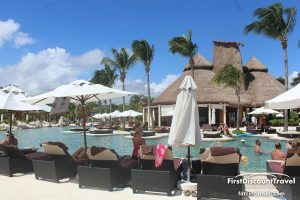 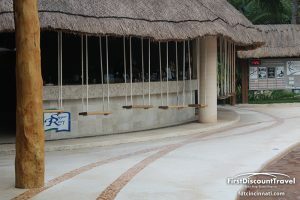 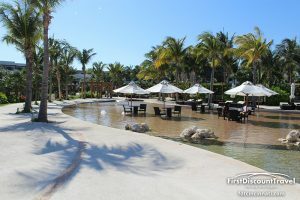 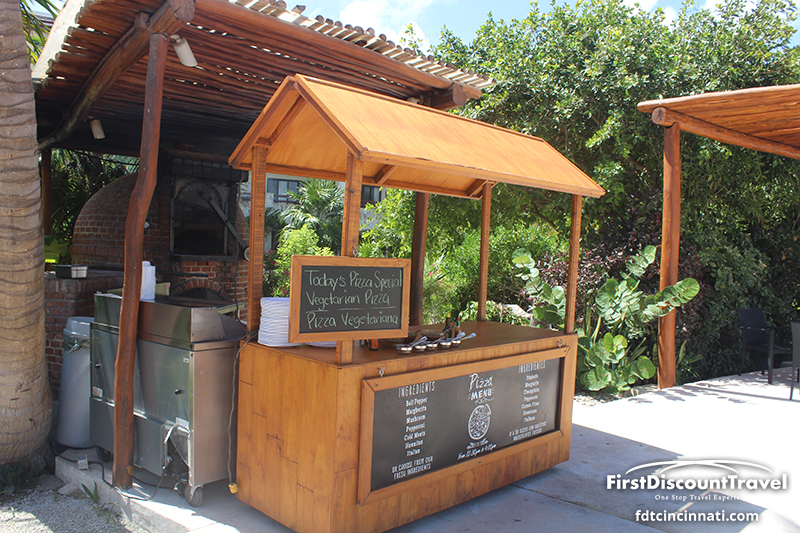 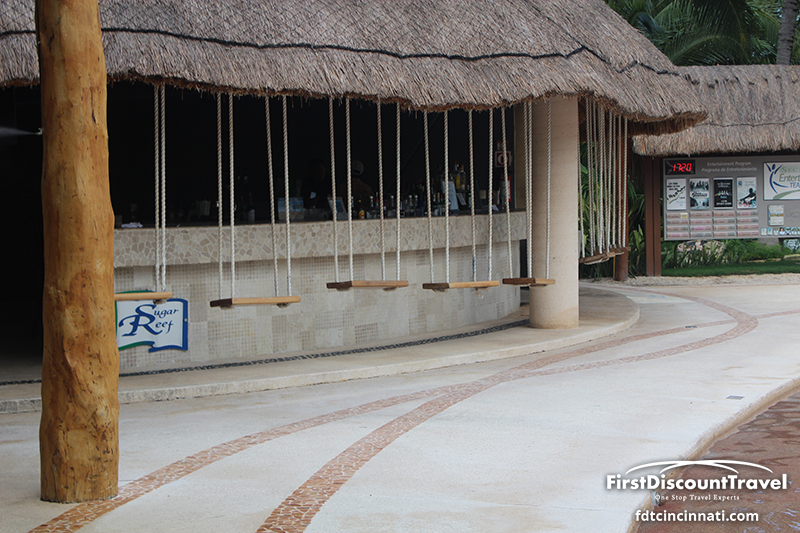 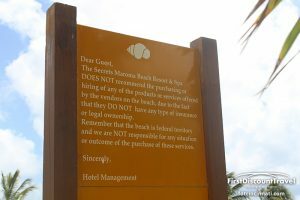 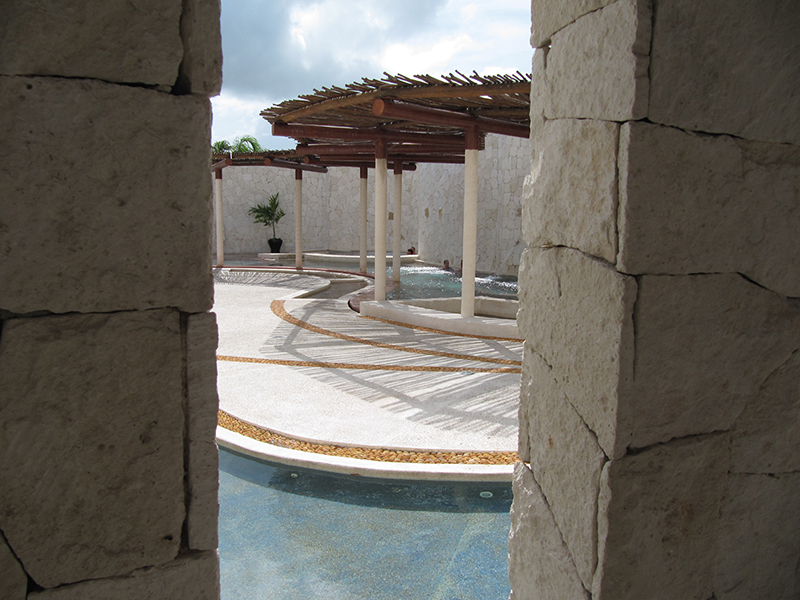 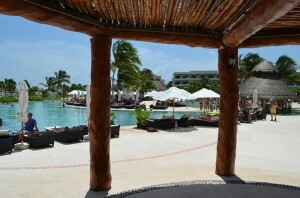 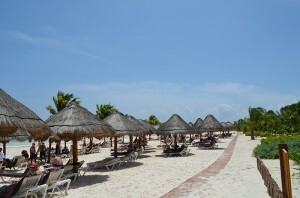 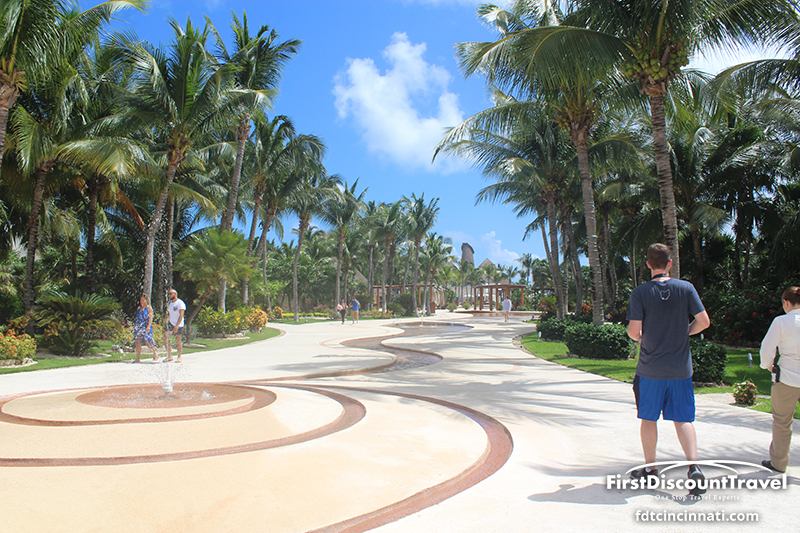 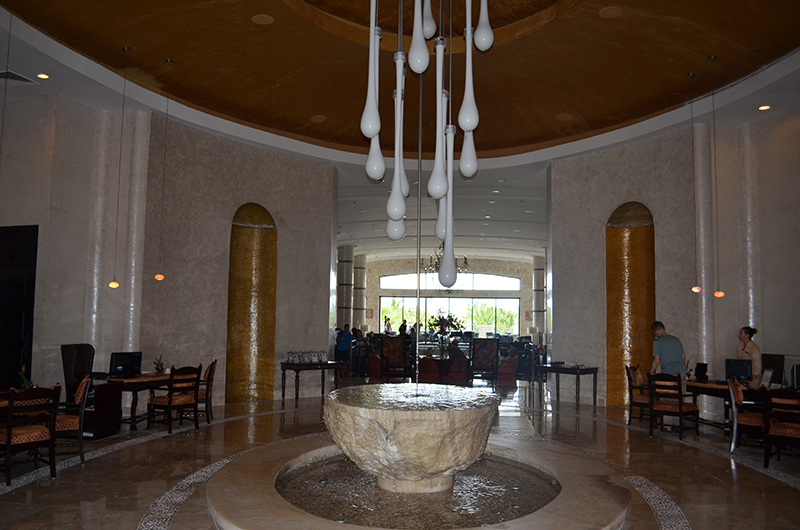 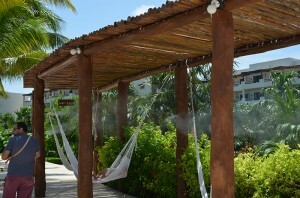 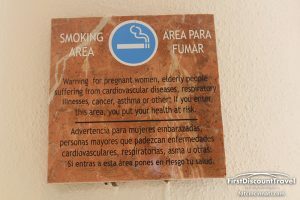 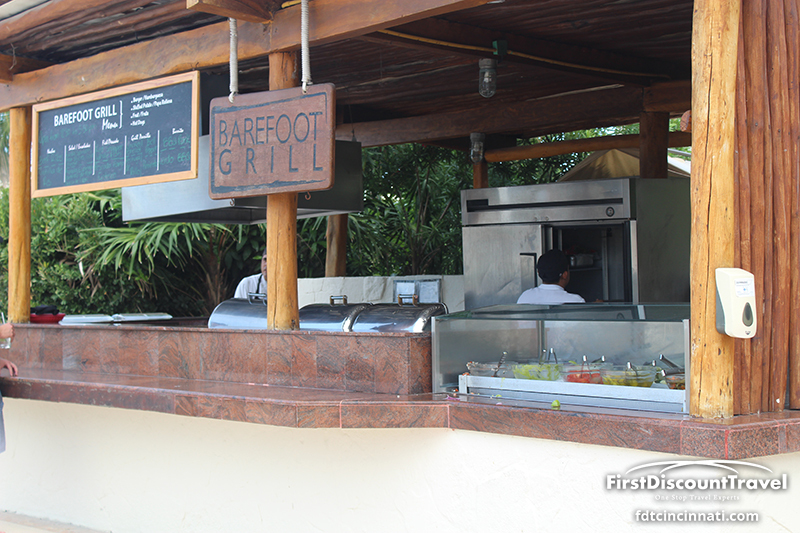 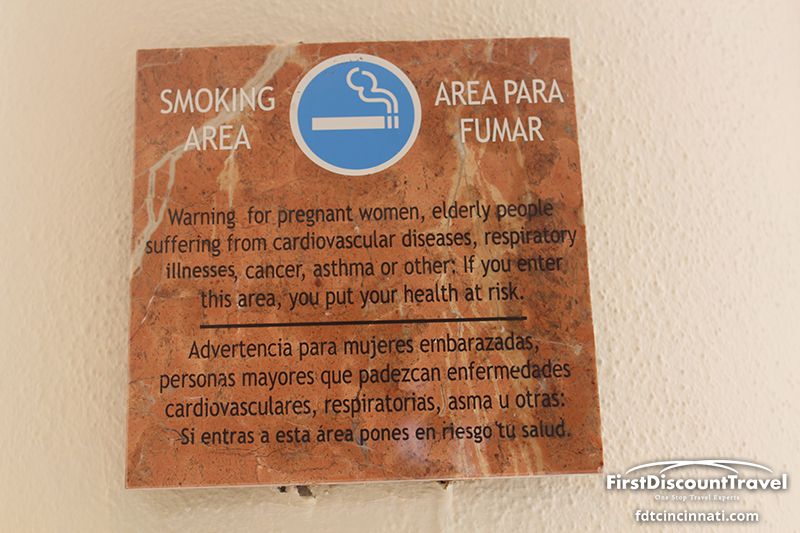 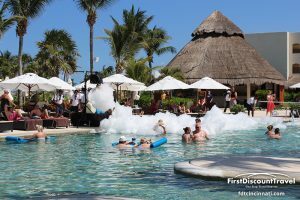 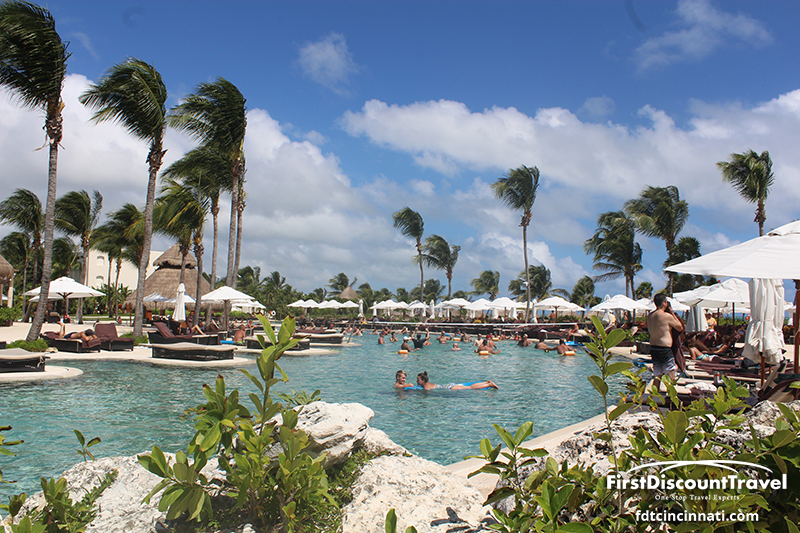 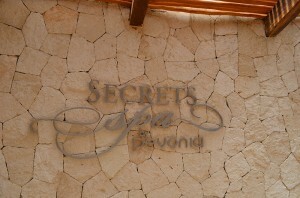 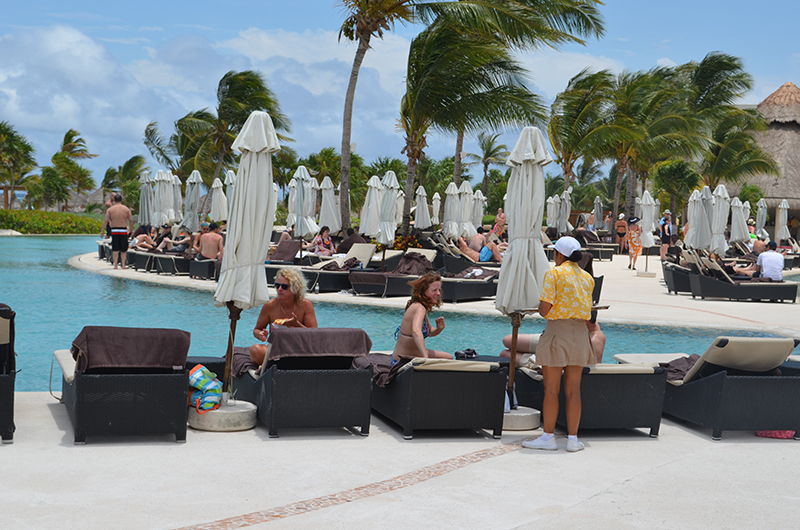 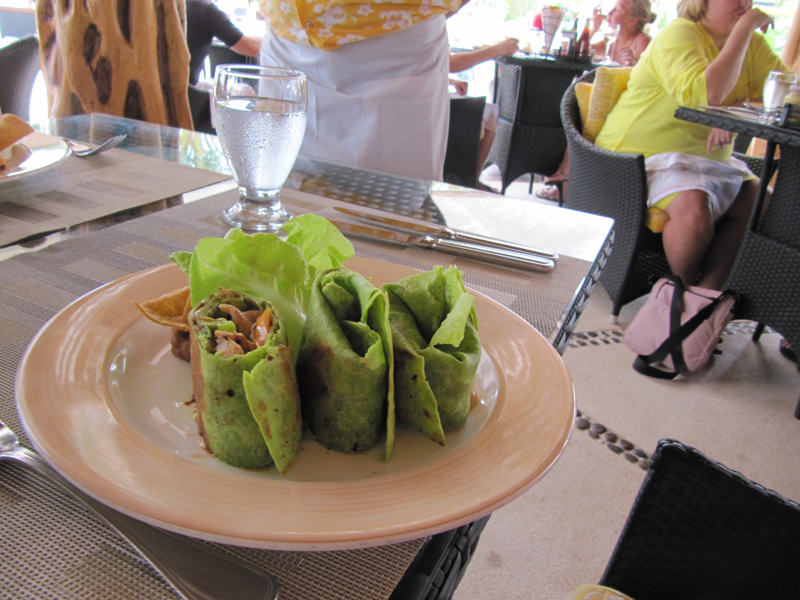 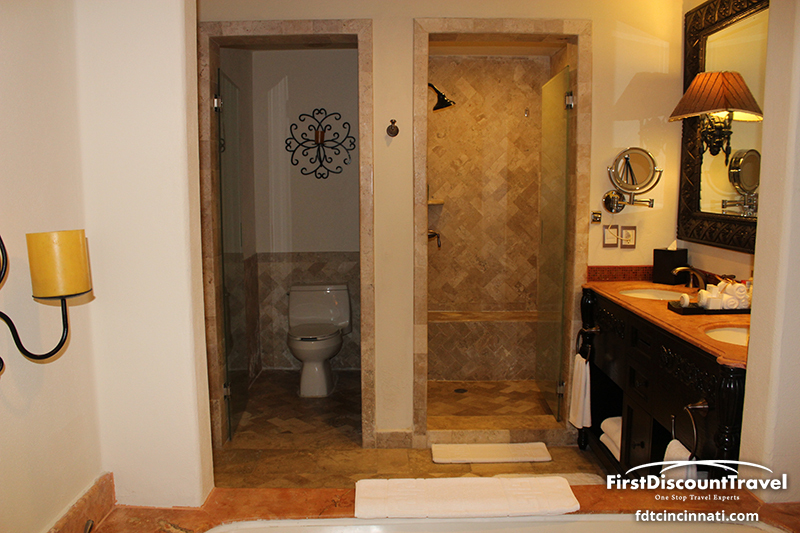 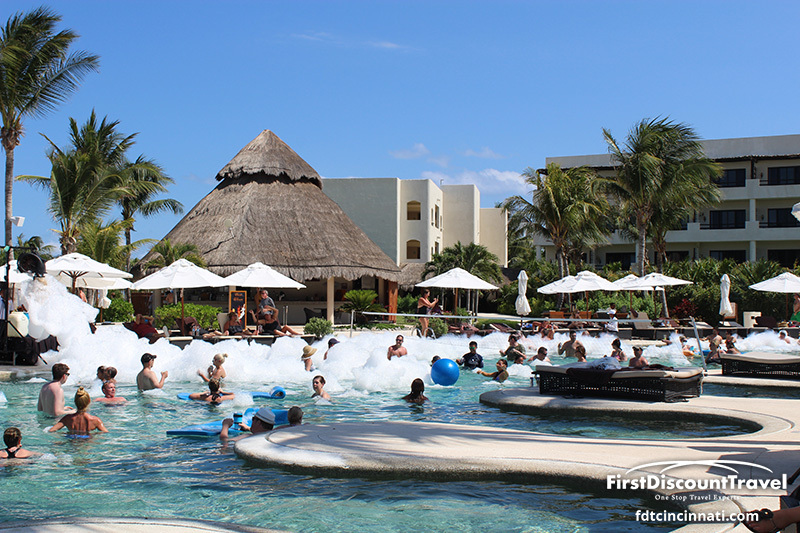 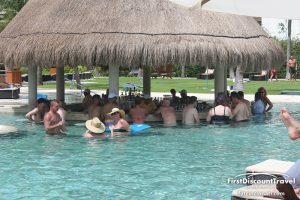 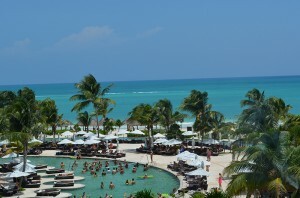 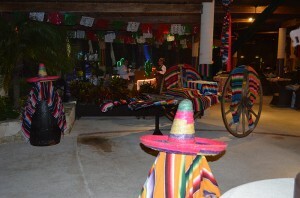 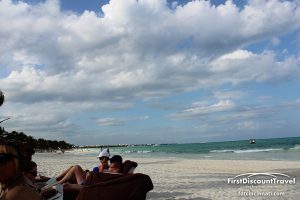 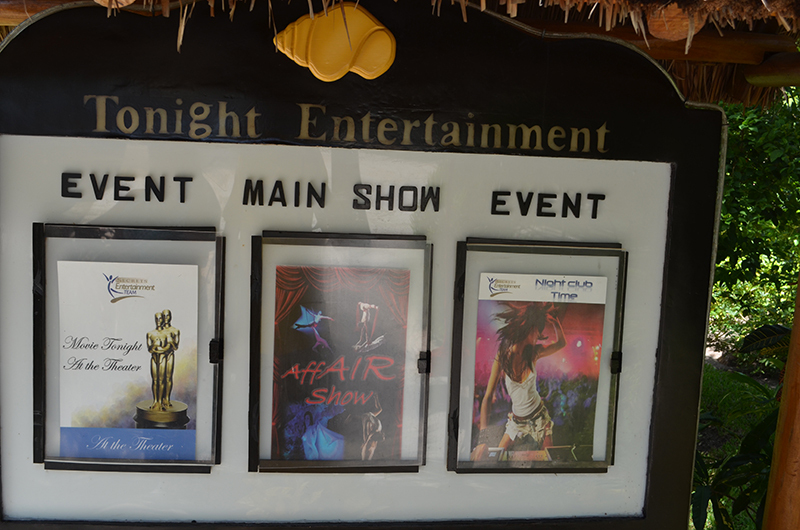 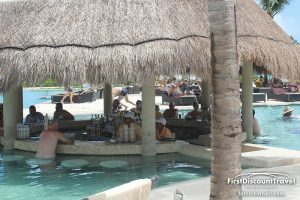 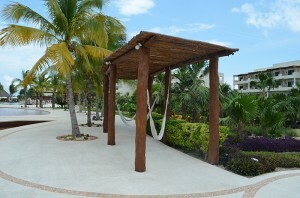 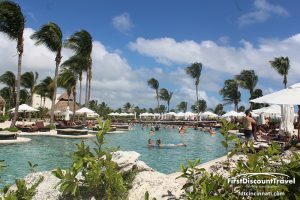 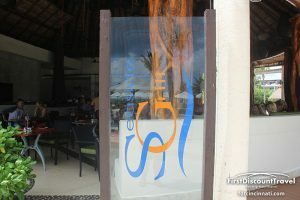 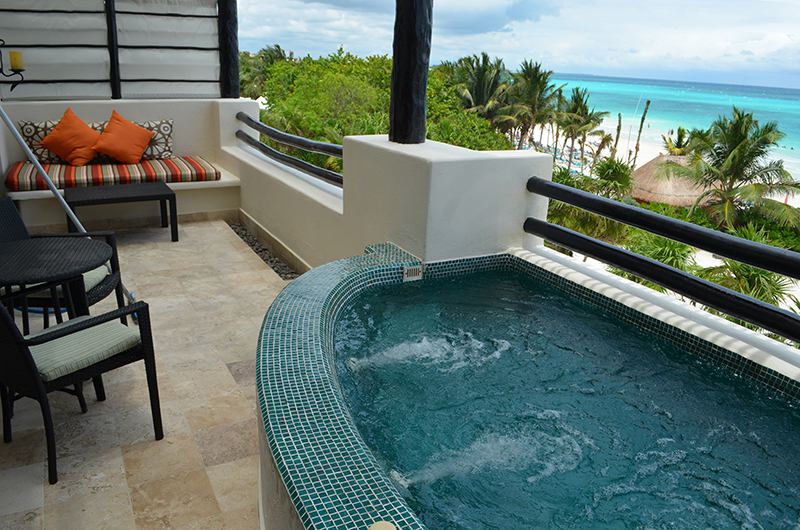 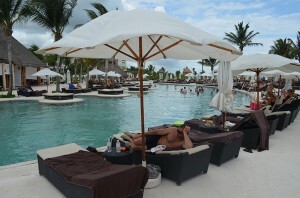 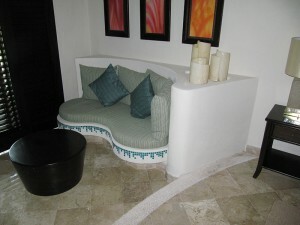 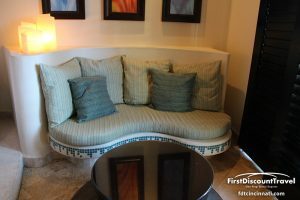 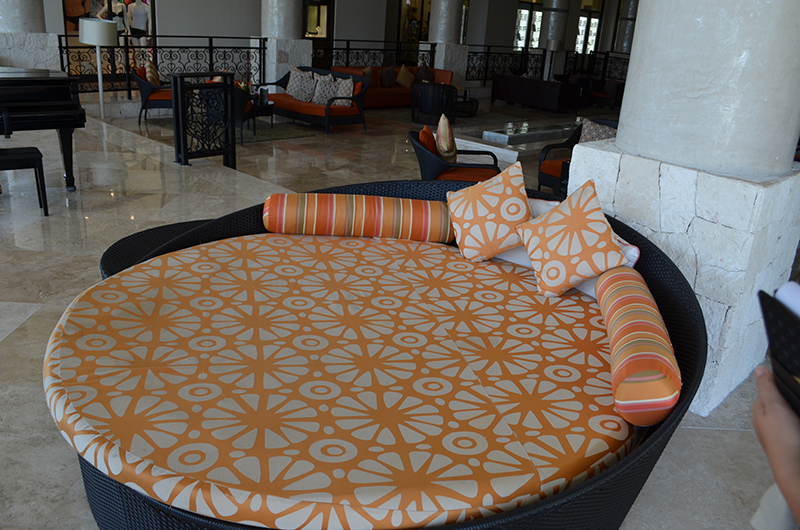 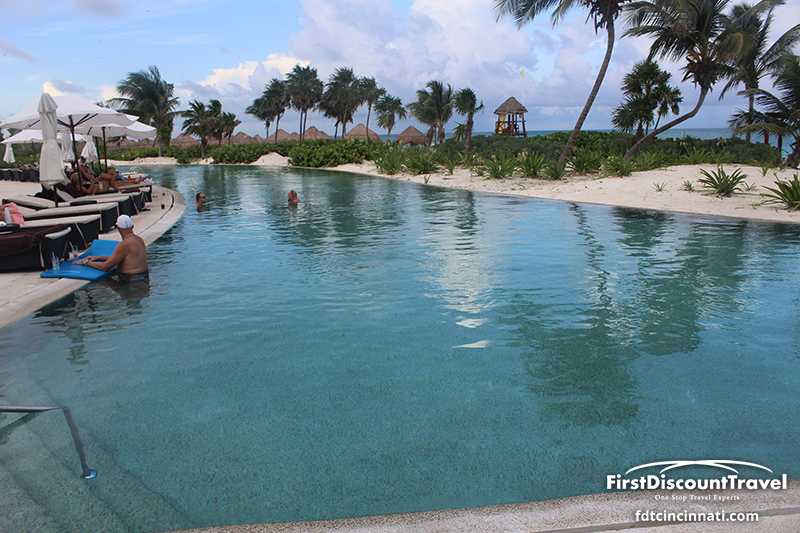 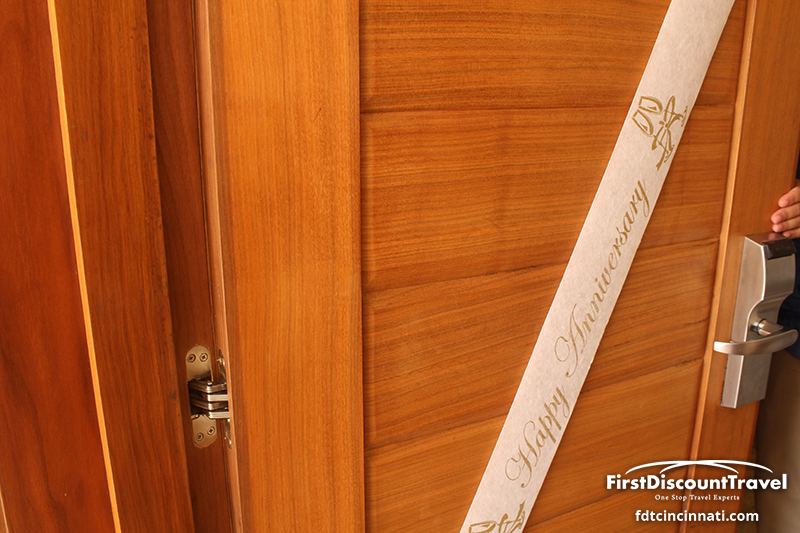 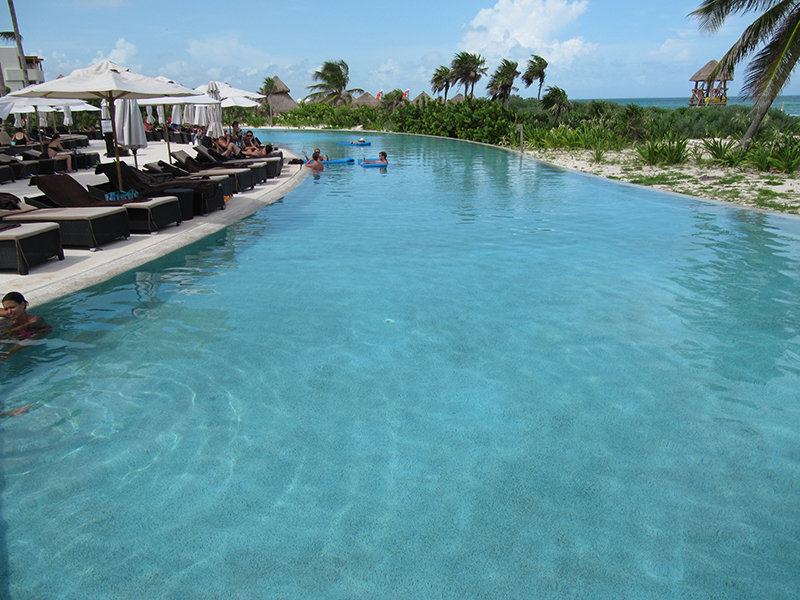 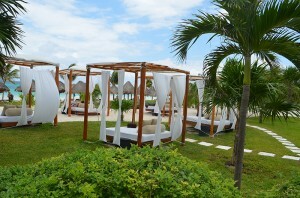 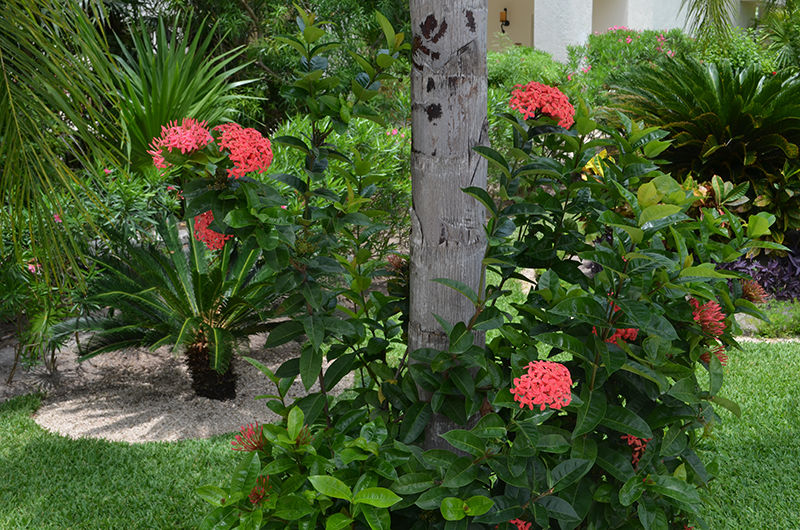 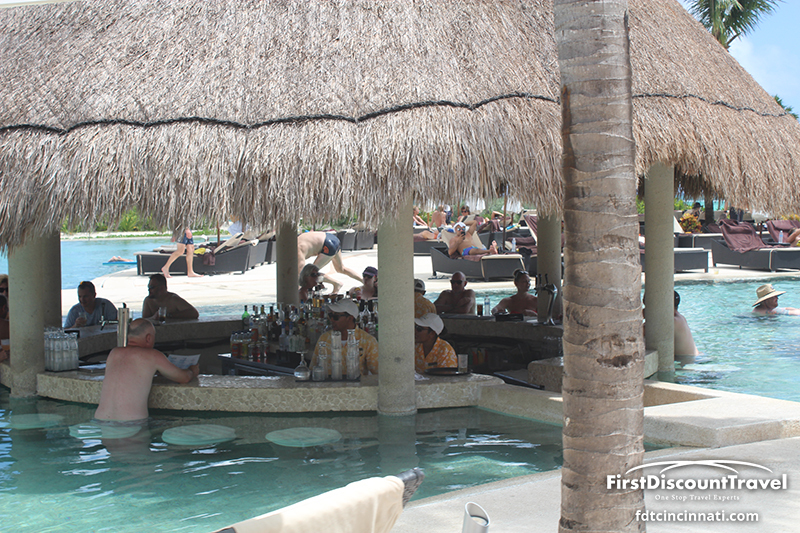 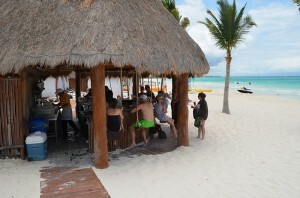 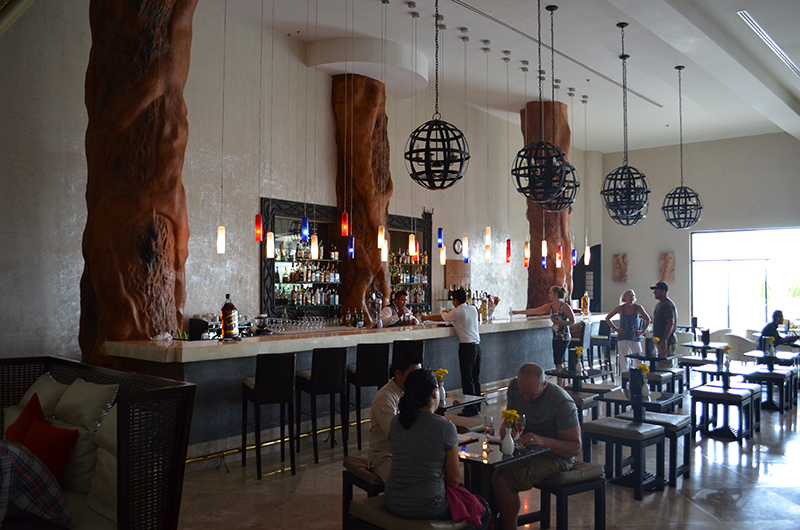 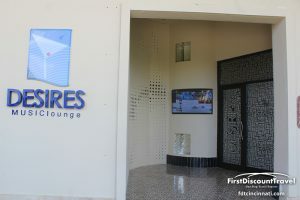 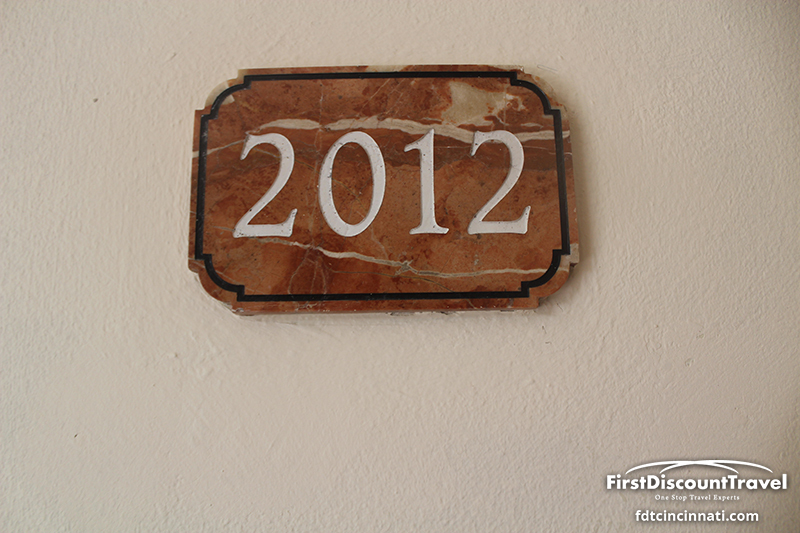 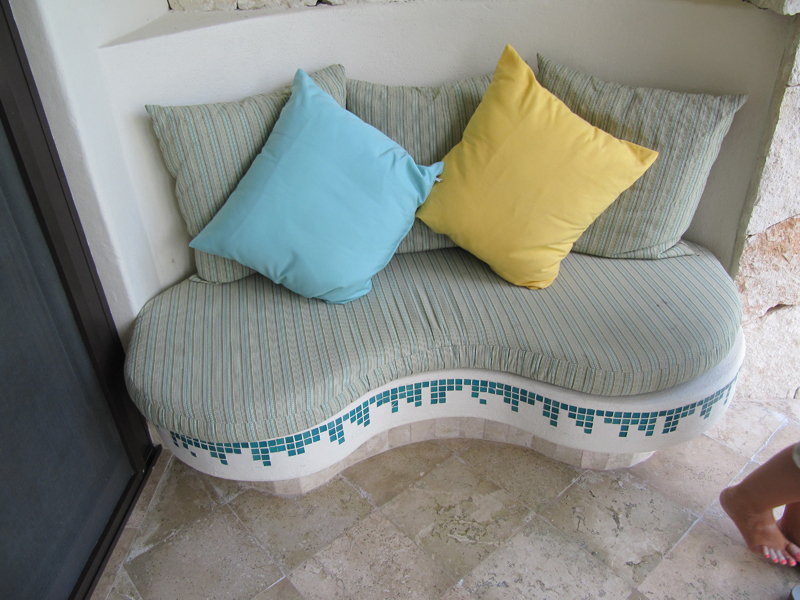 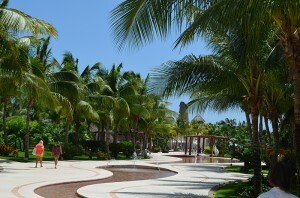 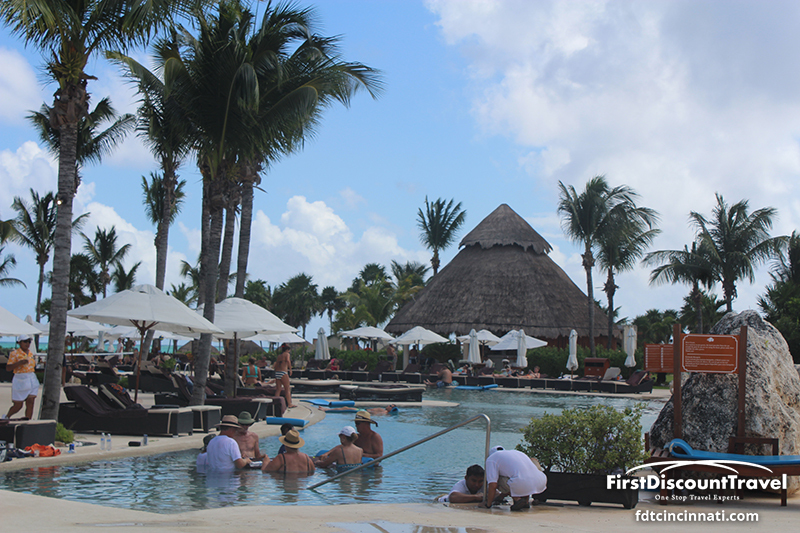 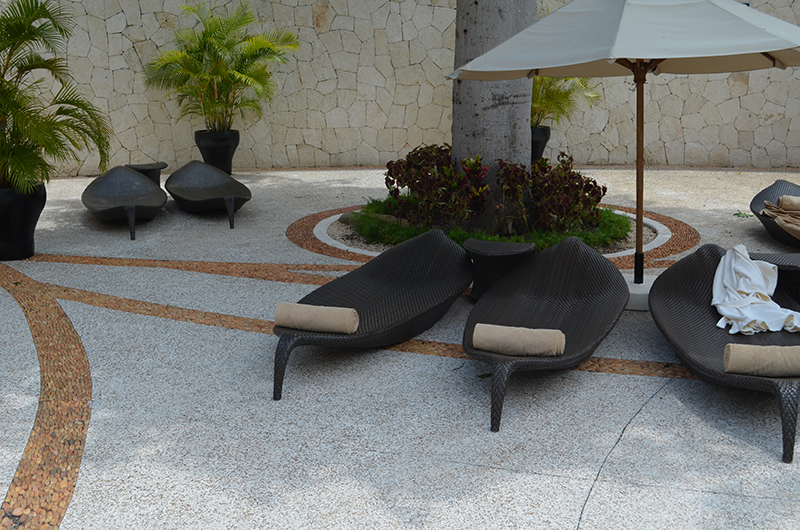 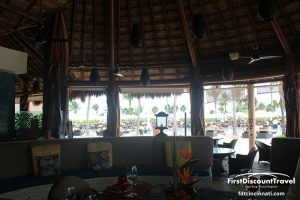 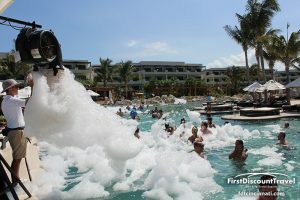 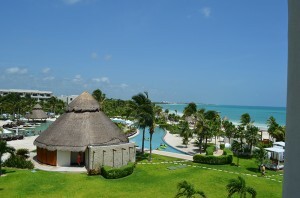 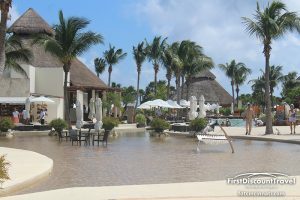 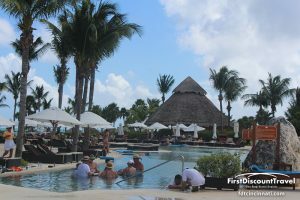 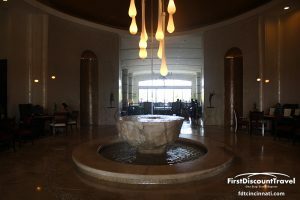 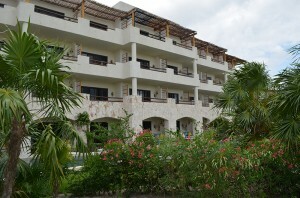 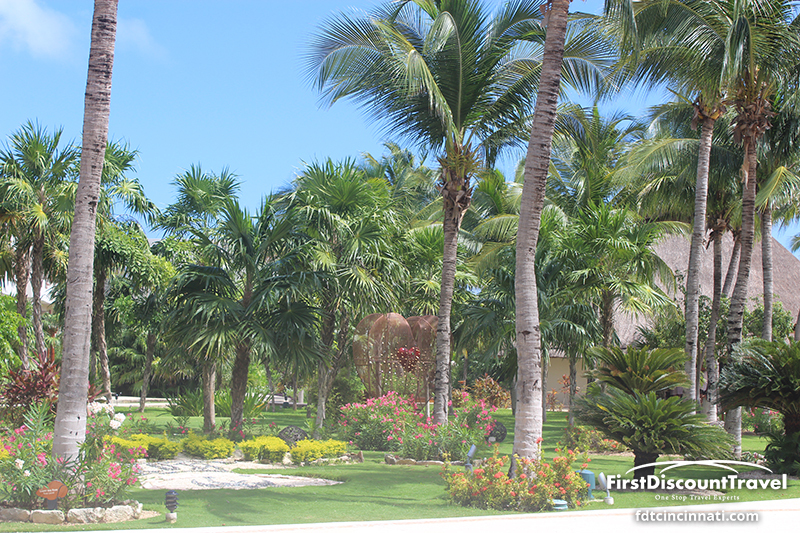 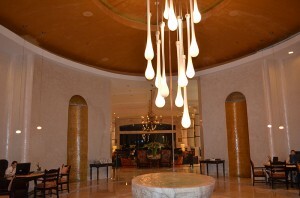 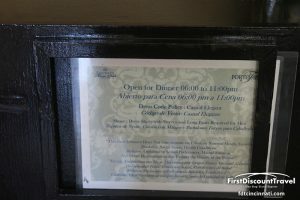 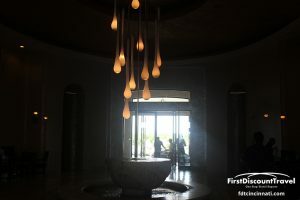 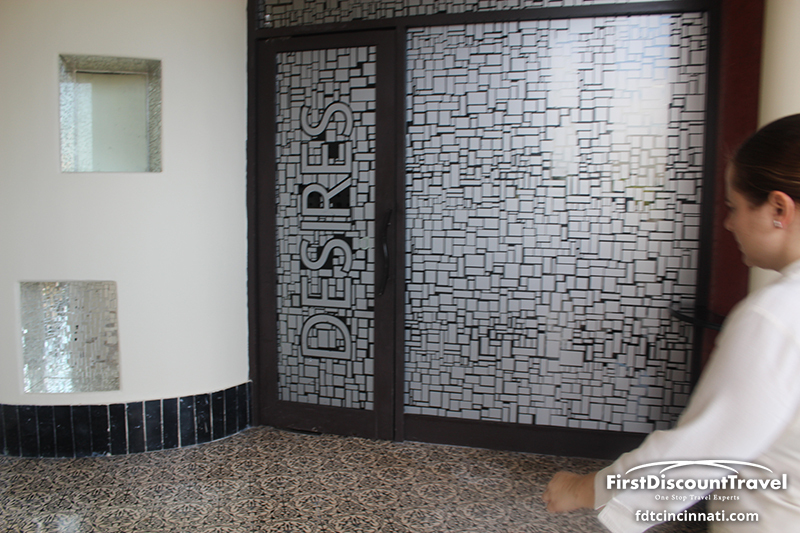 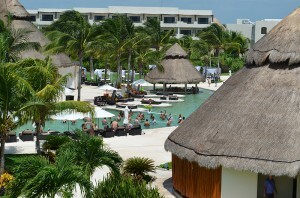 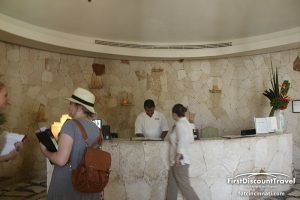 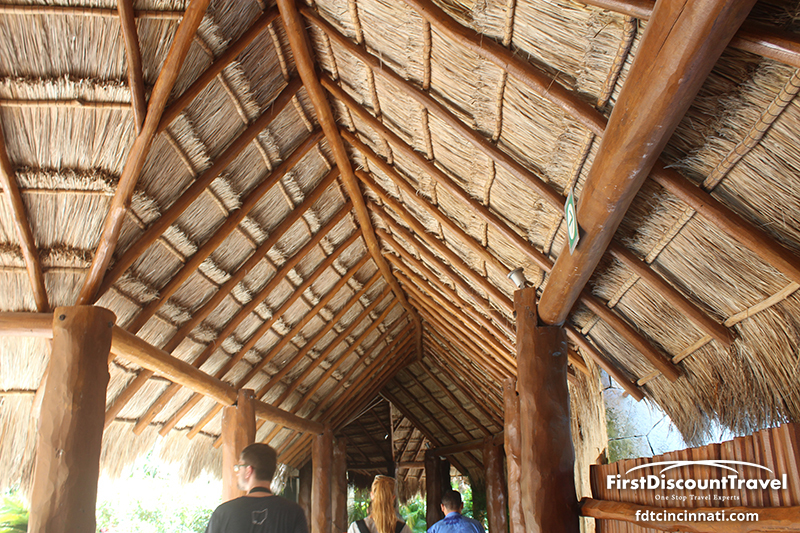 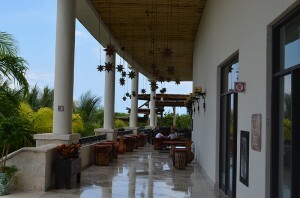 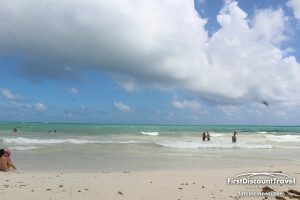 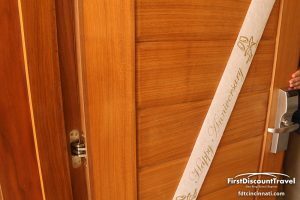 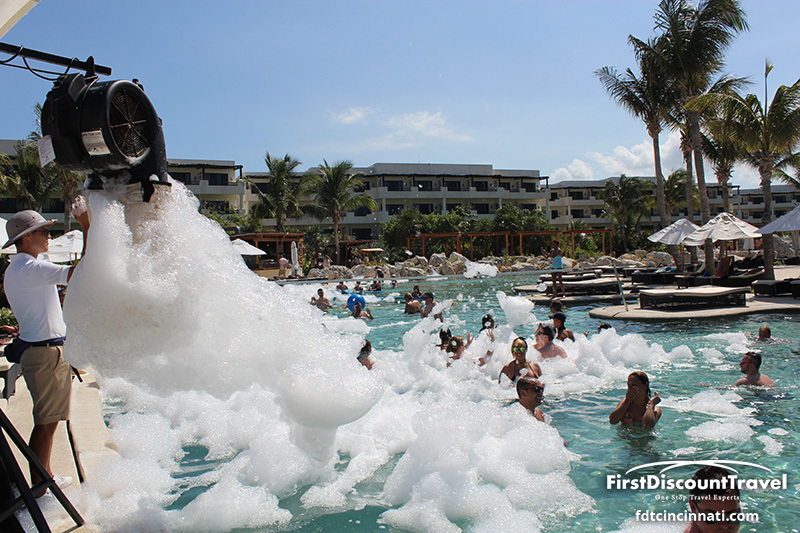 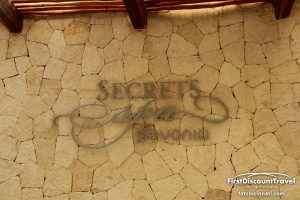 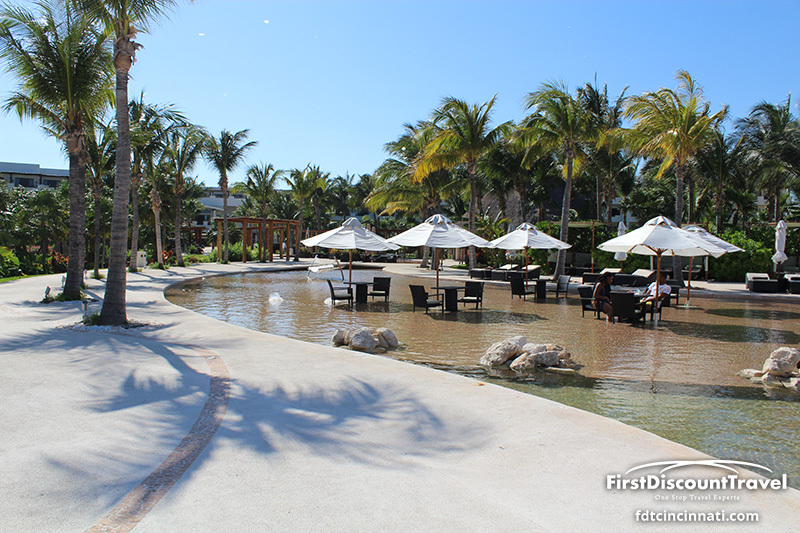 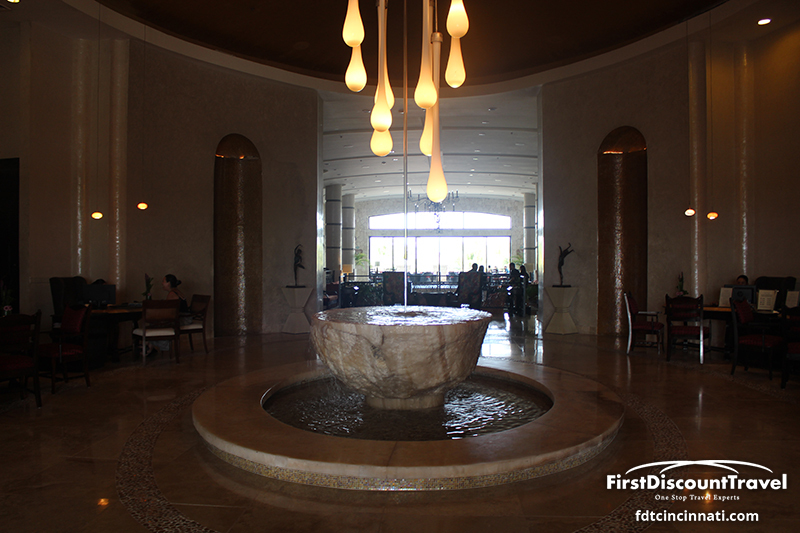 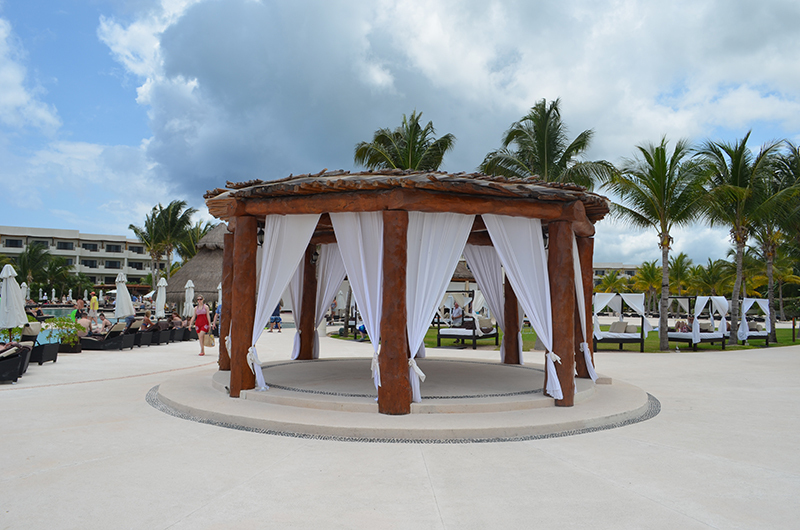 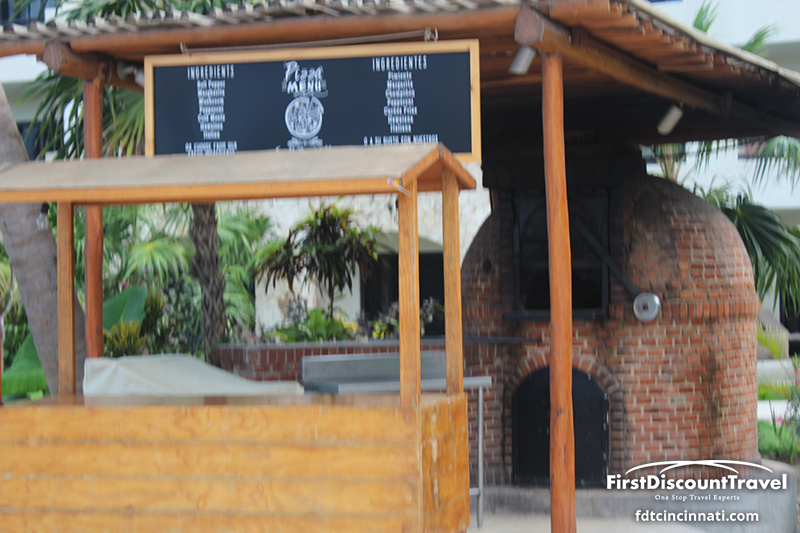 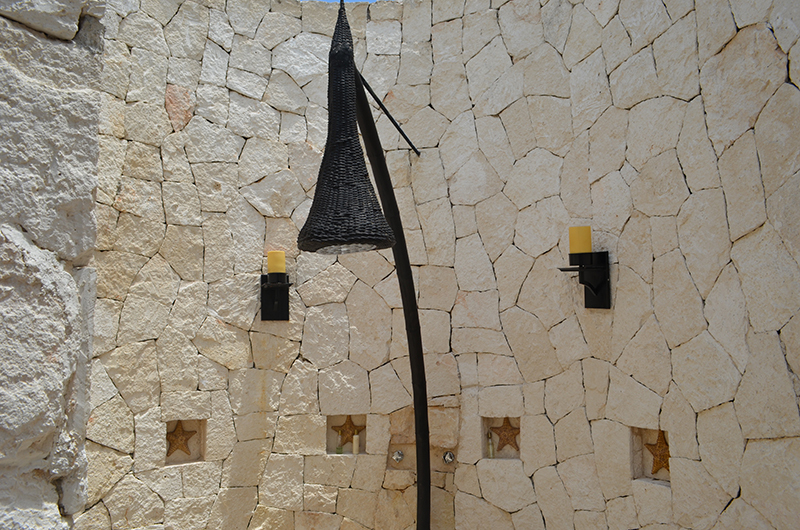 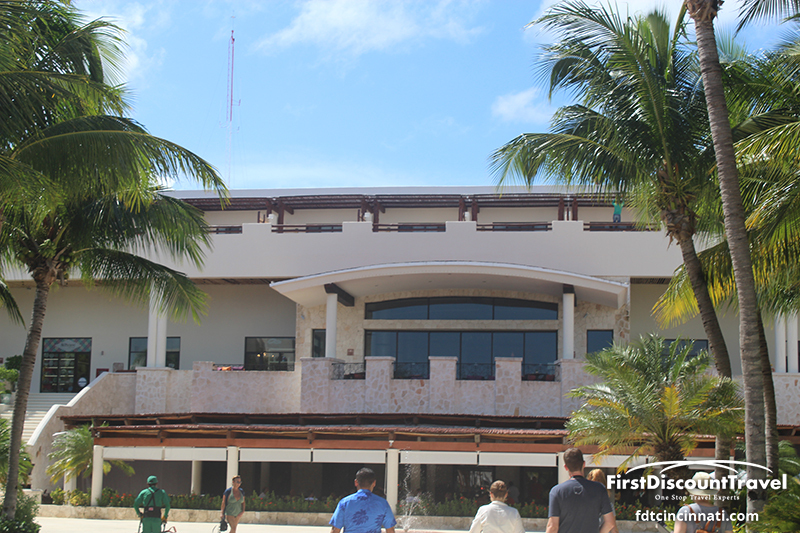 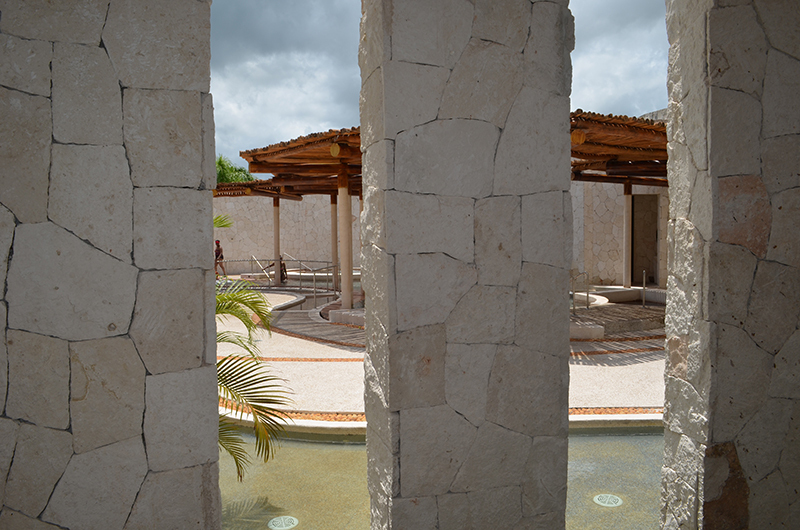 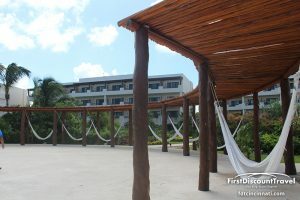 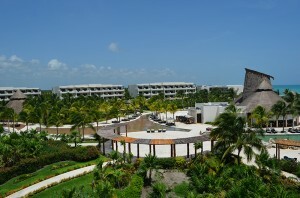 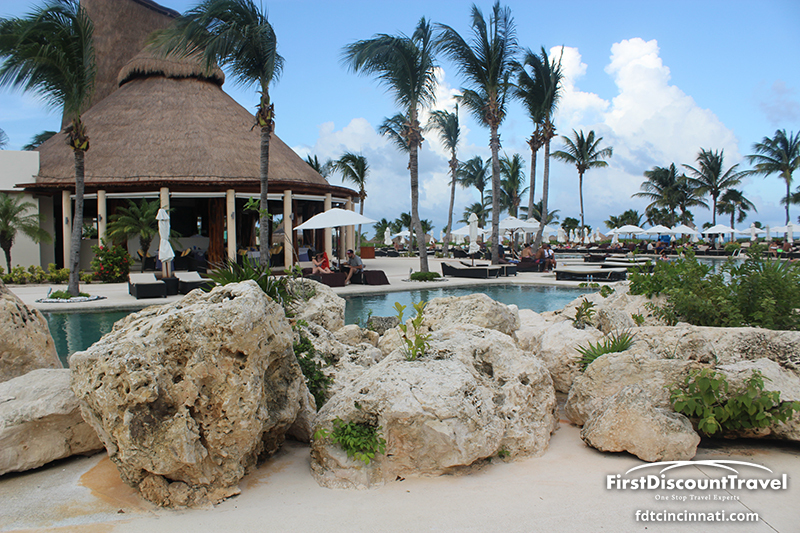 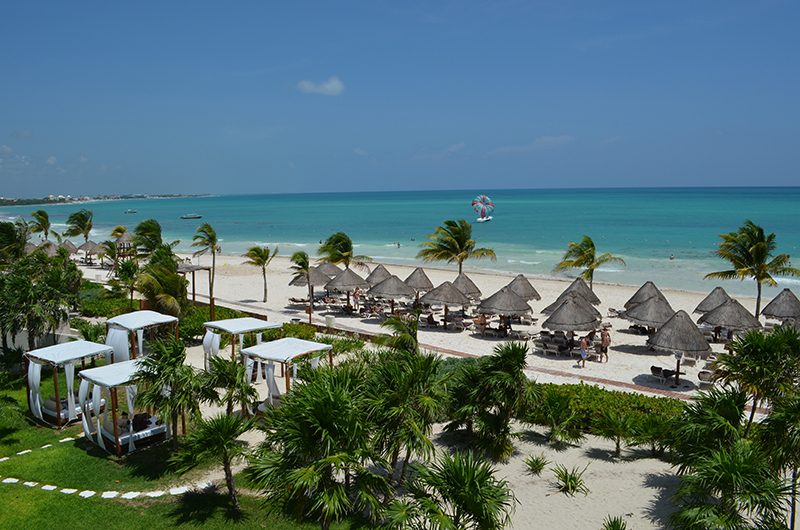 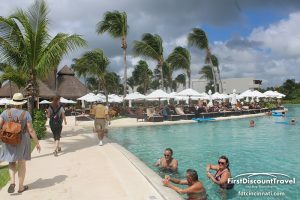 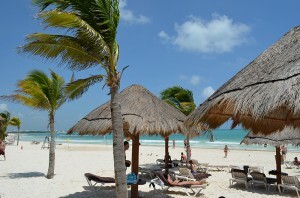 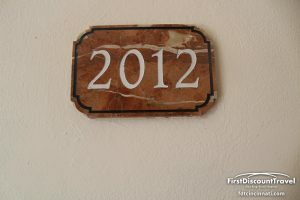 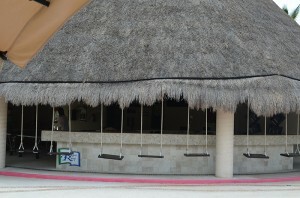 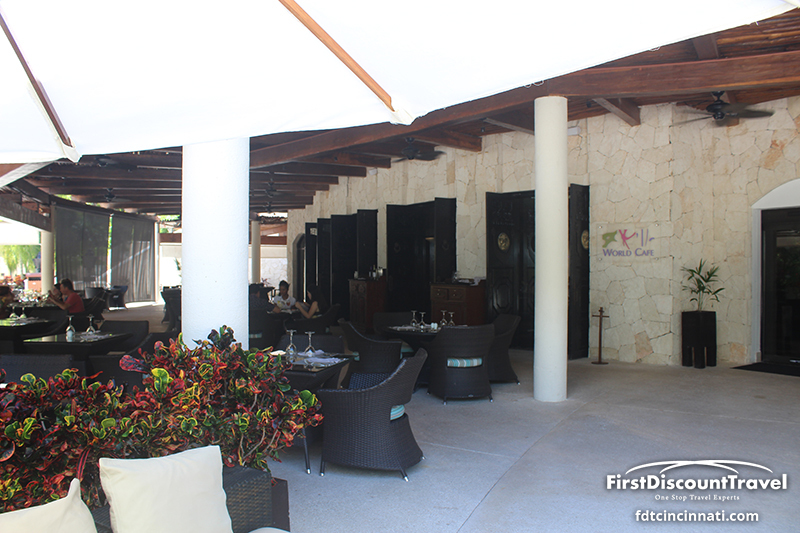 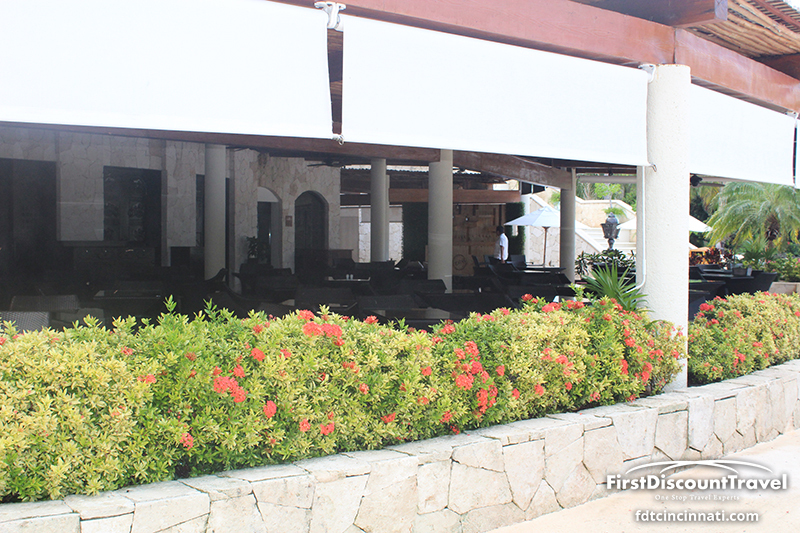 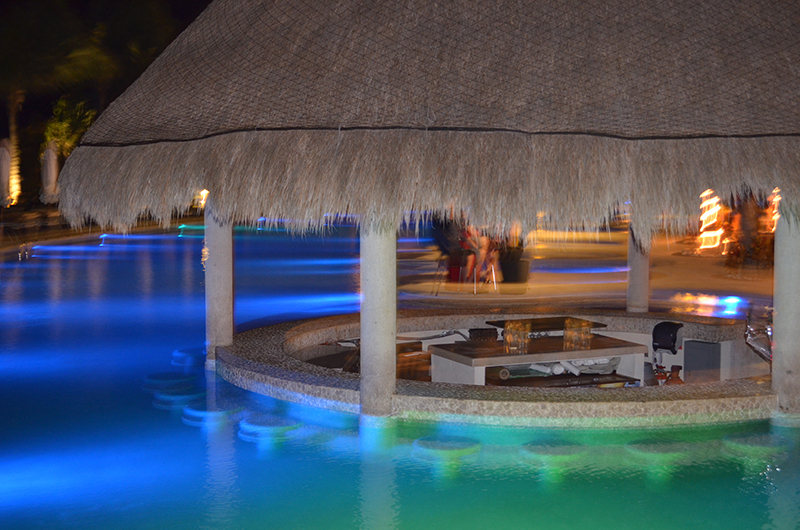 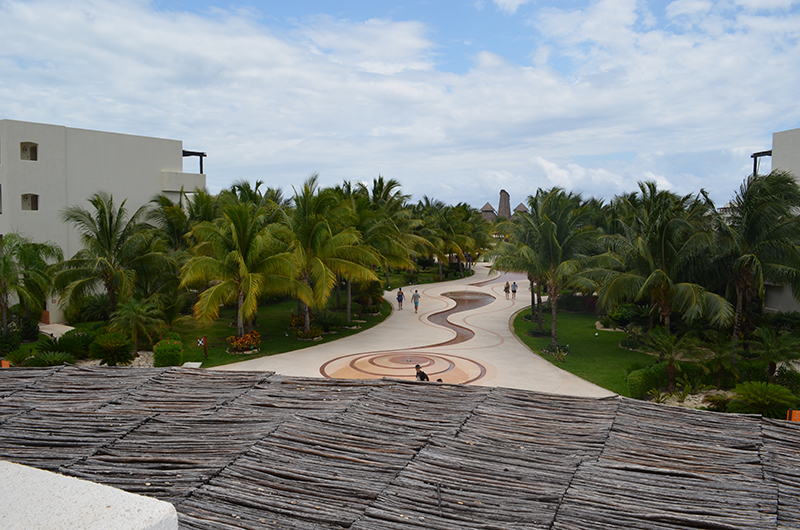 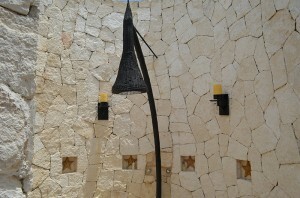 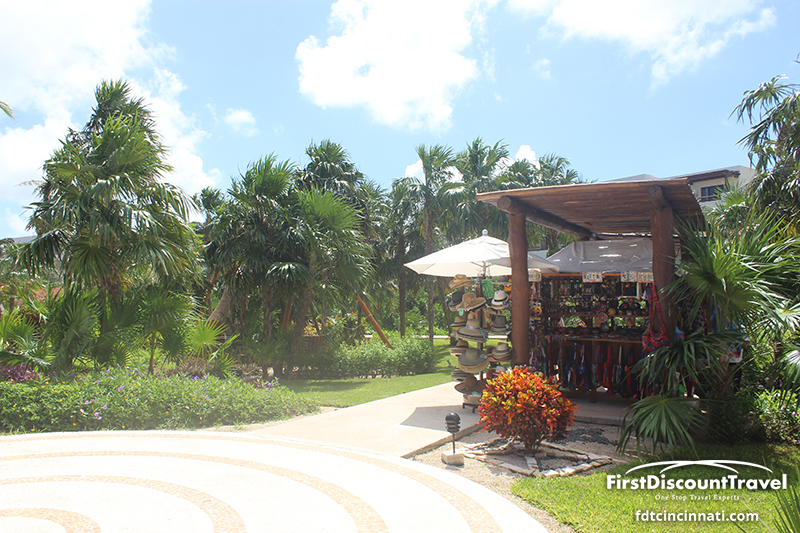 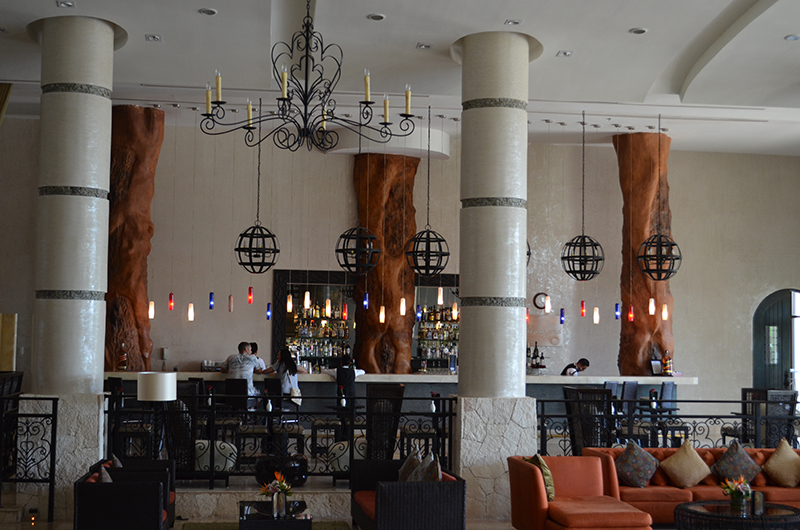 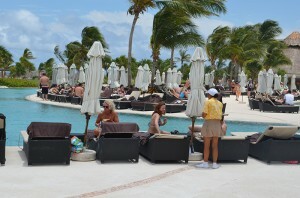 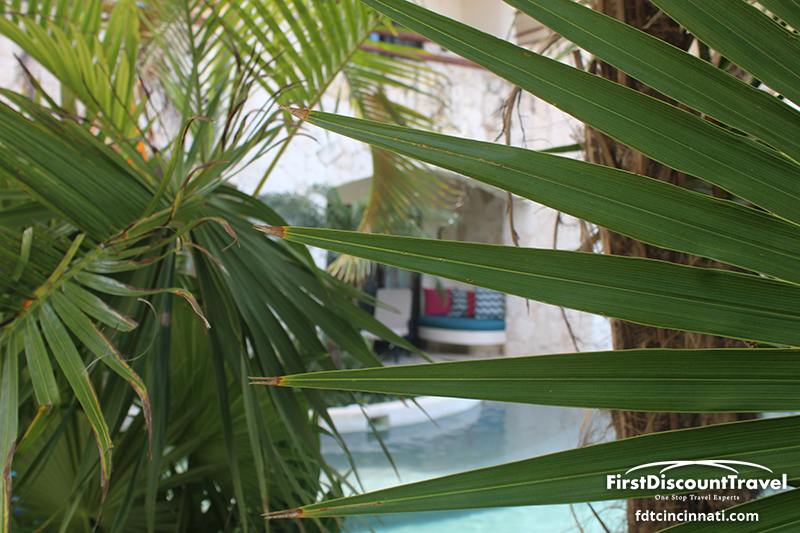 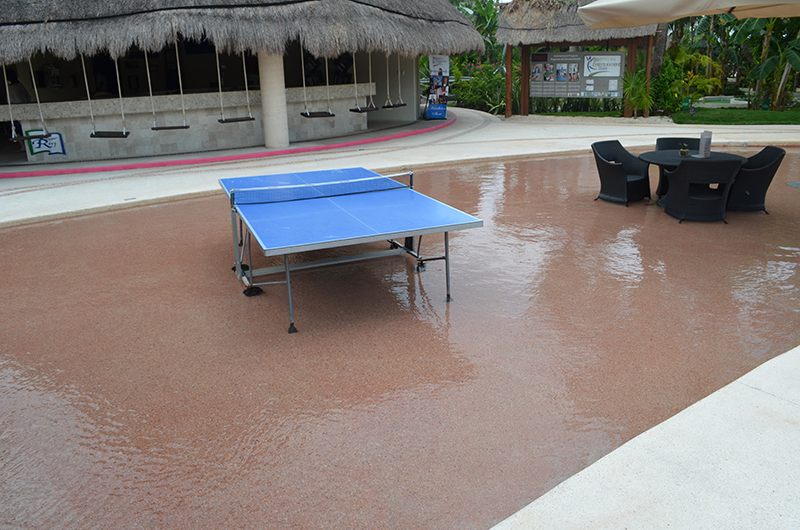 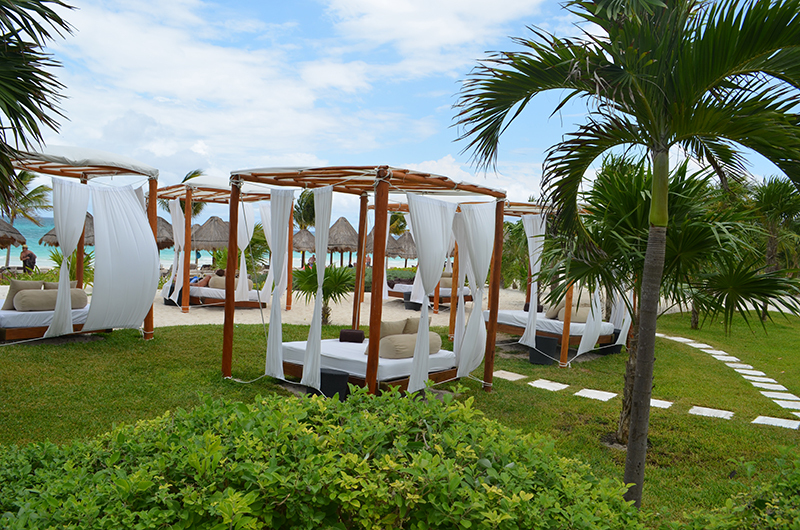 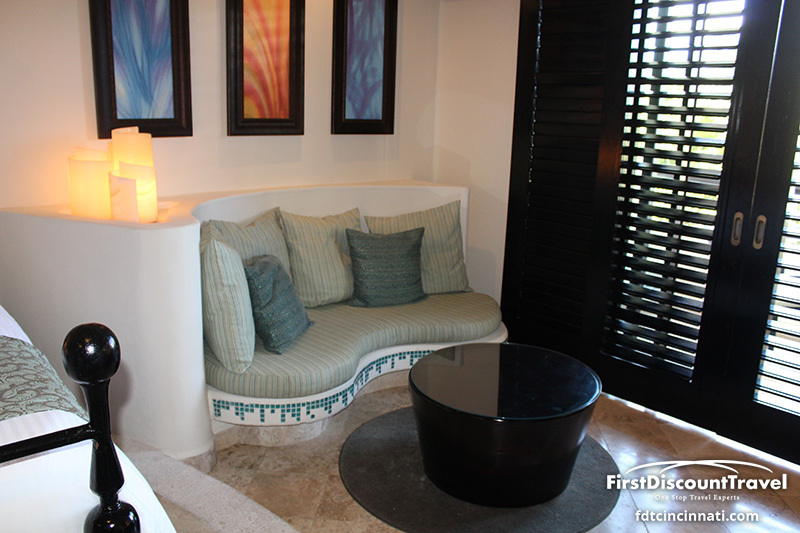 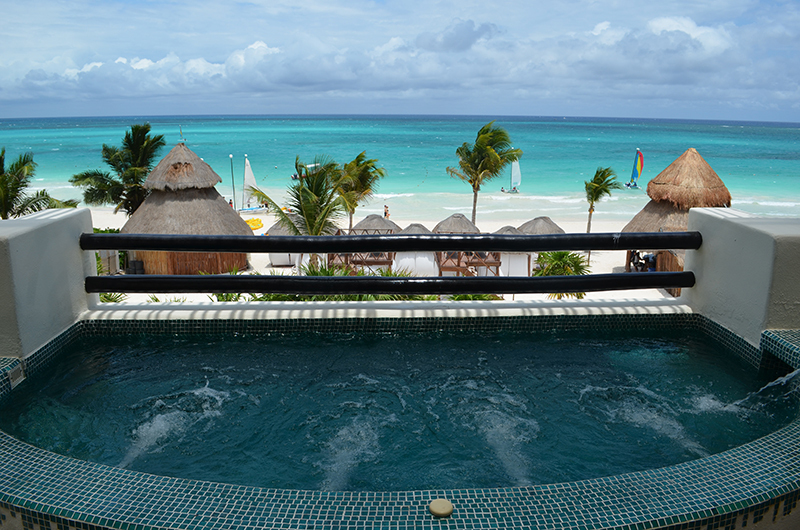 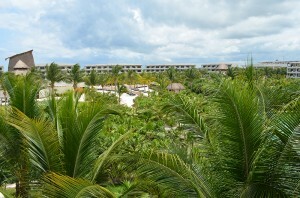 Secrets Maroma is adults only, opened in August of 2008, and is one of my favorite resorts! 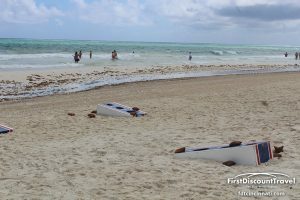 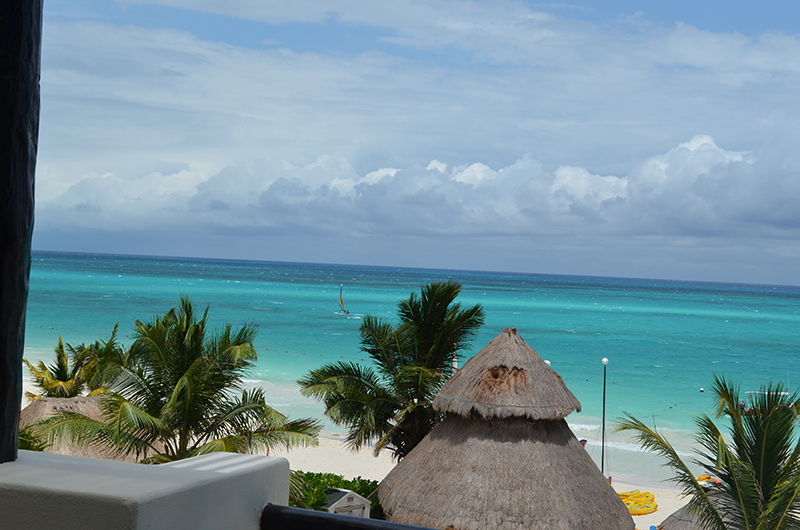 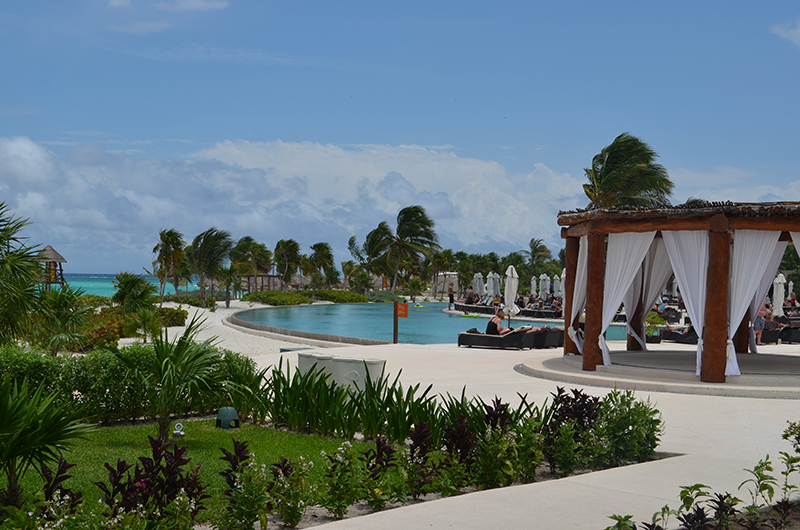 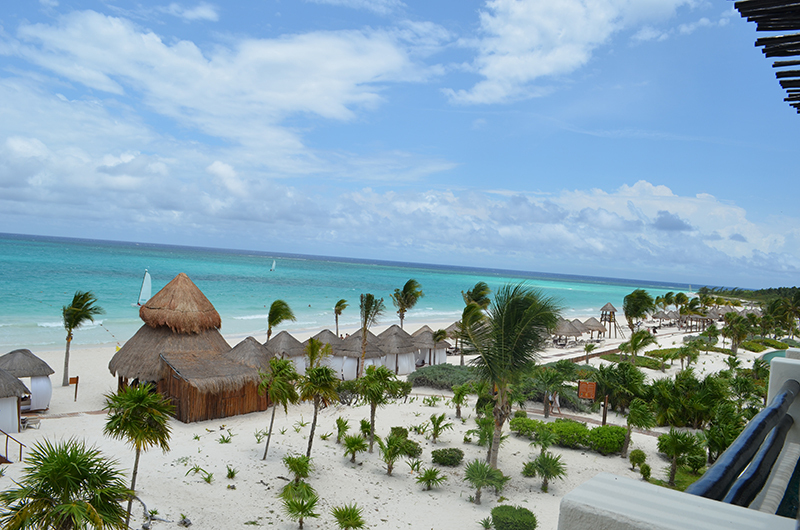 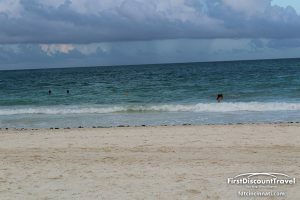 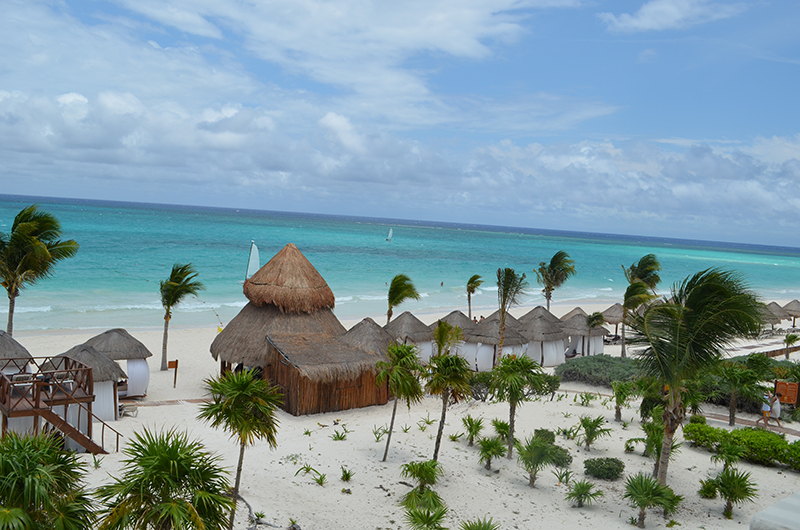 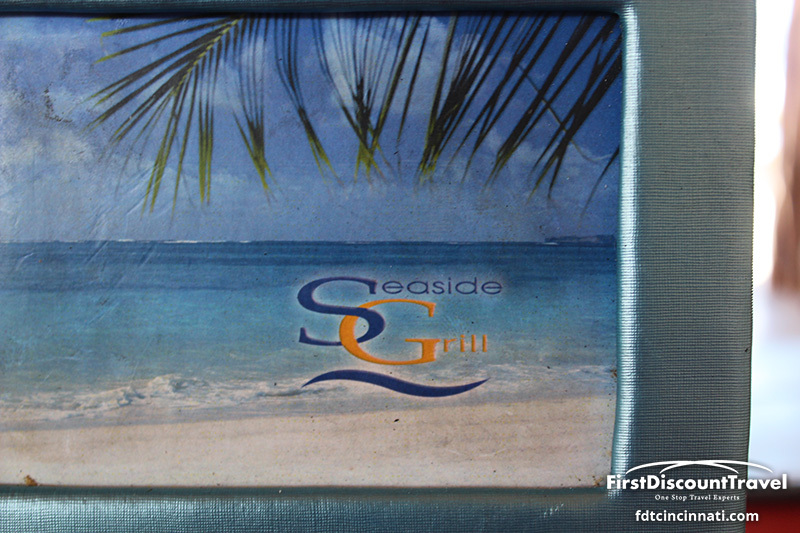 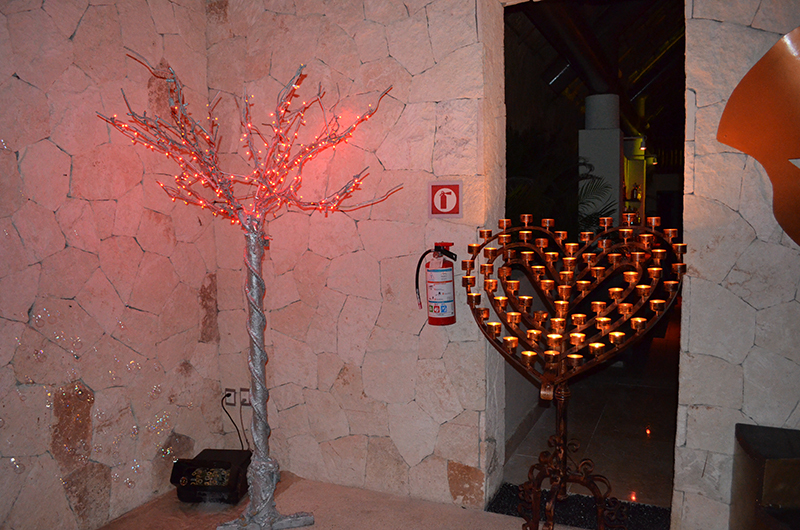 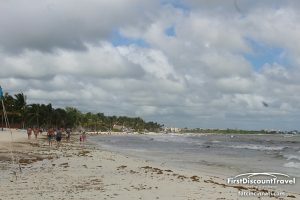 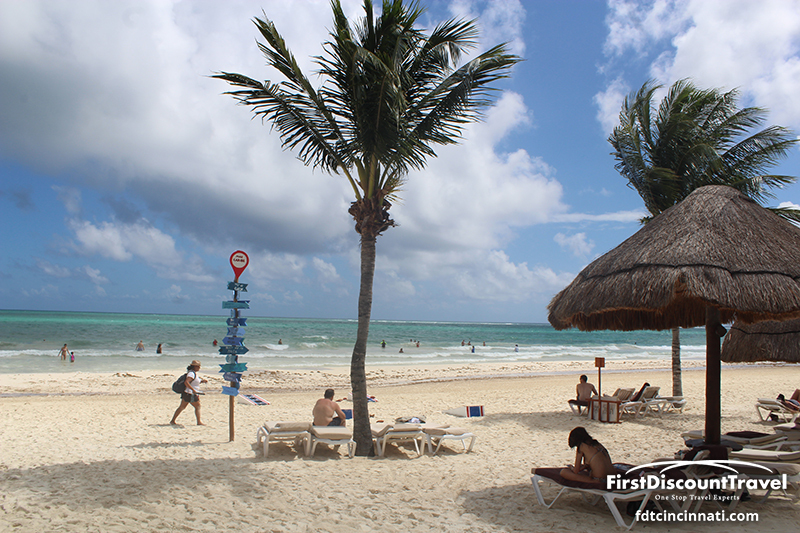 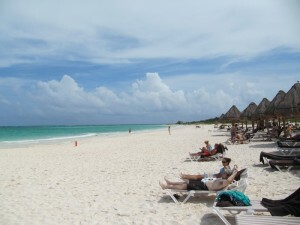 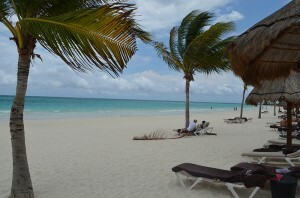 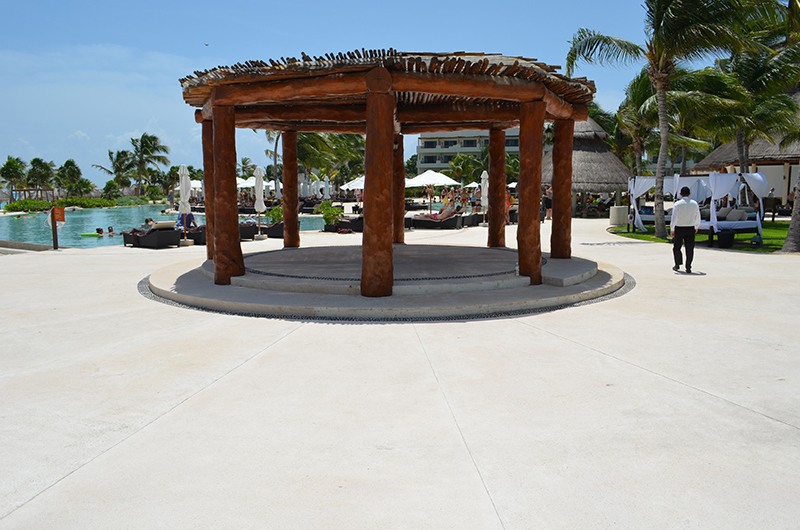 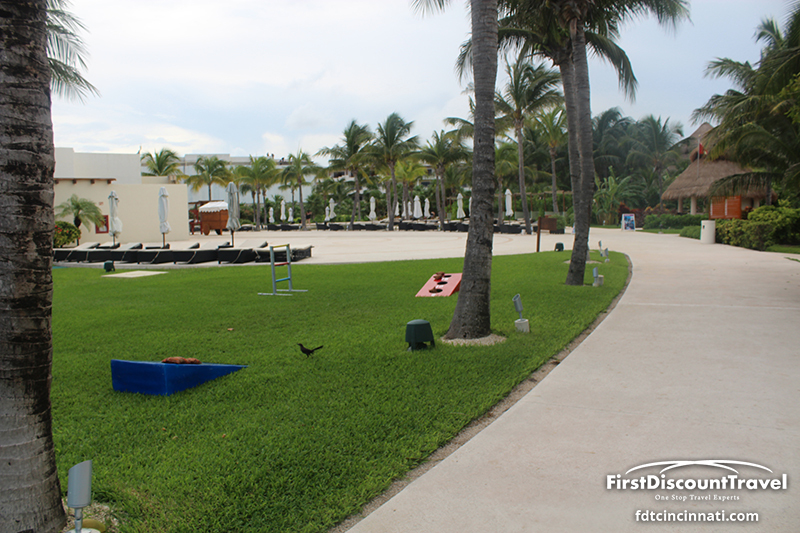 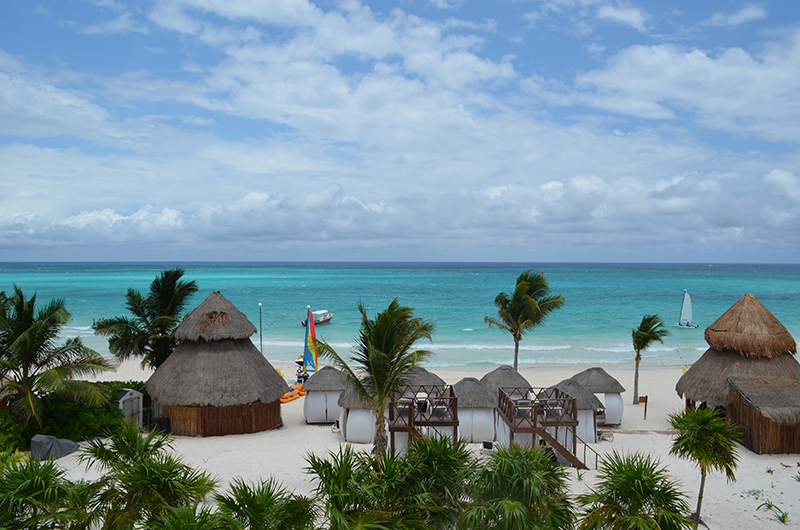 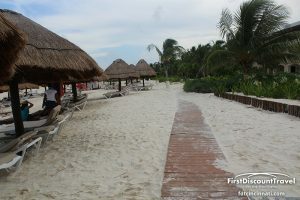 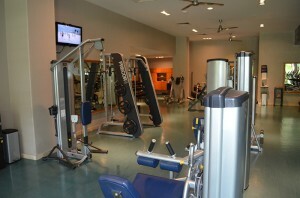 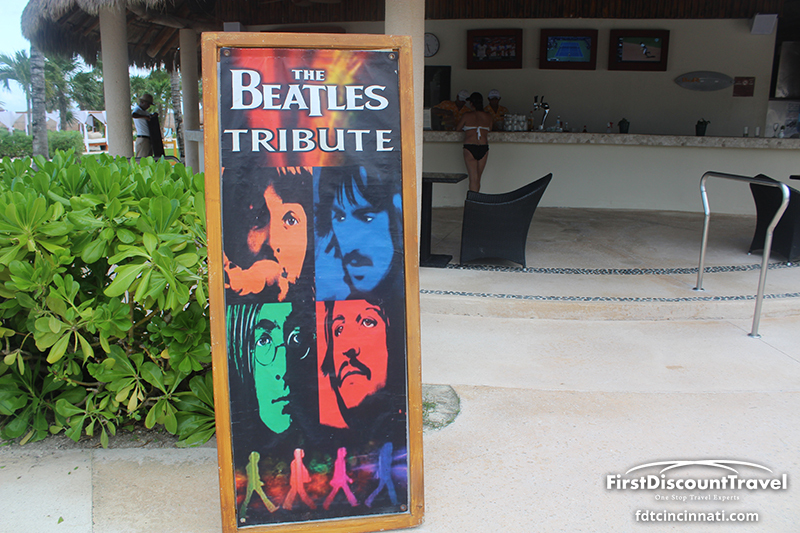 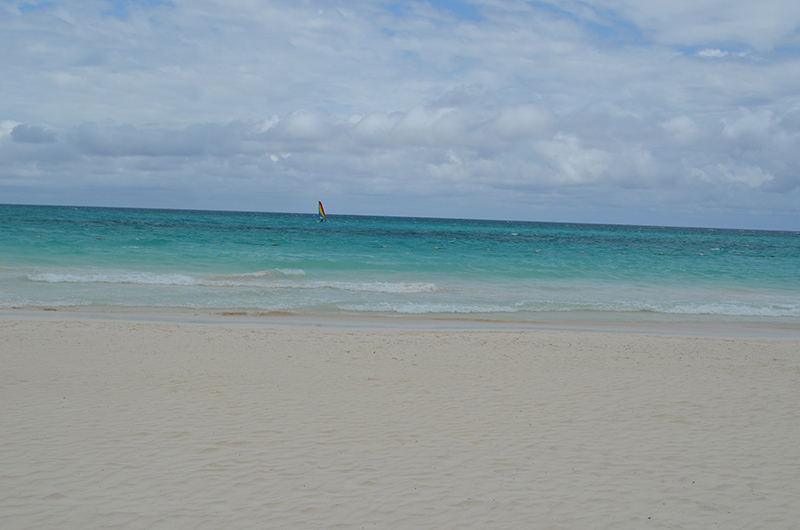 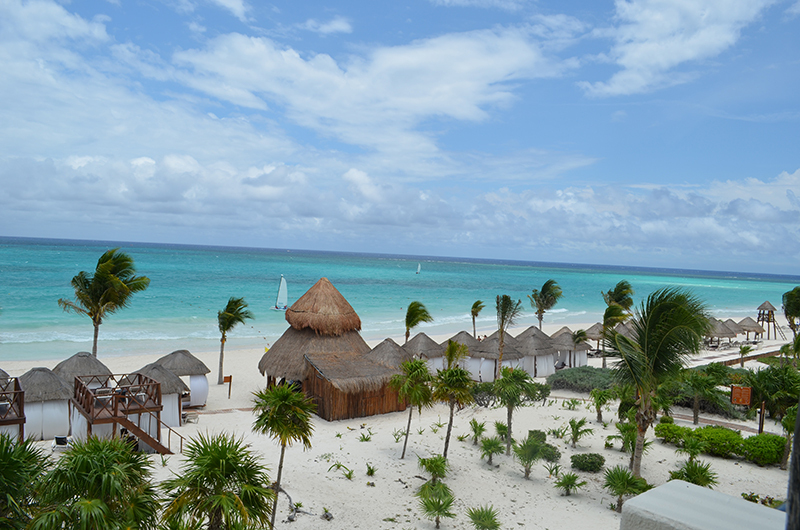 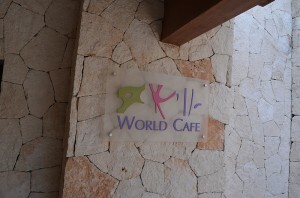 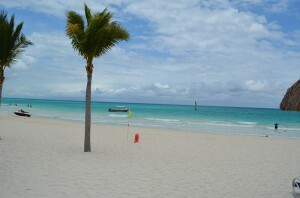 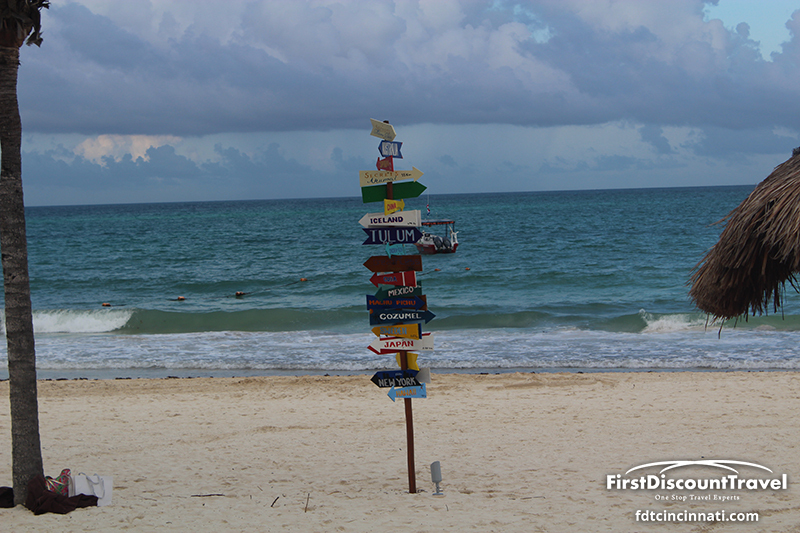 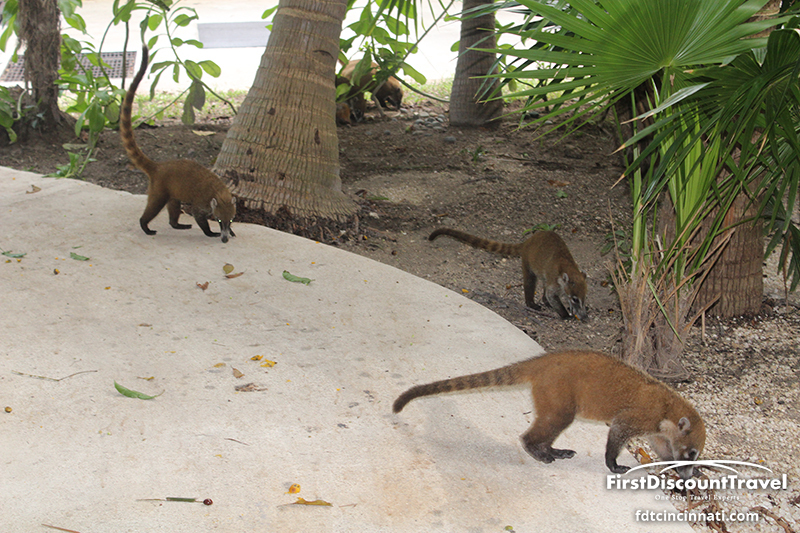 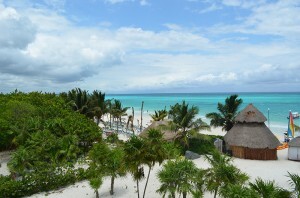 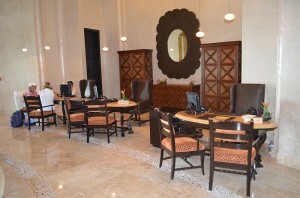 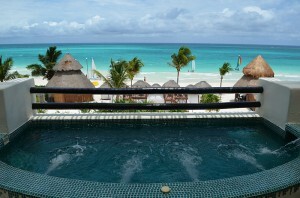 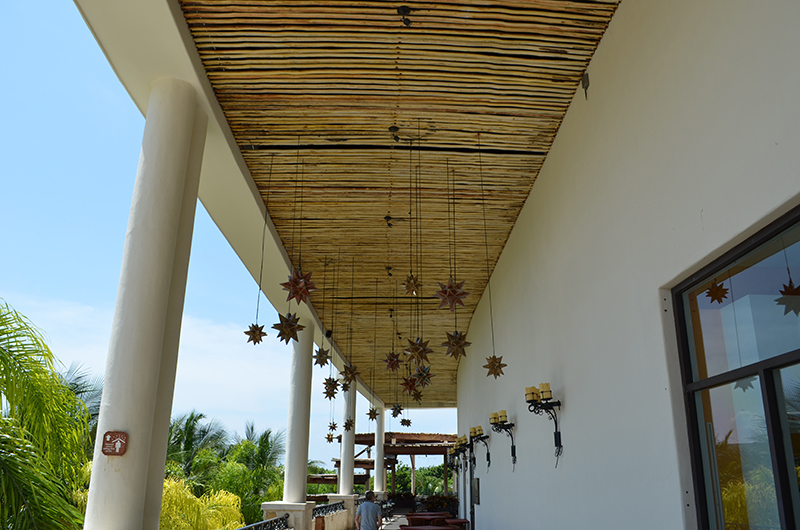 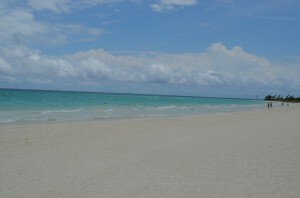 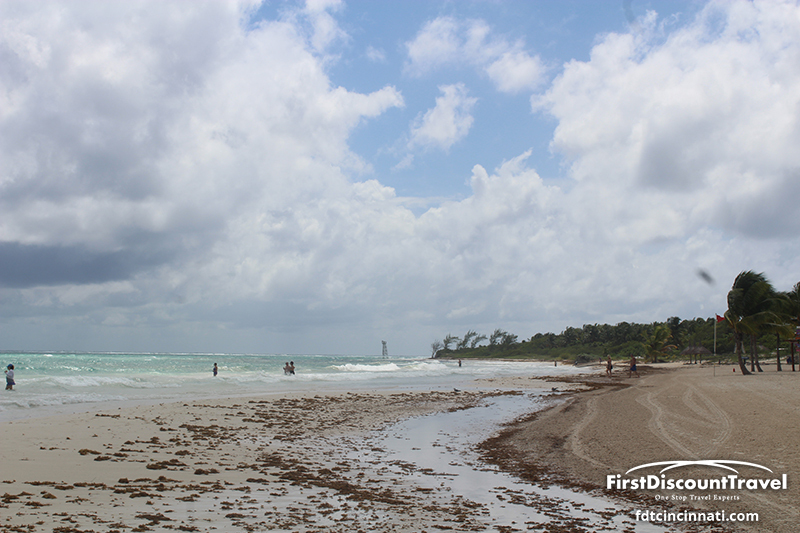 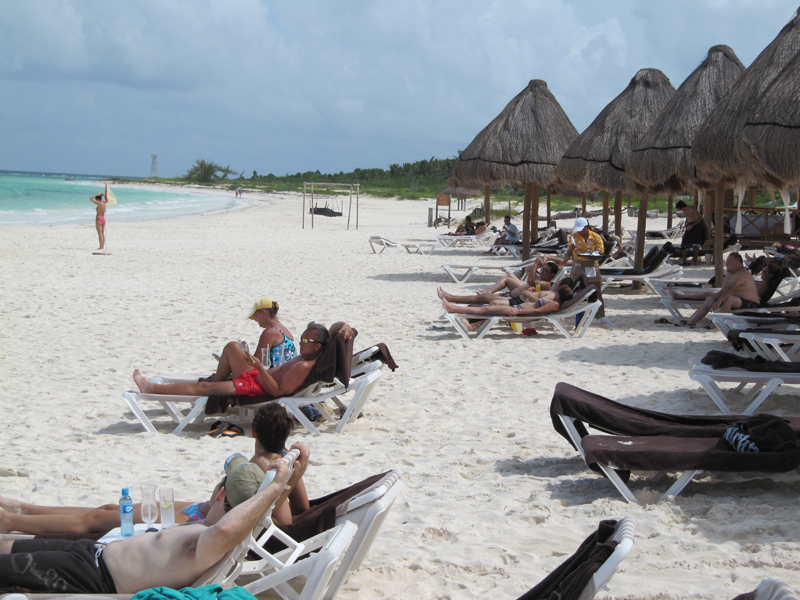 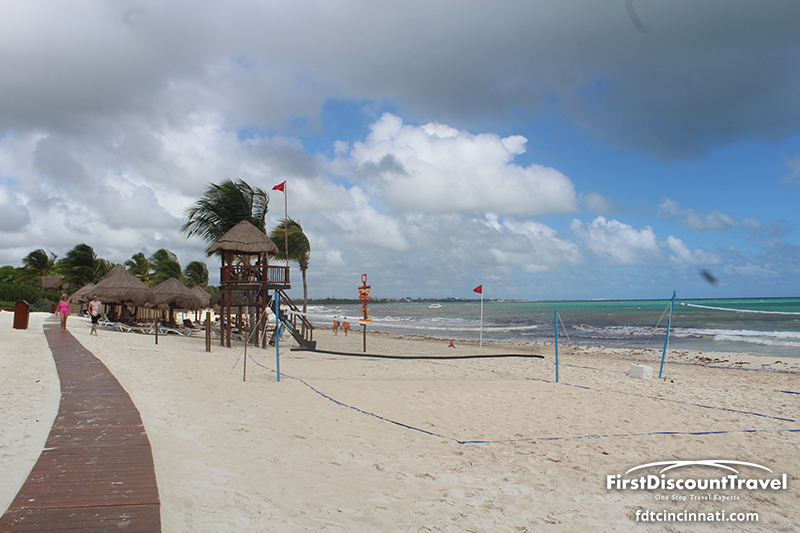 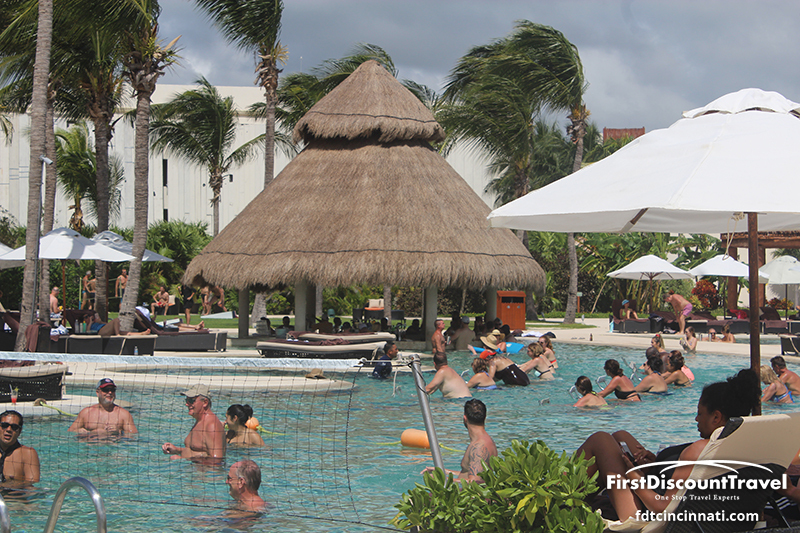 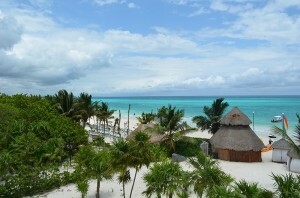 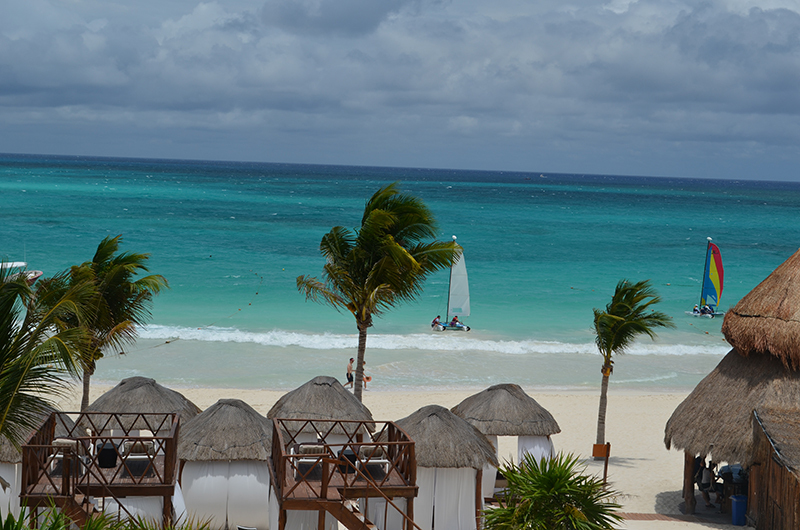 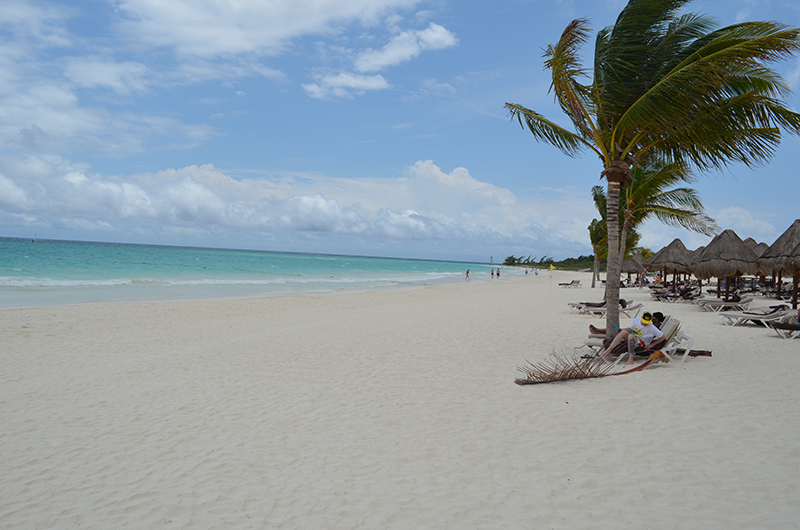 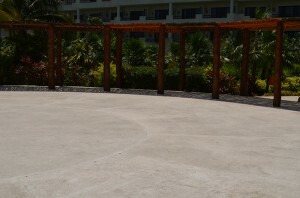 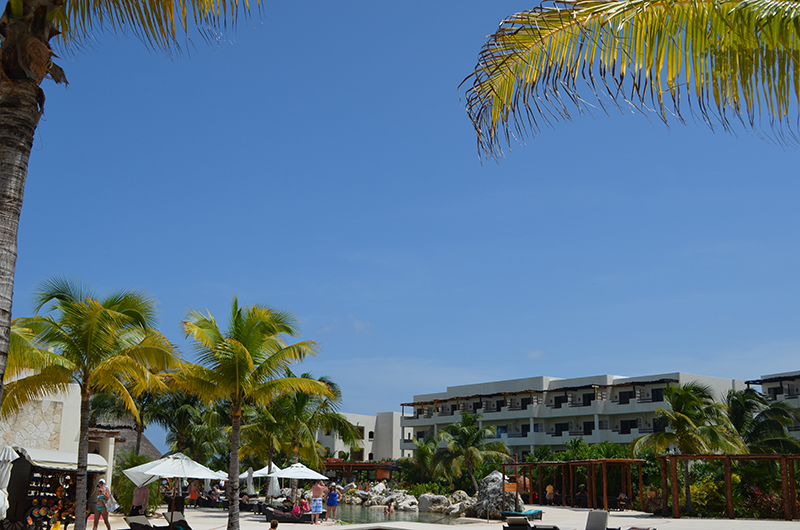 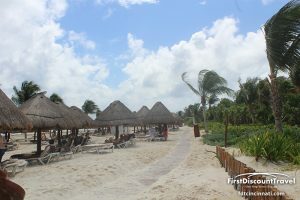 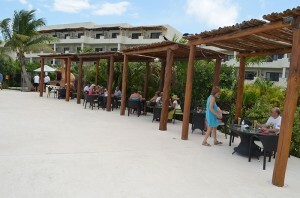 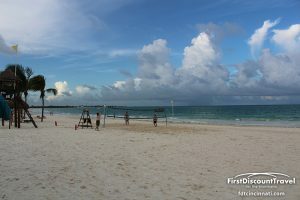 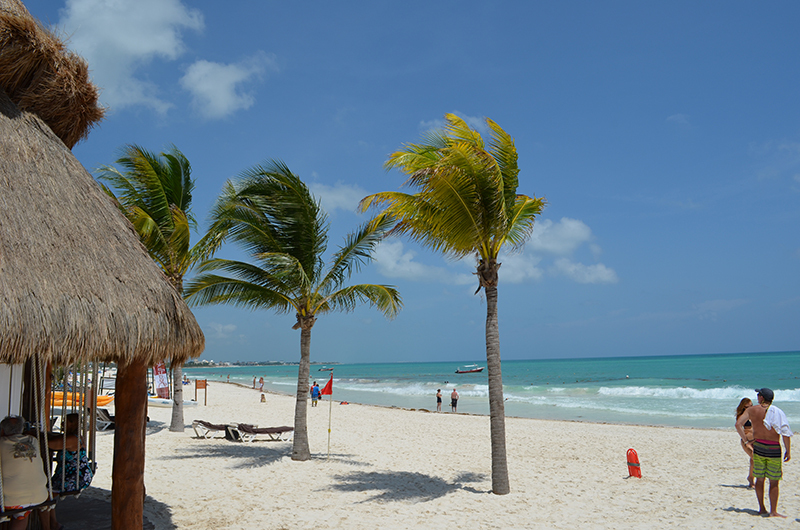 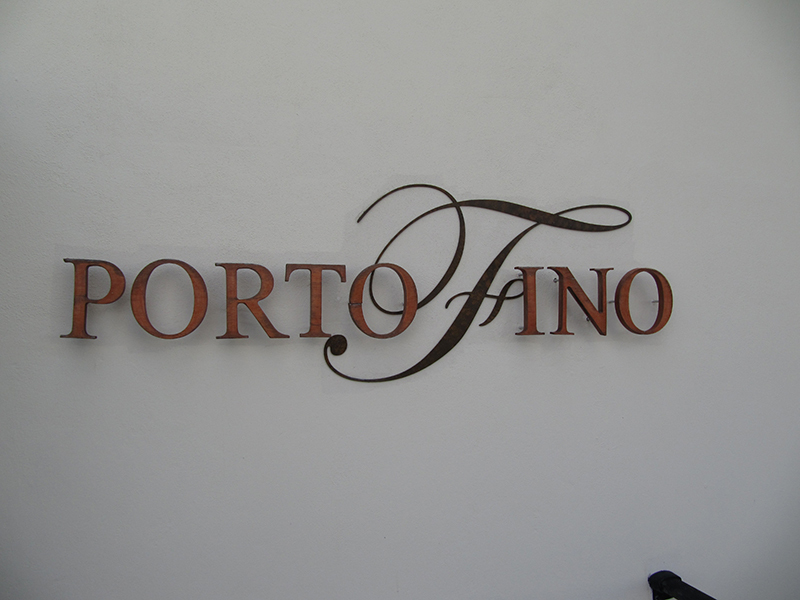 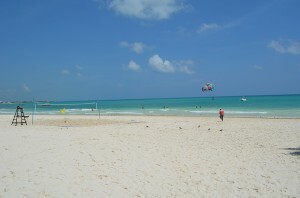 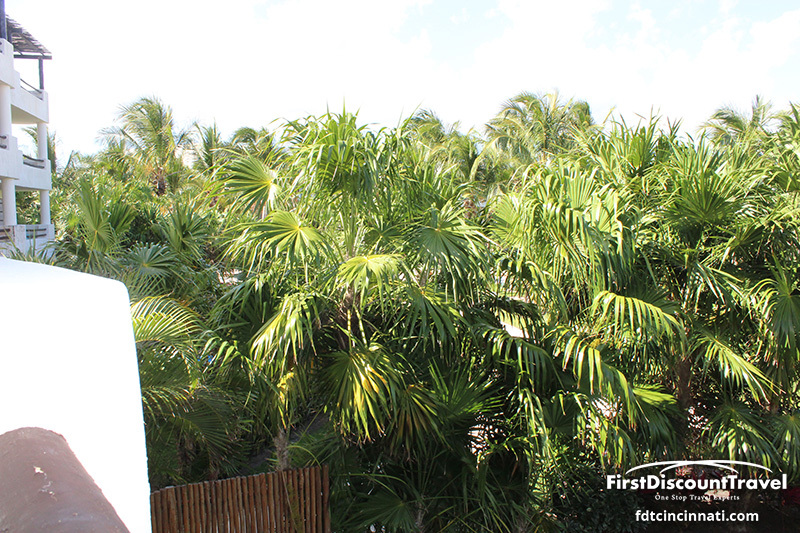 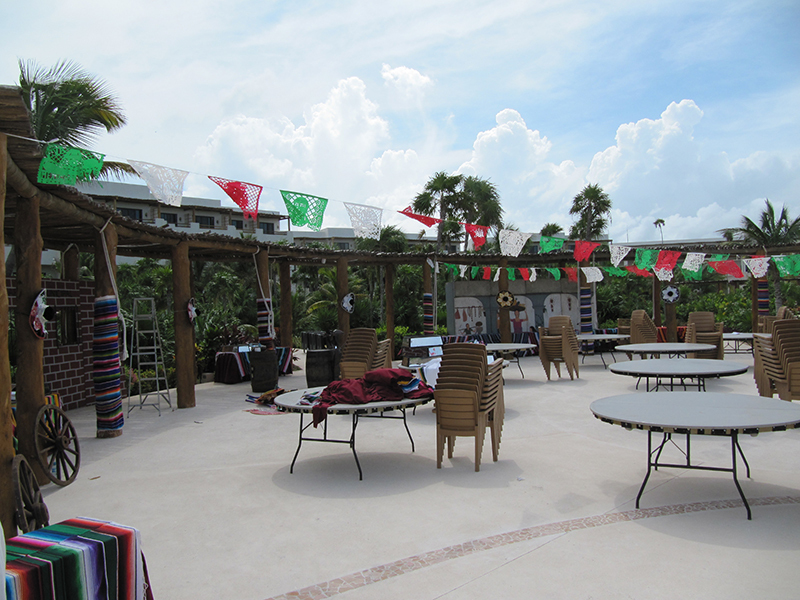 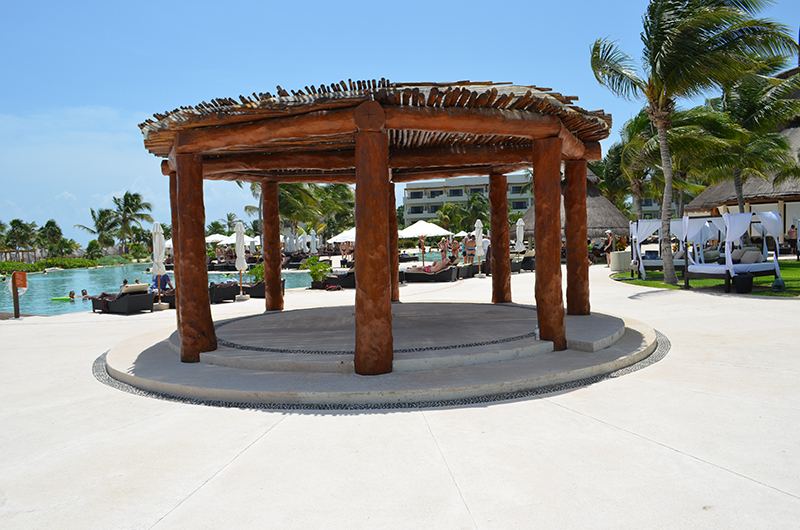 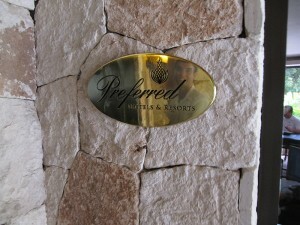 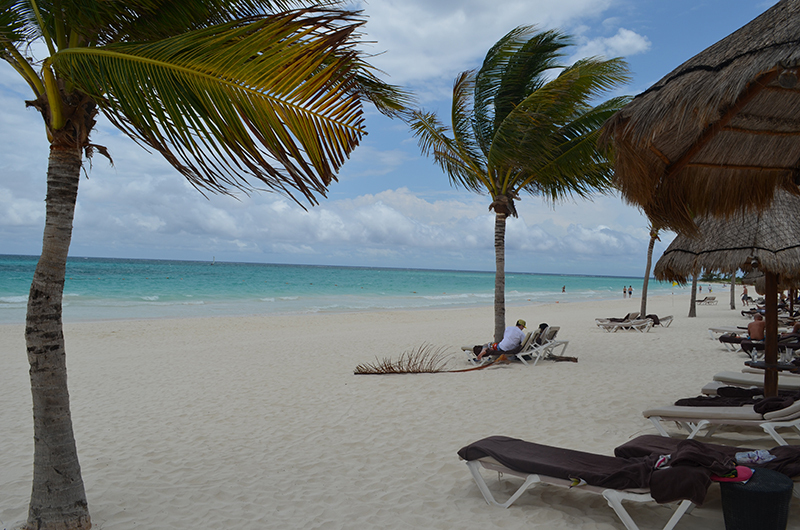 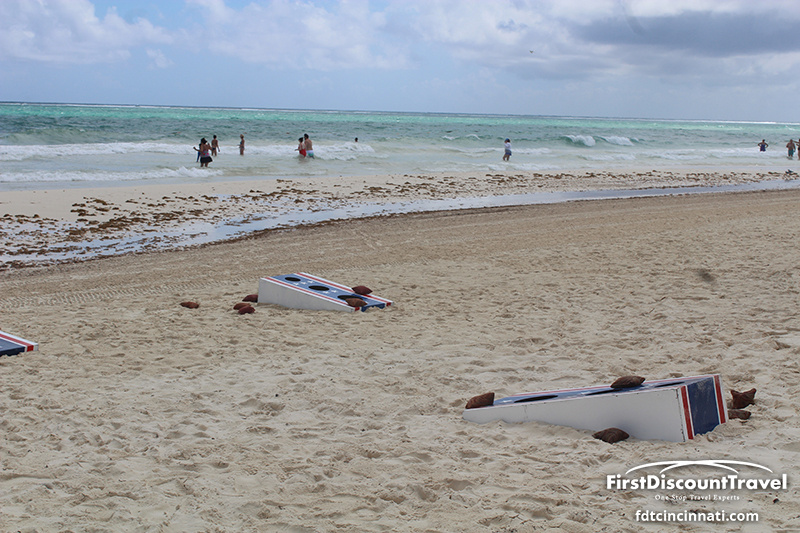 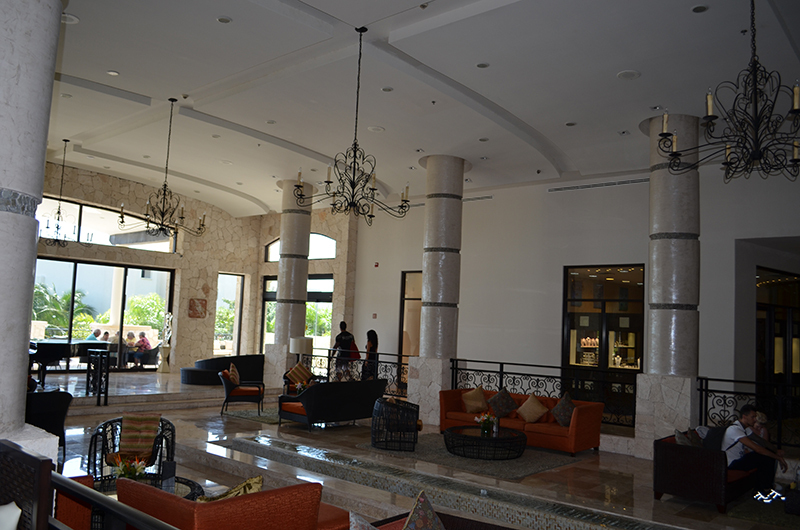 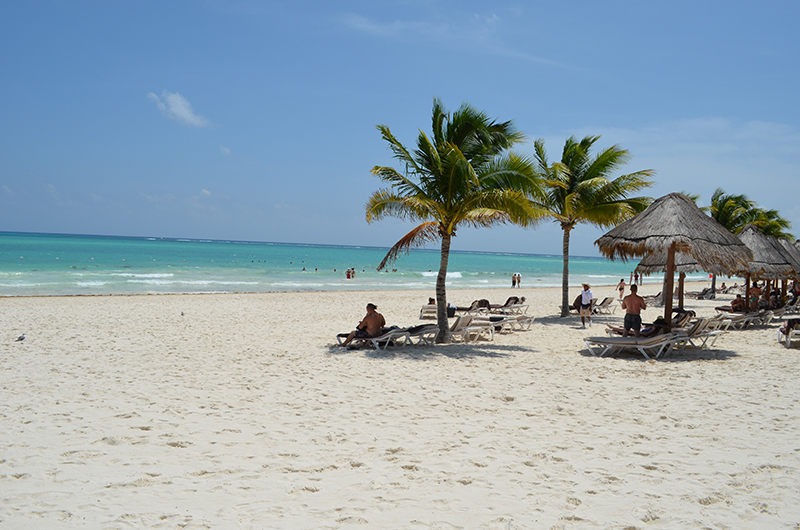 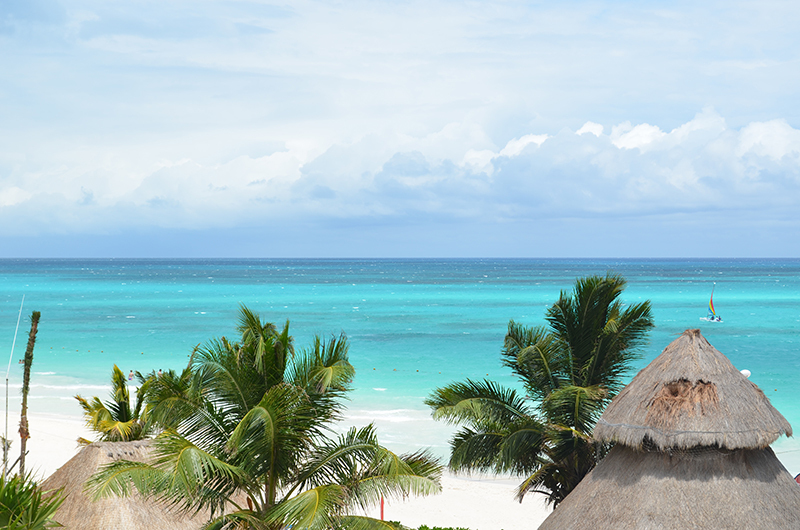 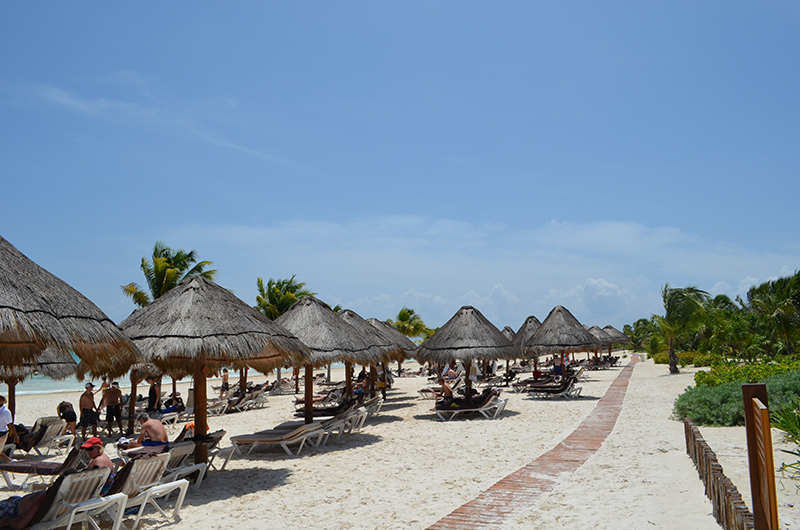 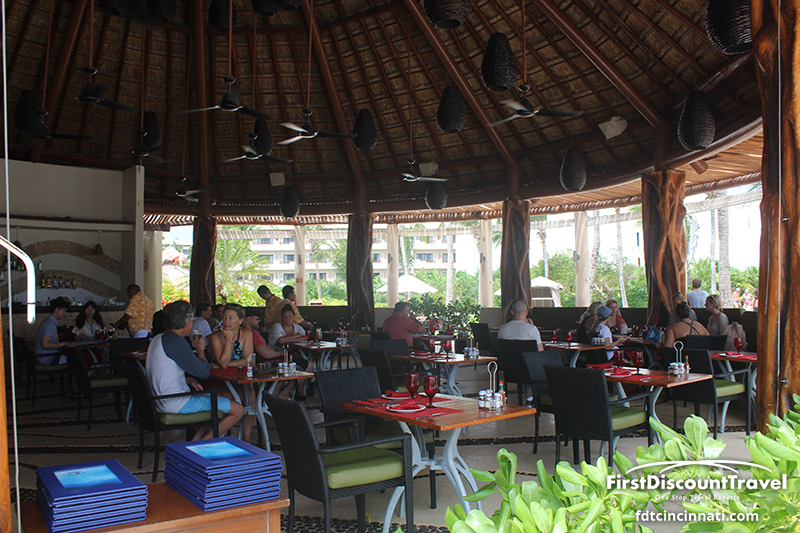 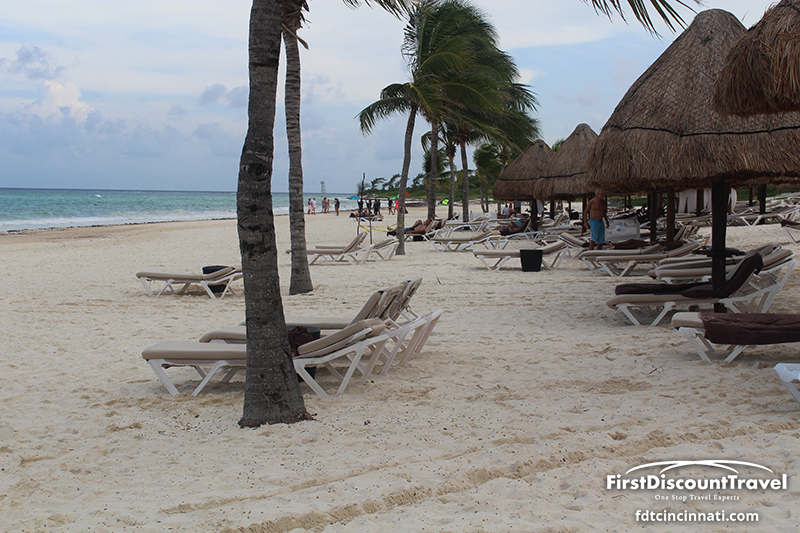 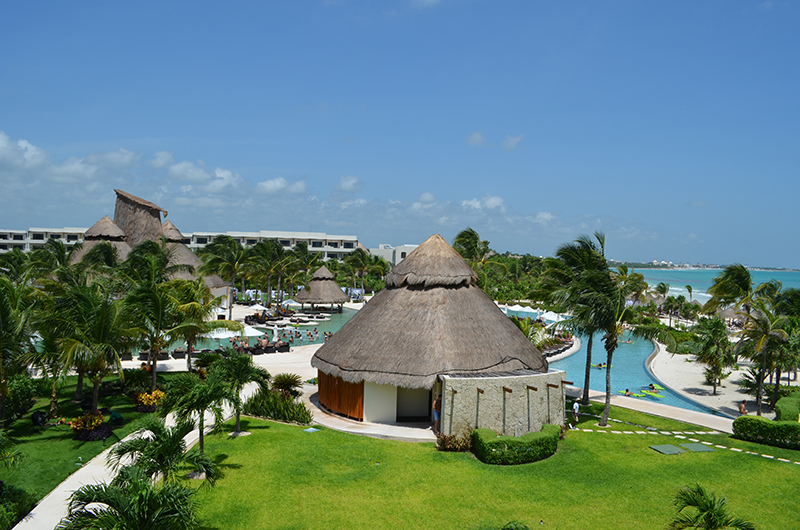 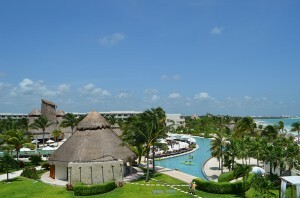 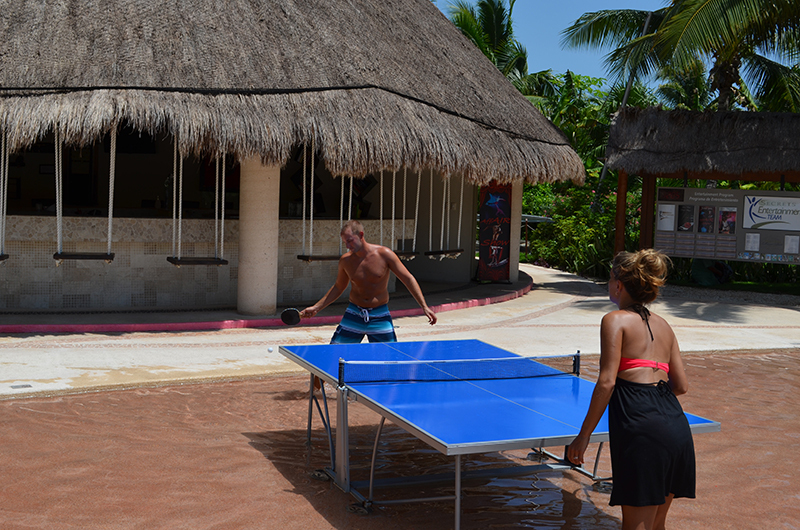 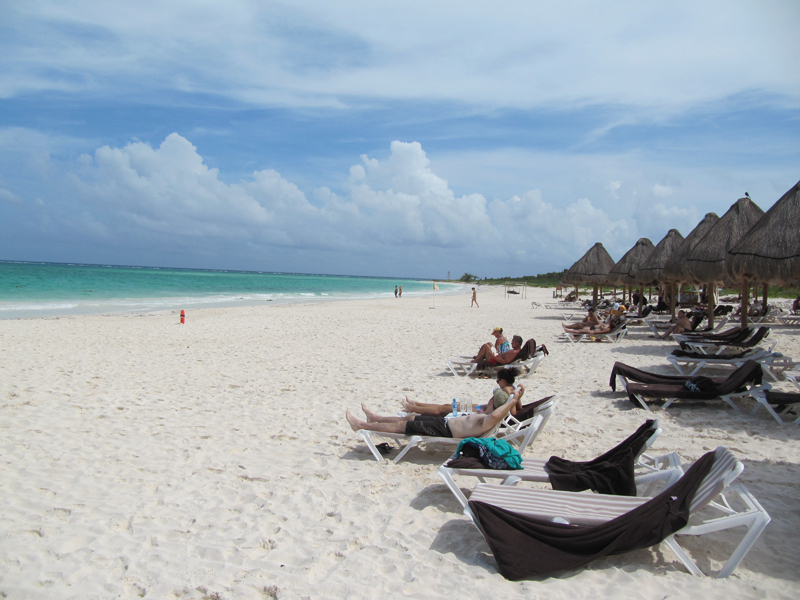 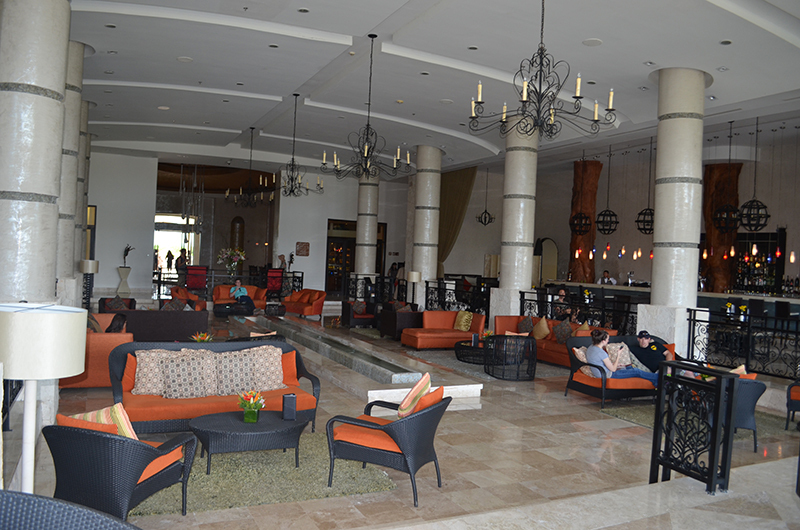 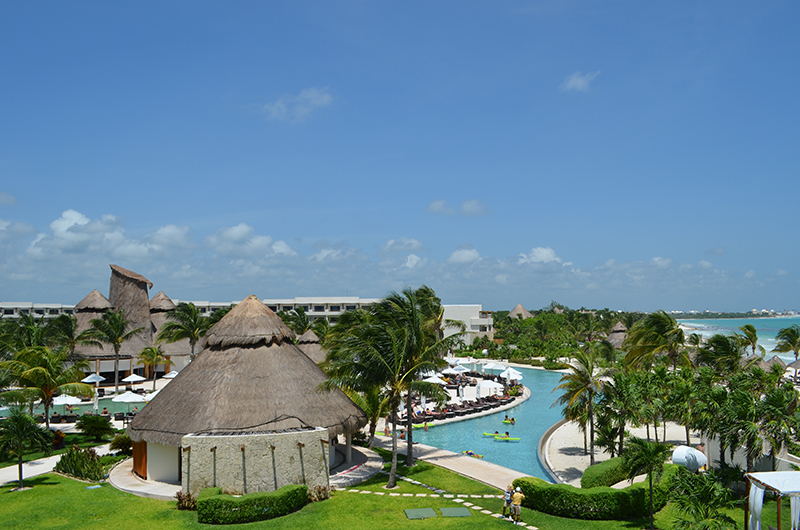 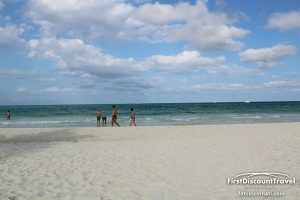 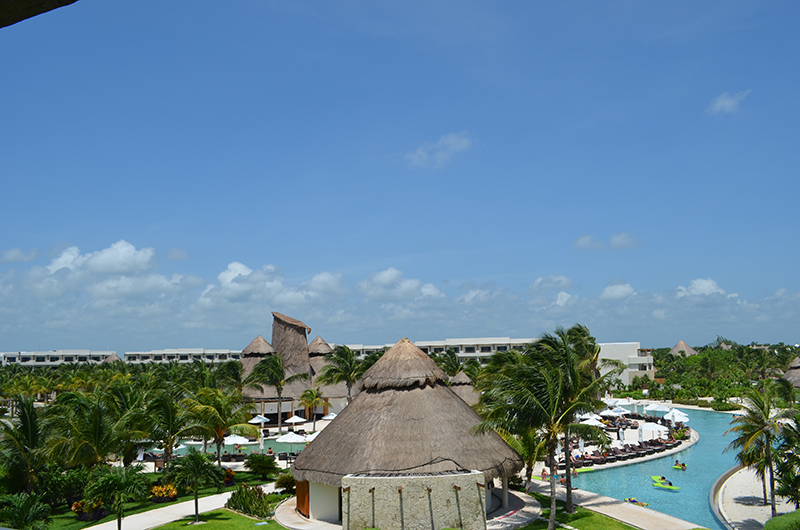 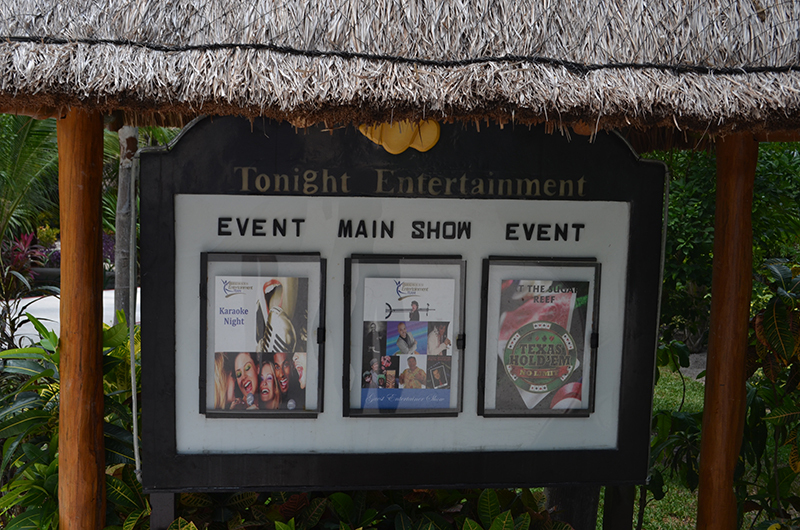 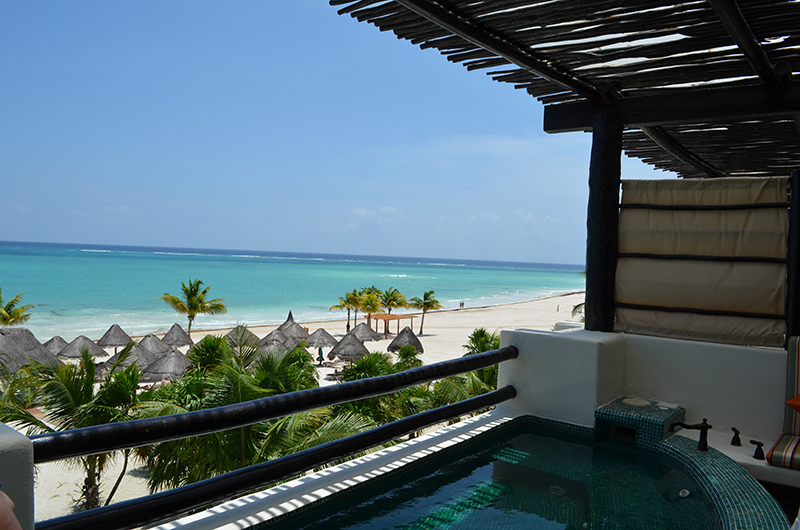 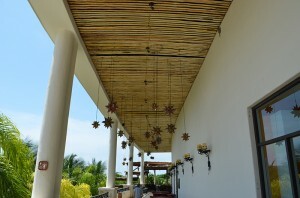 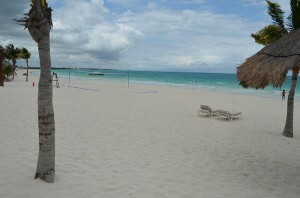 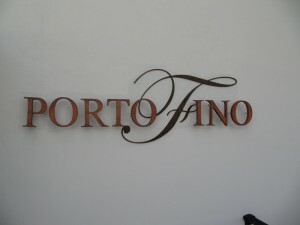 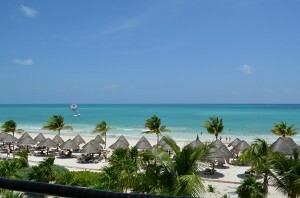 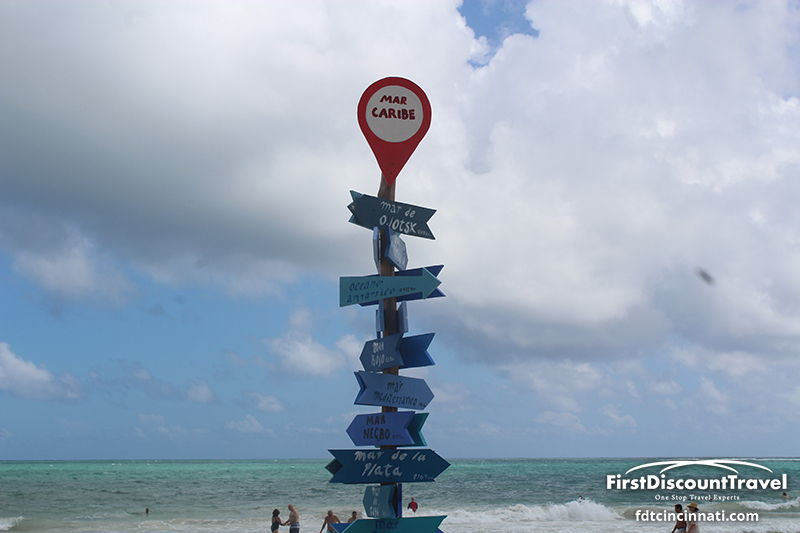 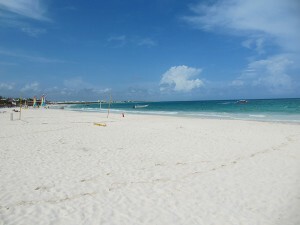 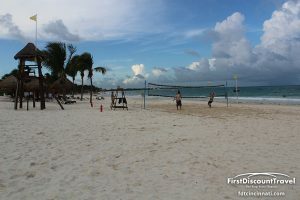 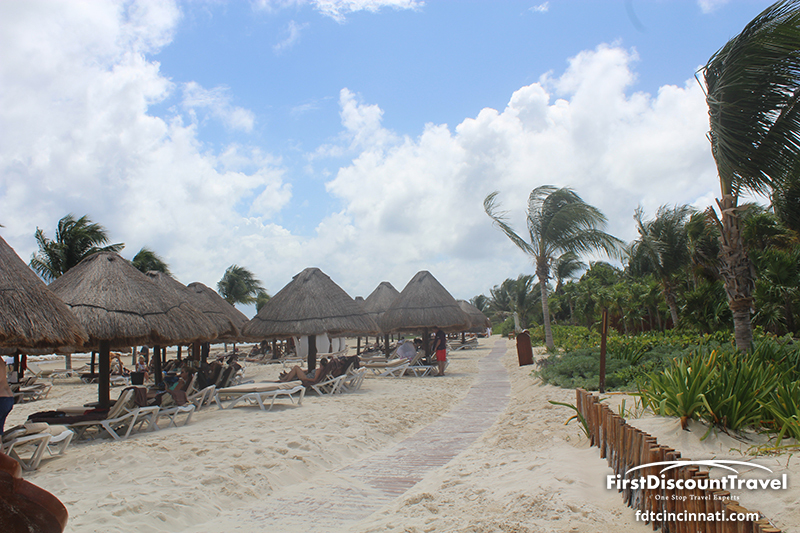 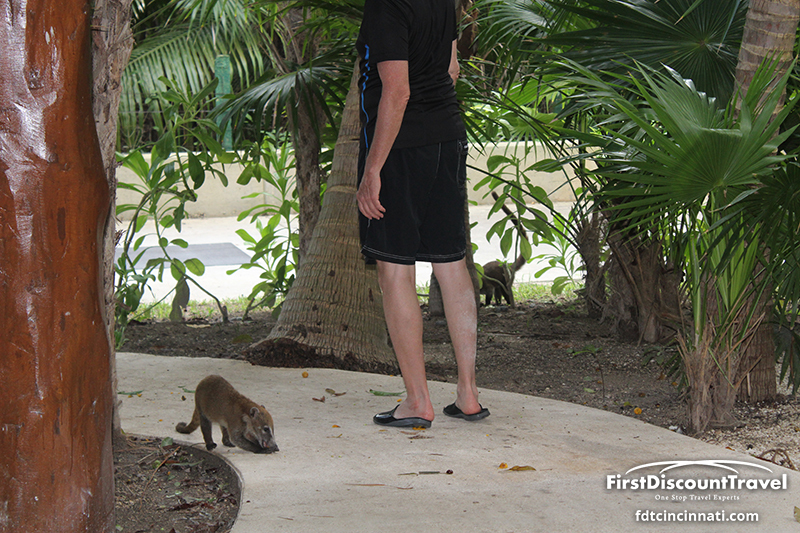 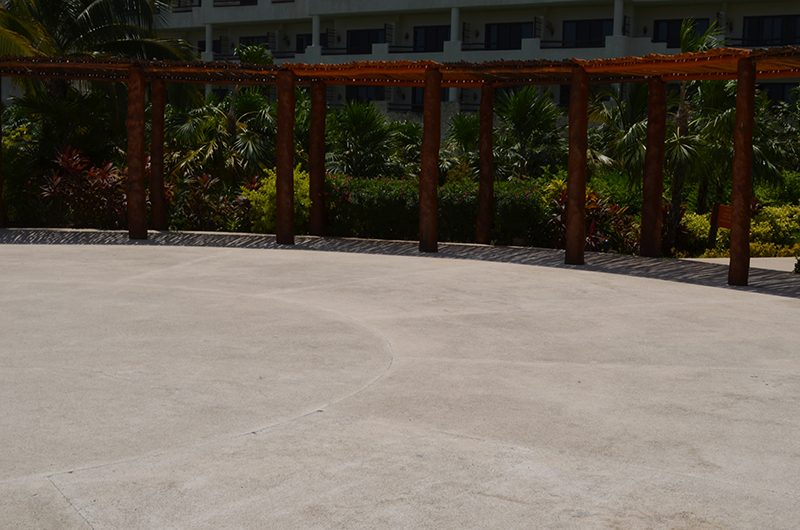 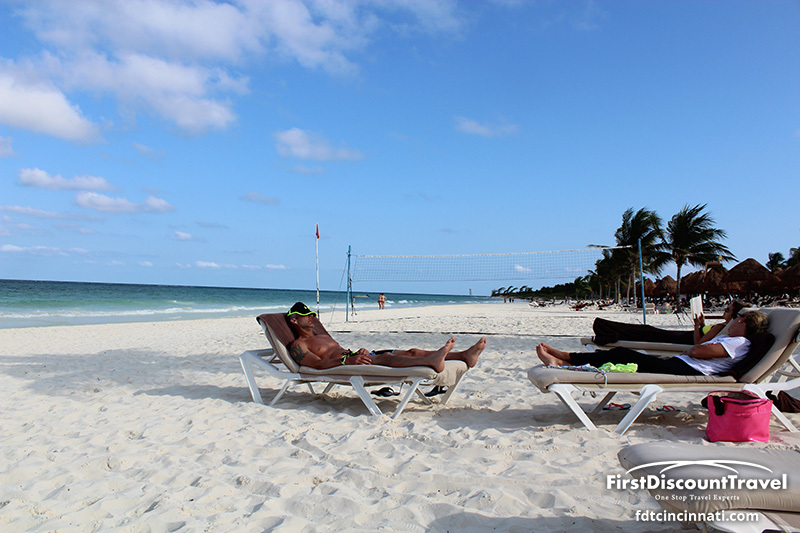 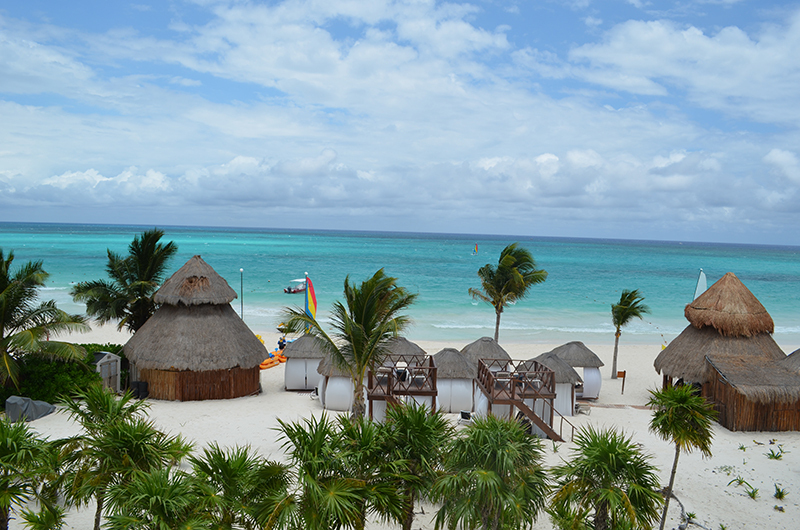 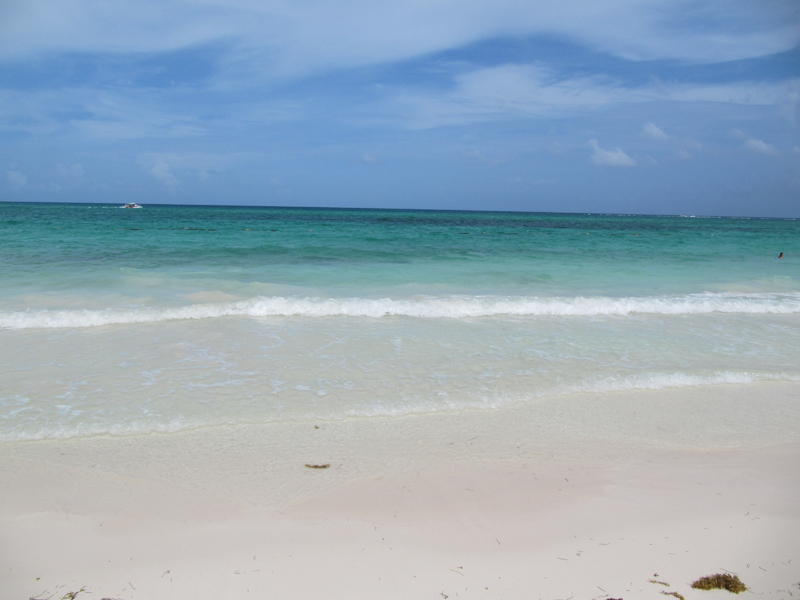 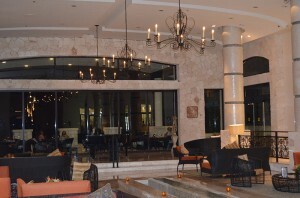 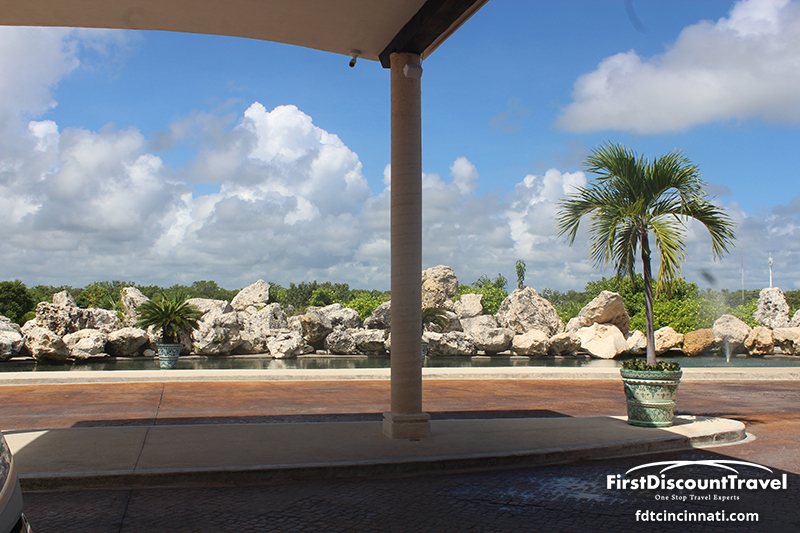 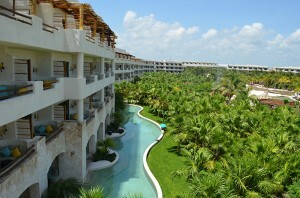 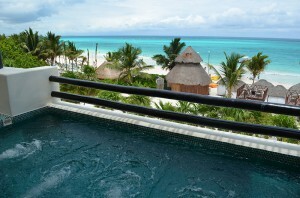 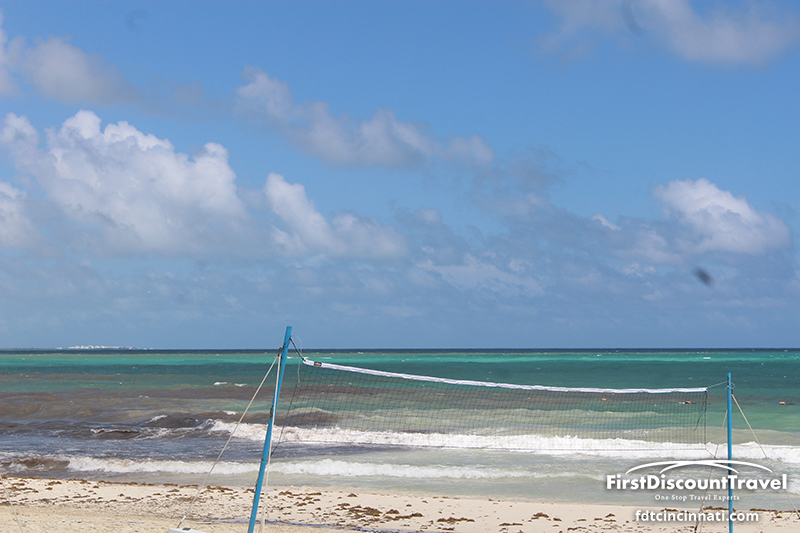 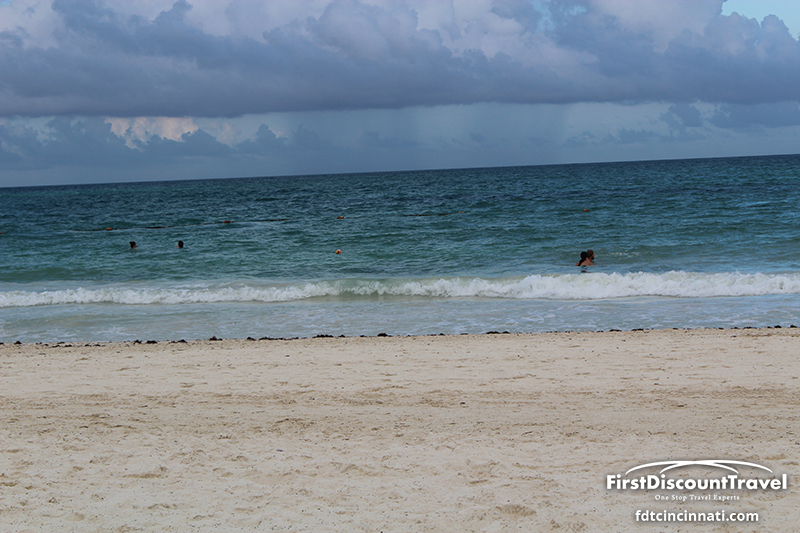 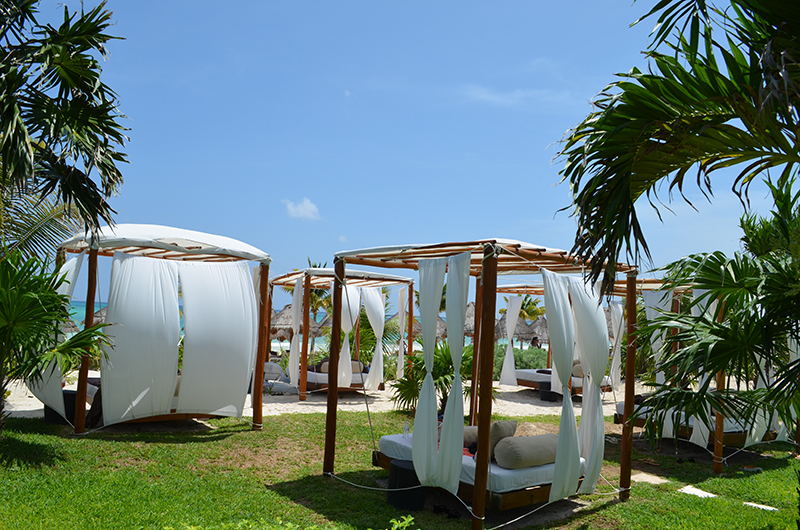 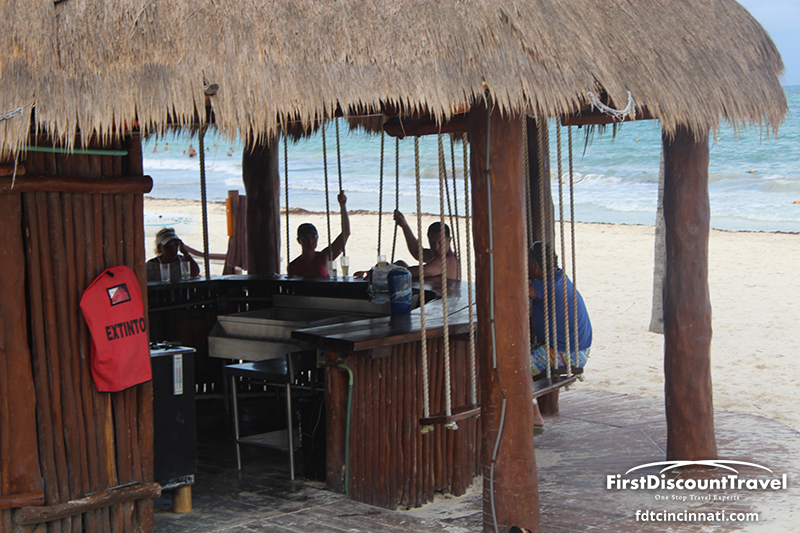 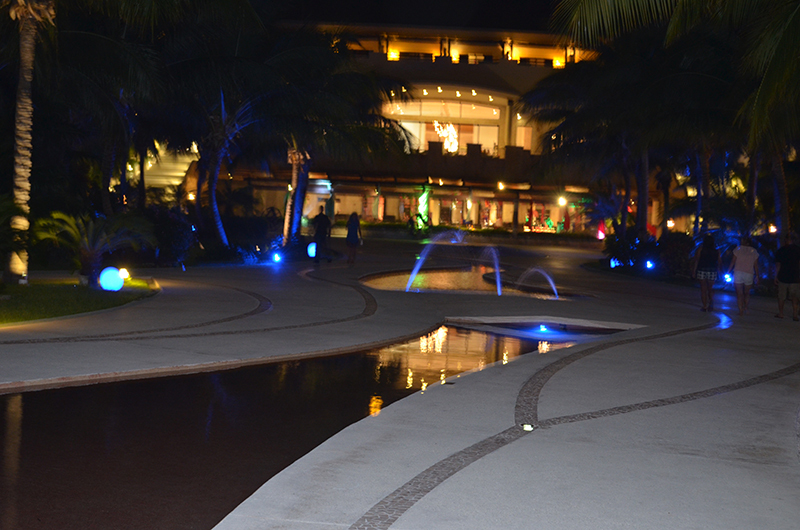 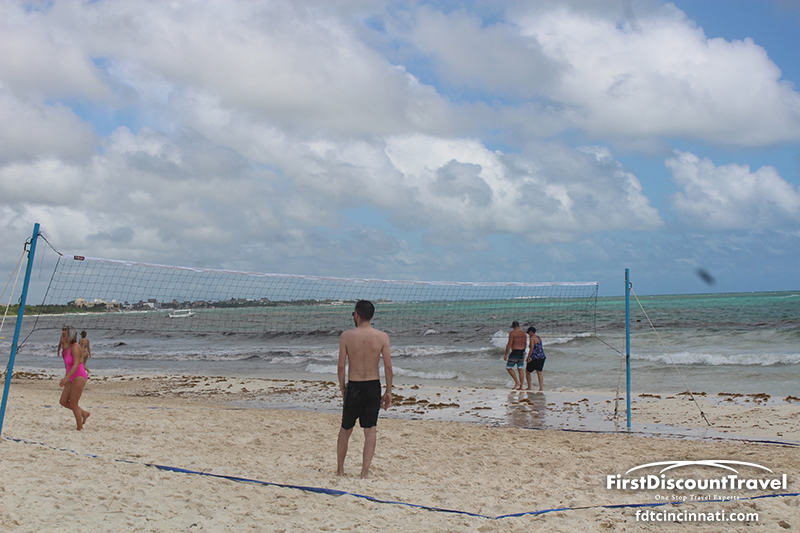 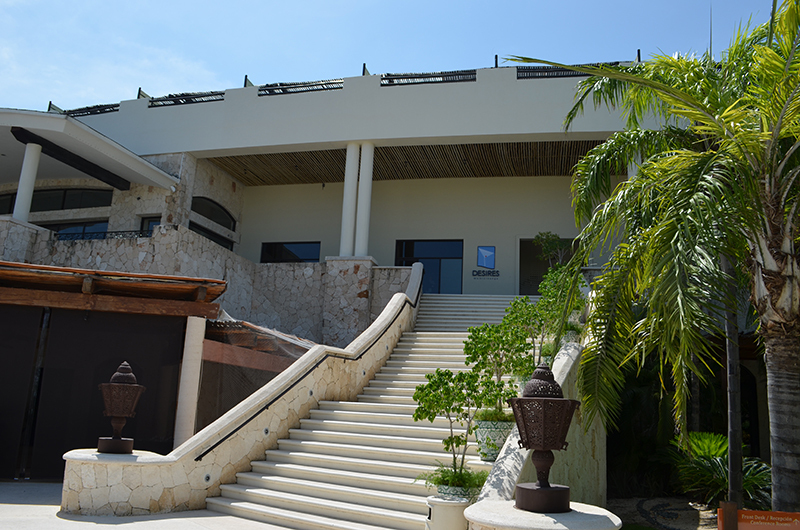 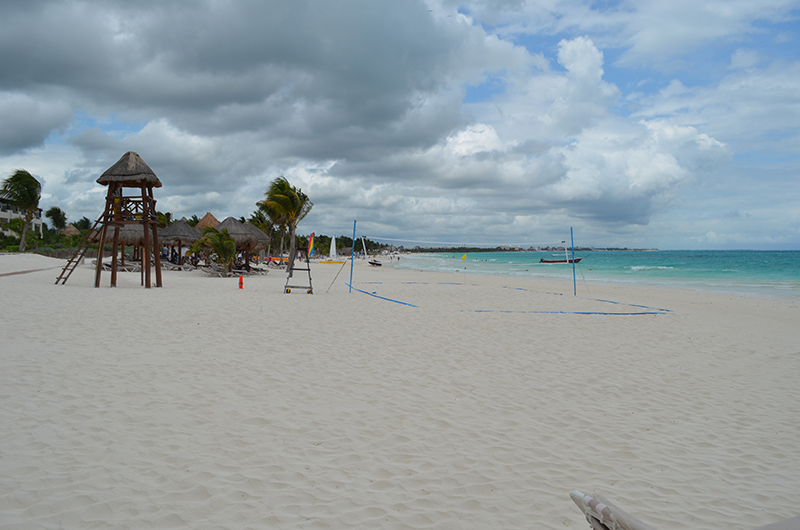 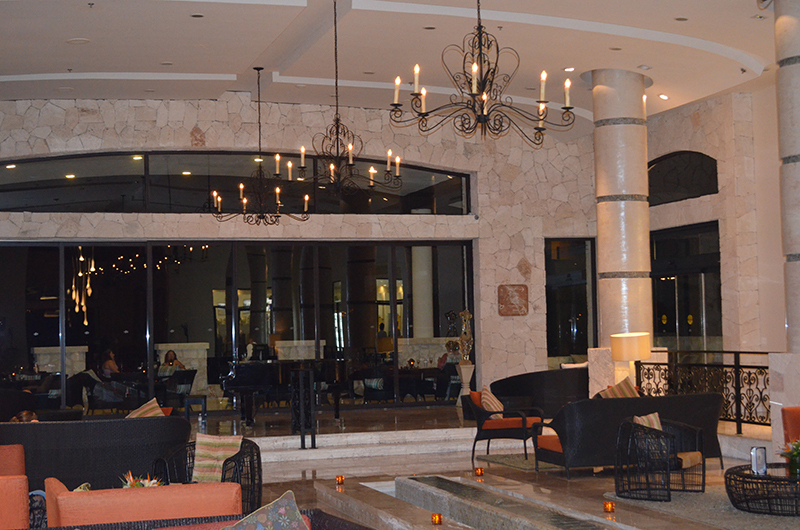 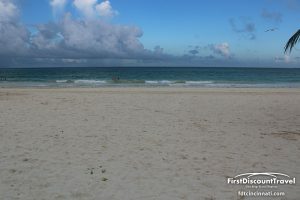 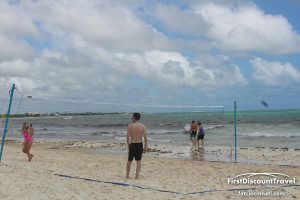 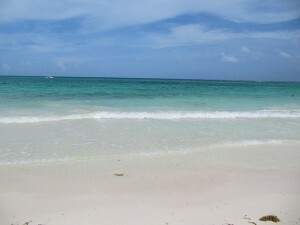 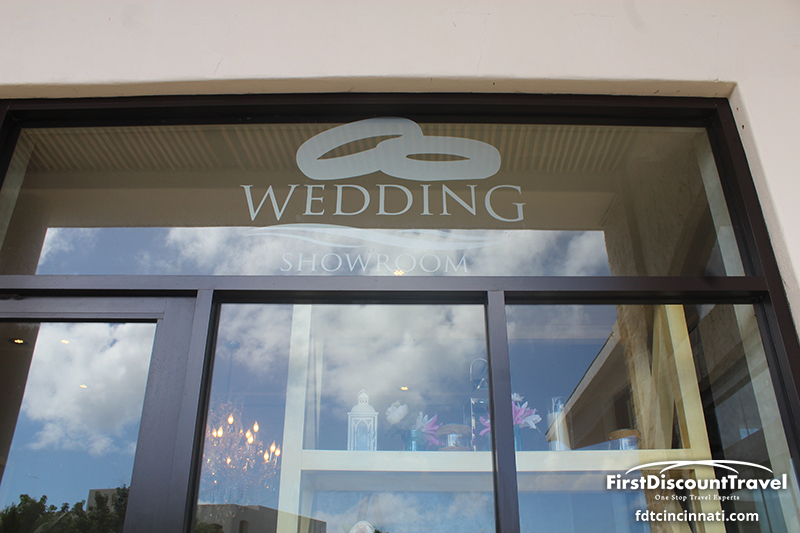 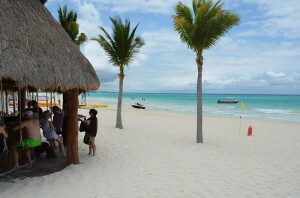 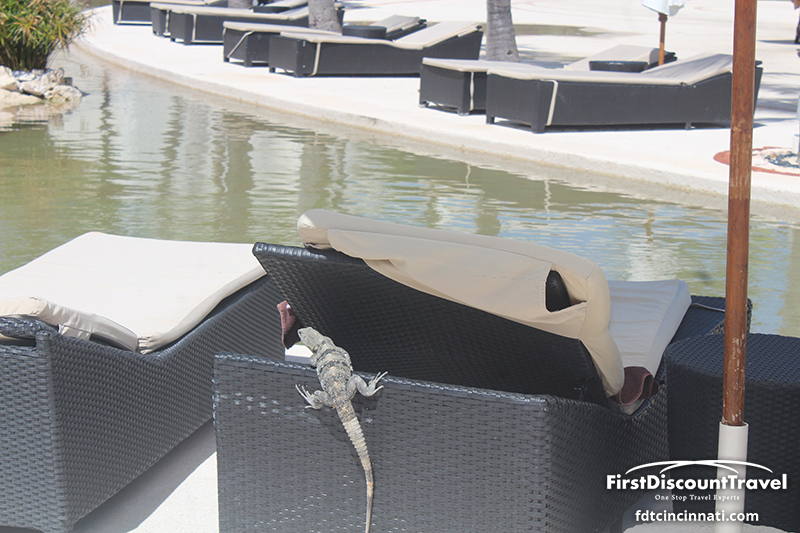 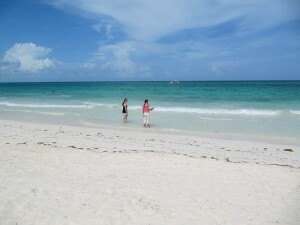 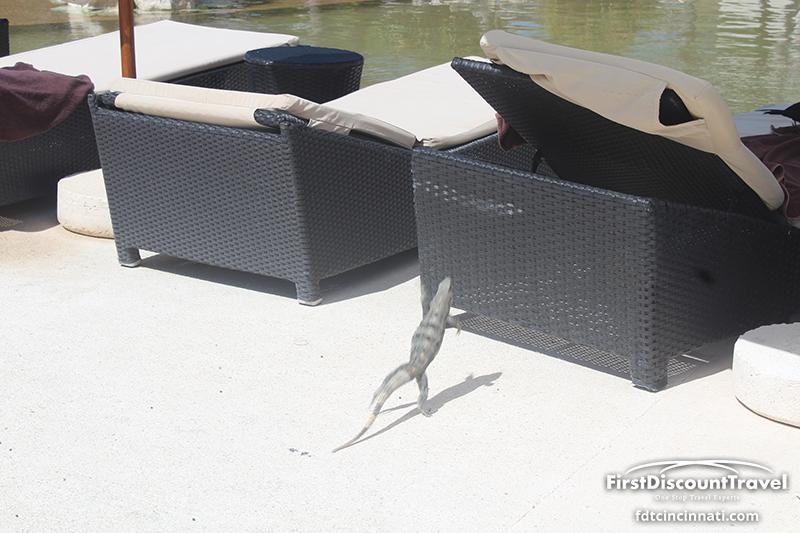 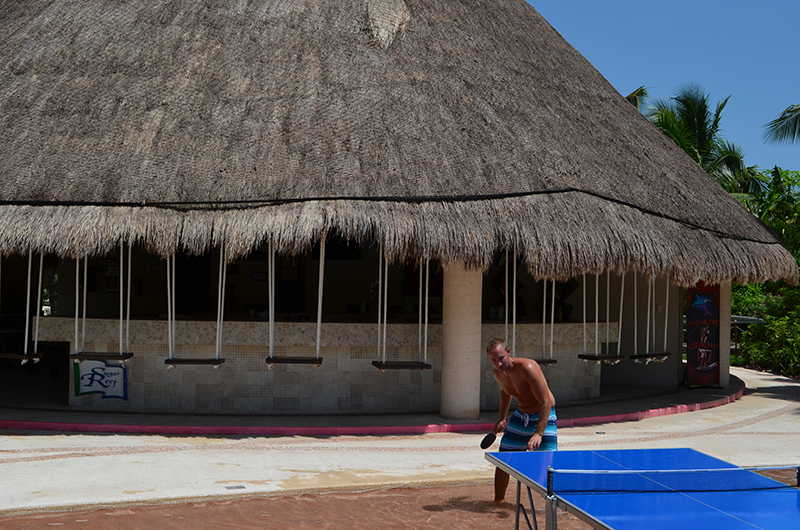 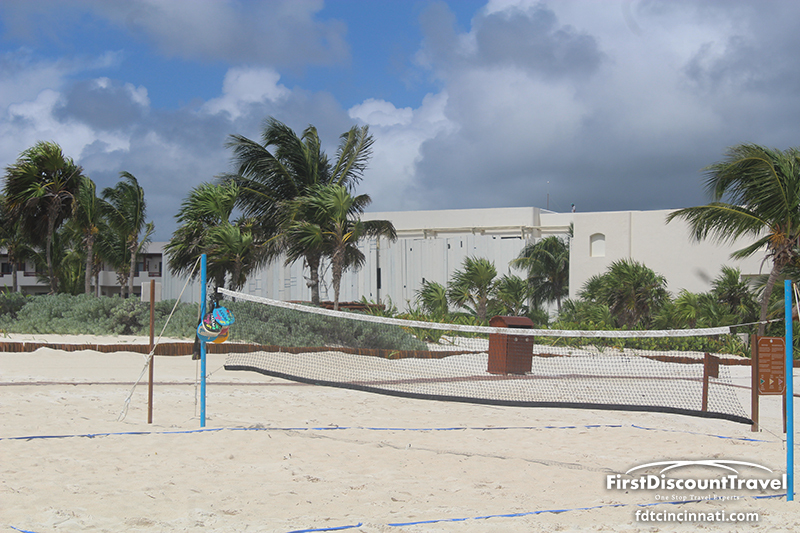 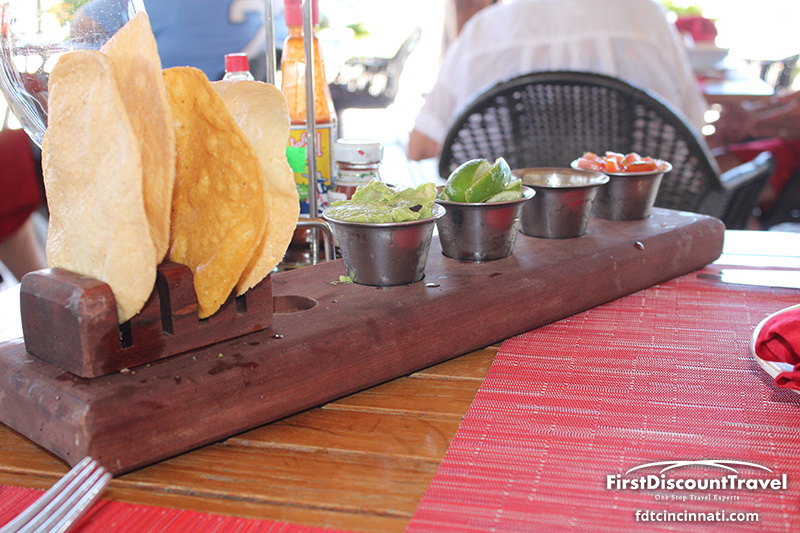 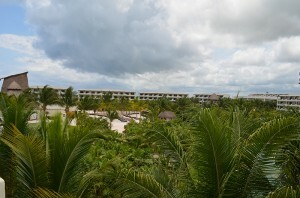 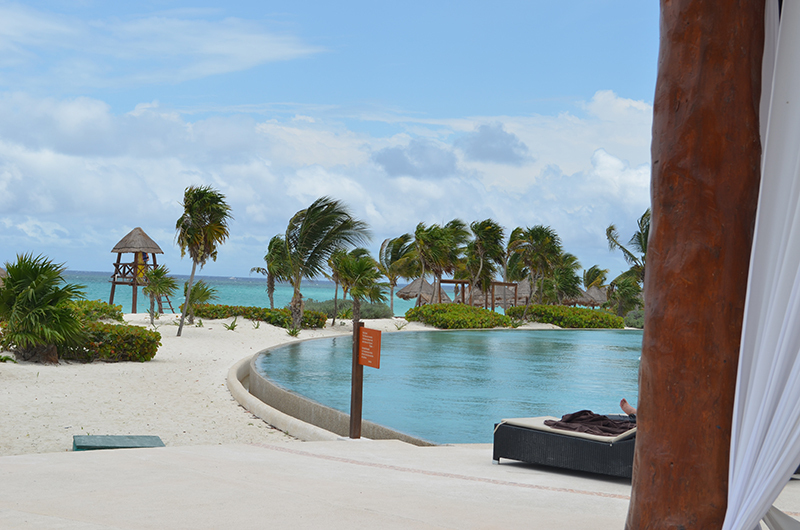 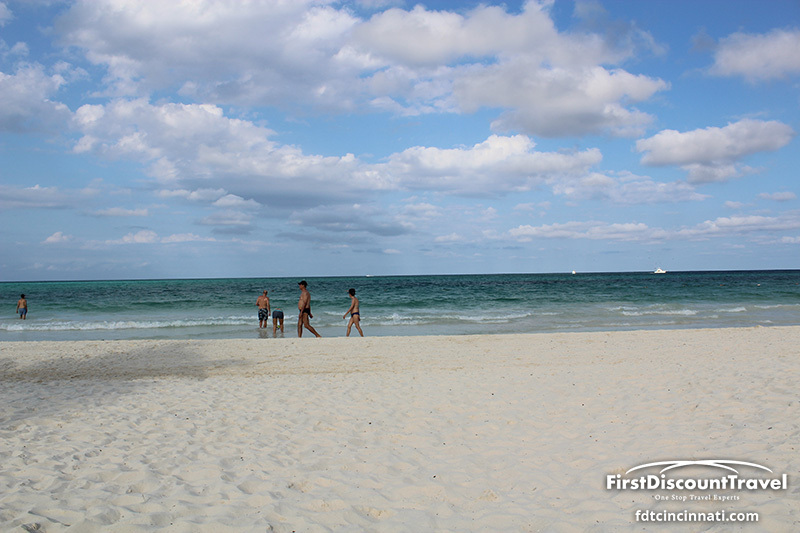 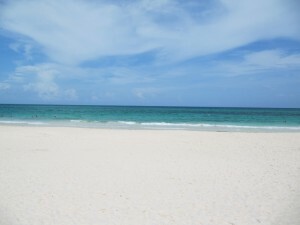 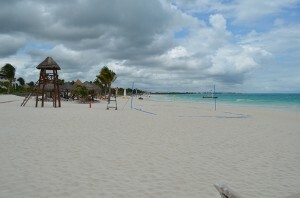 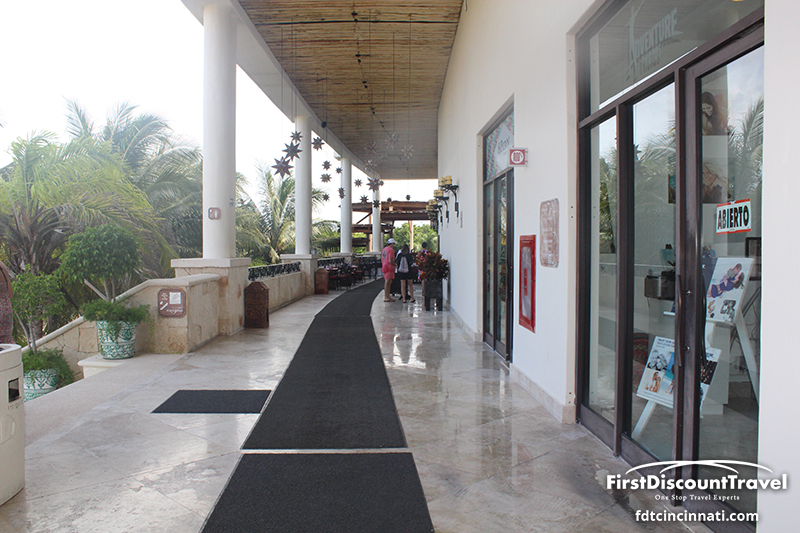 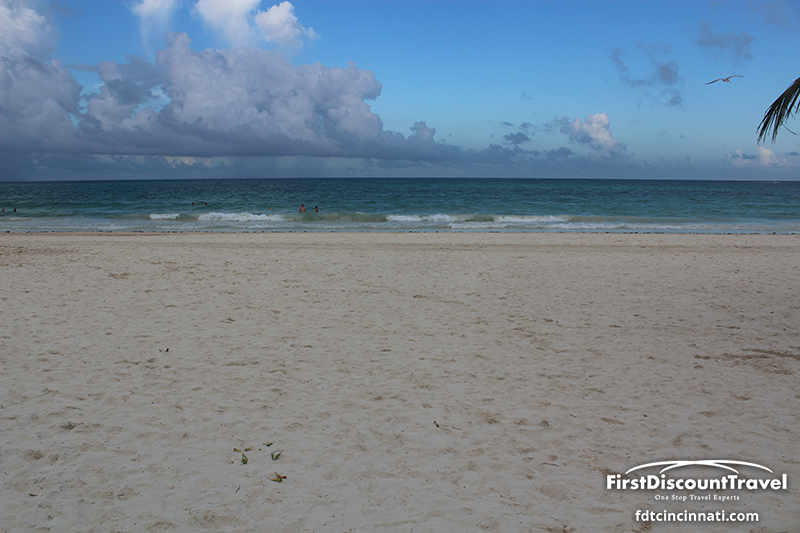 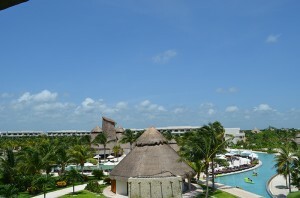 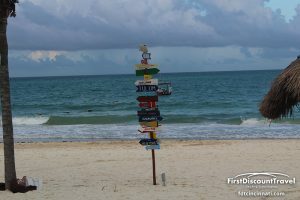 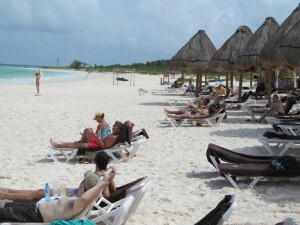 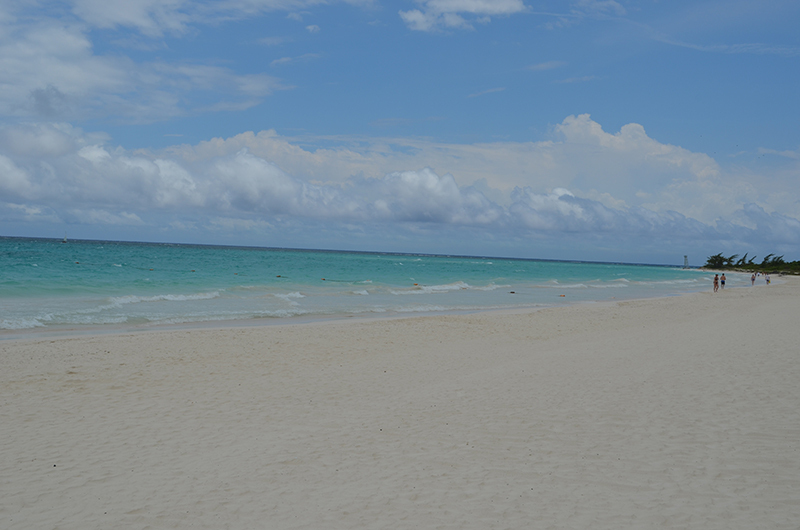 The resort is 45 minutes from the Cancun Airport and is situated on one of the prettiest beaches in Mexico! 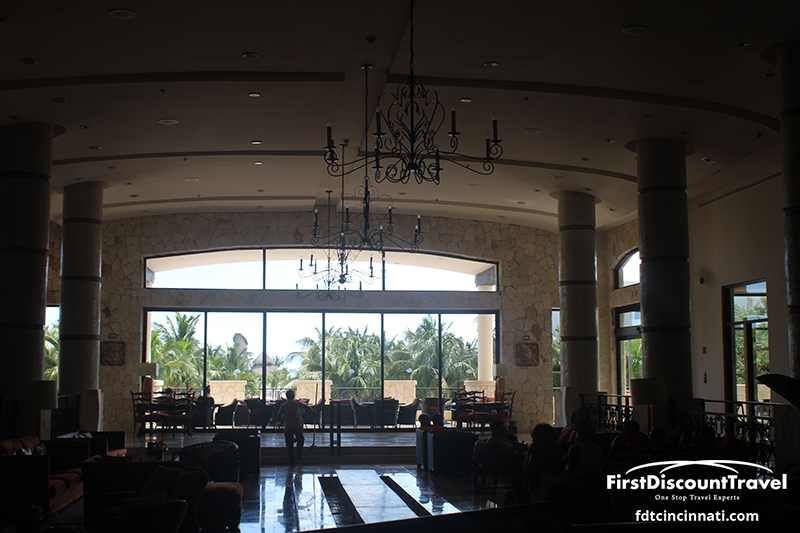 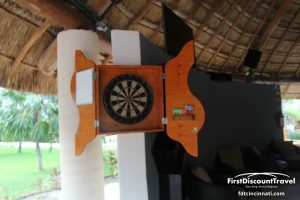 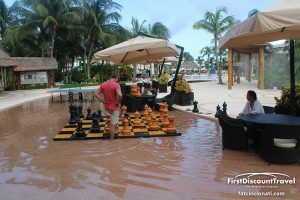 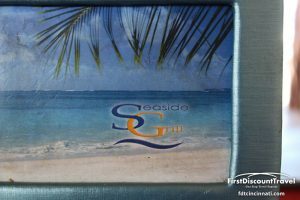 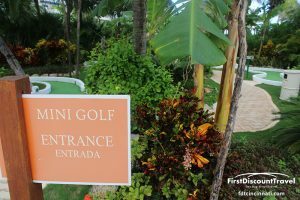 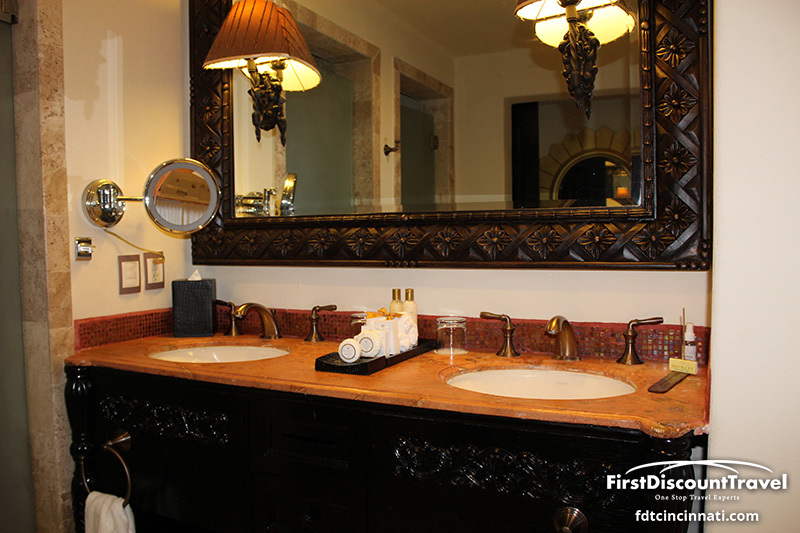 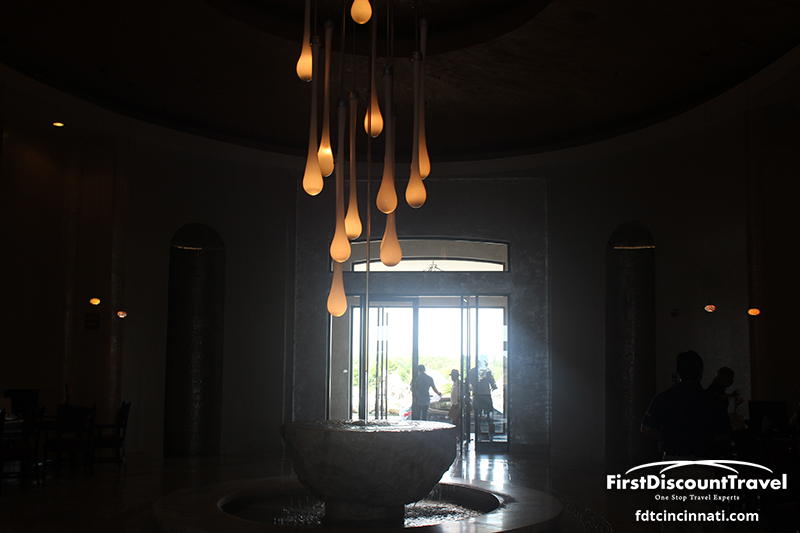 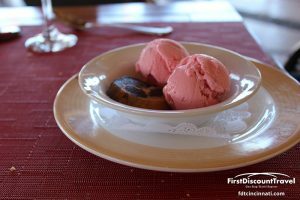 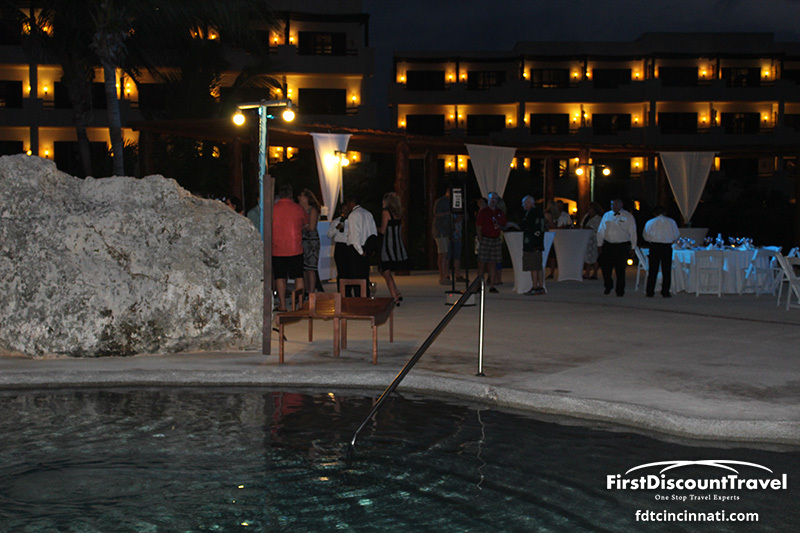 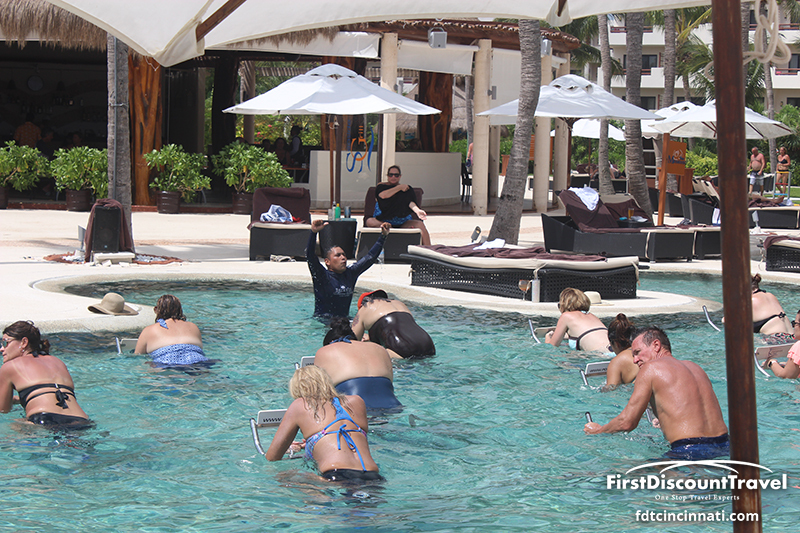 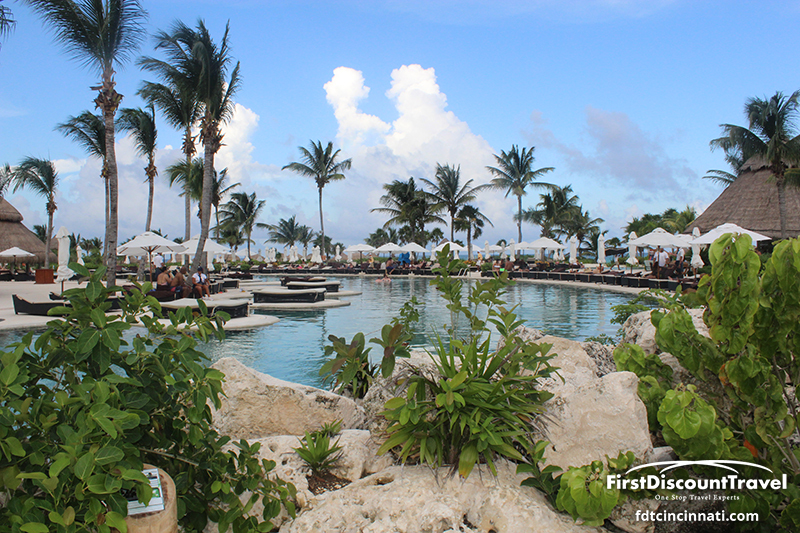 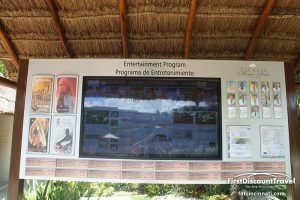 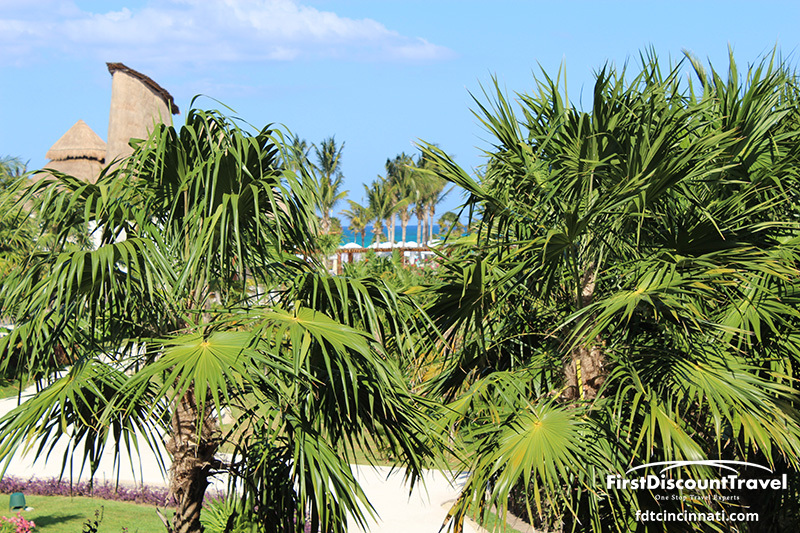 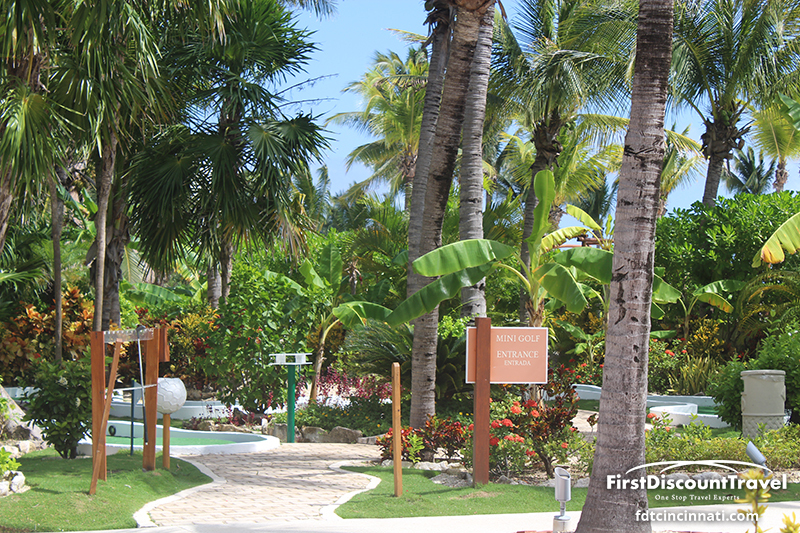 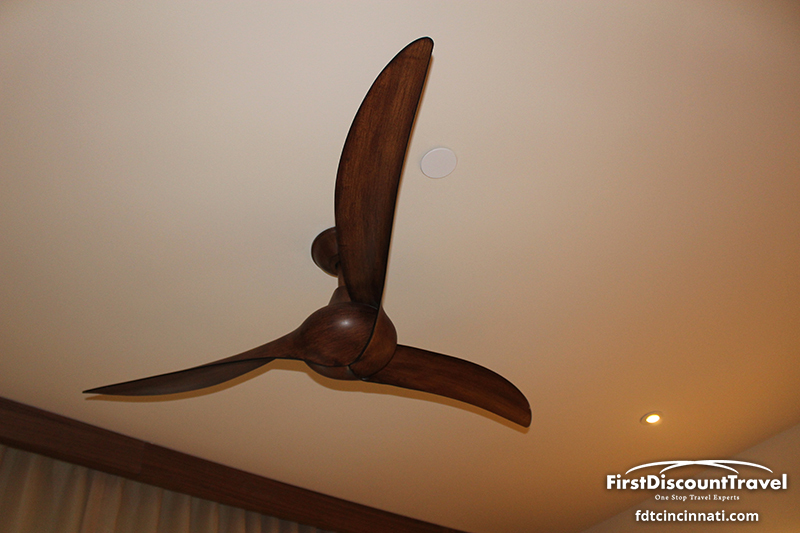 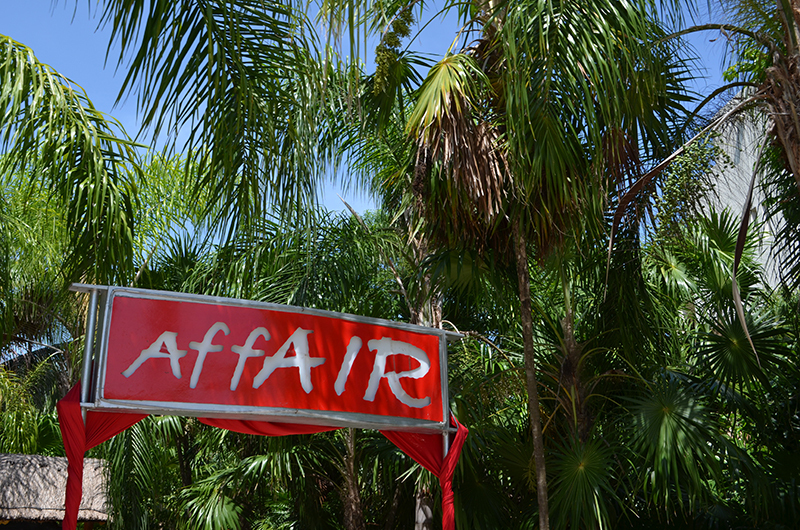 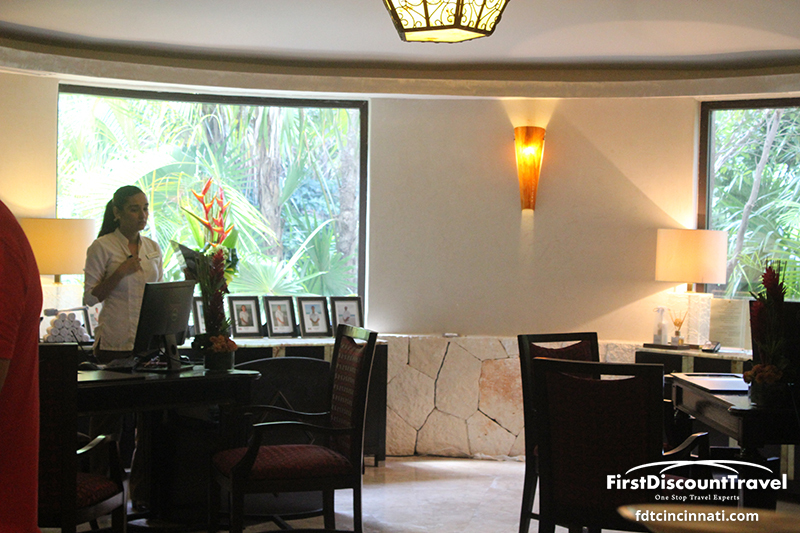 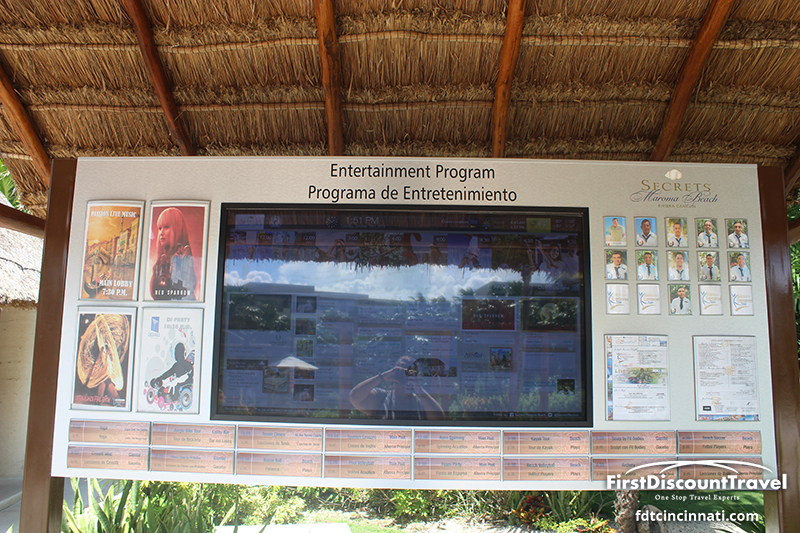 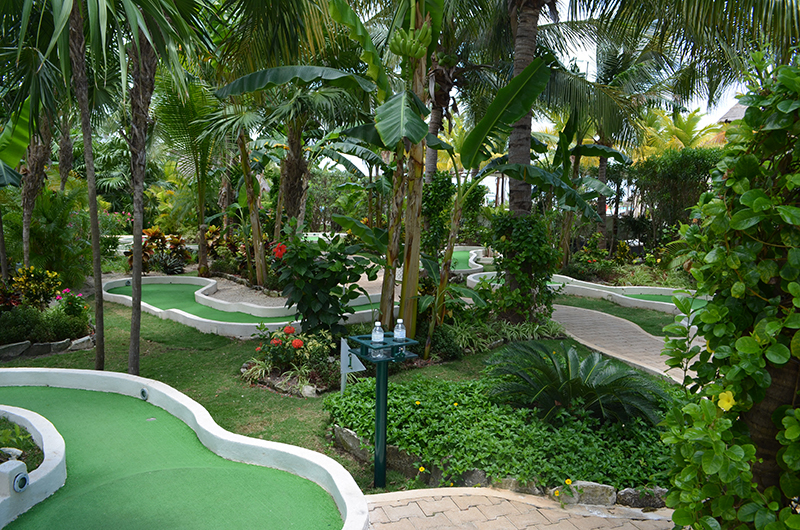 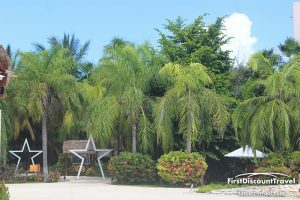 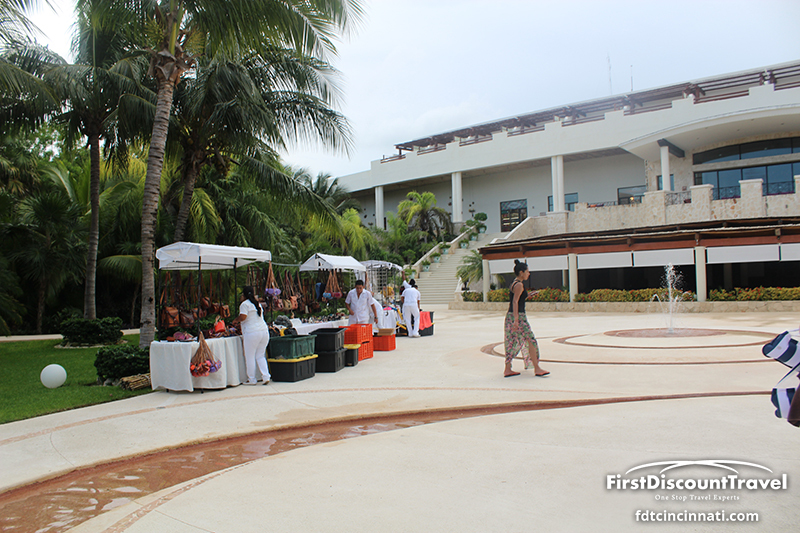 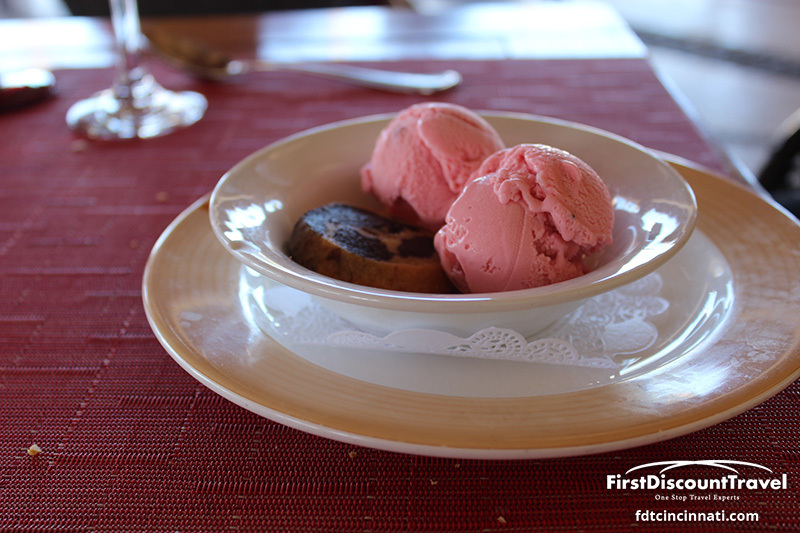 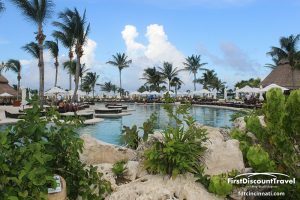 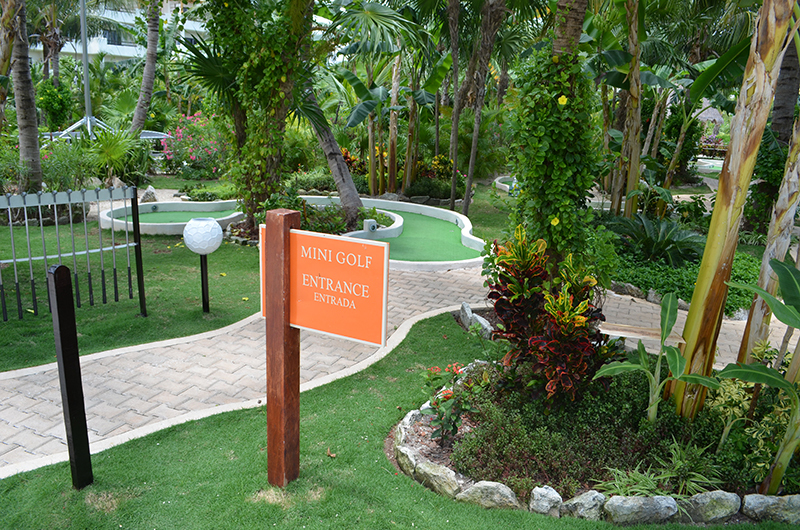 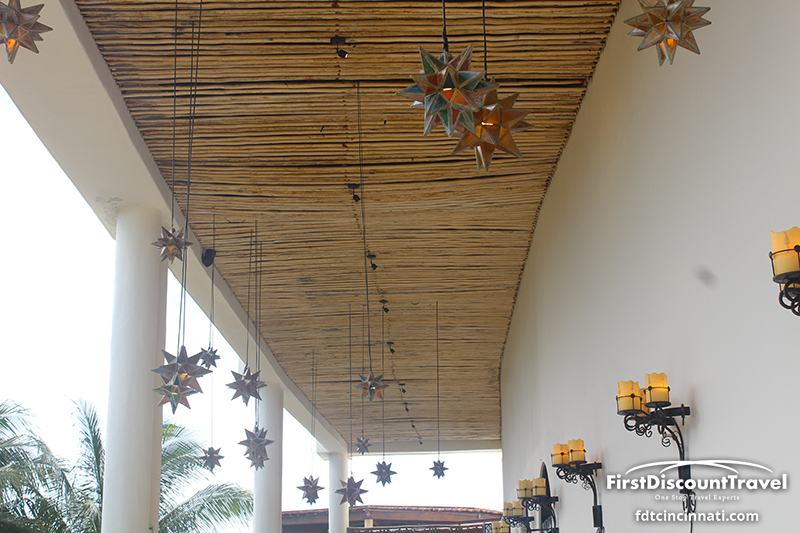 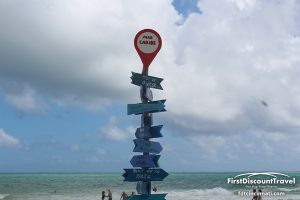 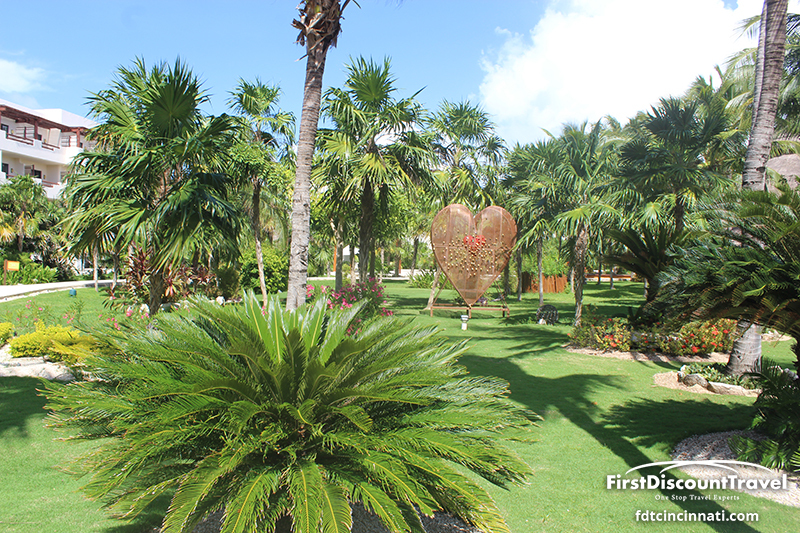 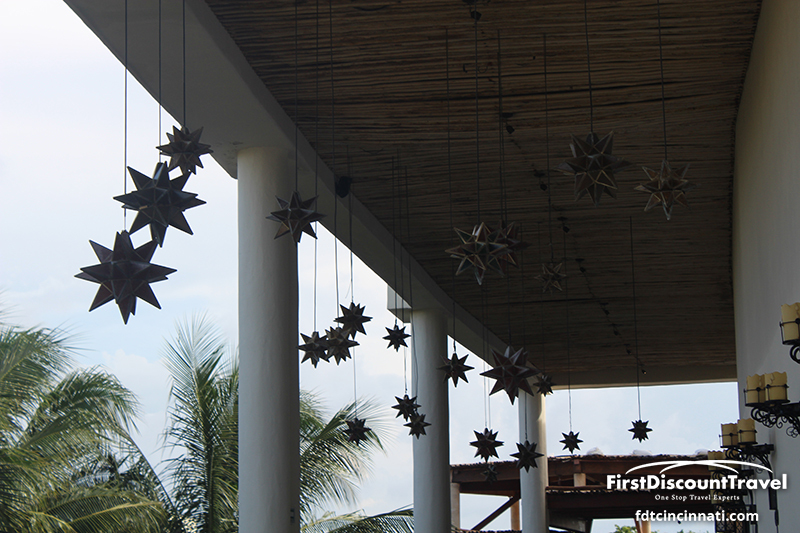 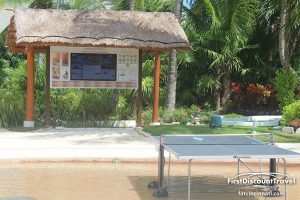 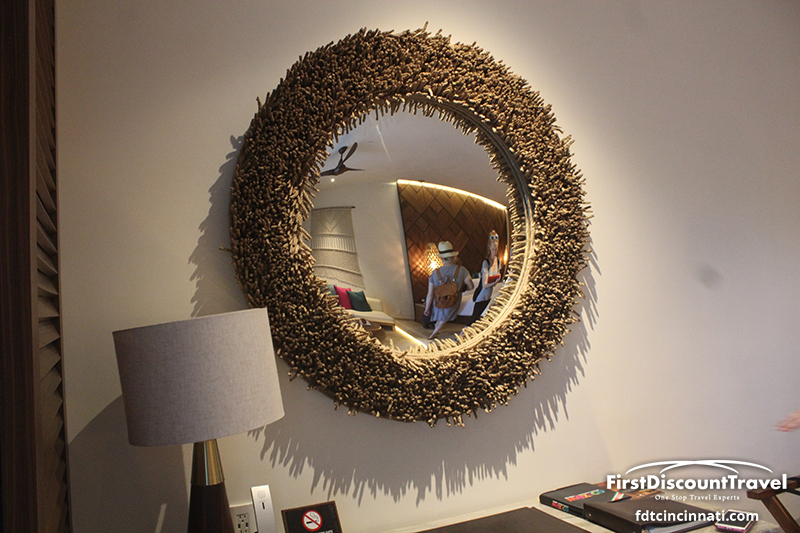 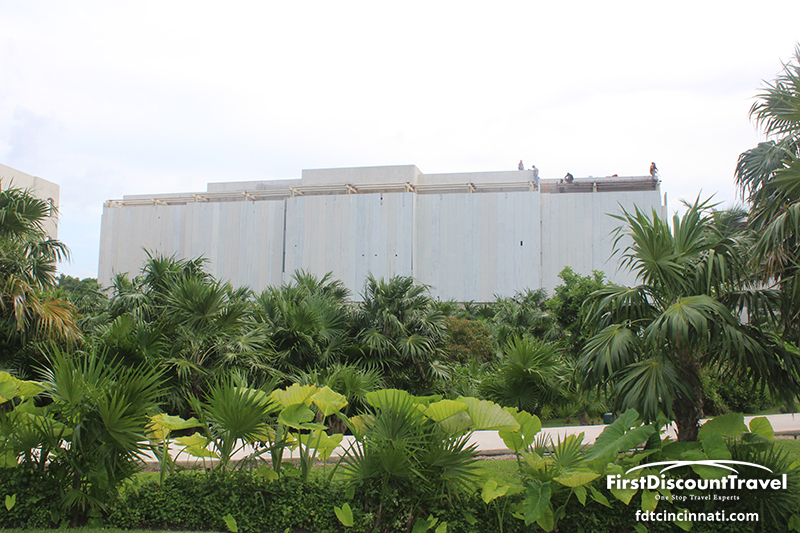 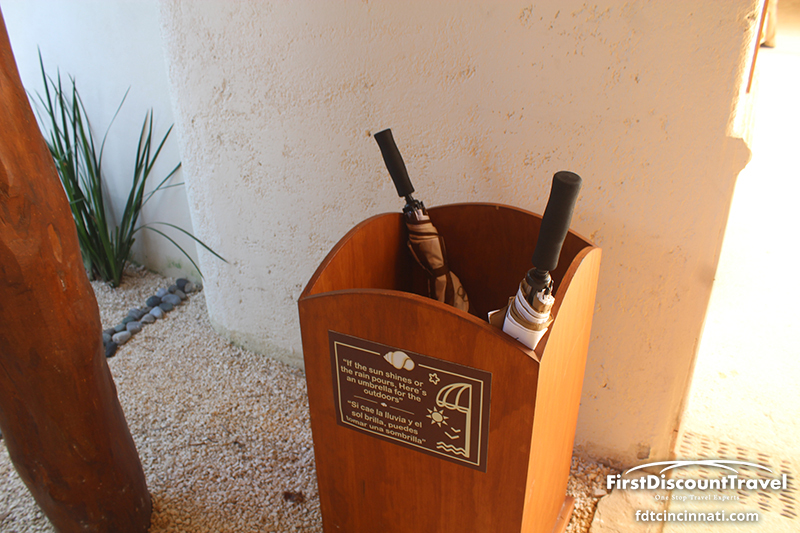 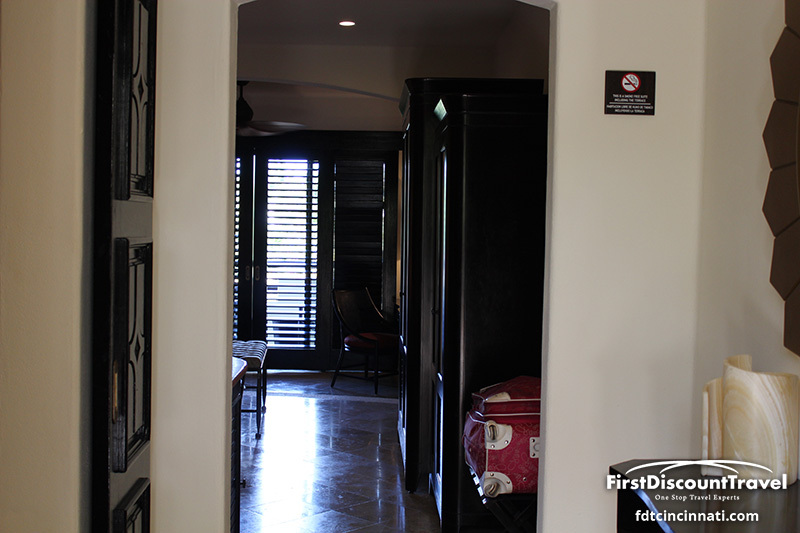 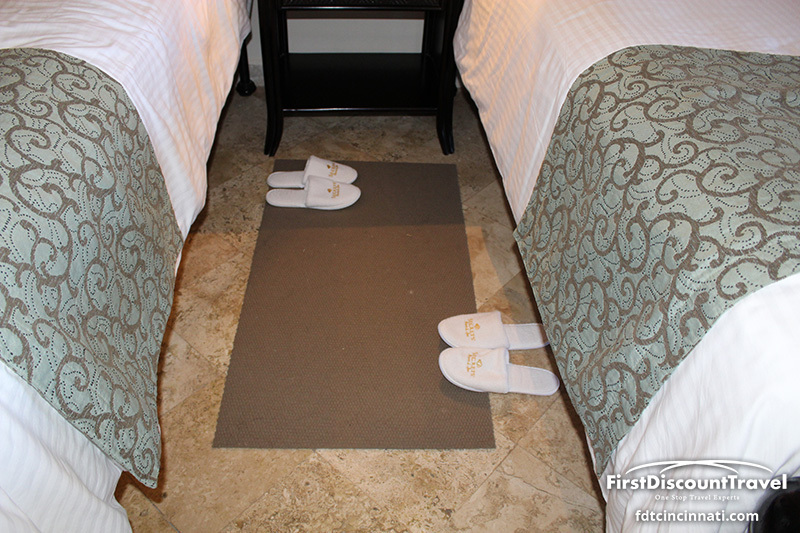 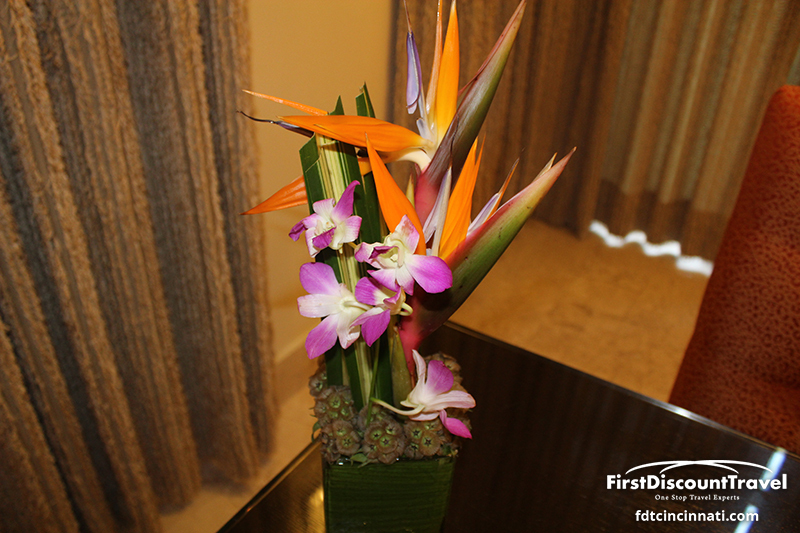 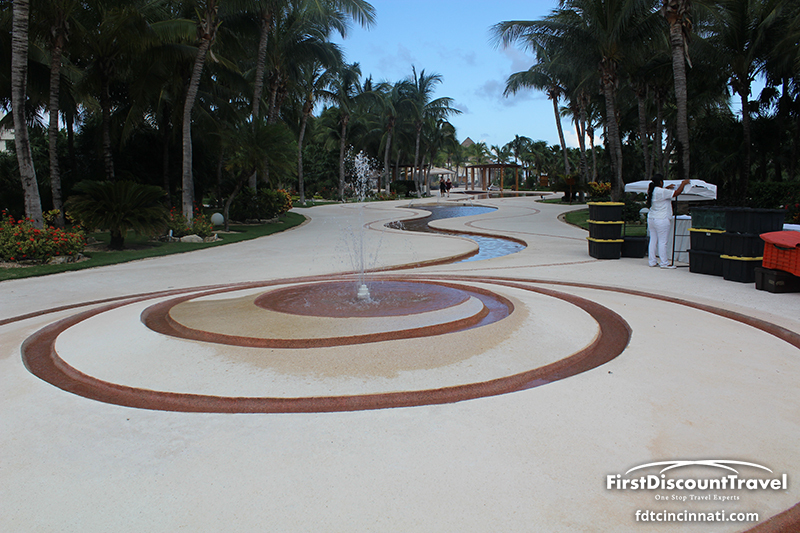 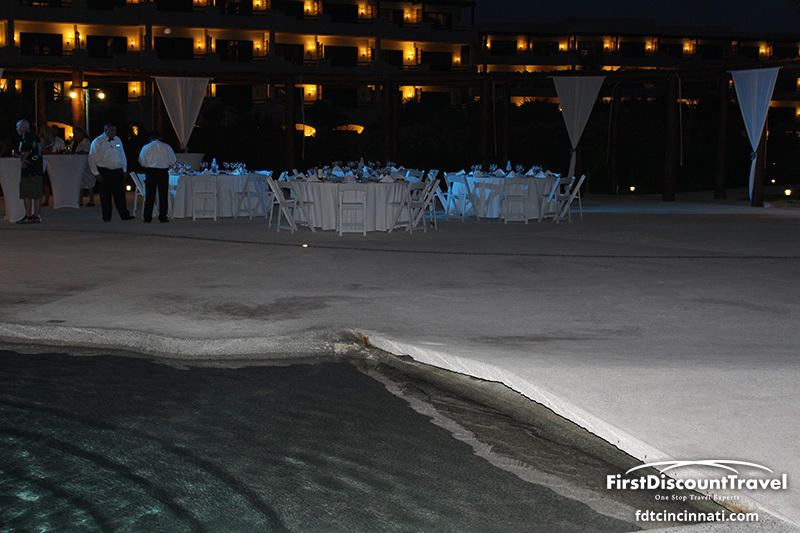 The amazing service was recognized with the AAA Five Diamond Award in 2013 (there are less than ten all- inclusive resorts to achieve this honor). 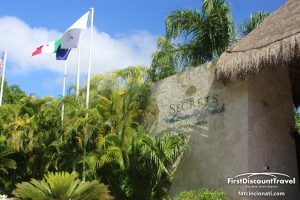 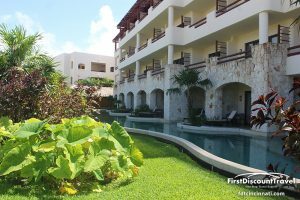 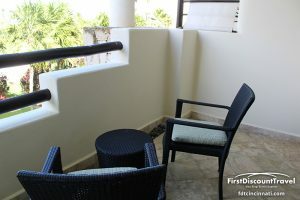 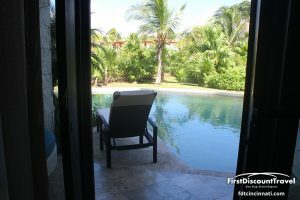 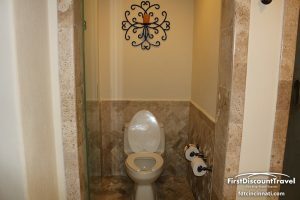 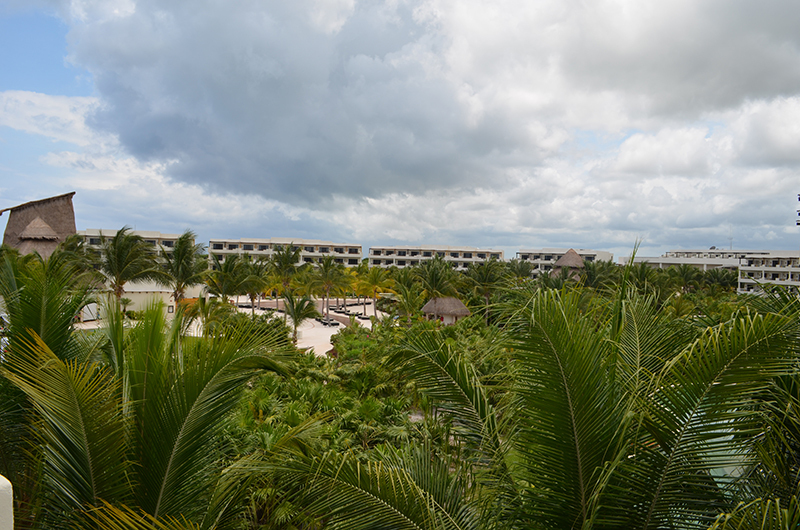 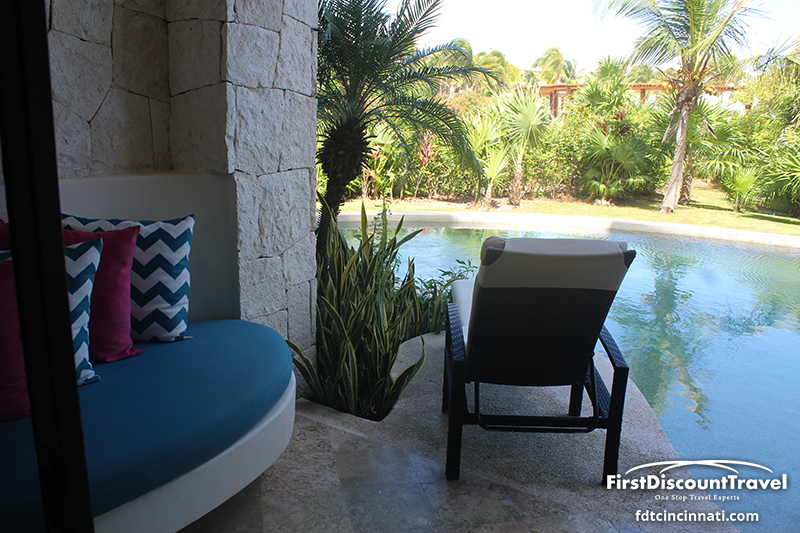 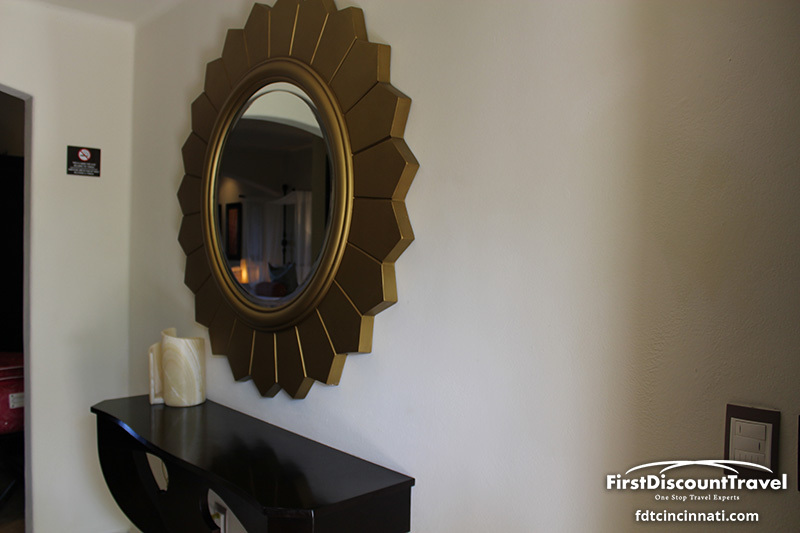 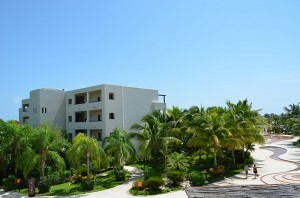 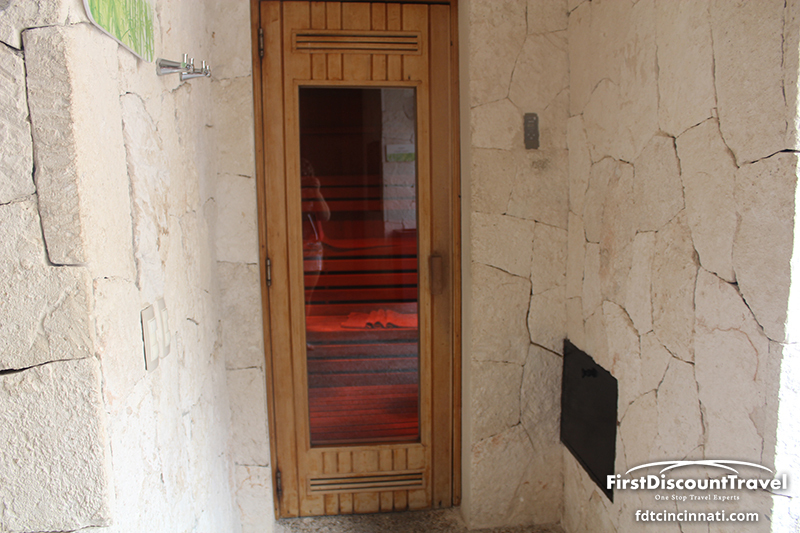 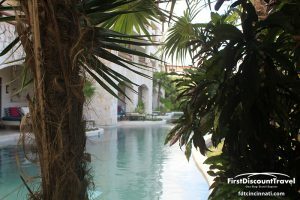 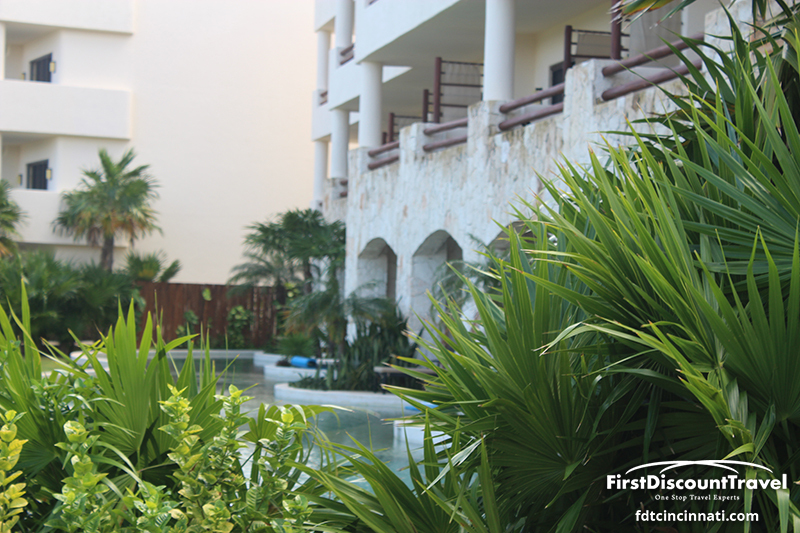 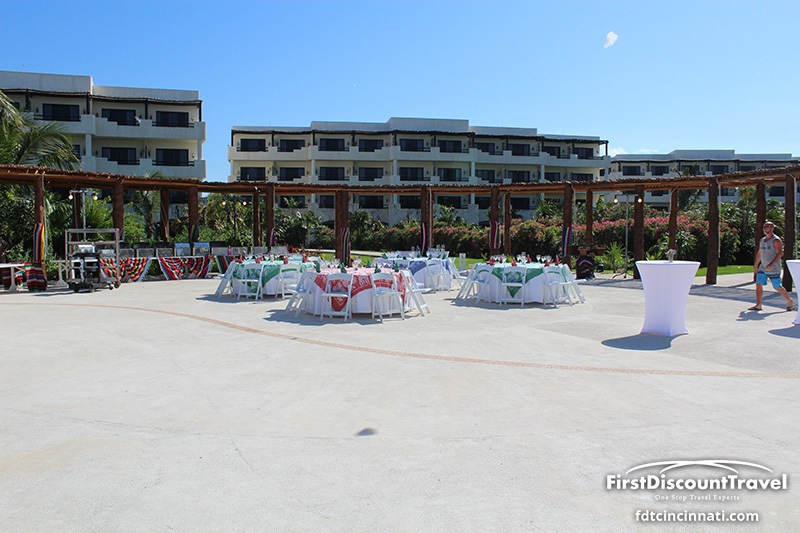 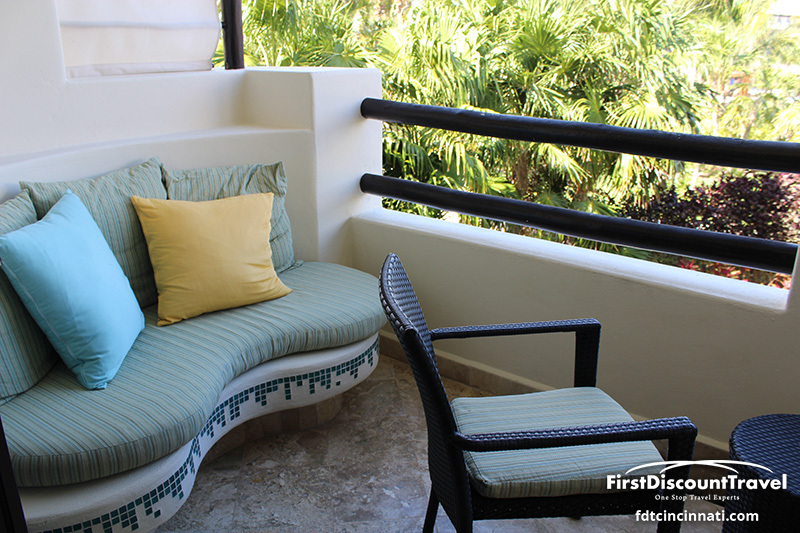 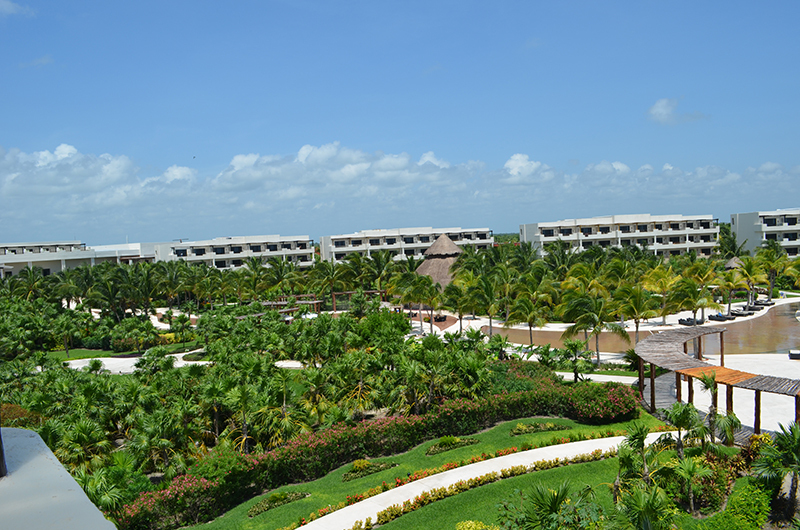 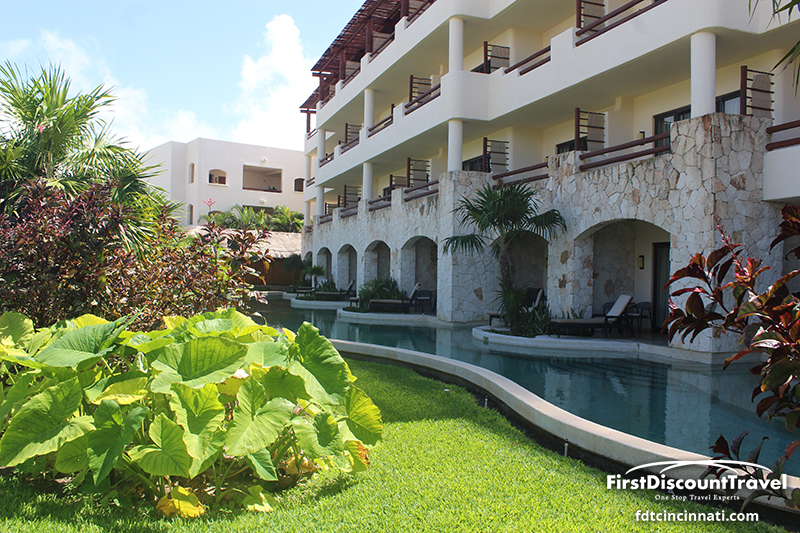 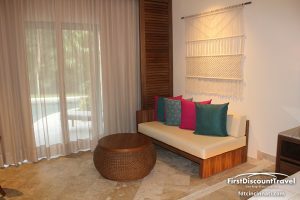 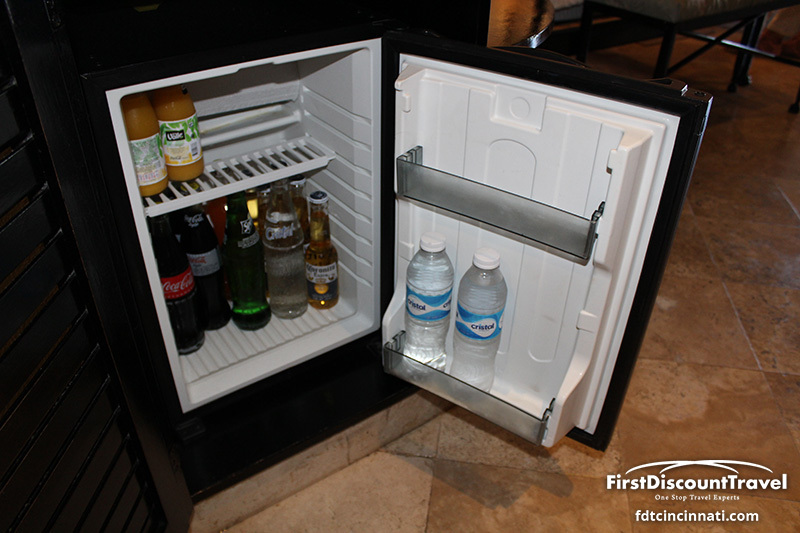 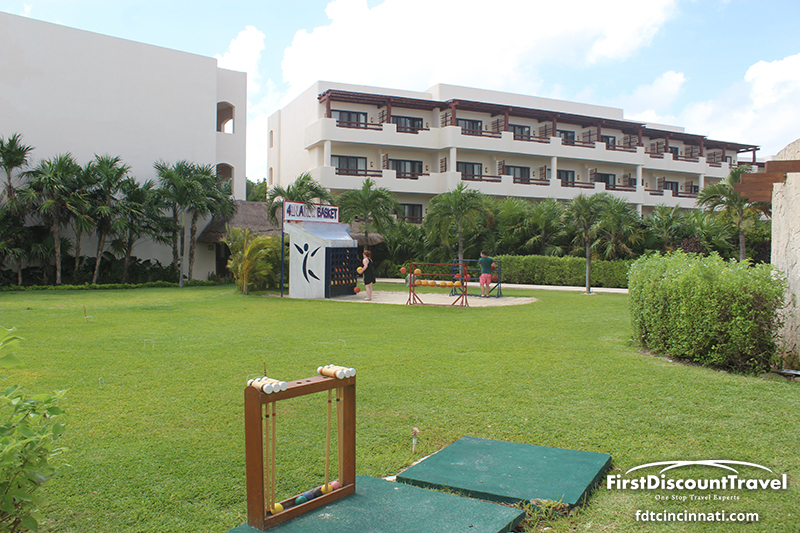 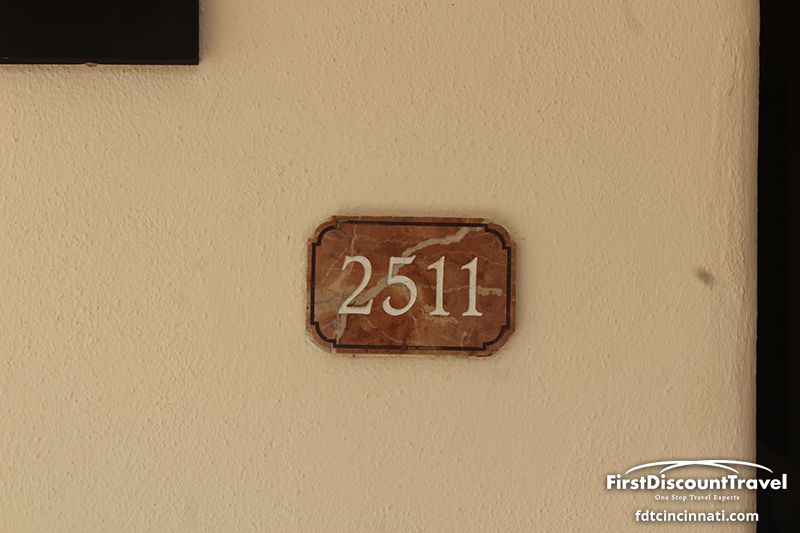 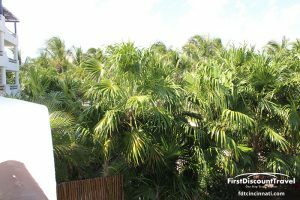 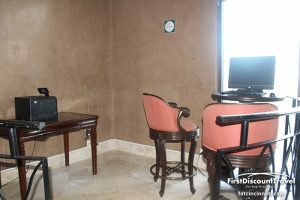 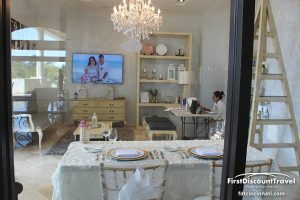 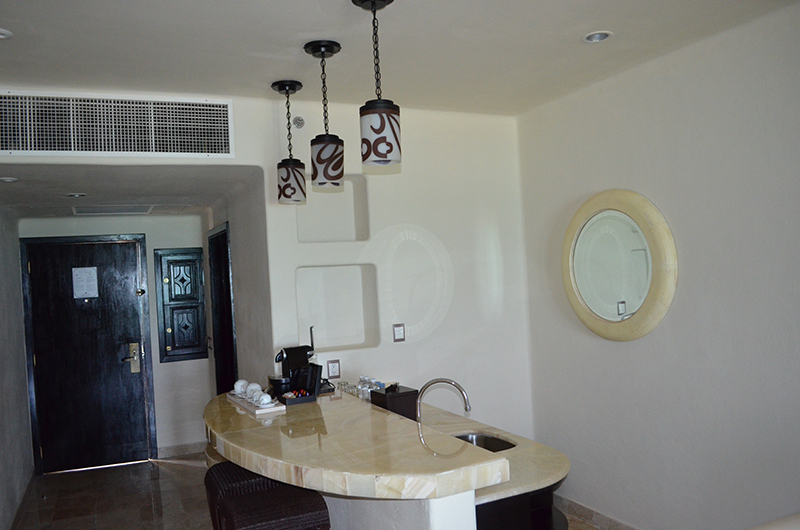 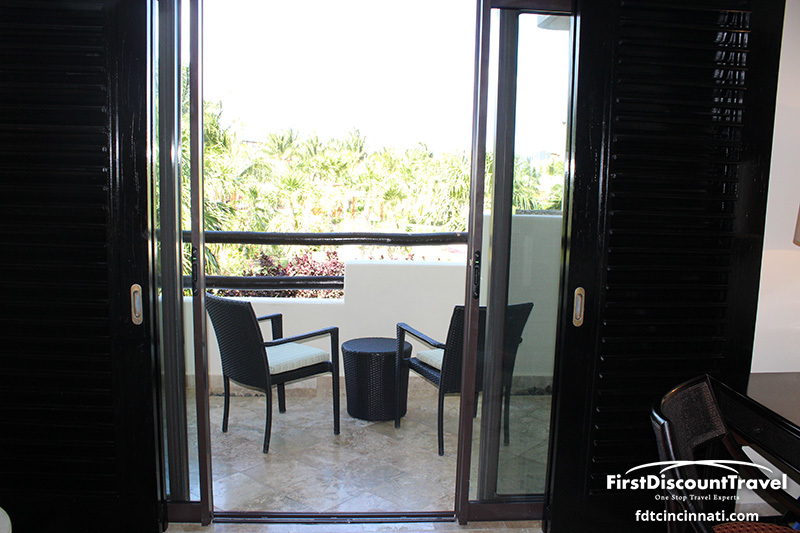 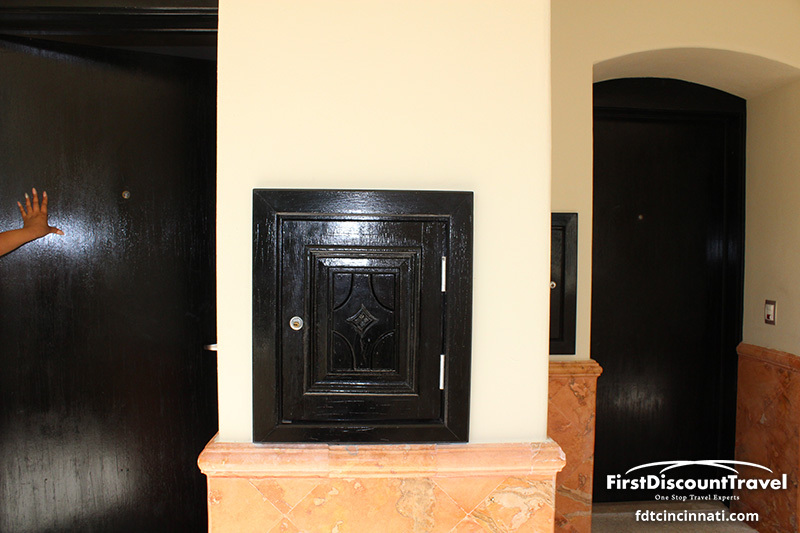 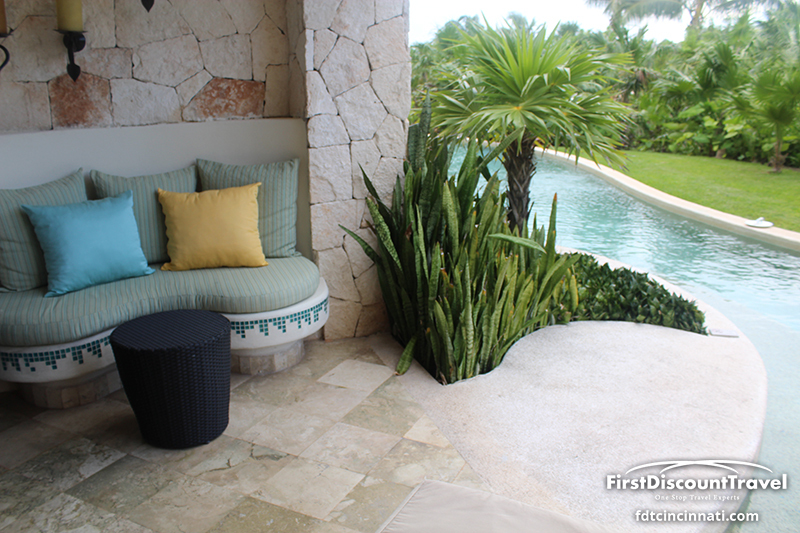 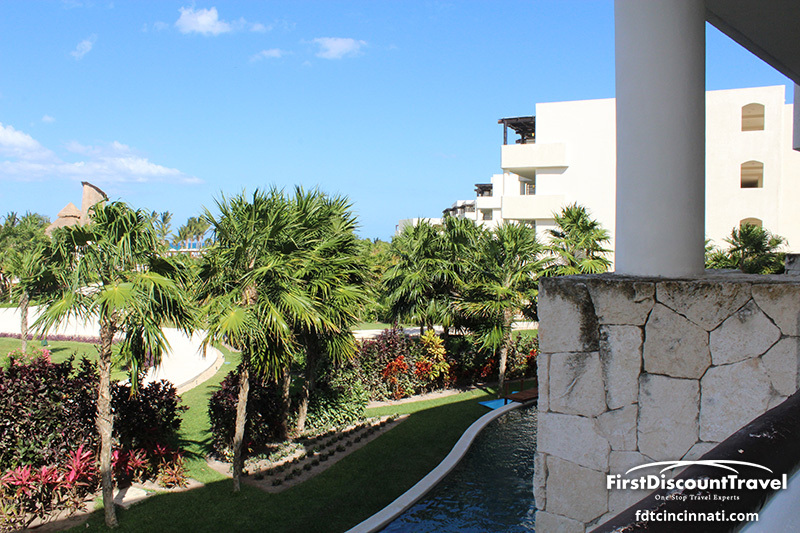 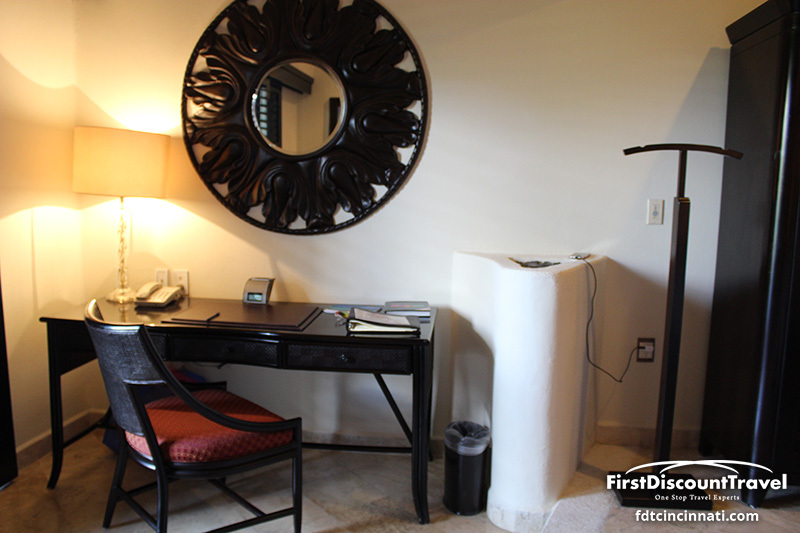 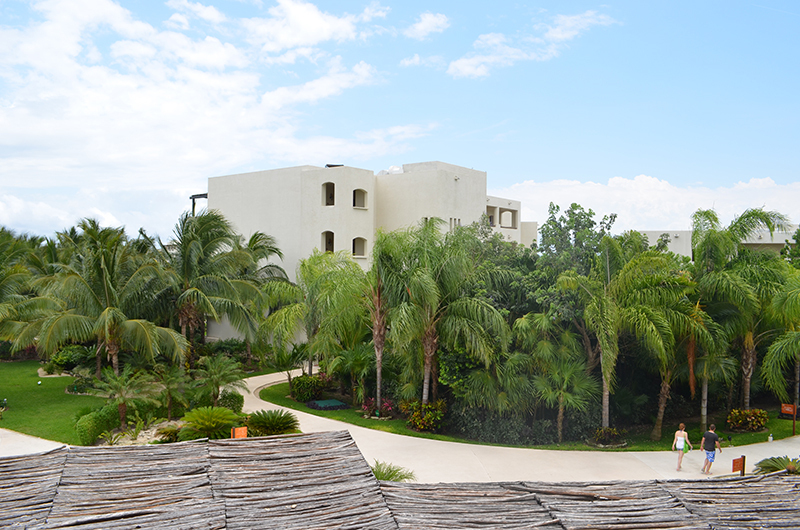 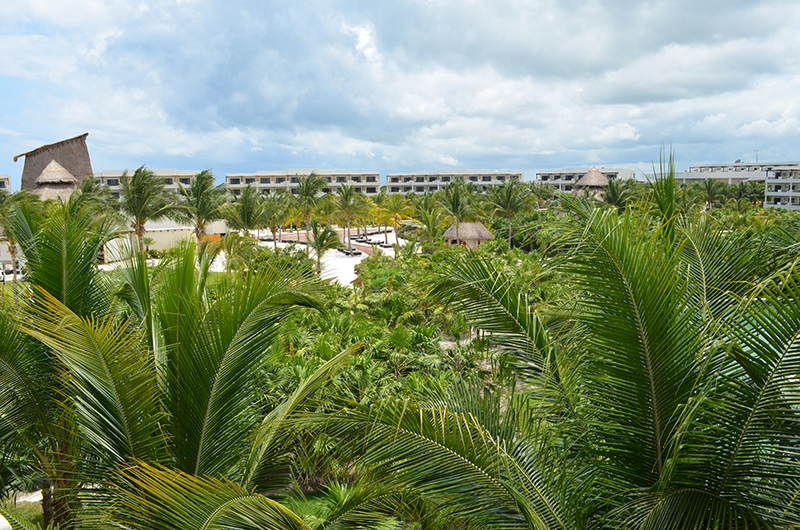 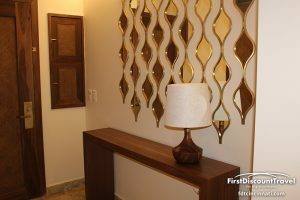 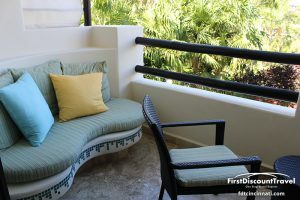 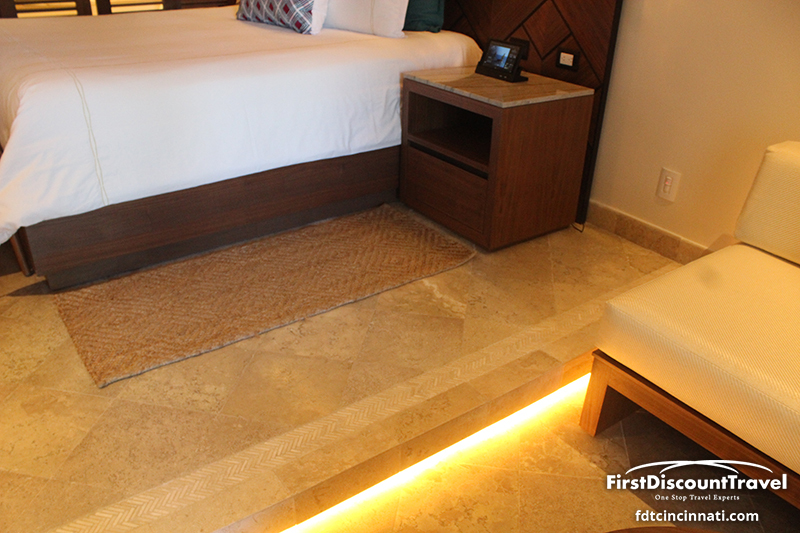 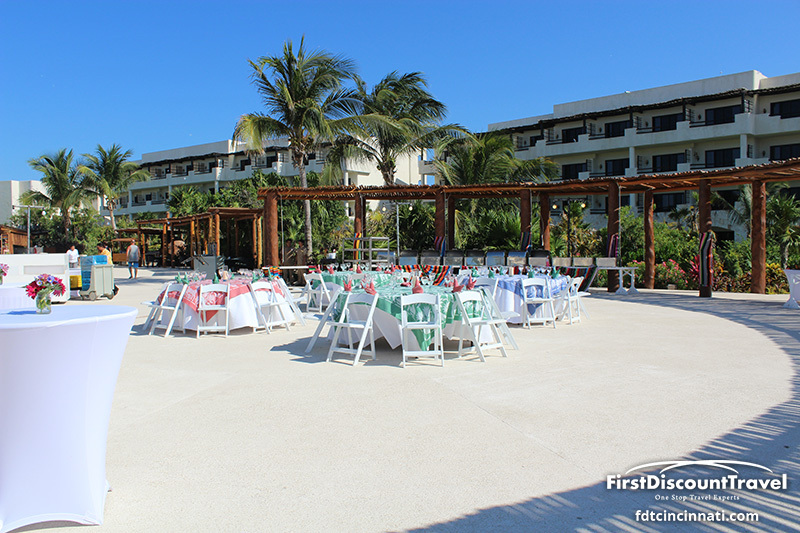 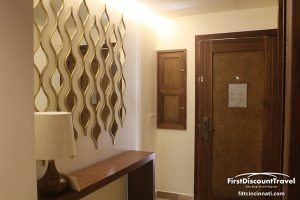 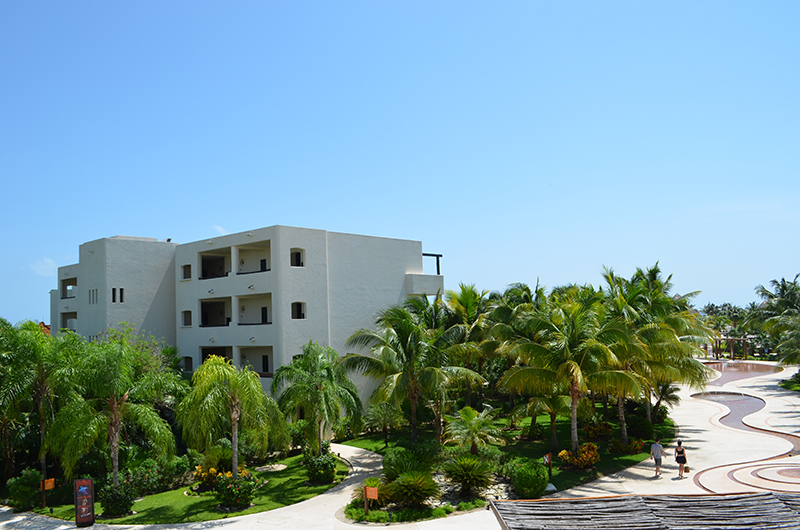 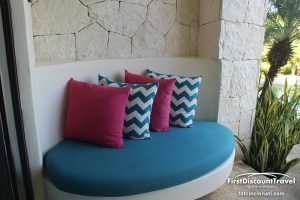 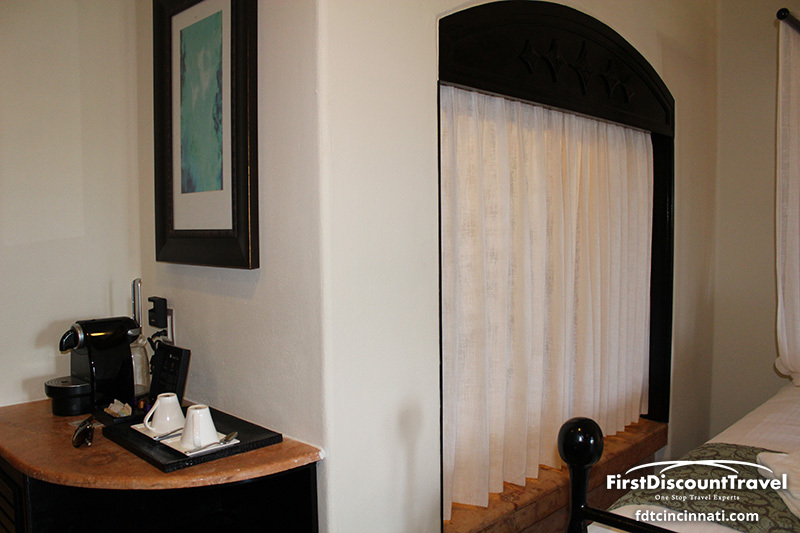 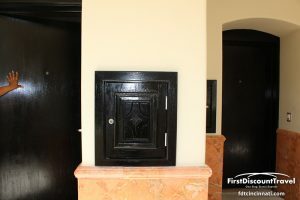 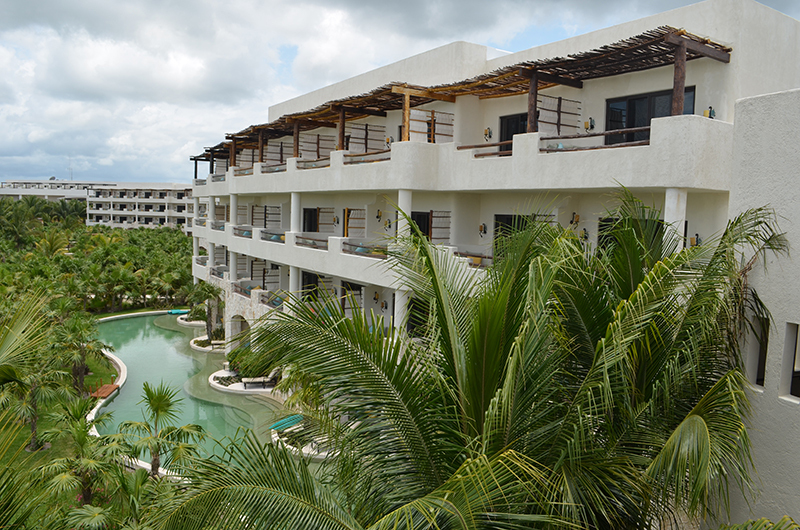 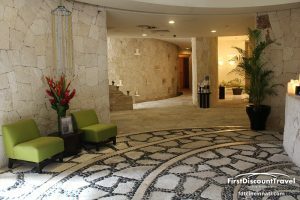 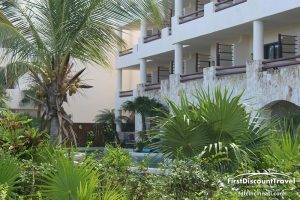 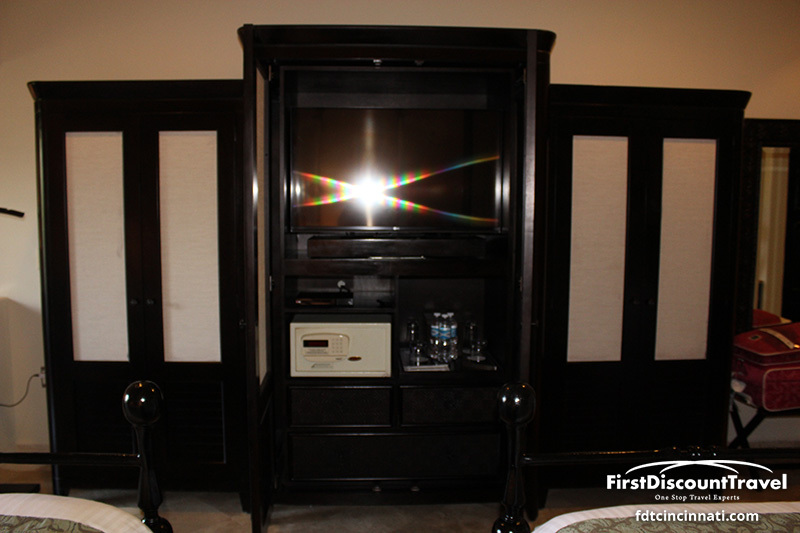 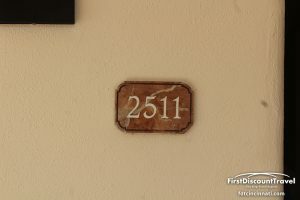 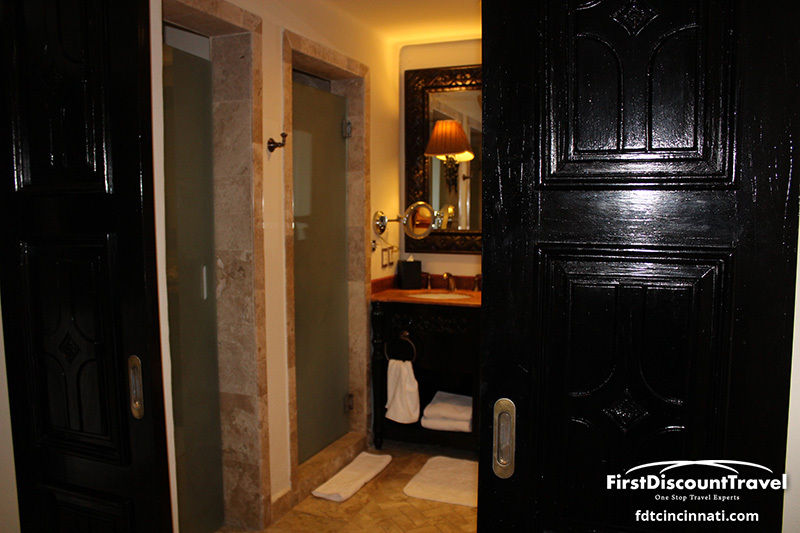 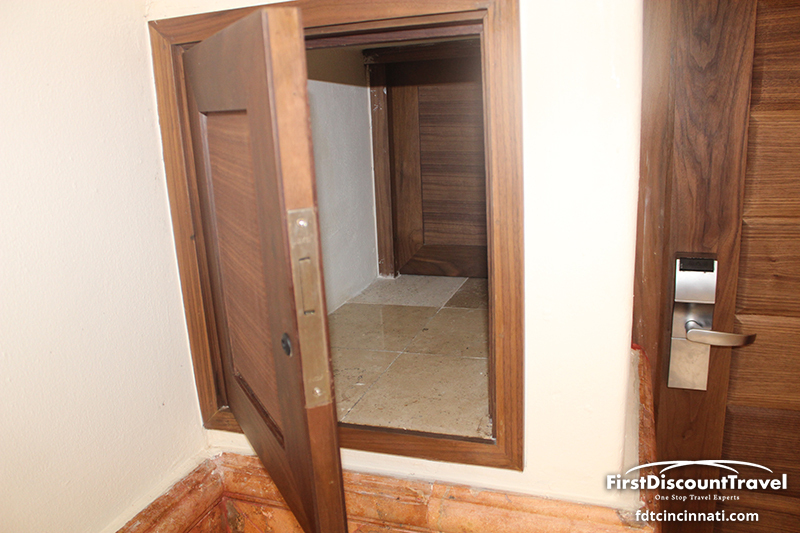 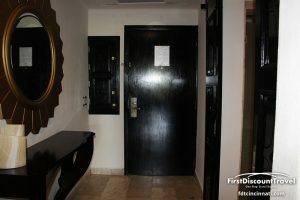 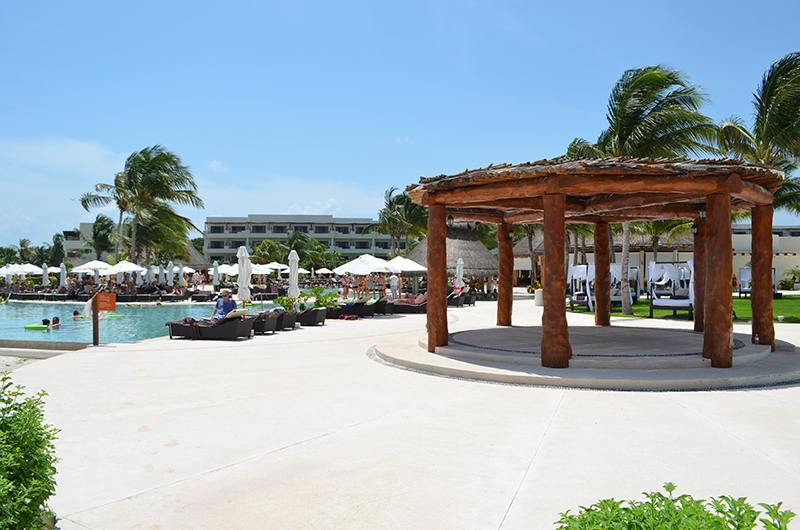 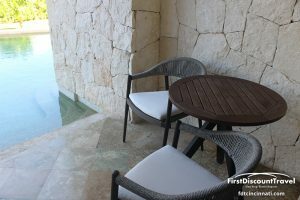 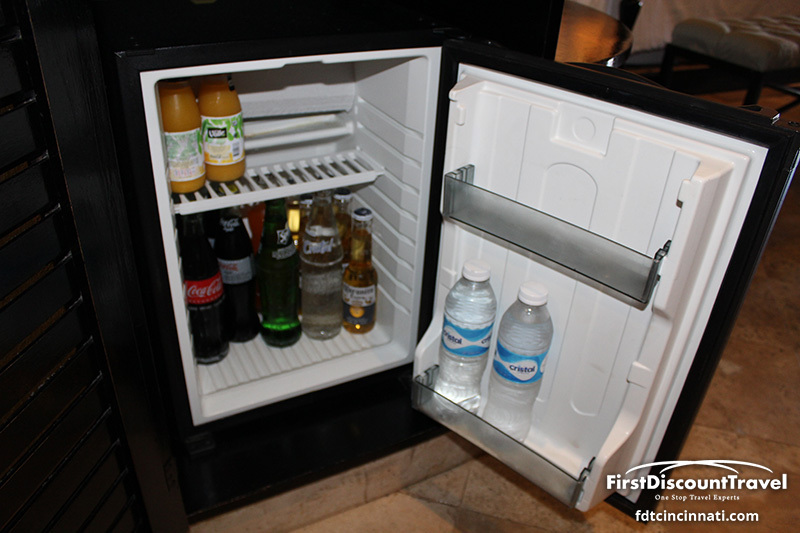 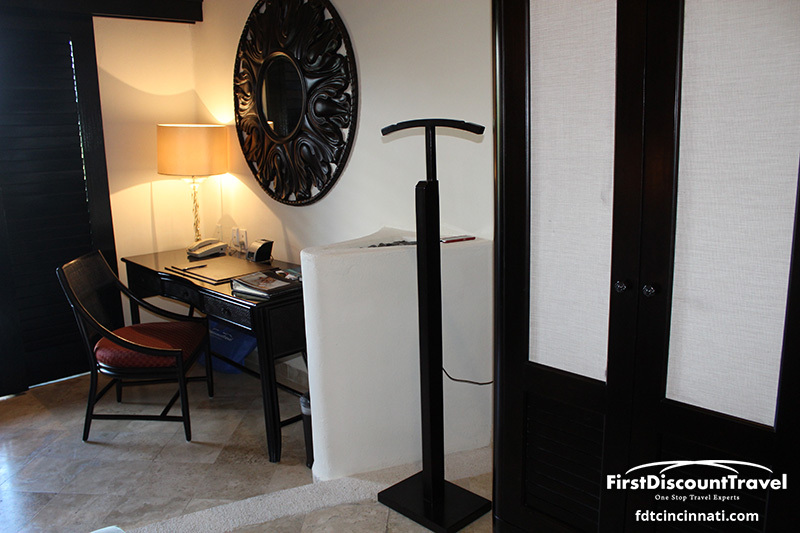 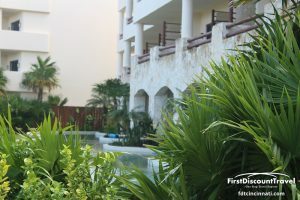 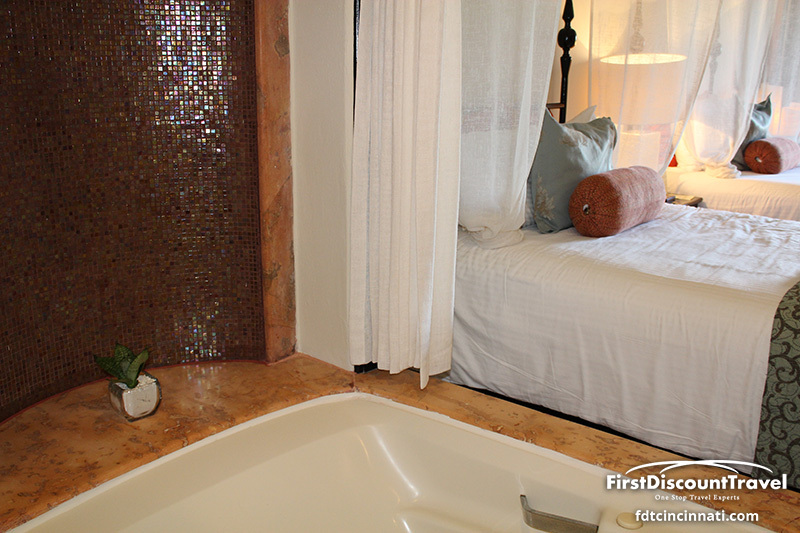 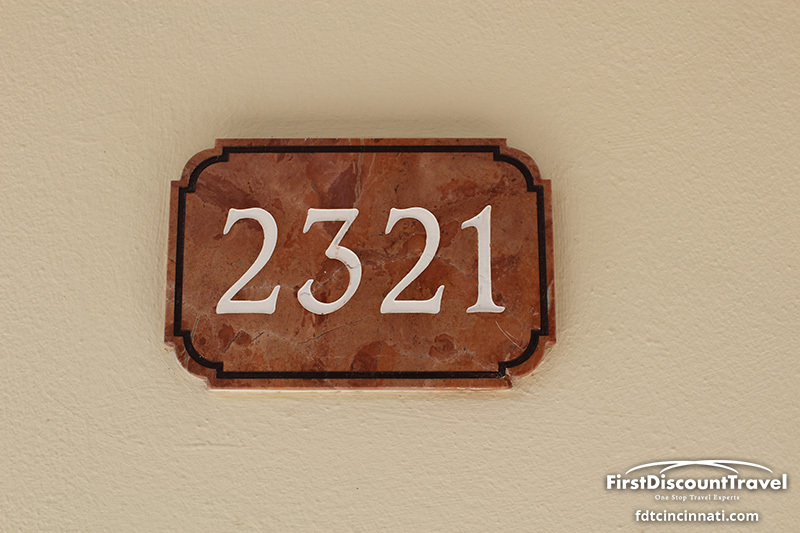 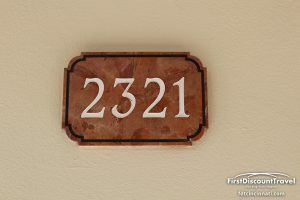 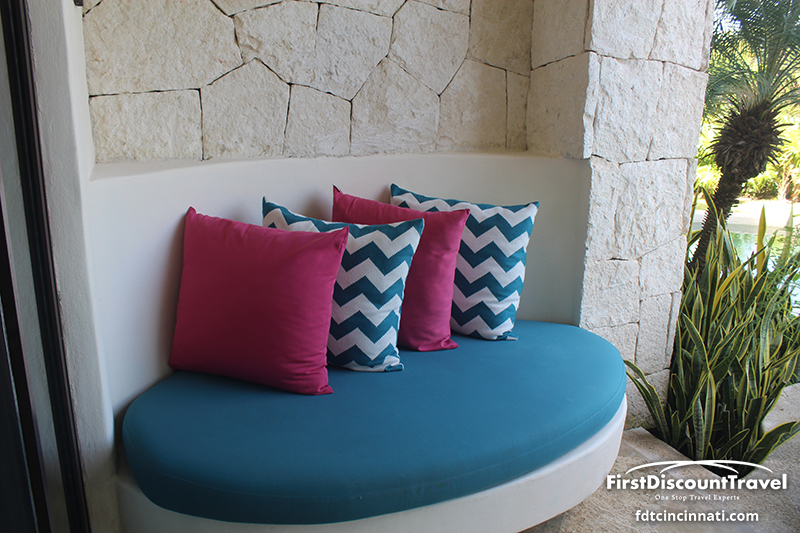 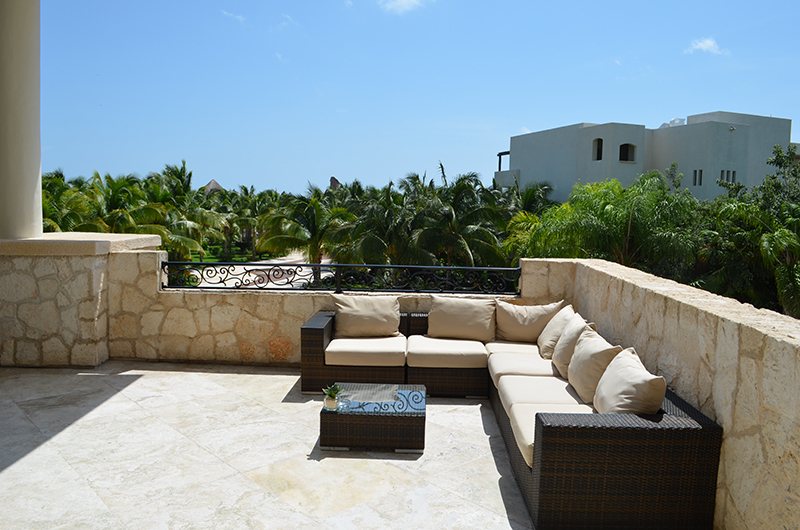 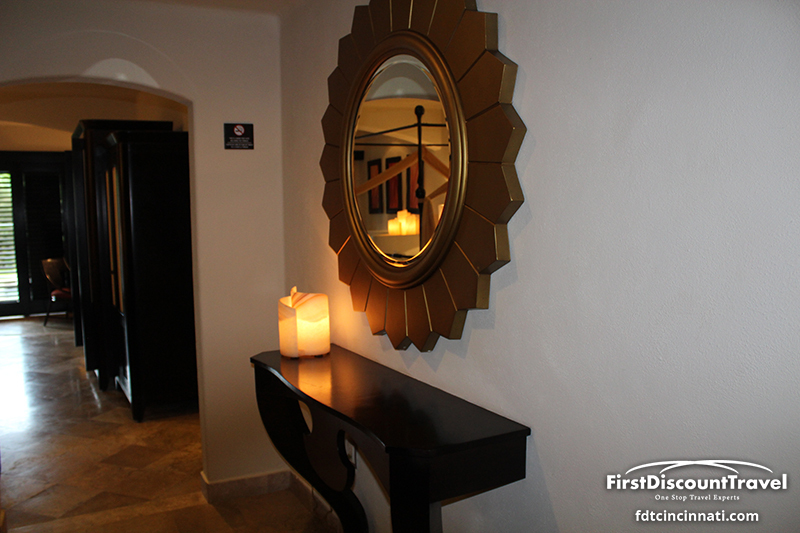 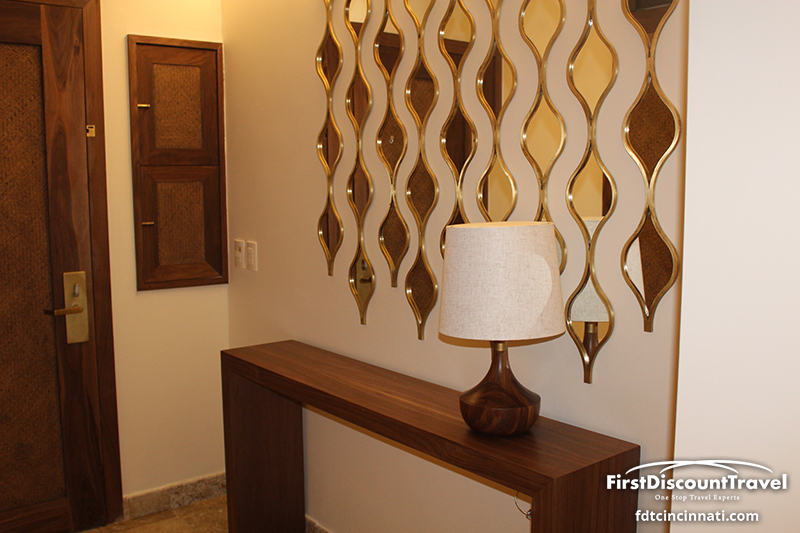 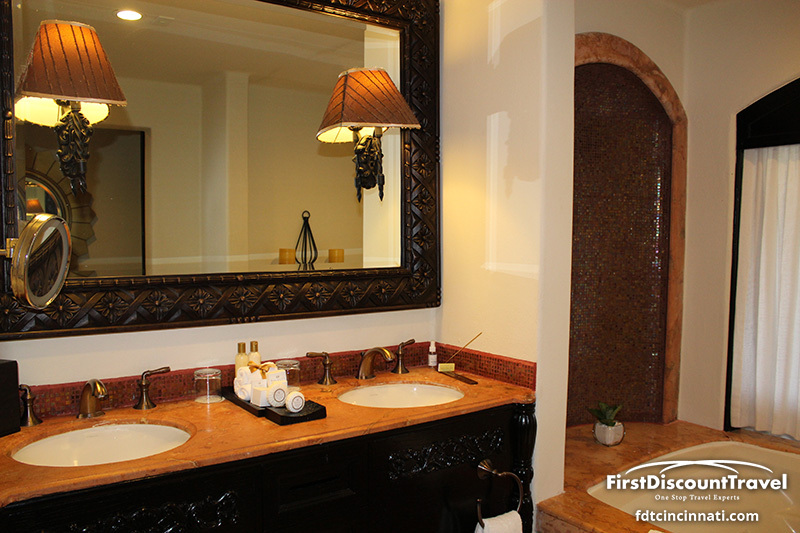 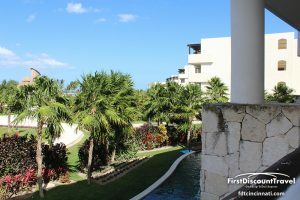 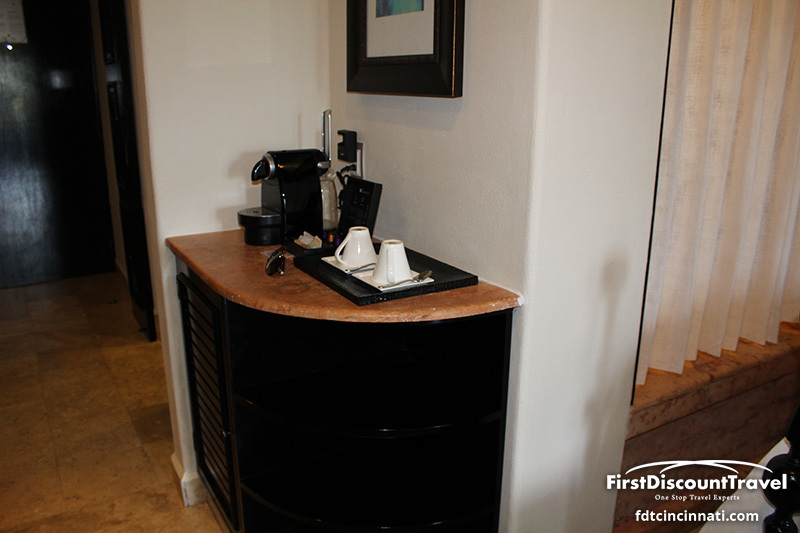 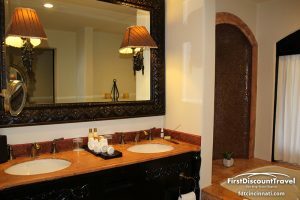 Secrets Maroma has 412 junior suites which are identical in layout, with location, view, amenities, and Preferred Club being the distinguishing features. 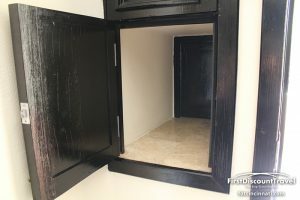 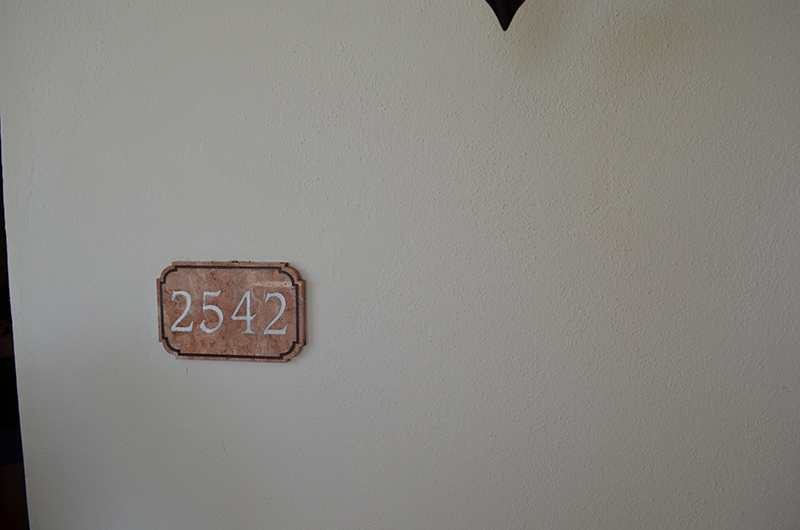 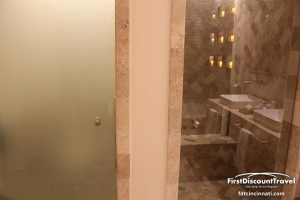 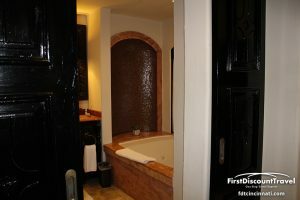 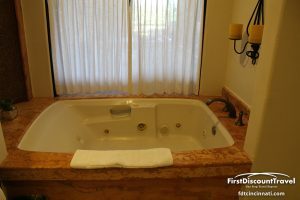 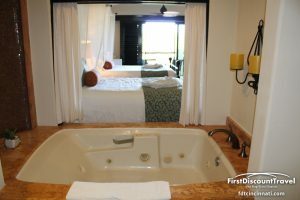 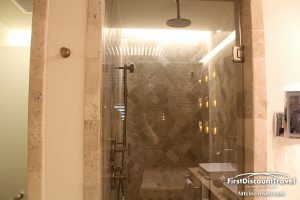 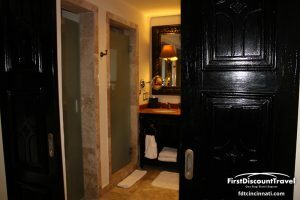 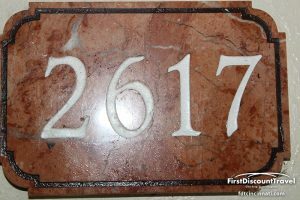 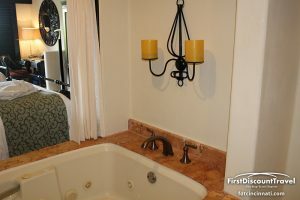 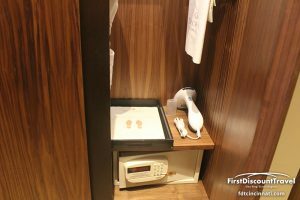 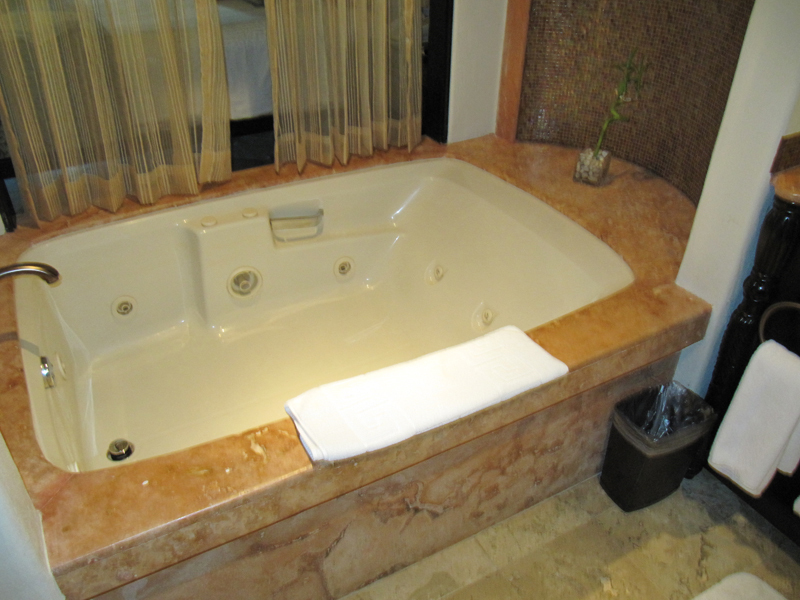 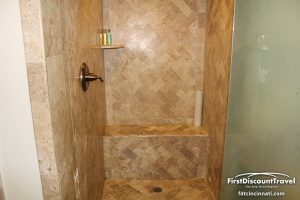 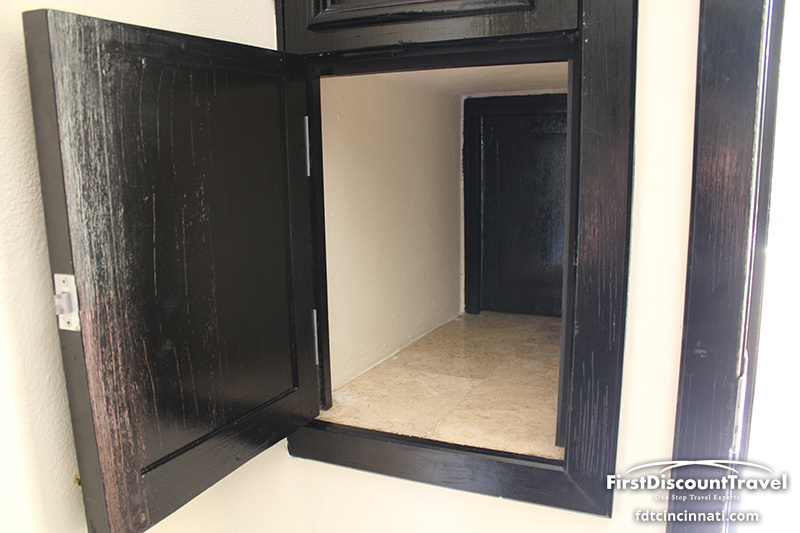 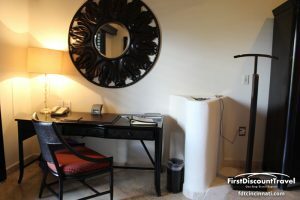 All of the Jr suites are 624 square feet with double vanity, Jacuzzi for two in the living room, fully stocked minibar, and 24 hour room service. 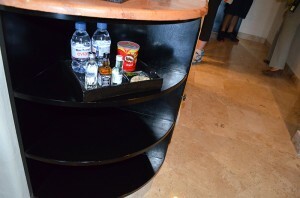 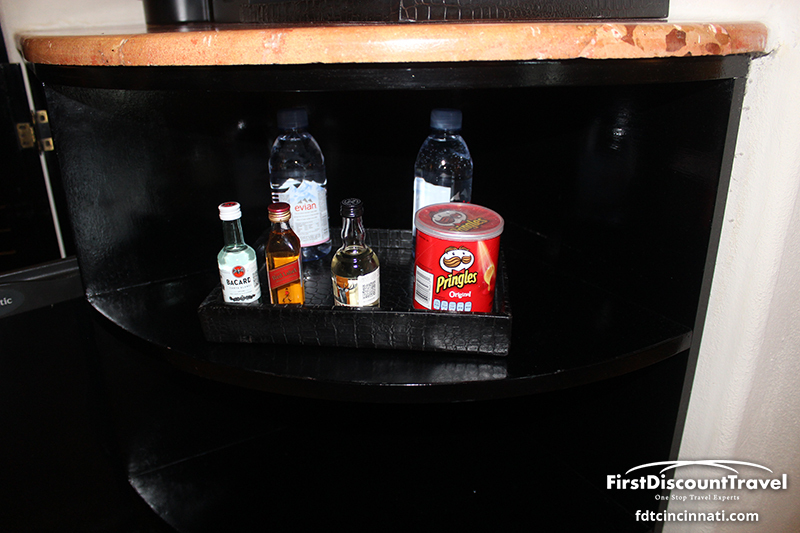 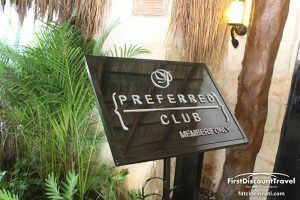 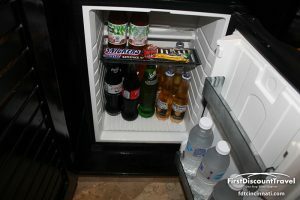 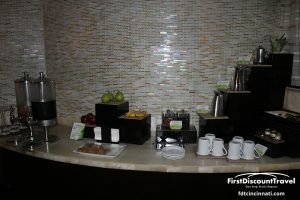 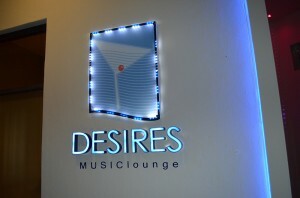 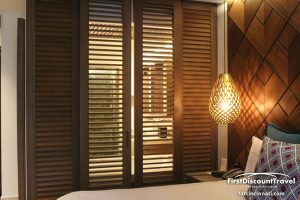 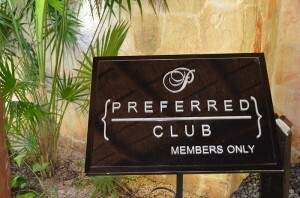 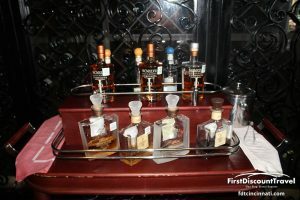 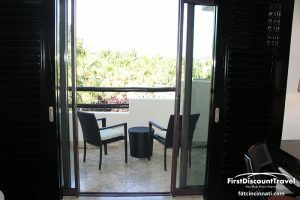 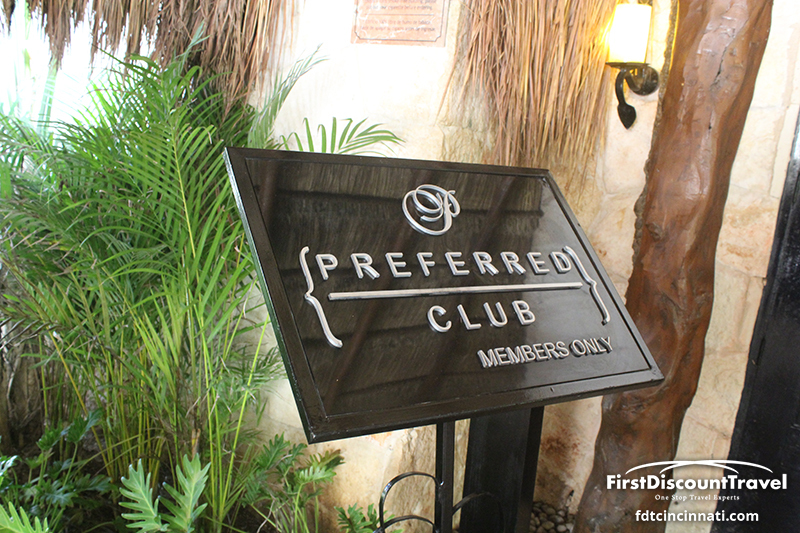 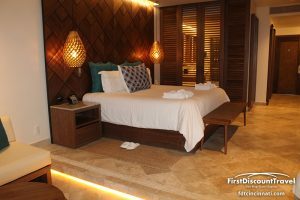 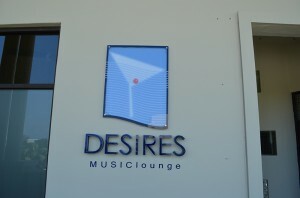 The main benefits to the Preferred Club is the soaking tub on the patio or balcony, snacks and liquor in the minibar, super premium (Grey Goose and Ketel One) liquor in the Preferred Club, private check-in, and free internet access. 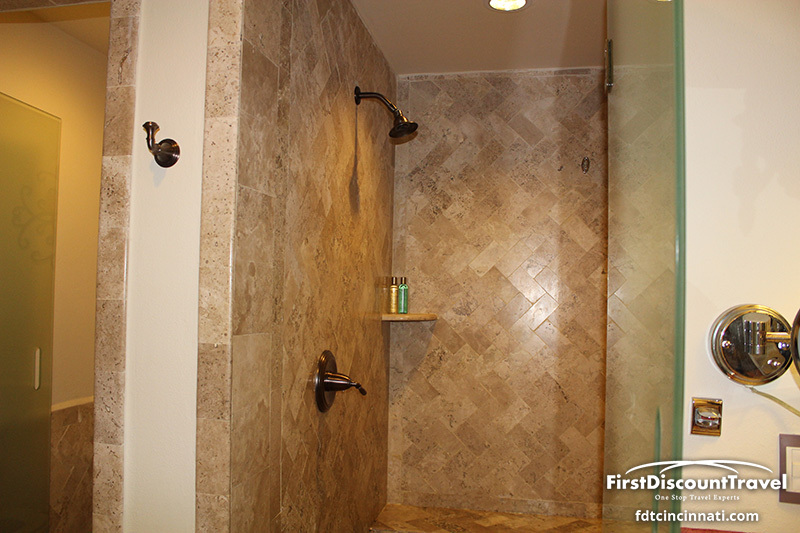 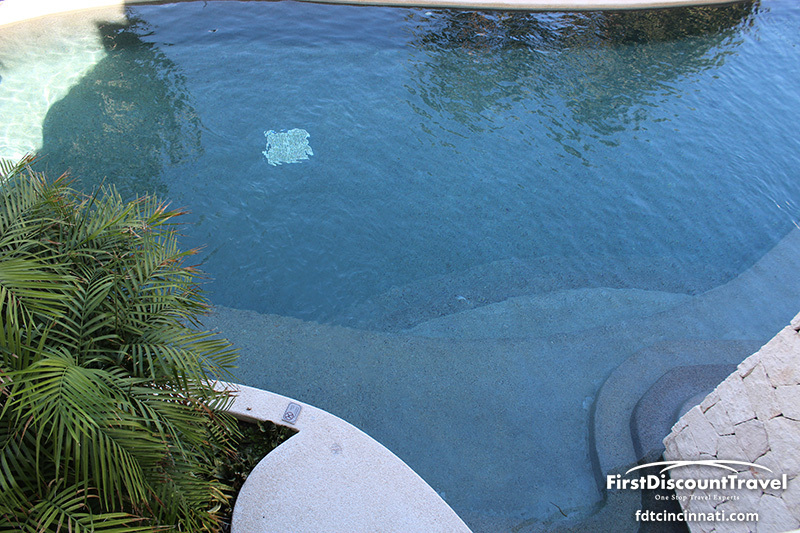 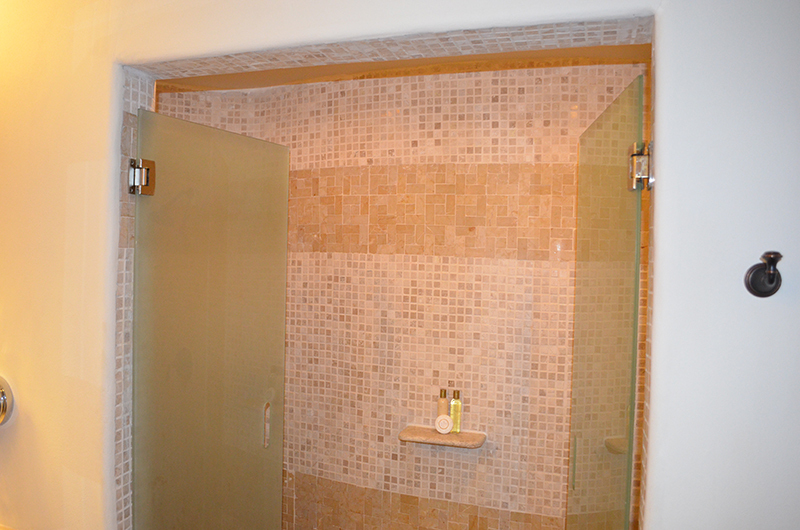 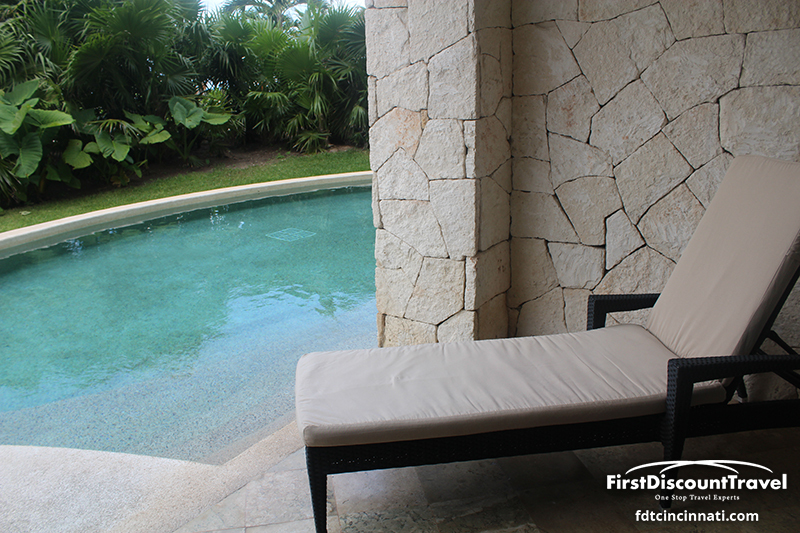 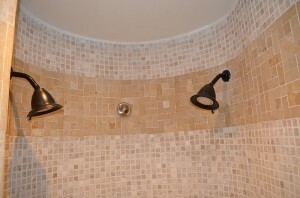 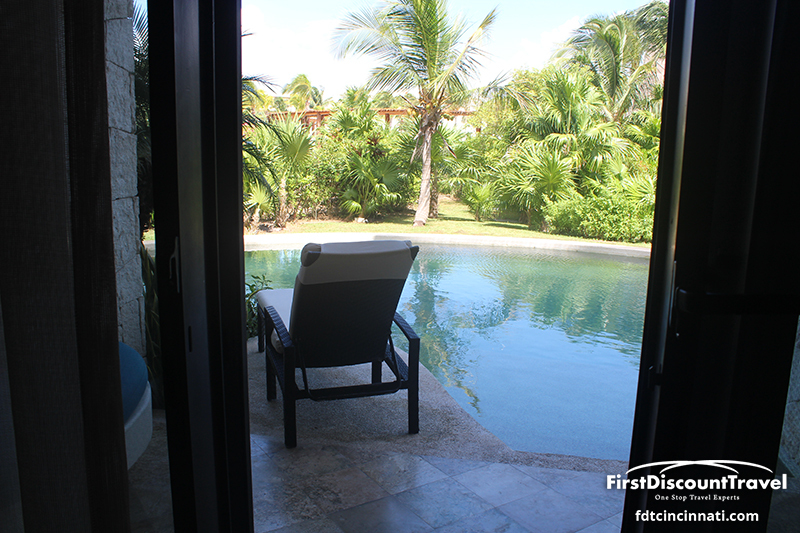 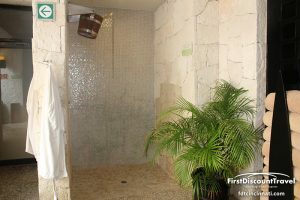 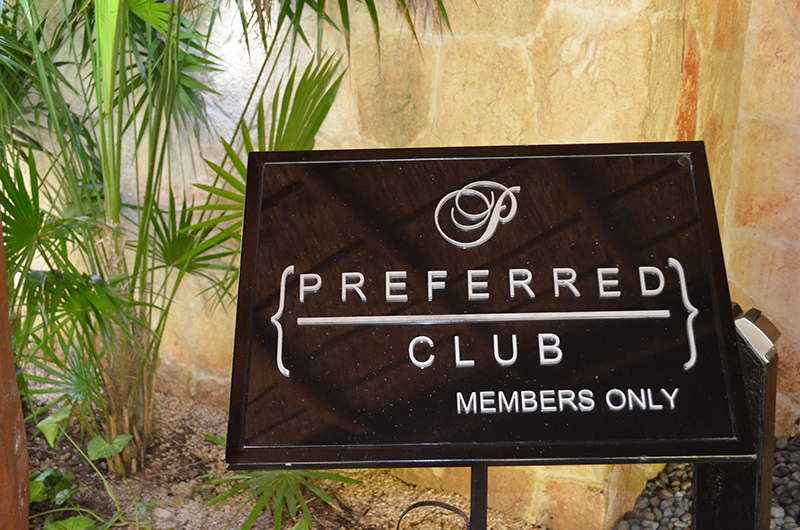 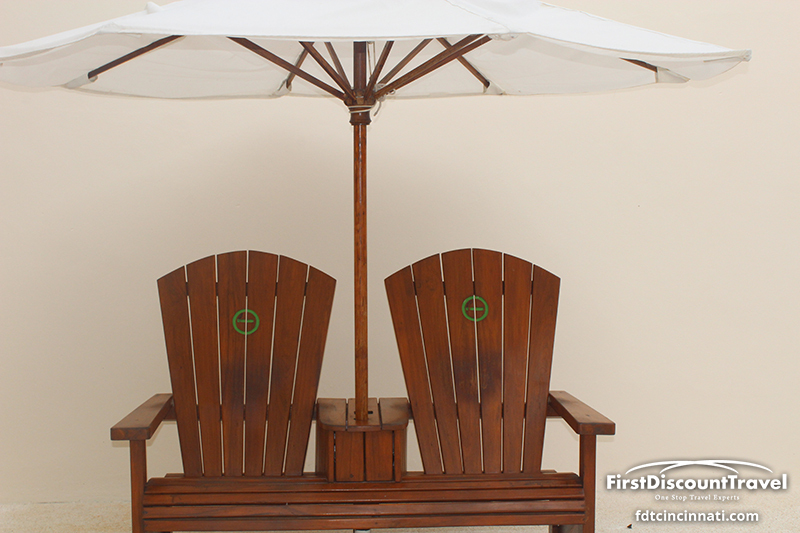 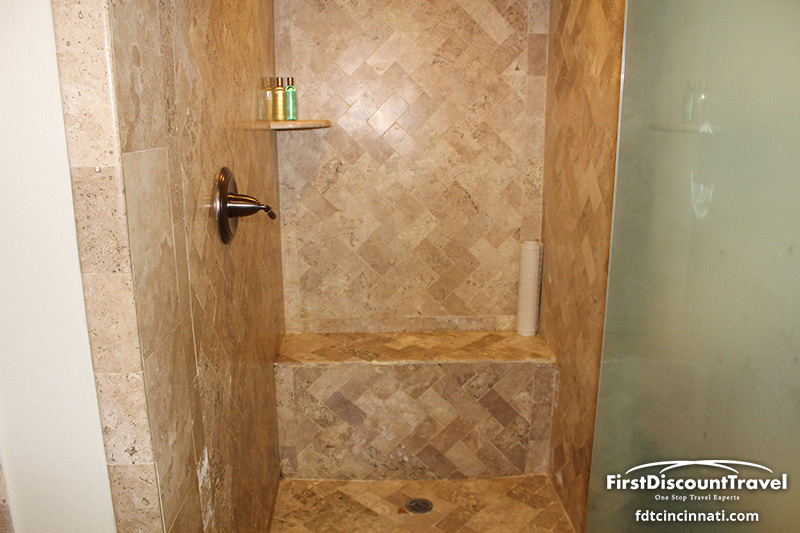 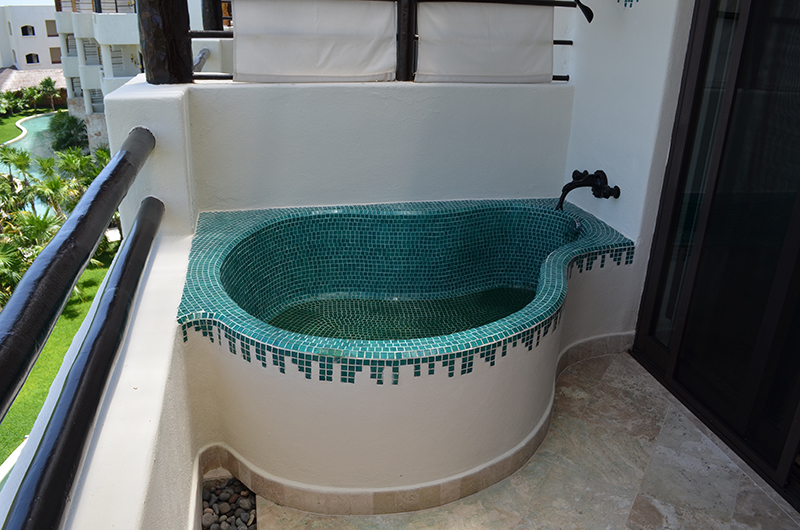 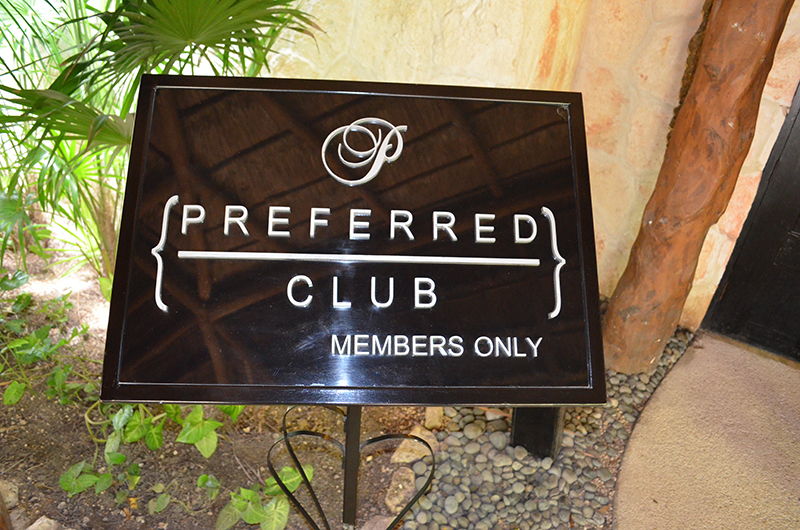 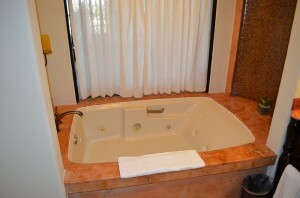 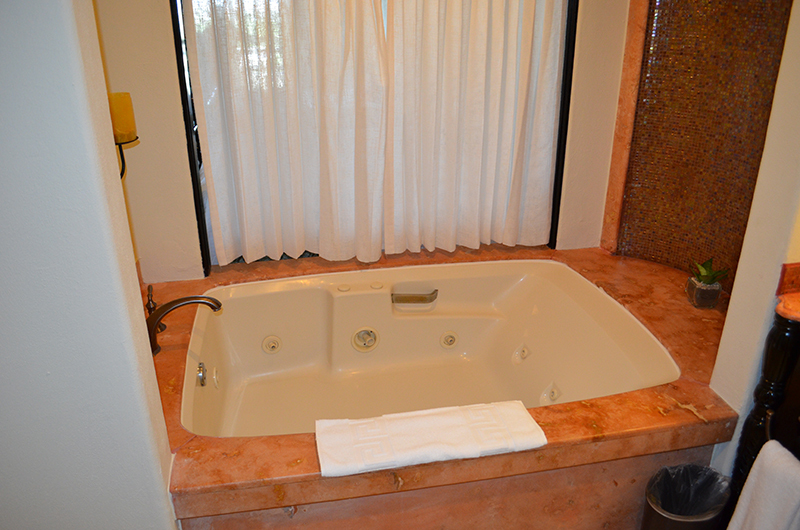 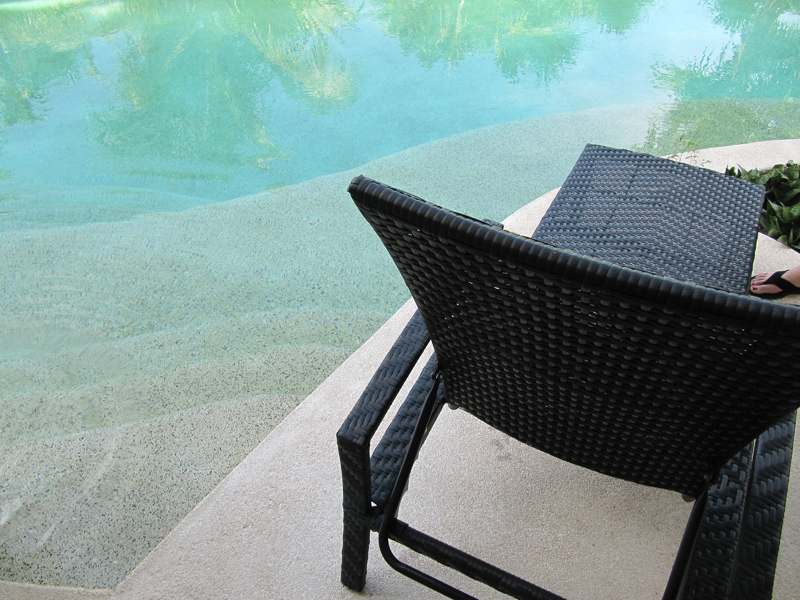 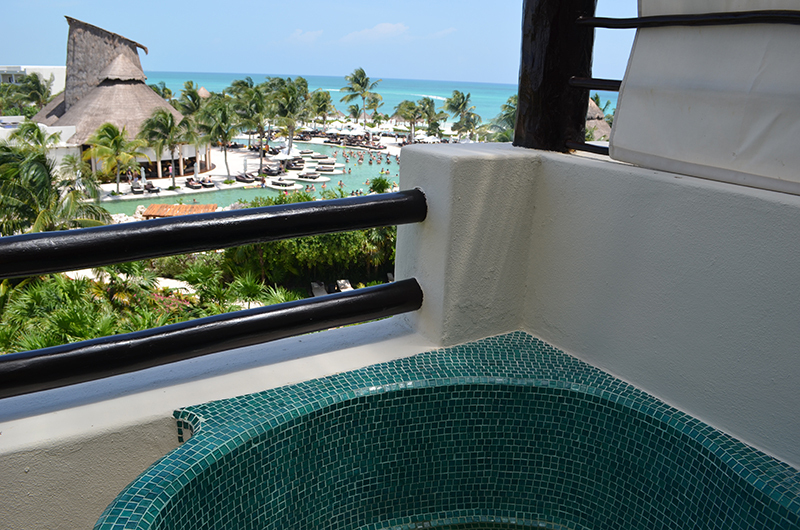 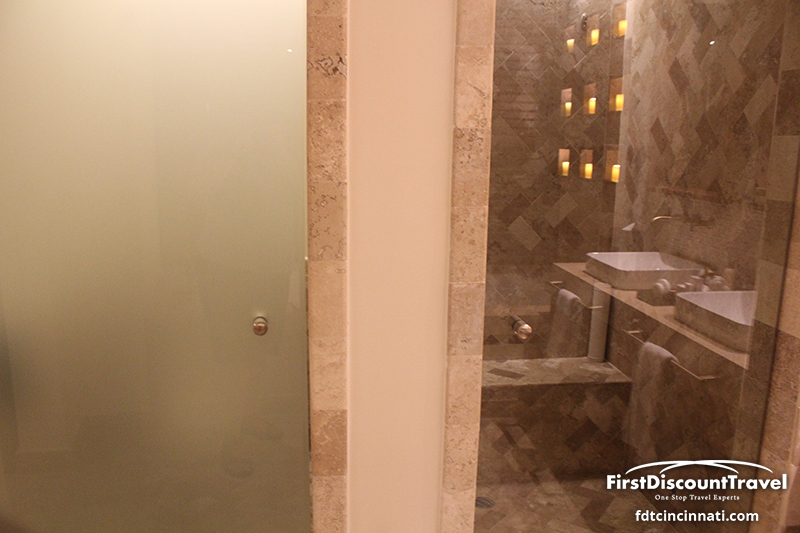 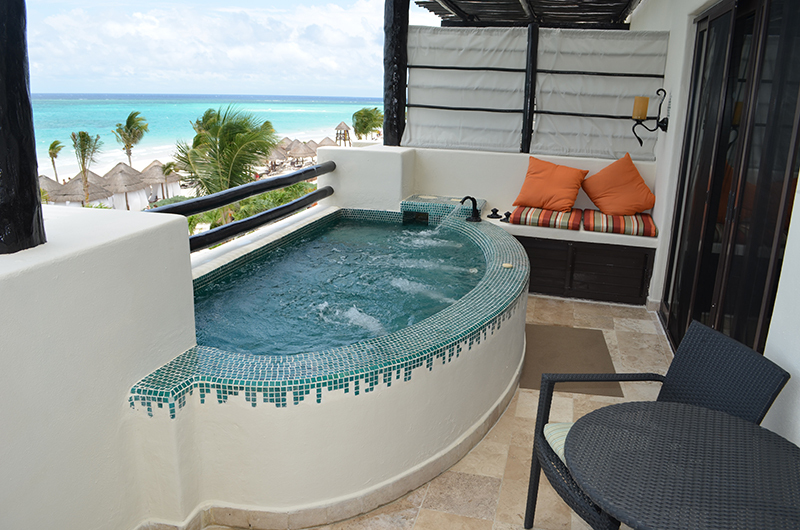 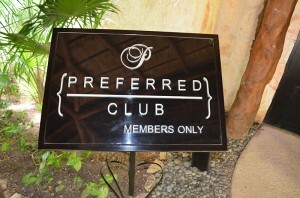 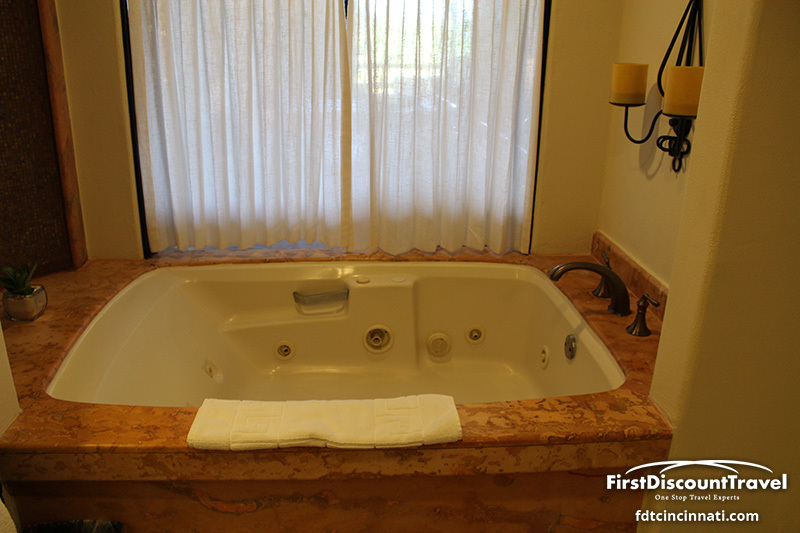 The Preferred Club swim out rooms do not have soaking tubs on the patio but offer direct entrance into the pool. 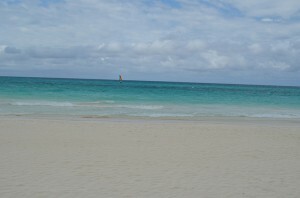 I can’t stress enough how gorgeous the beach is! 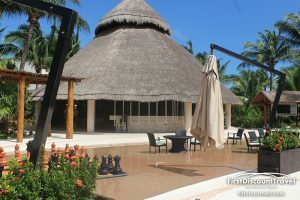 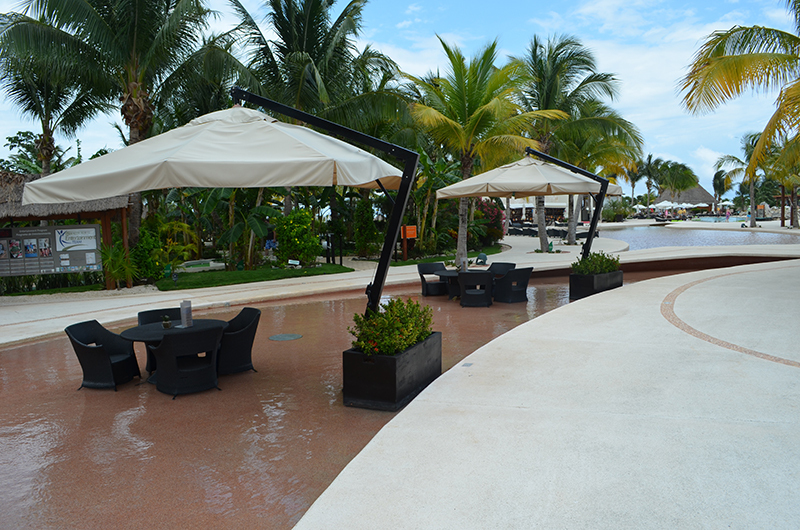 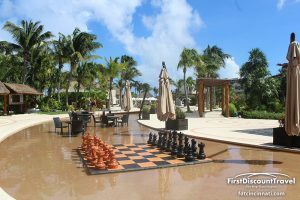 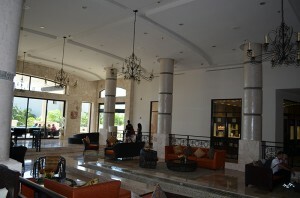 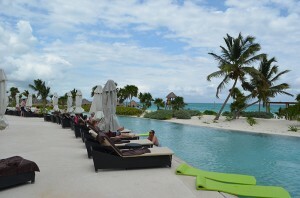 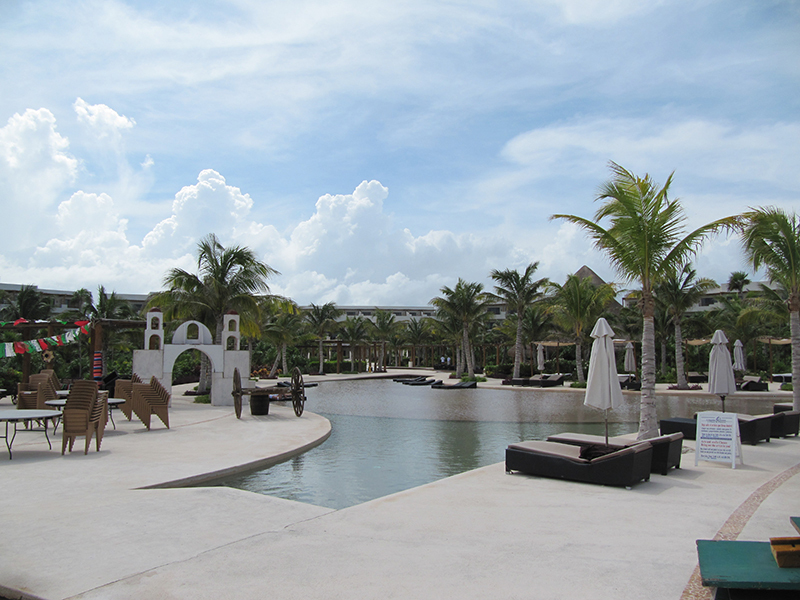 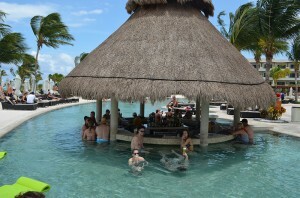 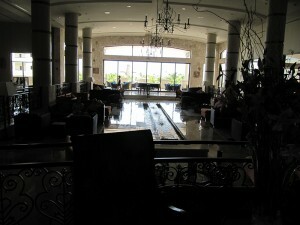 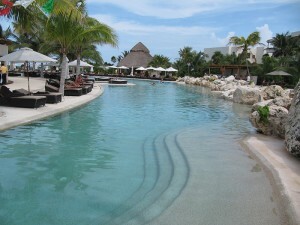 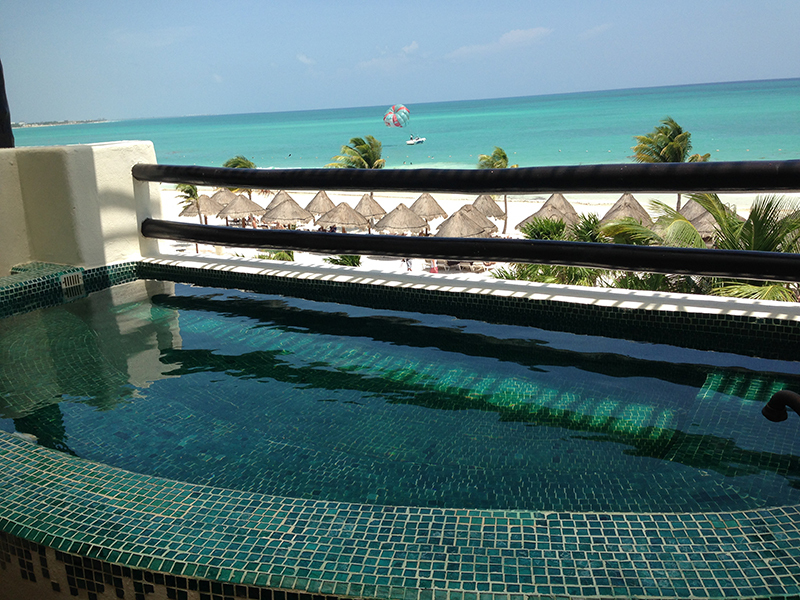 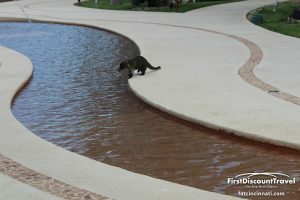 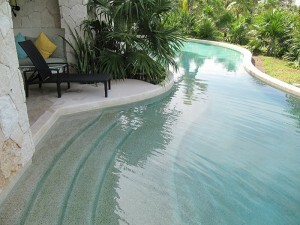 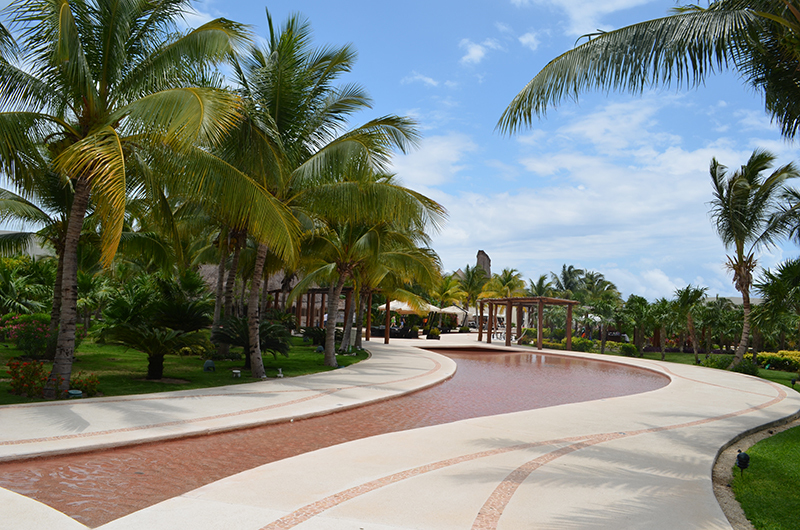 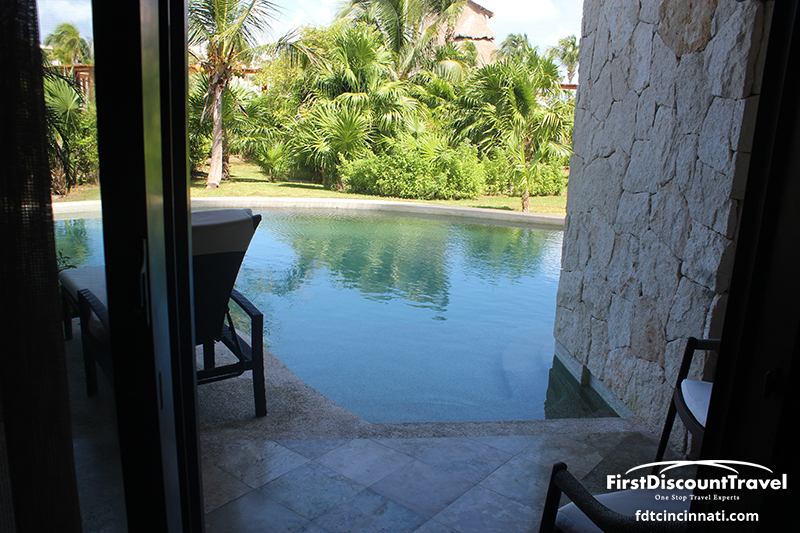 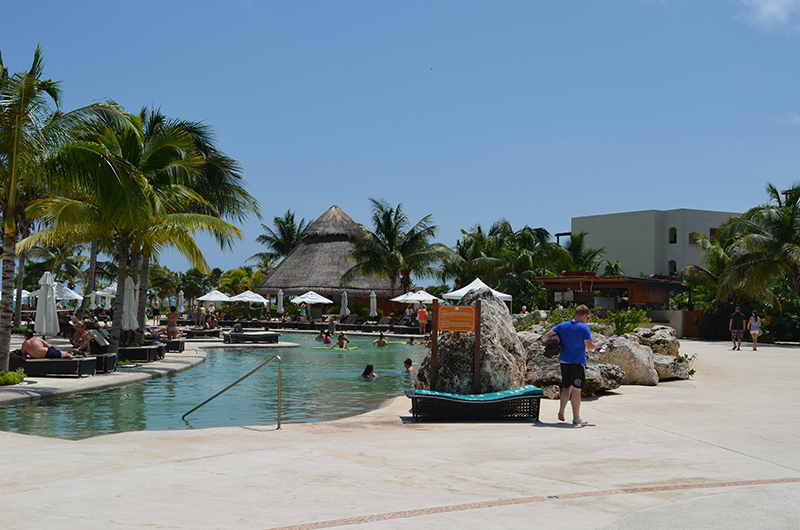 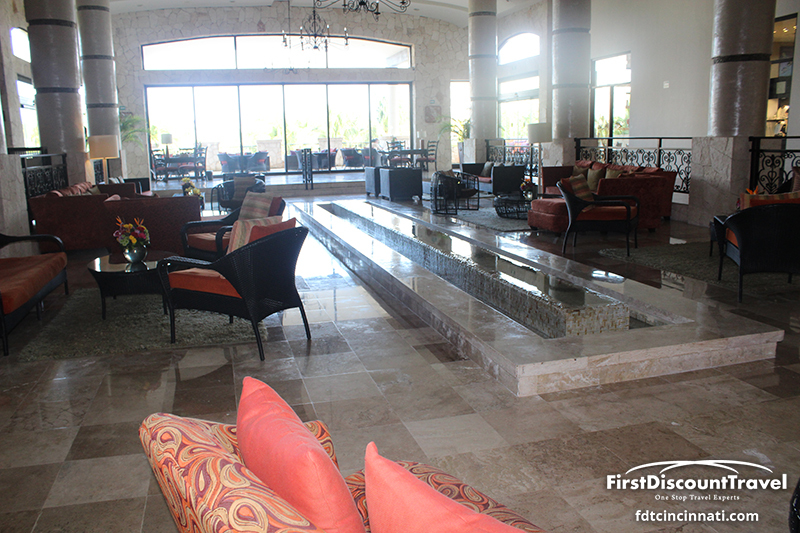 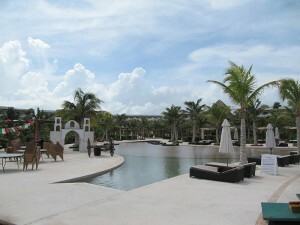 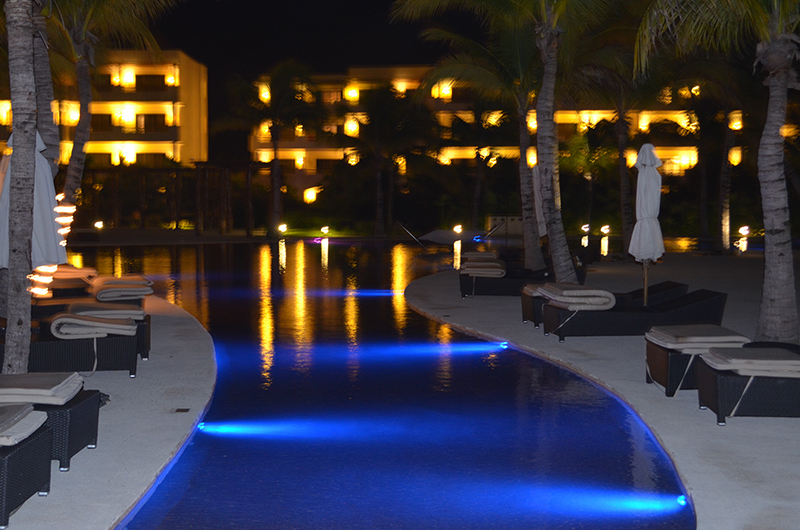 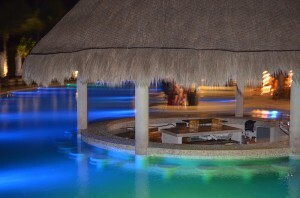 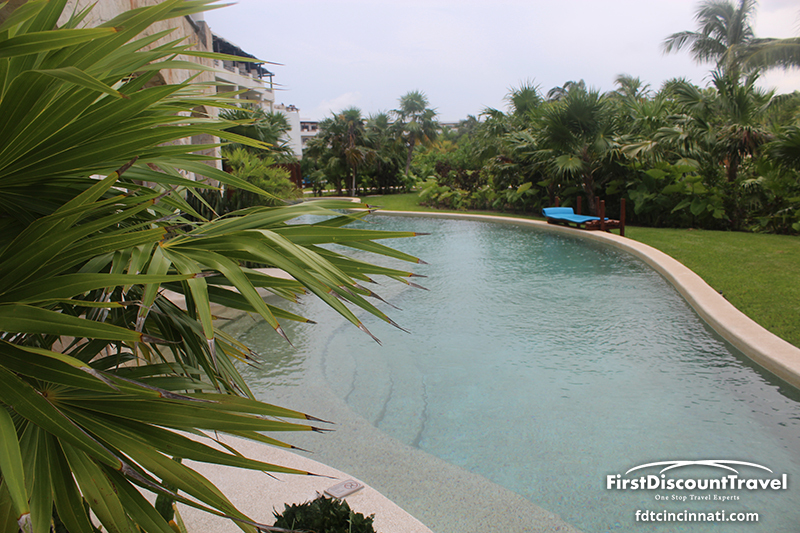 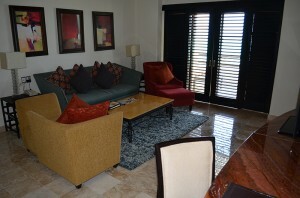 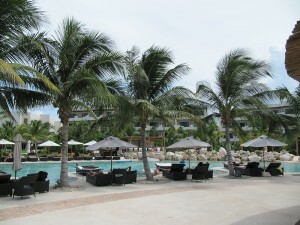 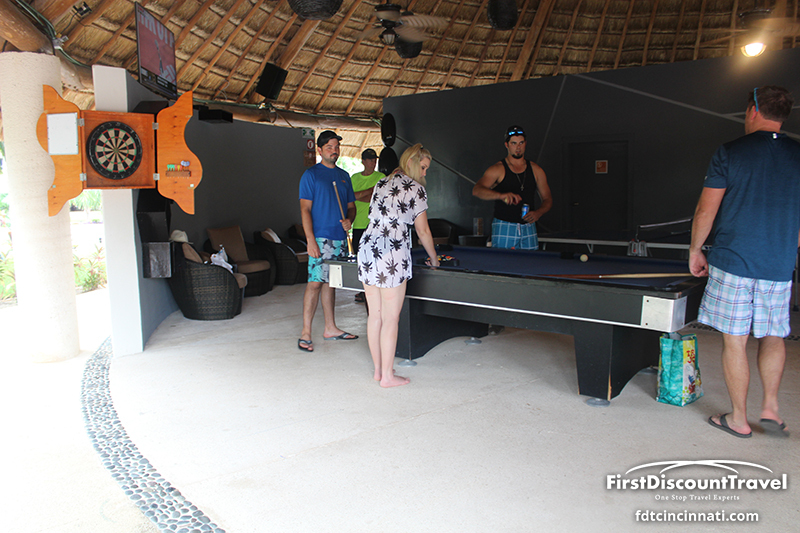 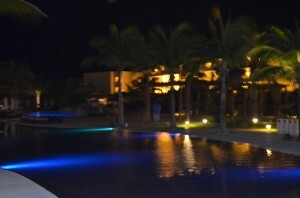 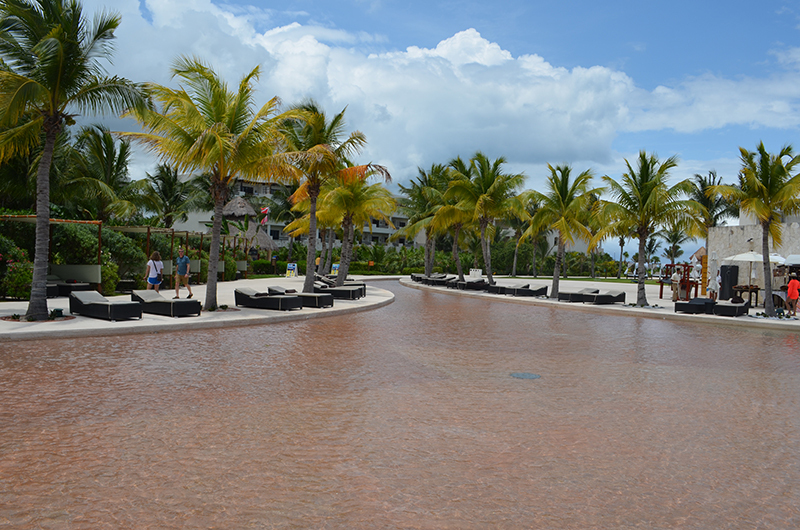 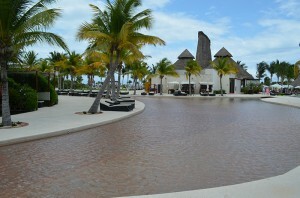 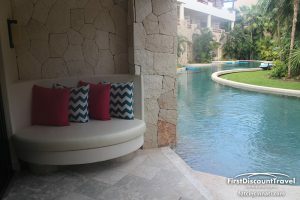 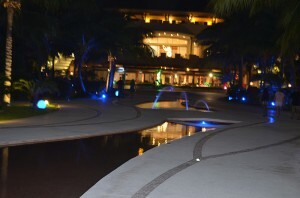 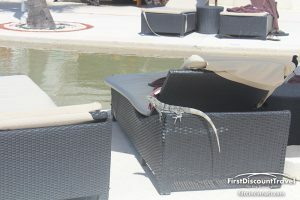 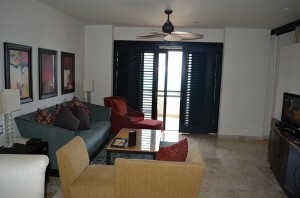 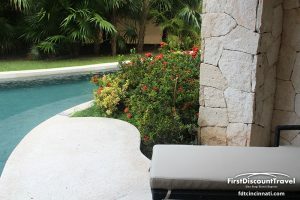 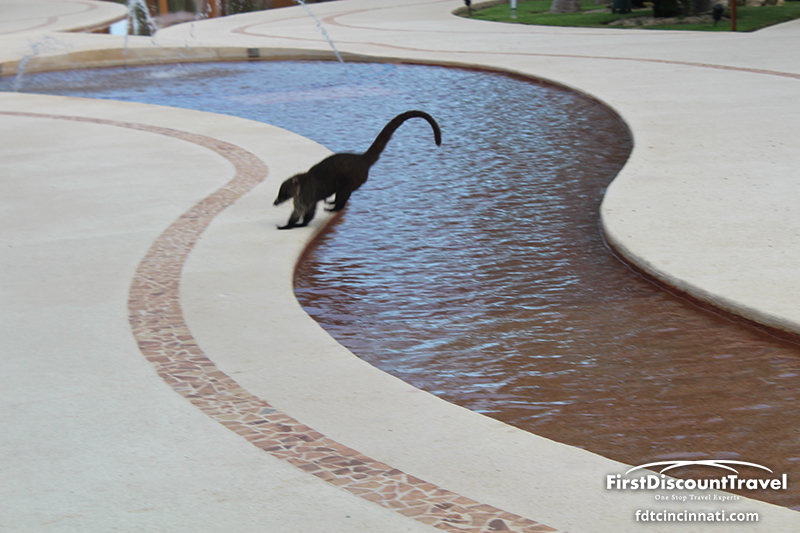 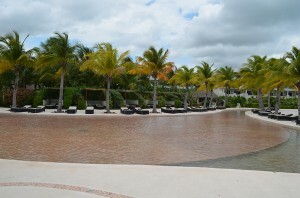 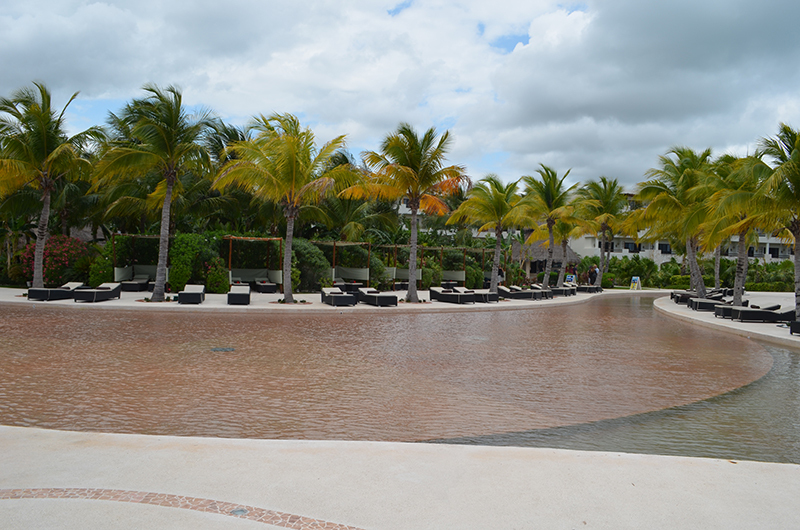 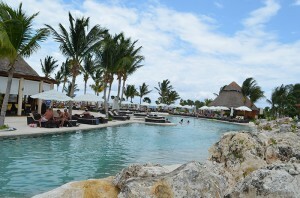 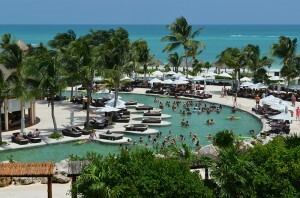 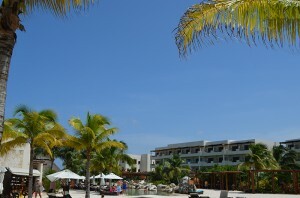 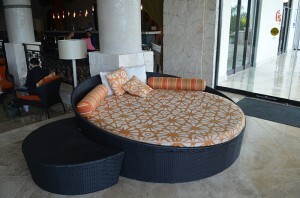 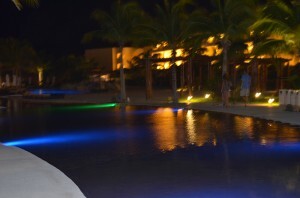 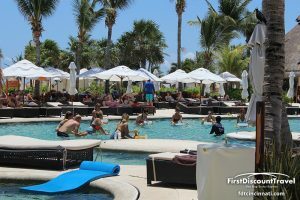 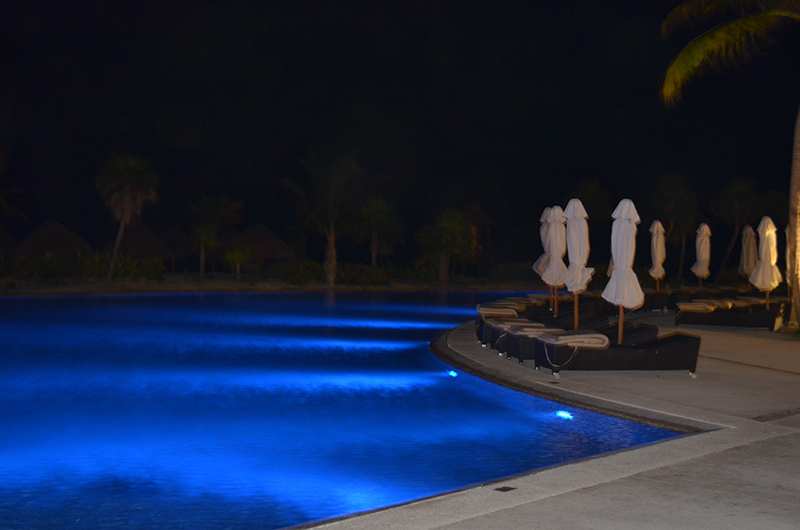 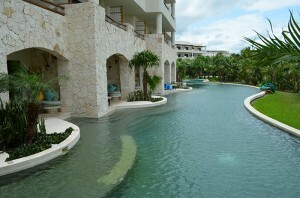 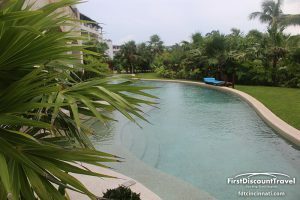 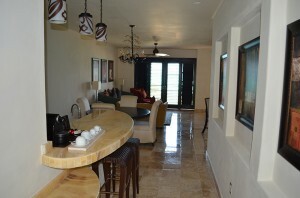 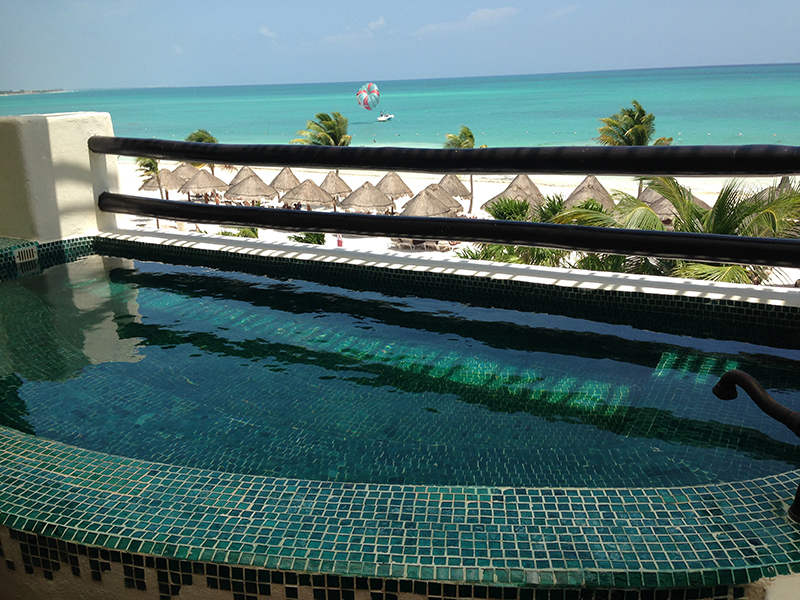 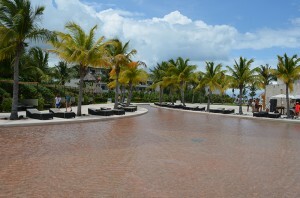 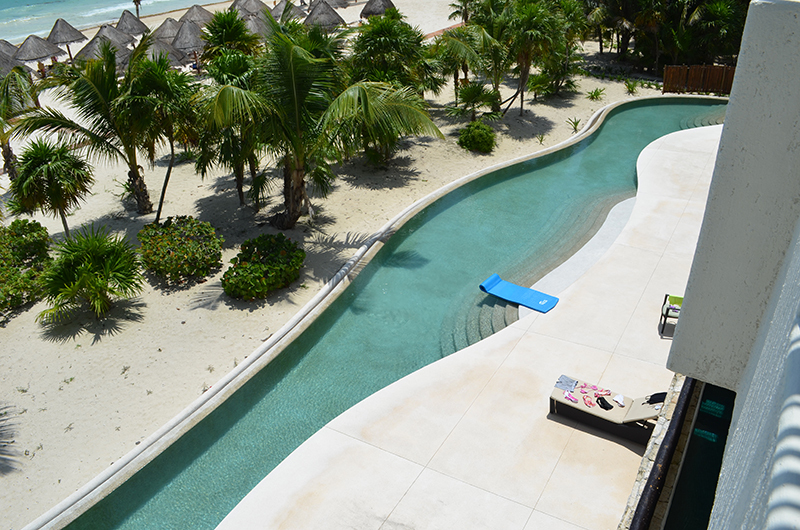 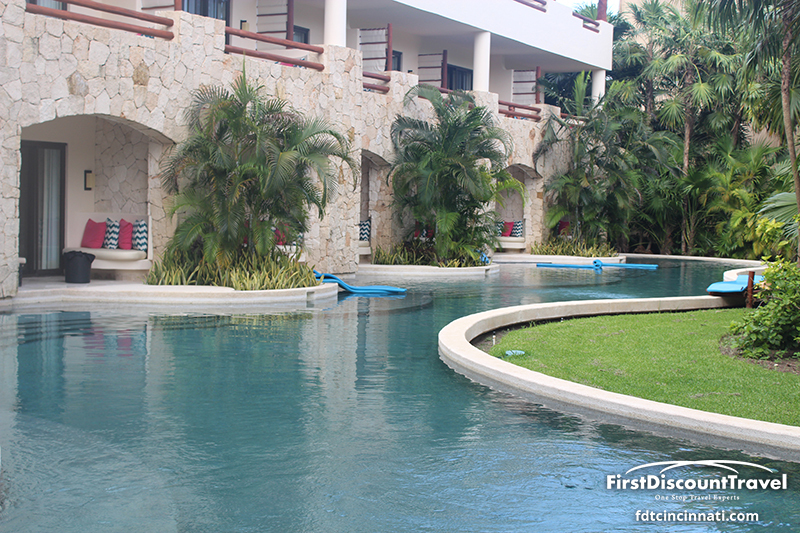 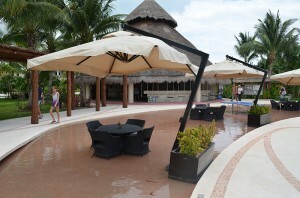 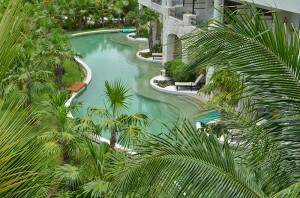 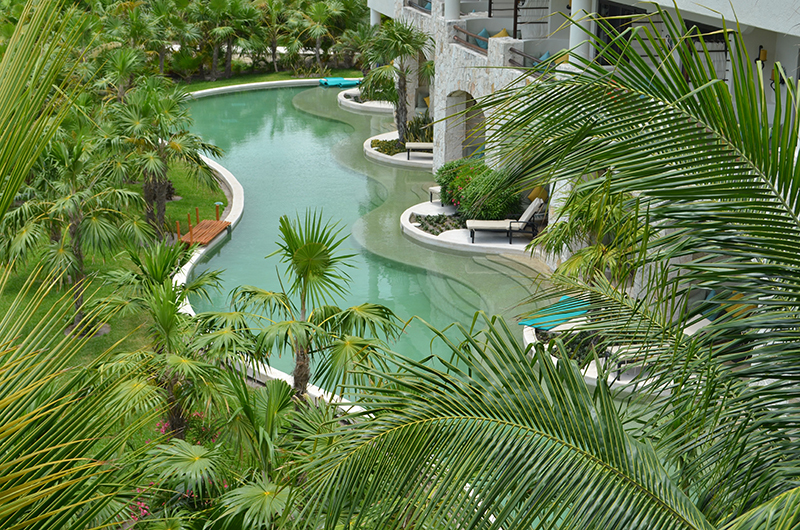 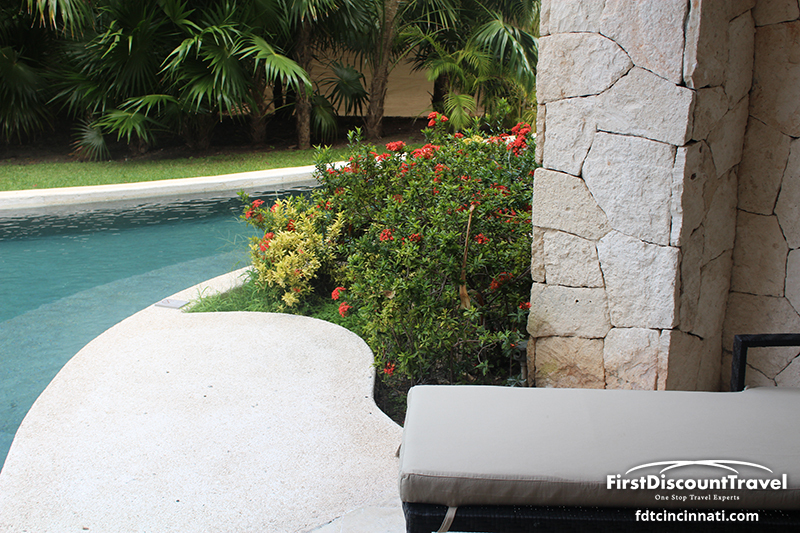 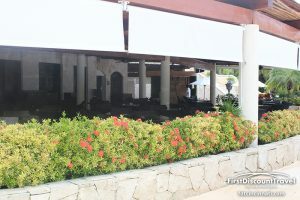 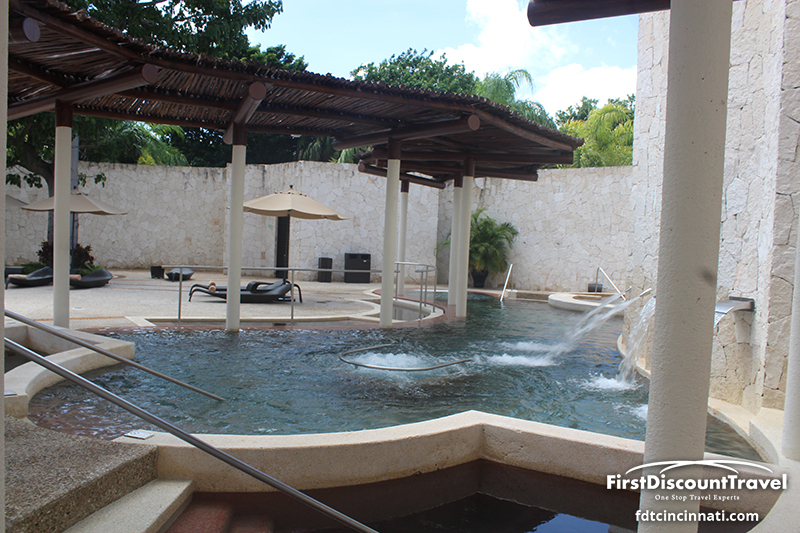 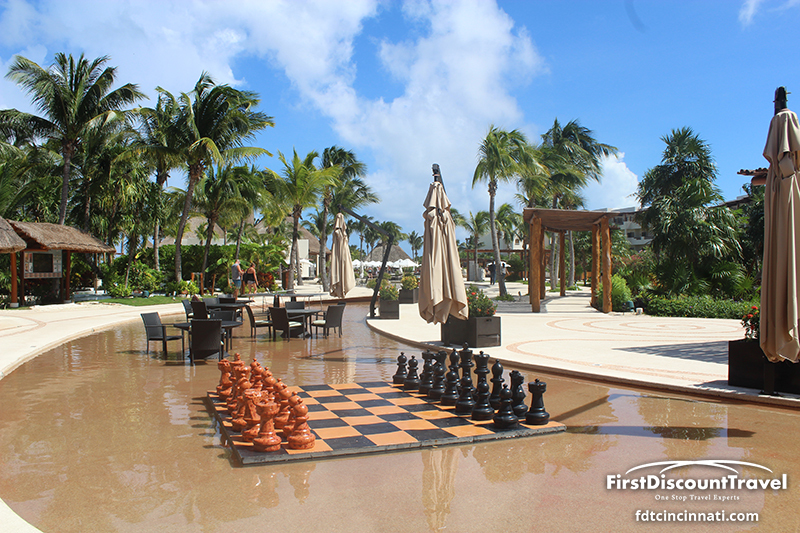 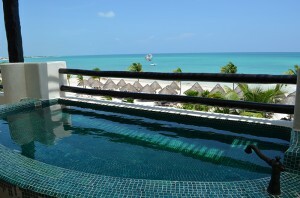 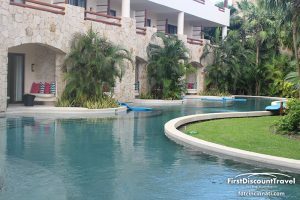 In addition, the resort has an amazing pool area with a medium sized swim up pool bar. 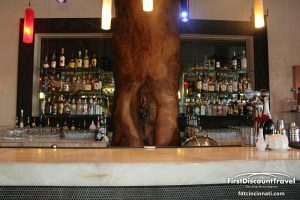 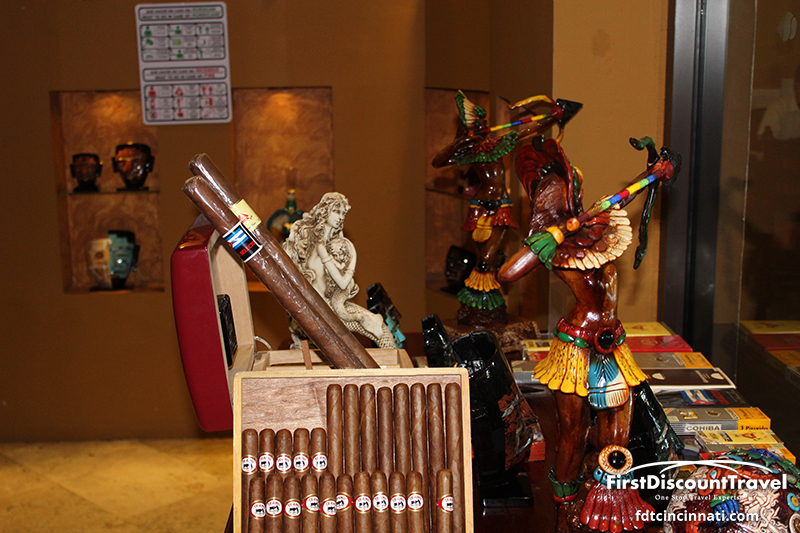 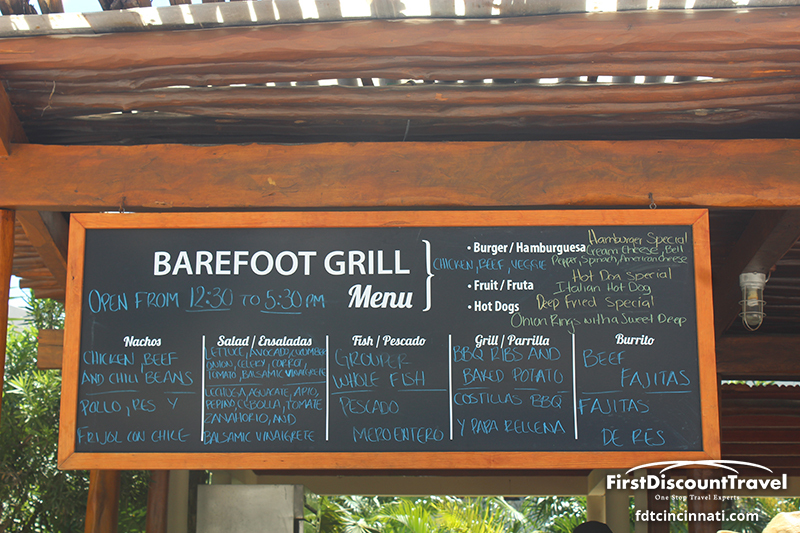 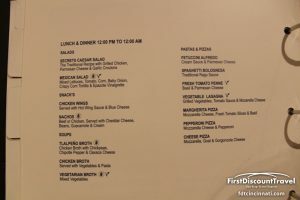 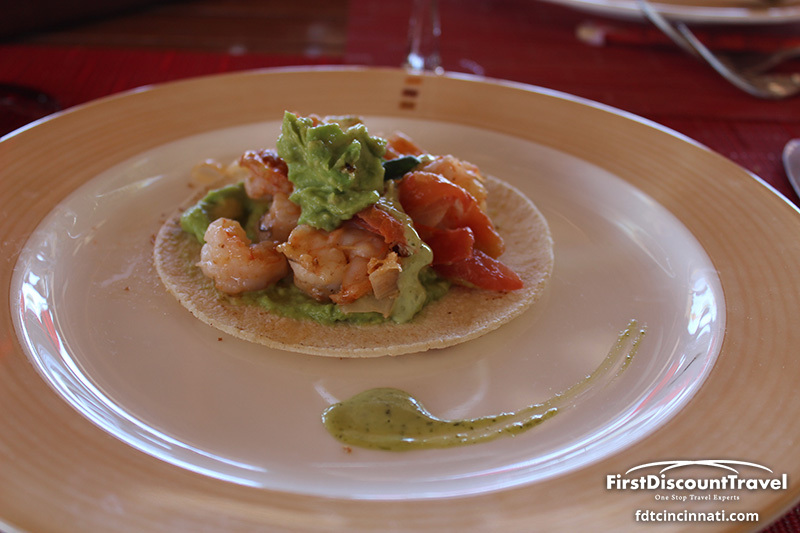 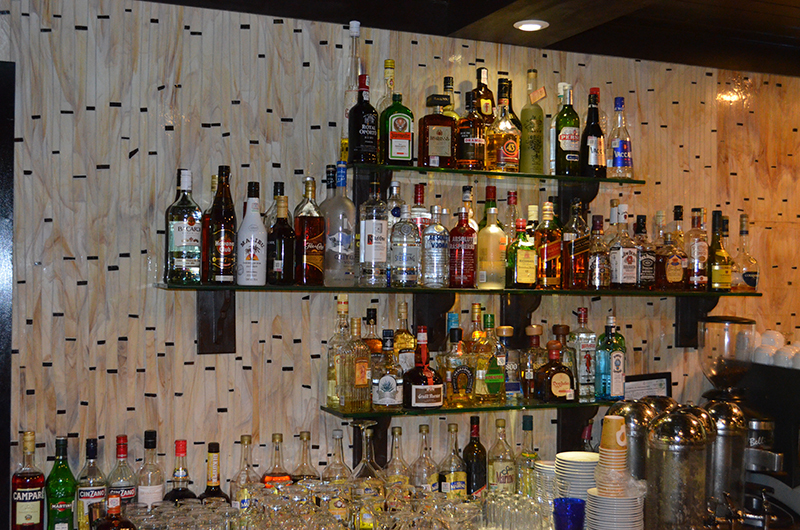 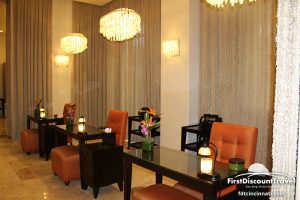 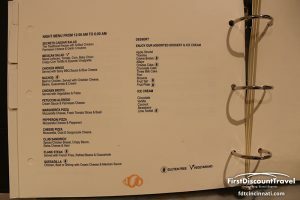 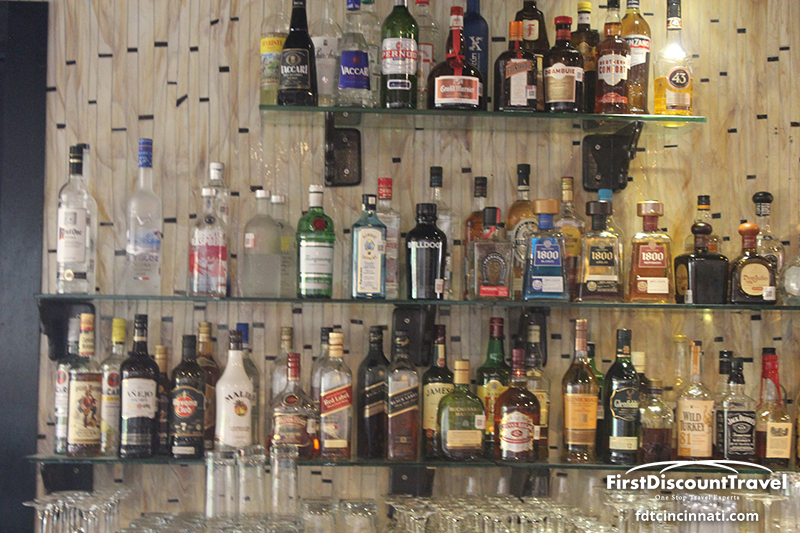 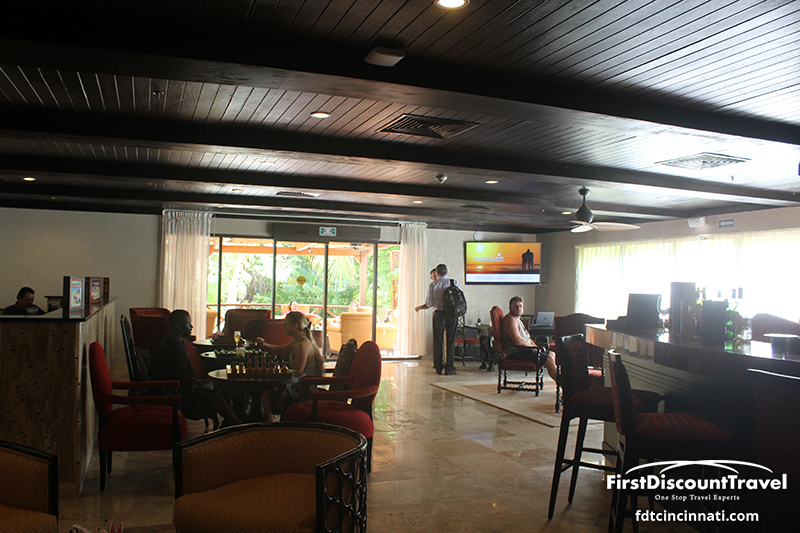 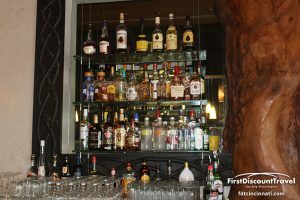 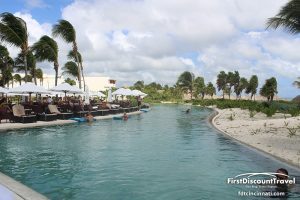 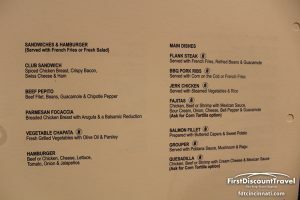 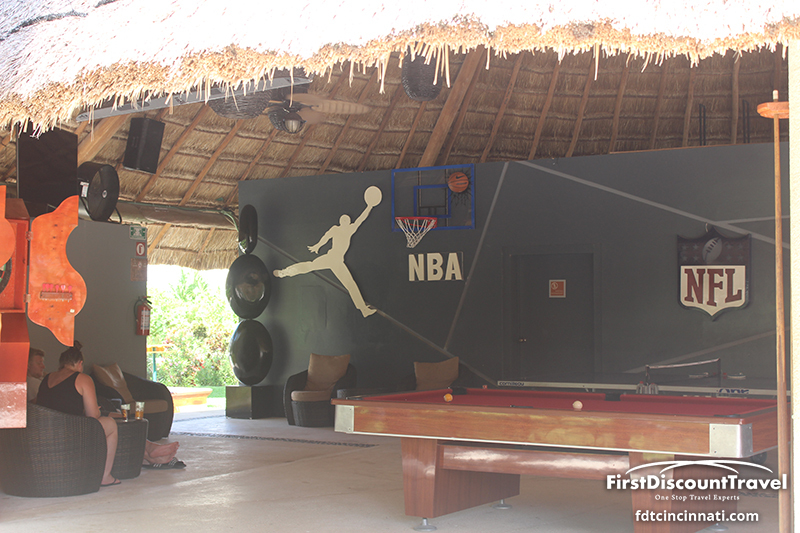 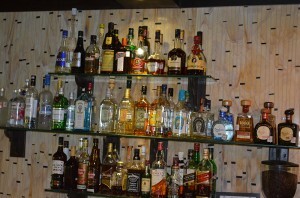 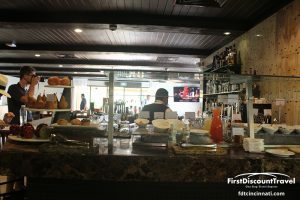 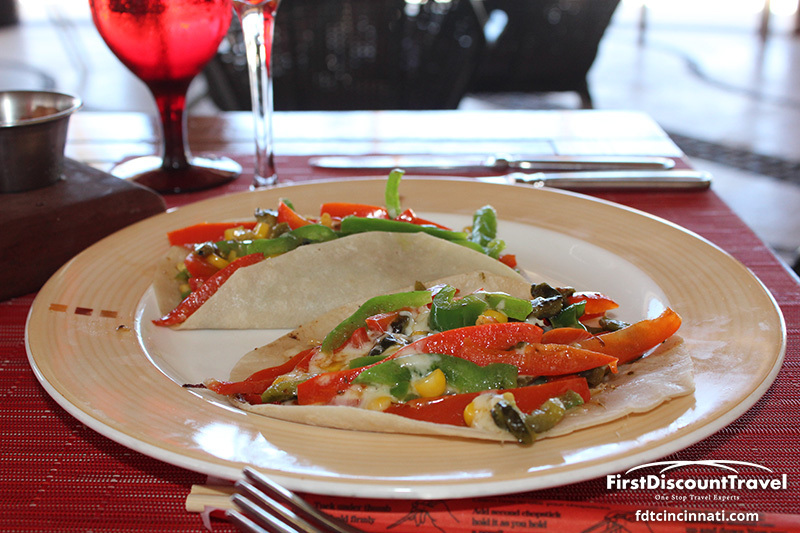 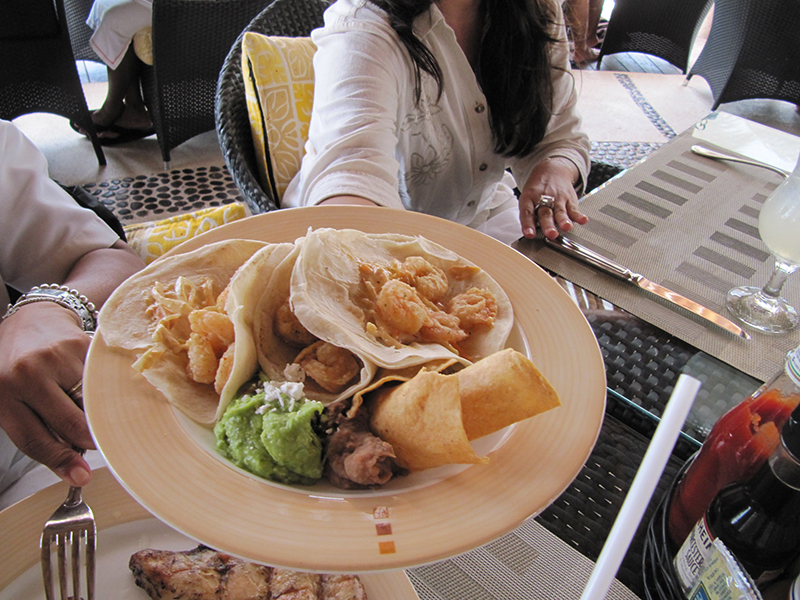 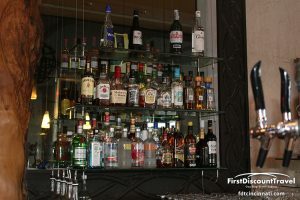 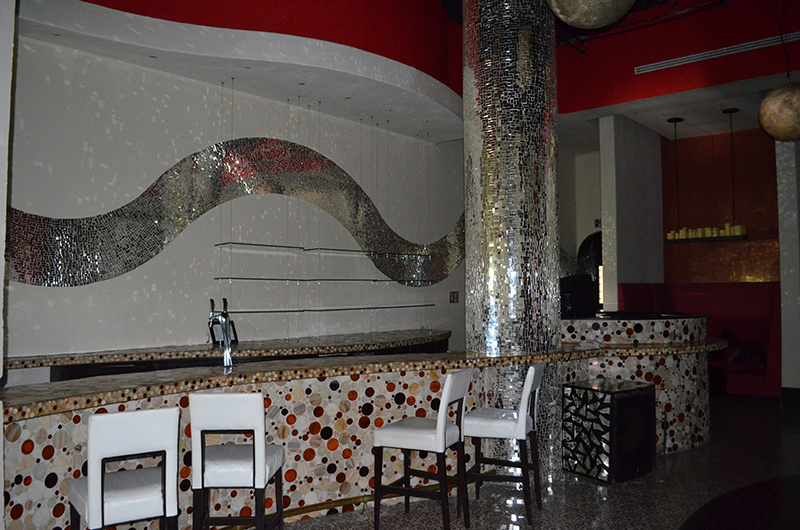 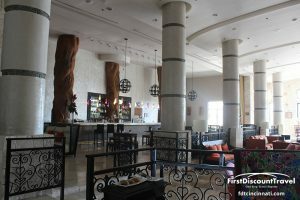 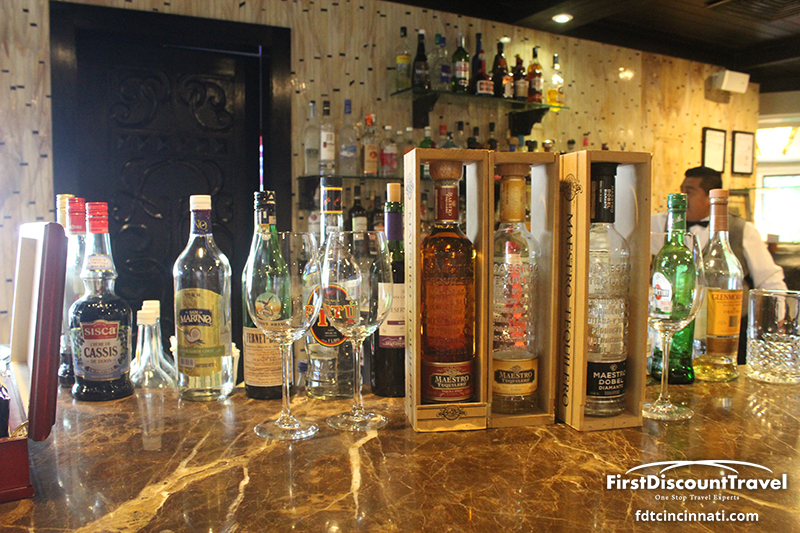 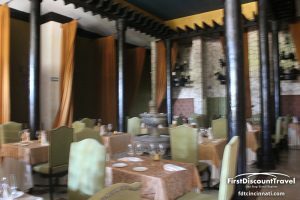 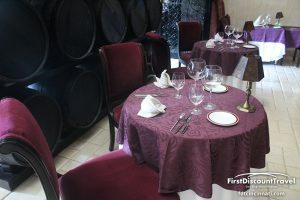 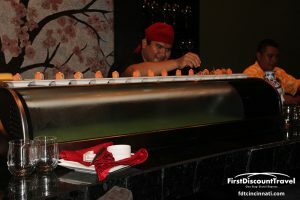 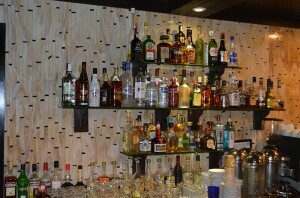 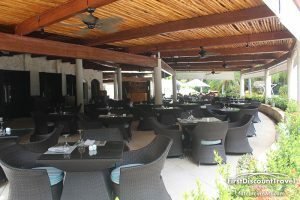 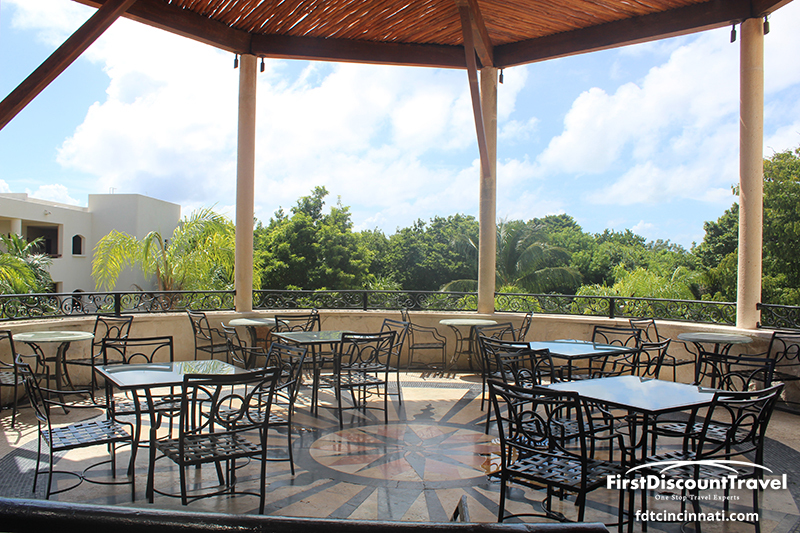 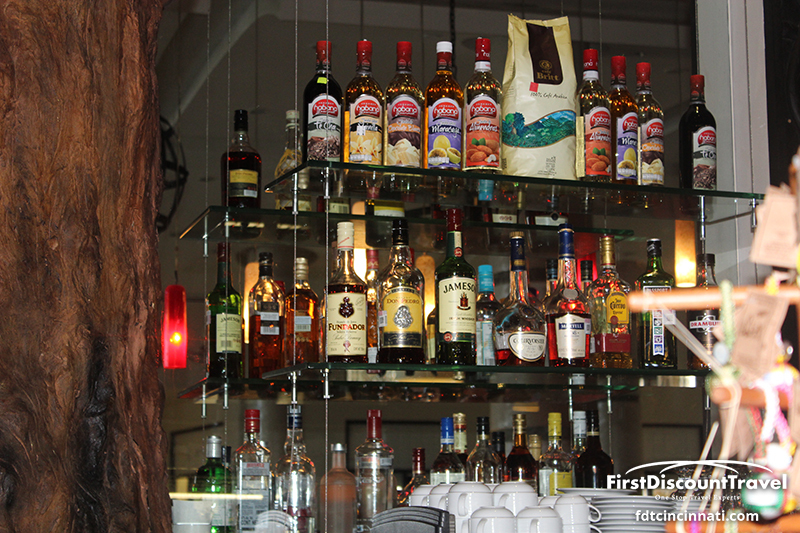 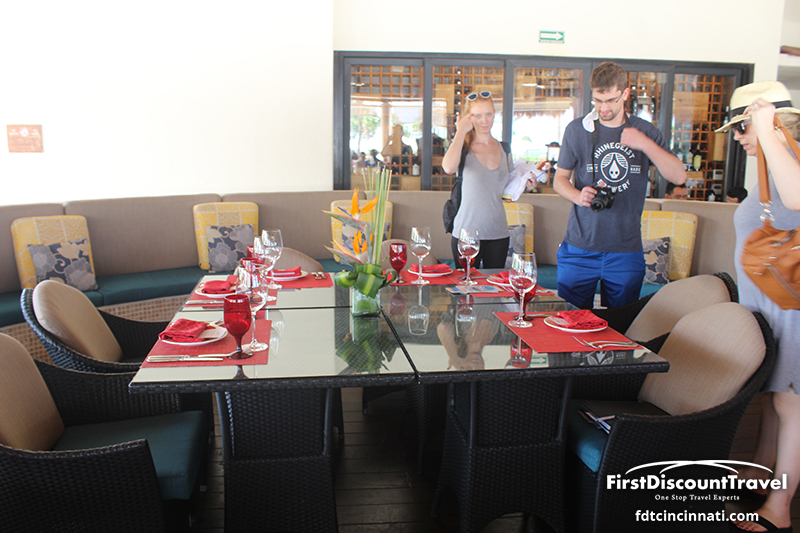 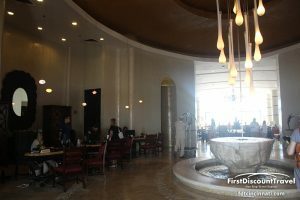 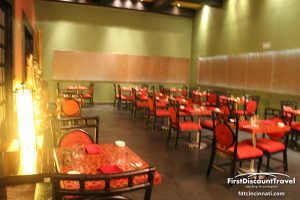 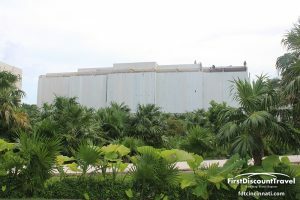 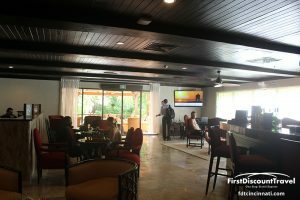 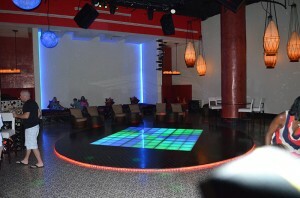 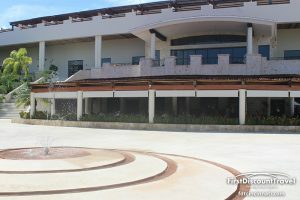 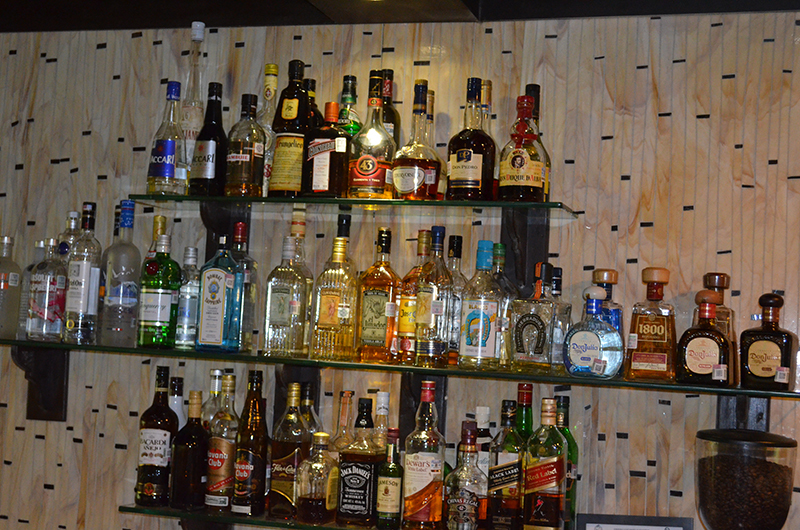 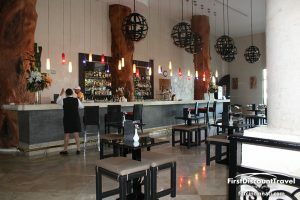 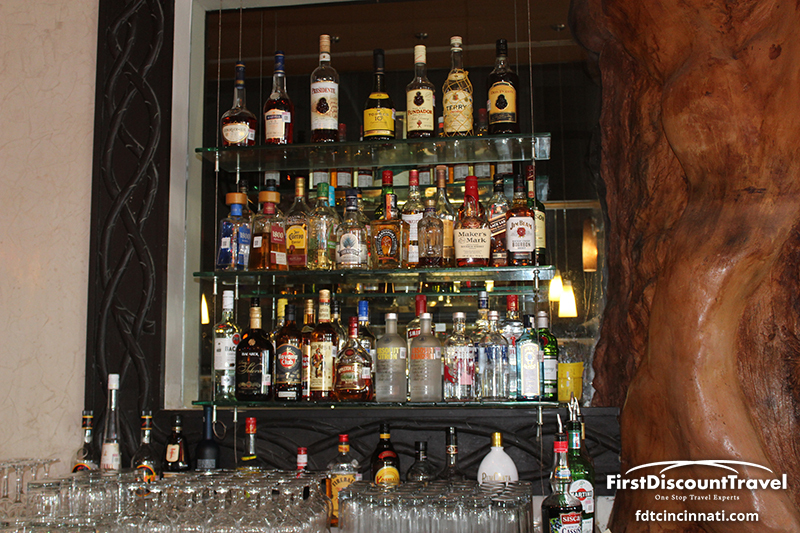 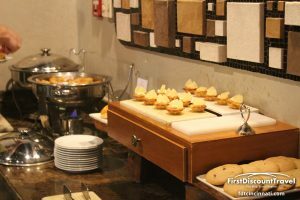 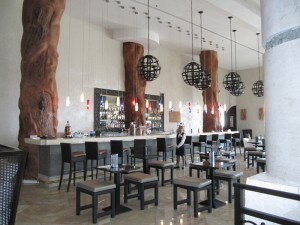 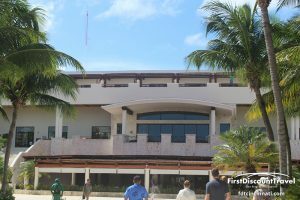 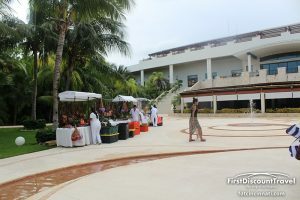 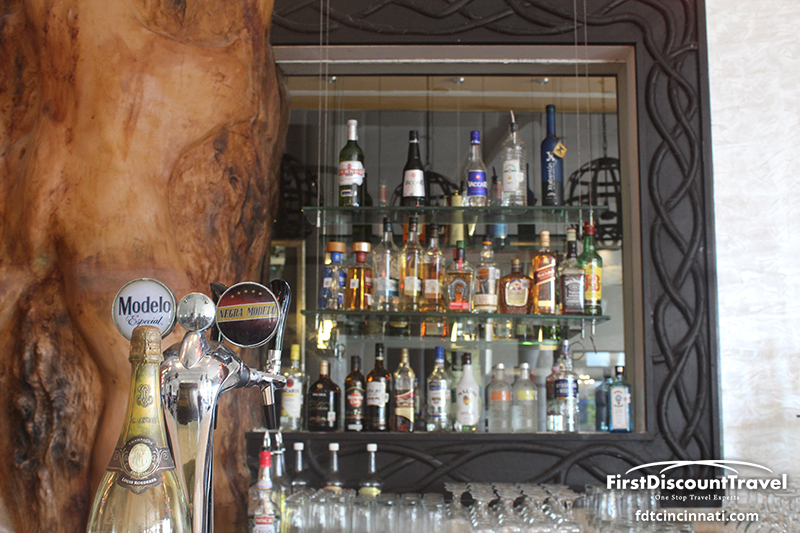 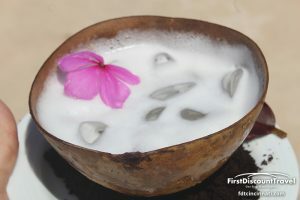 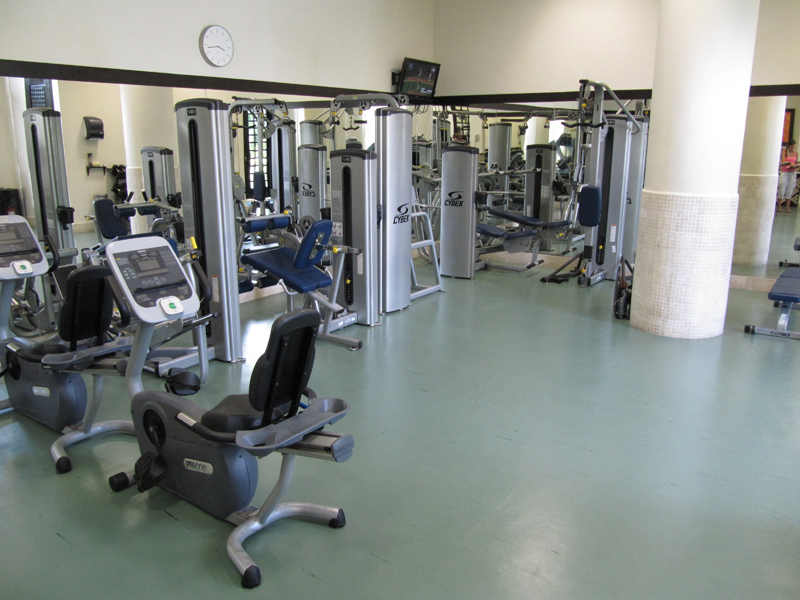 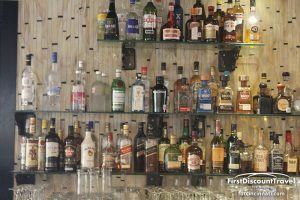 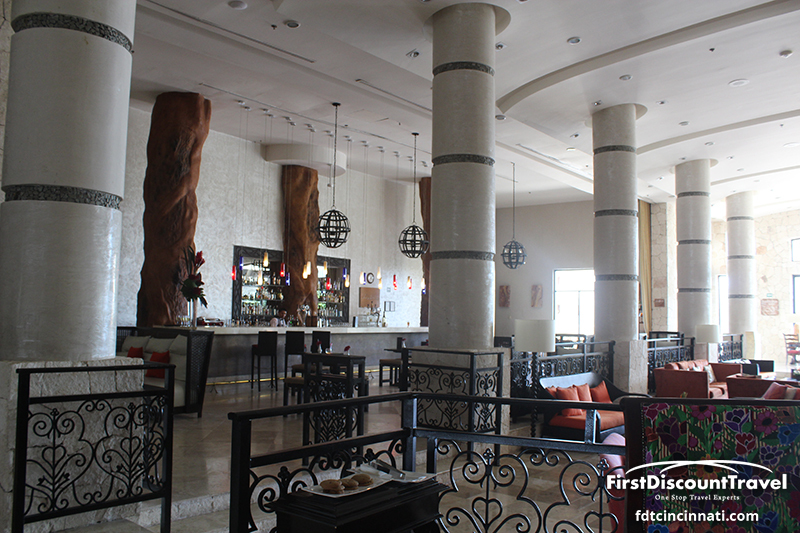 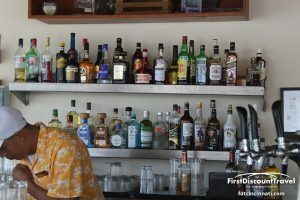 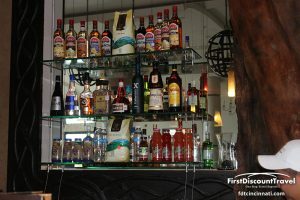 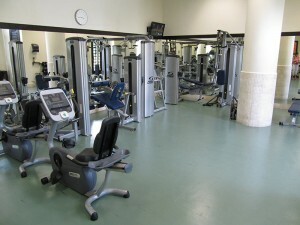 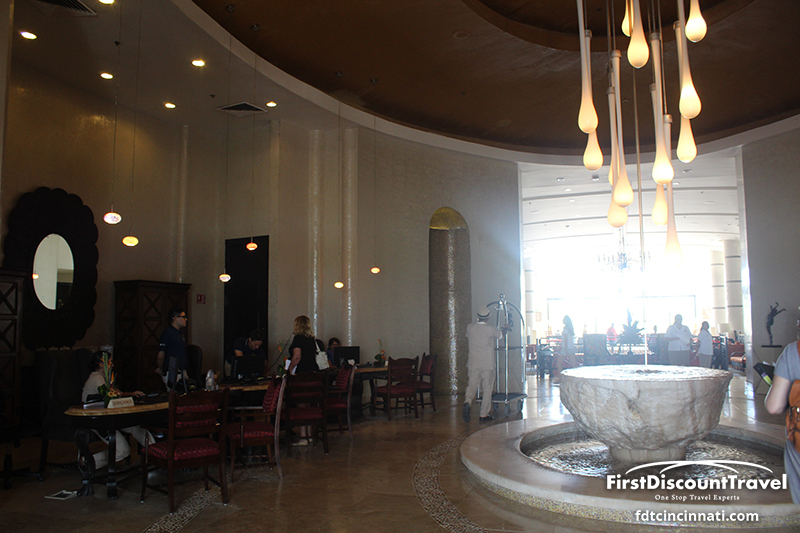 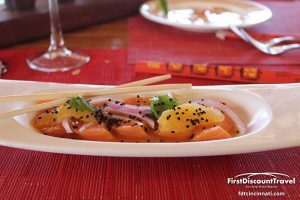 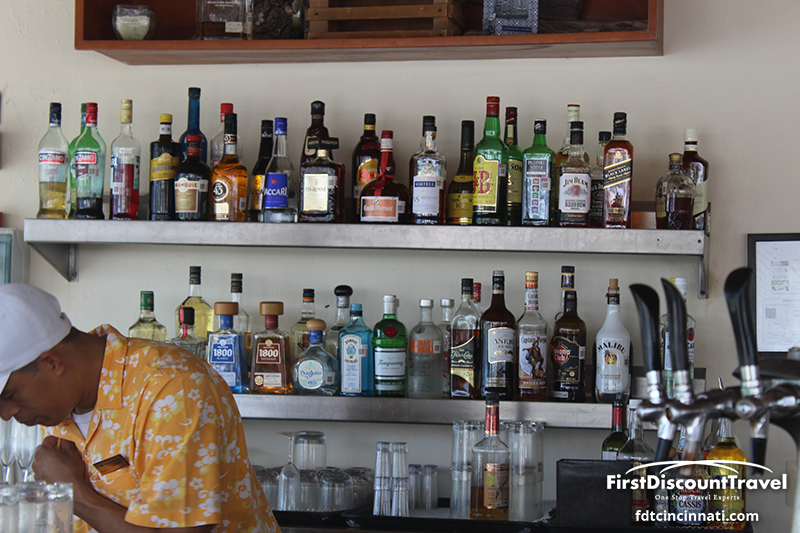 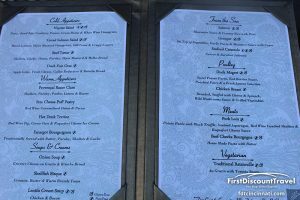 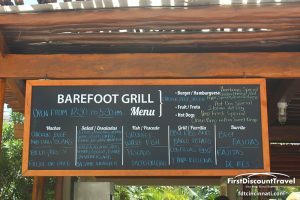 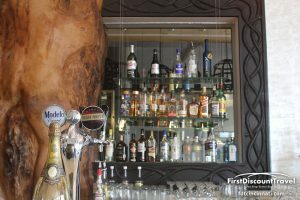 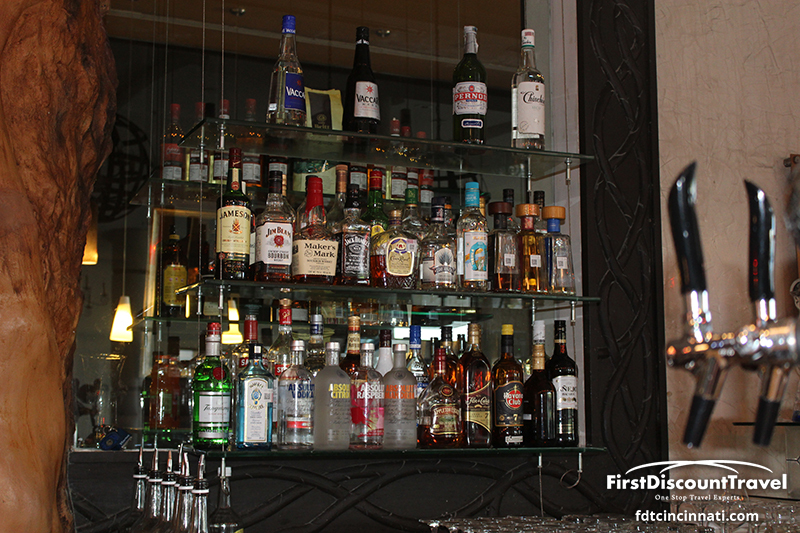 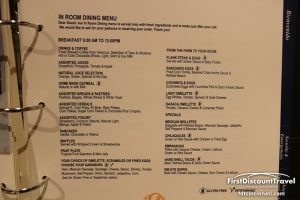 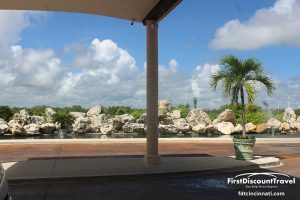 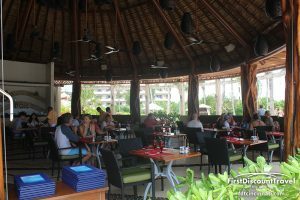 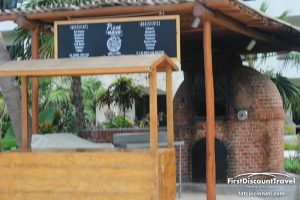 The resort has 7 restaurants (Asian with sushi and teppanaki, French, Italian, Grill, Seafood, Mexican, and buffet), 8 bars, and serves premium brand liquor and American Beer (as well as Mexican brands). 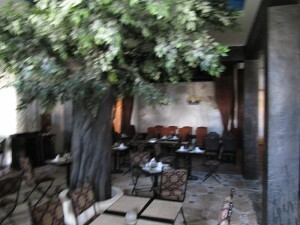 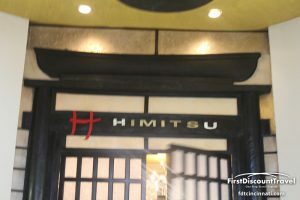 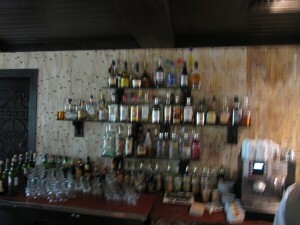 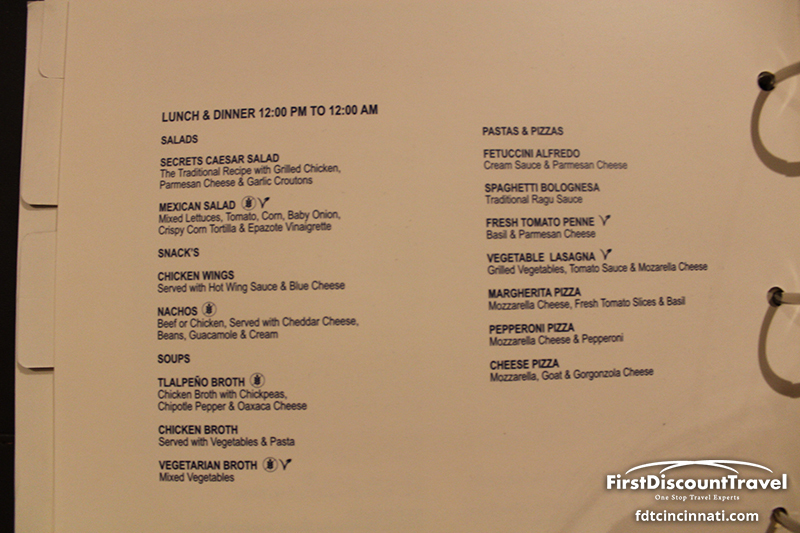 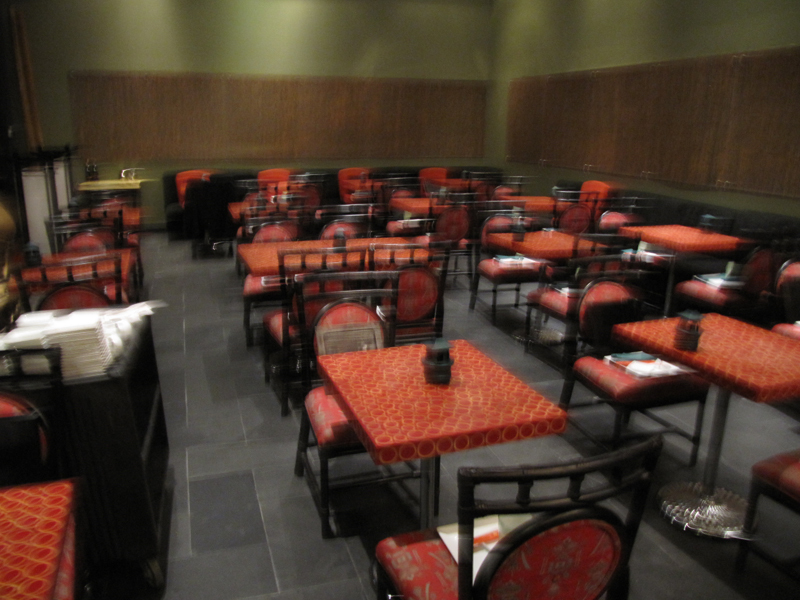 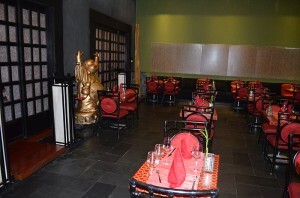 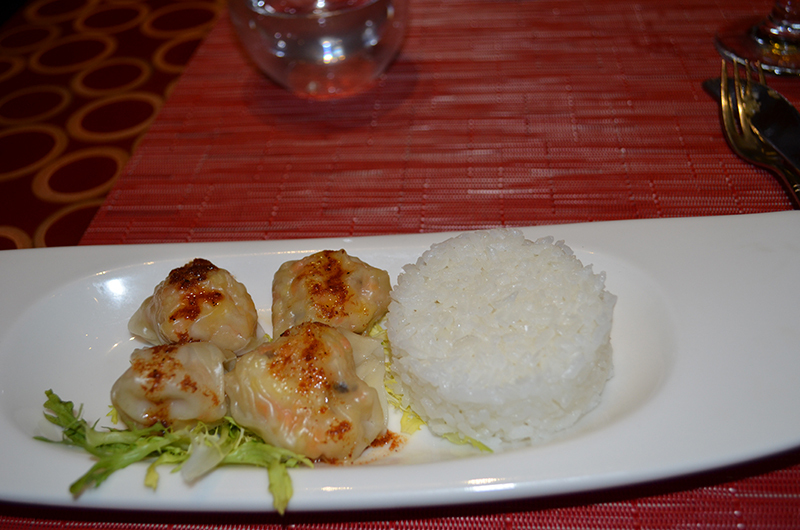 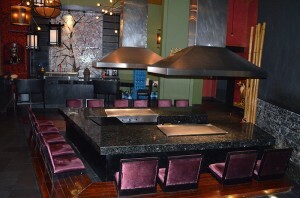 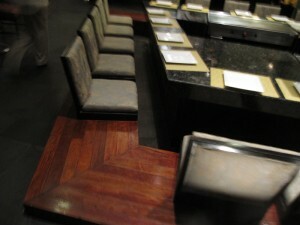 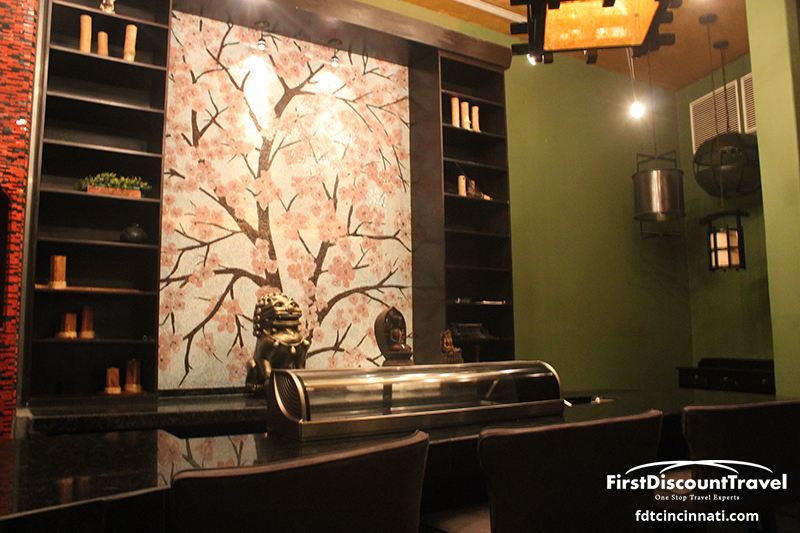 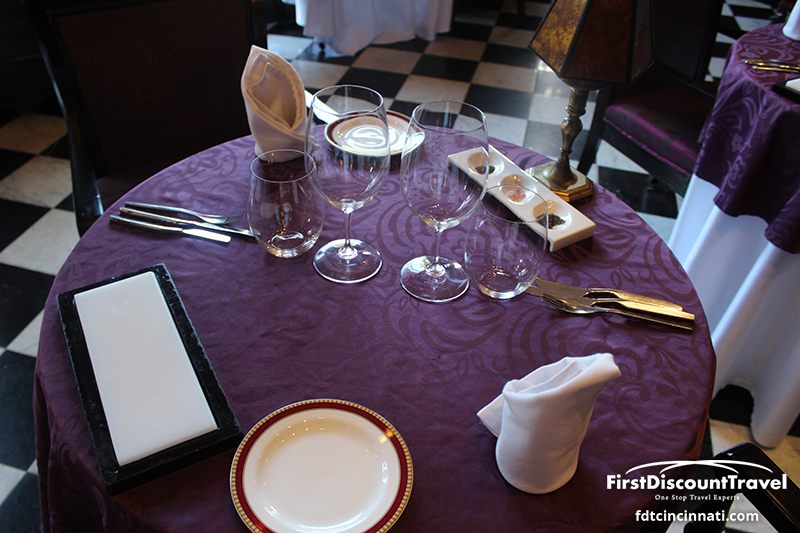 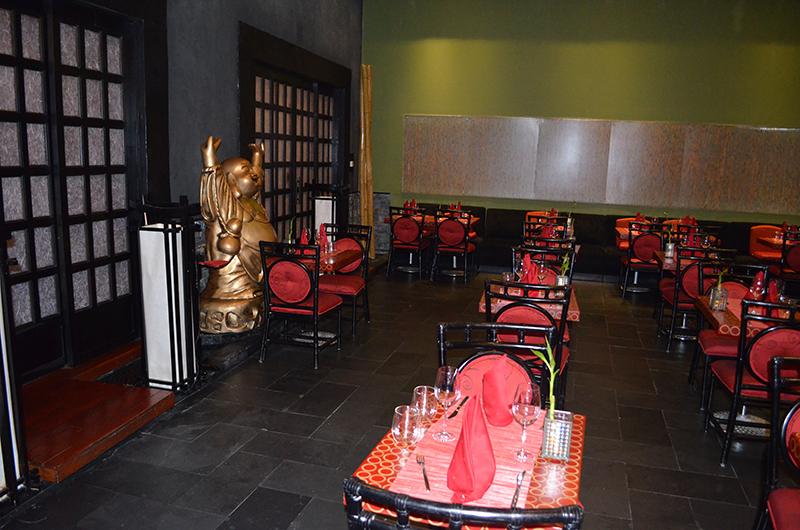 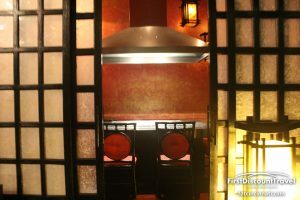 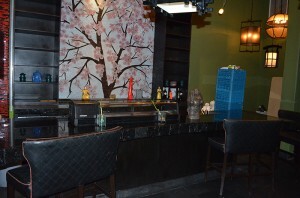 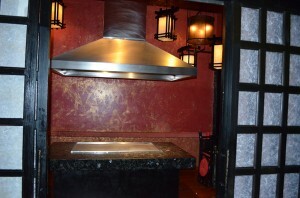 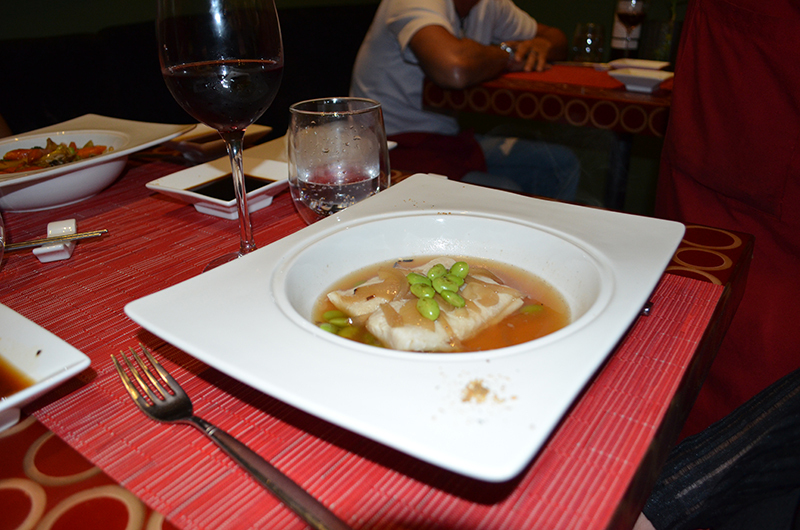 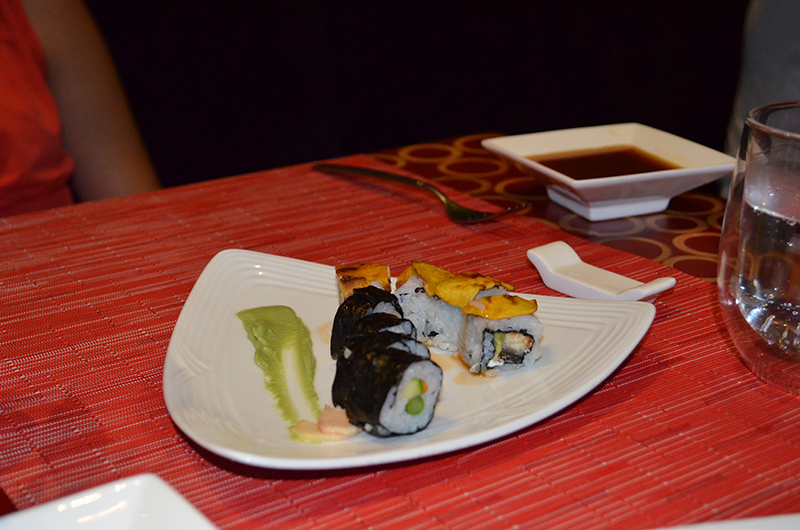 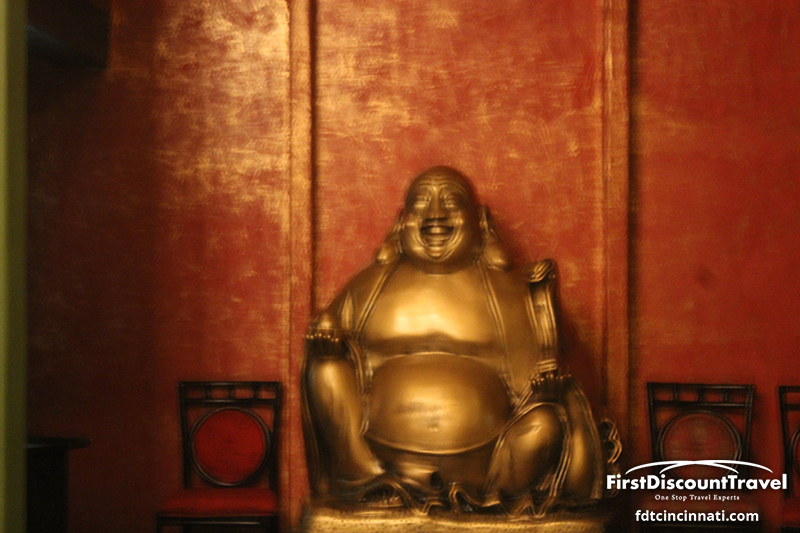 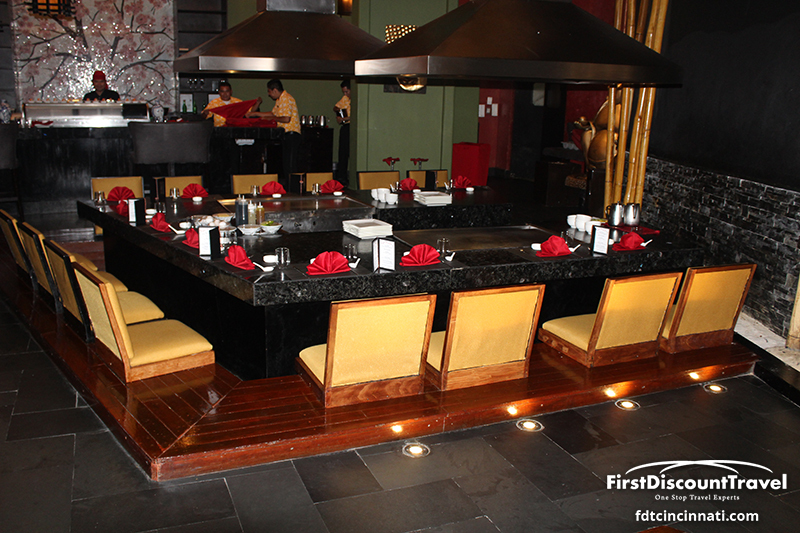 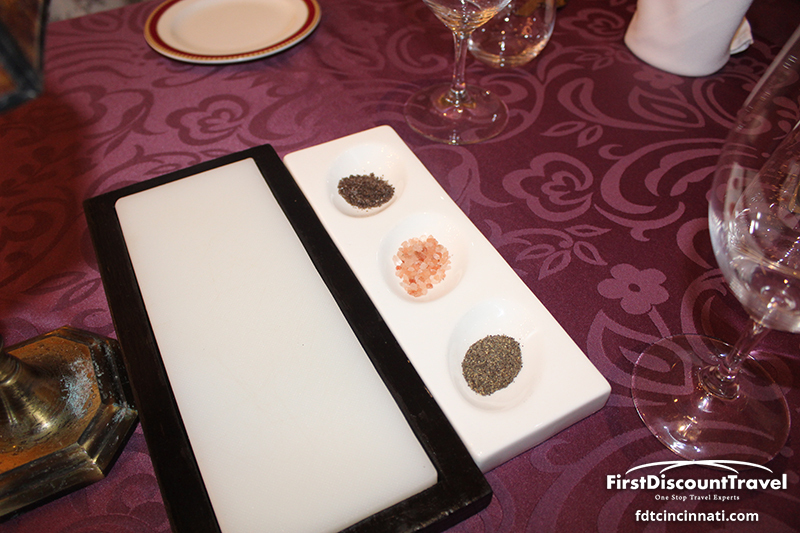 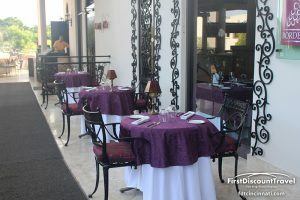 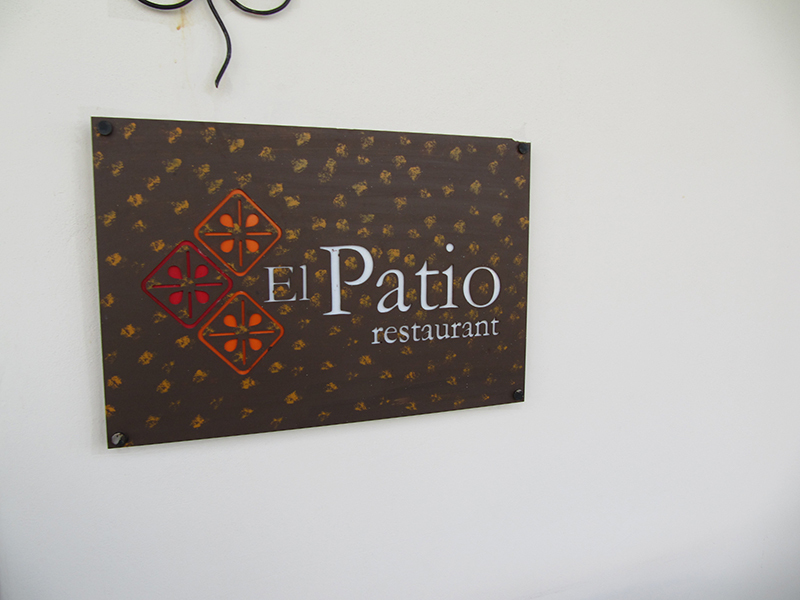 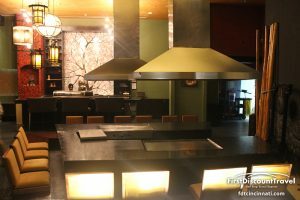 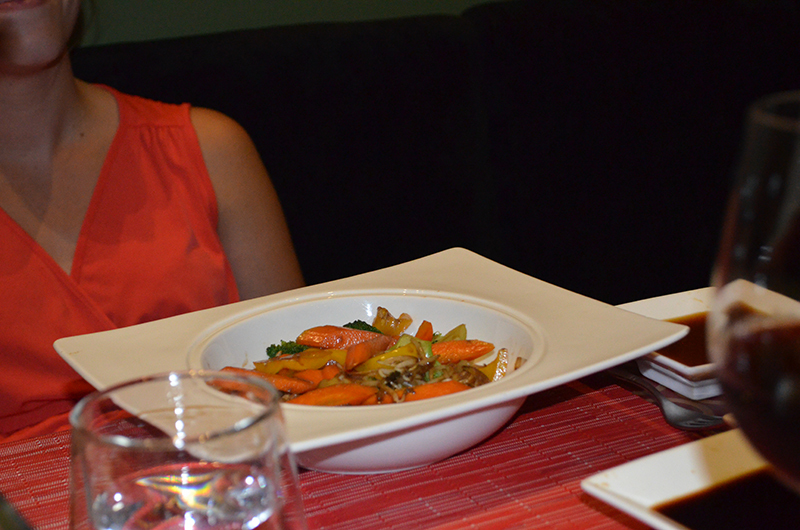 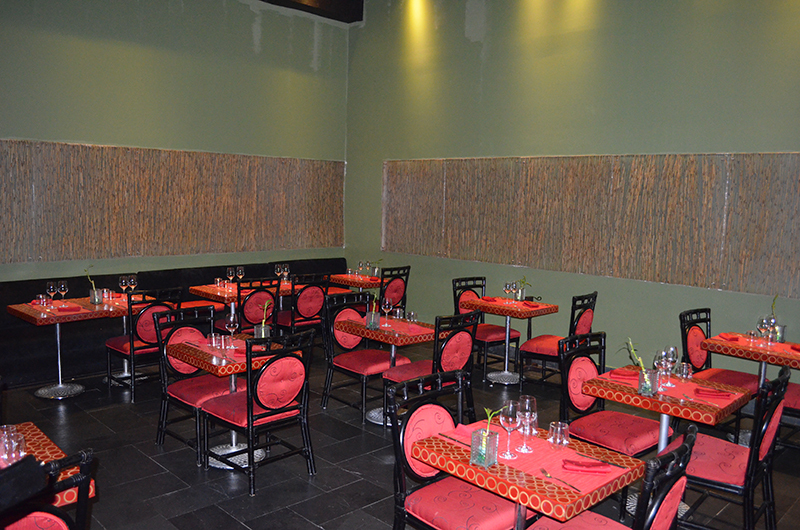 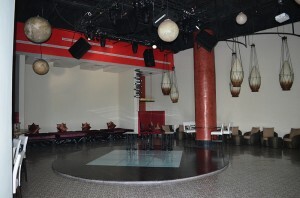 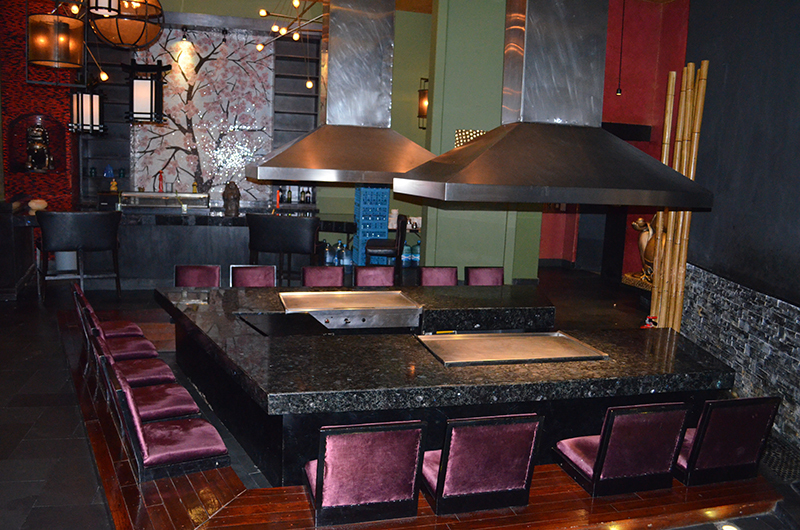 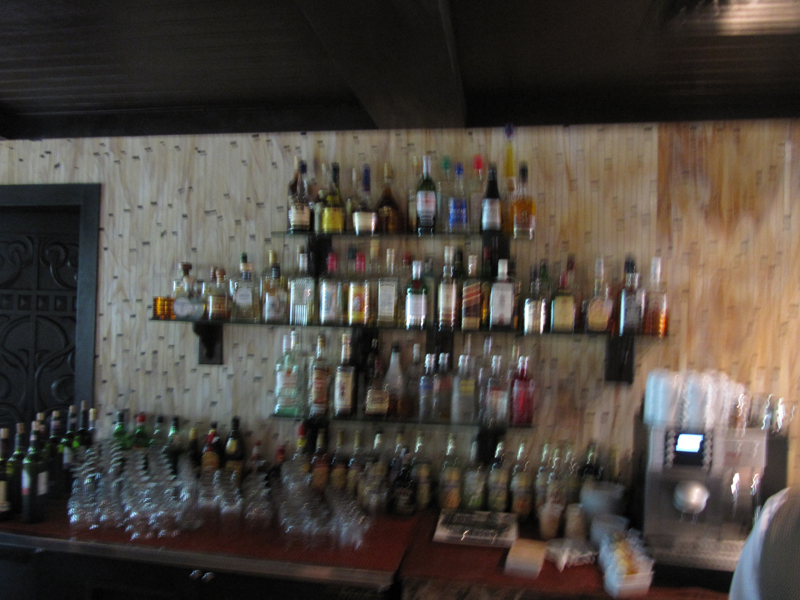 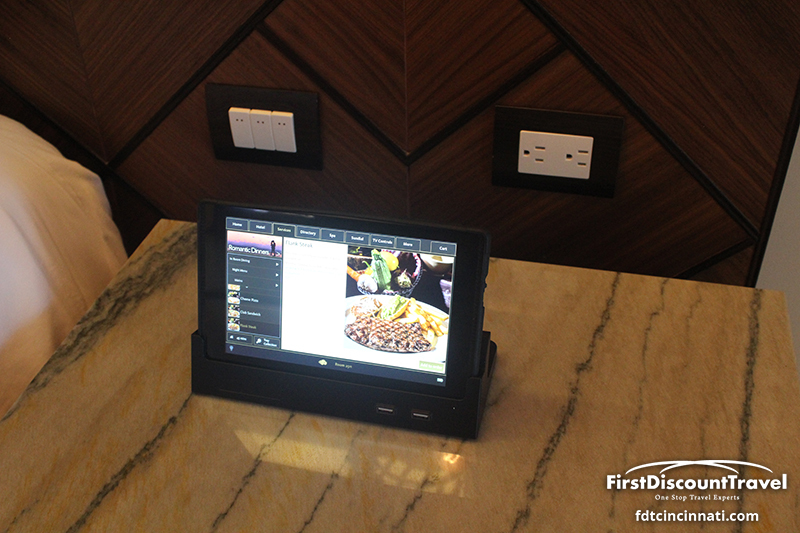 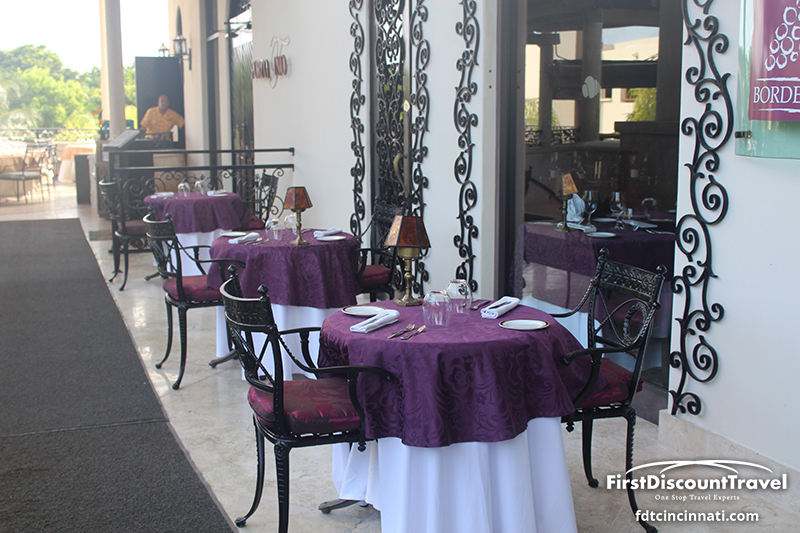 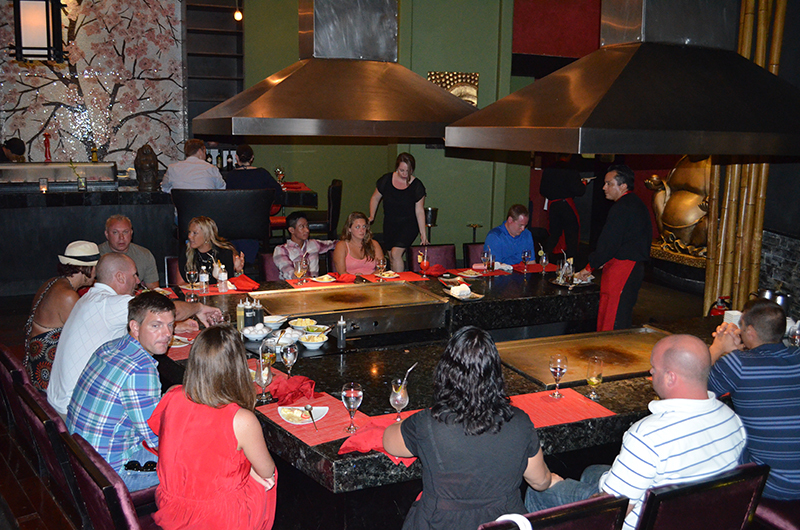 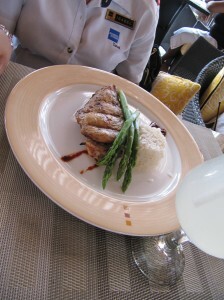 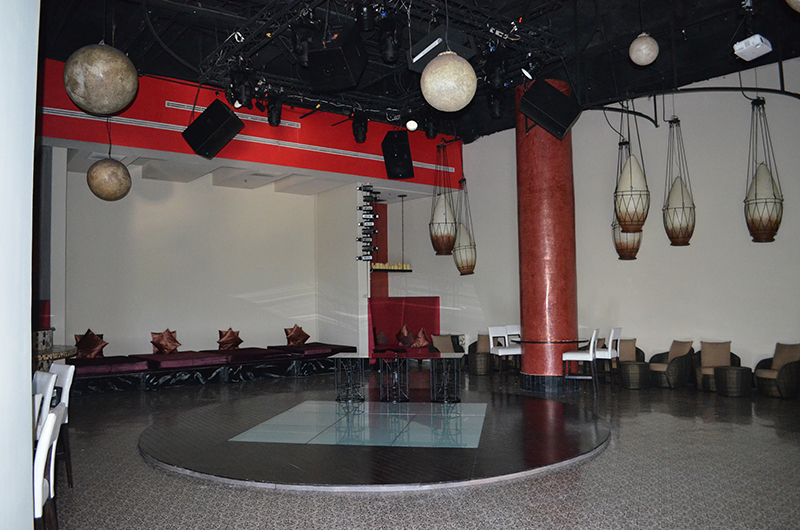 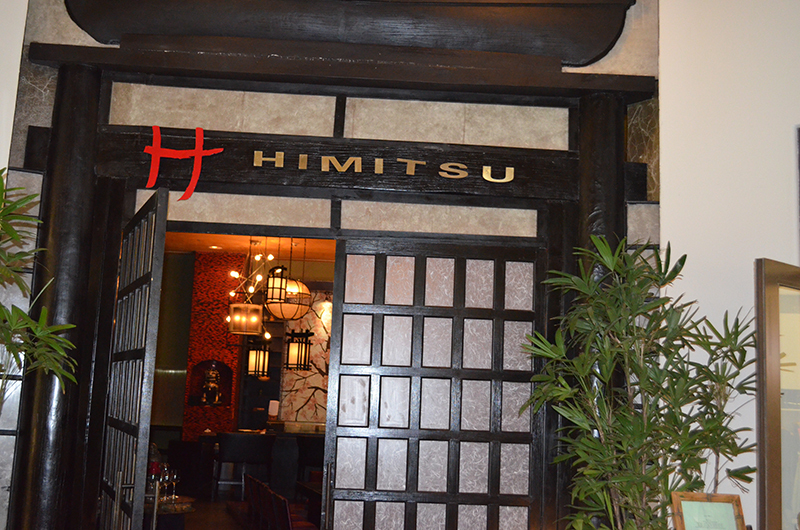 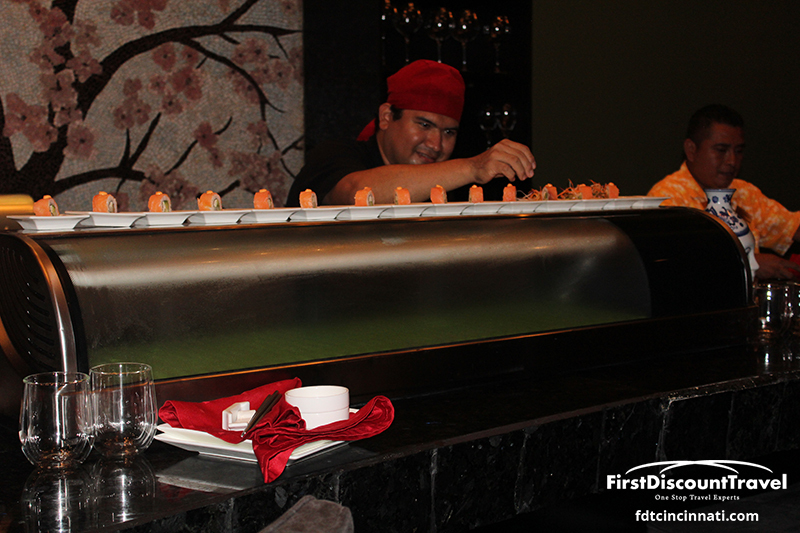 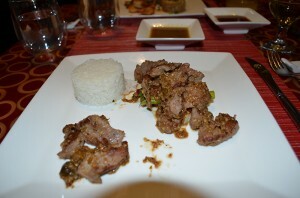 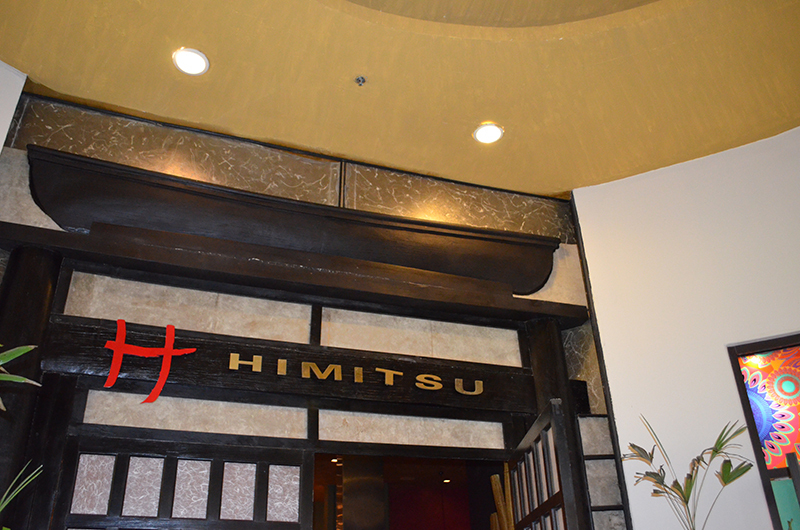 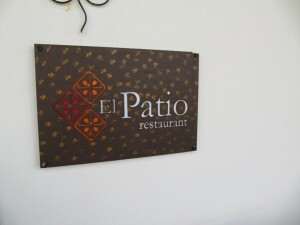 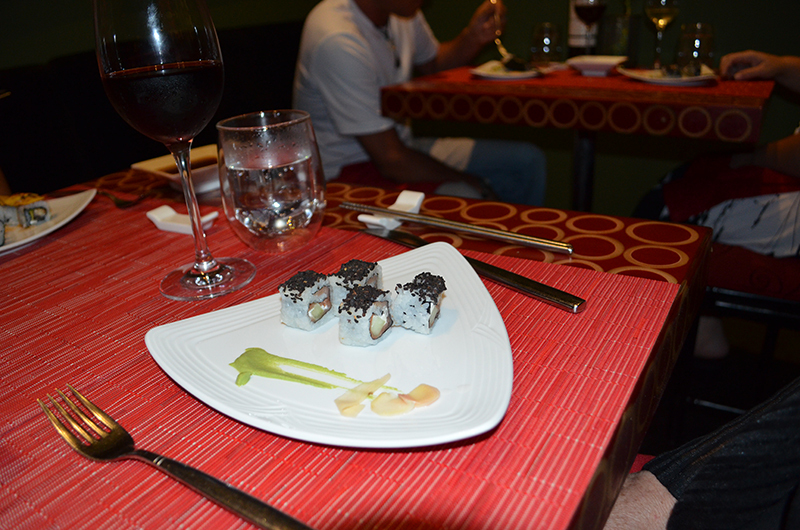 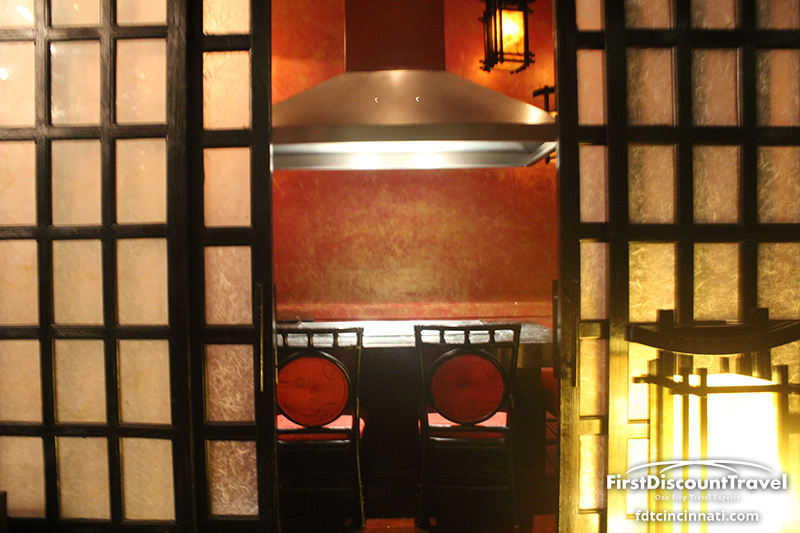 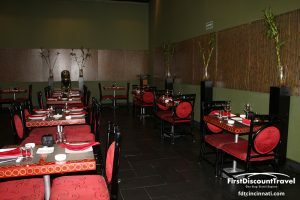 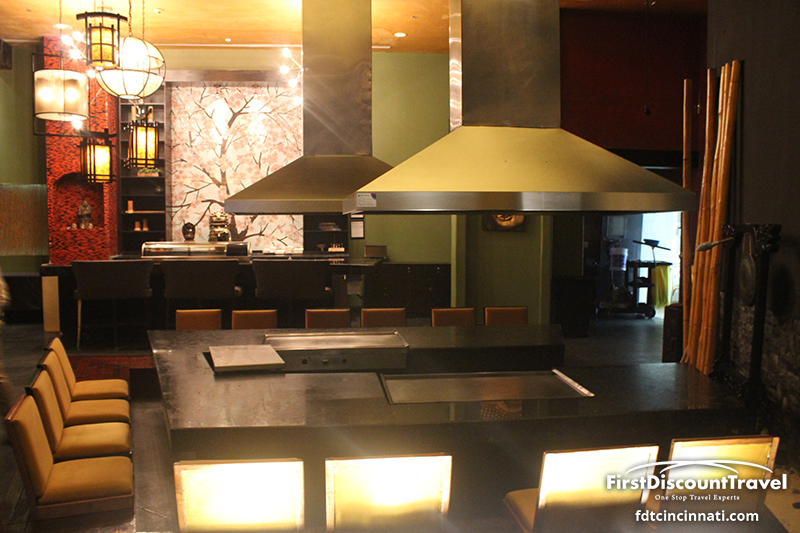 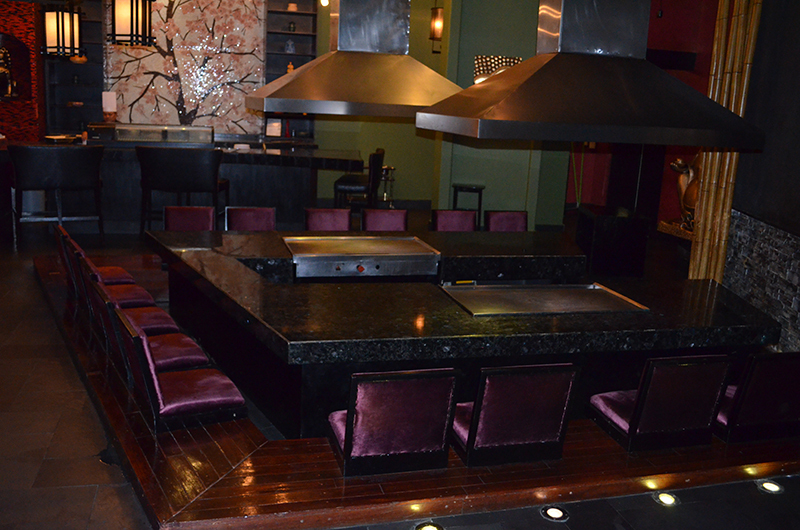 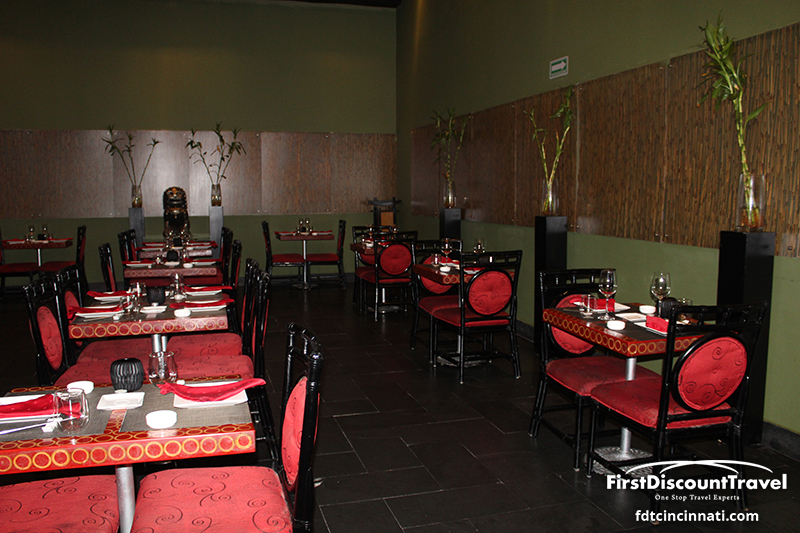 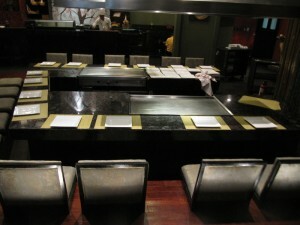 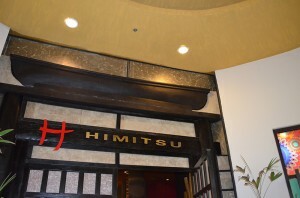 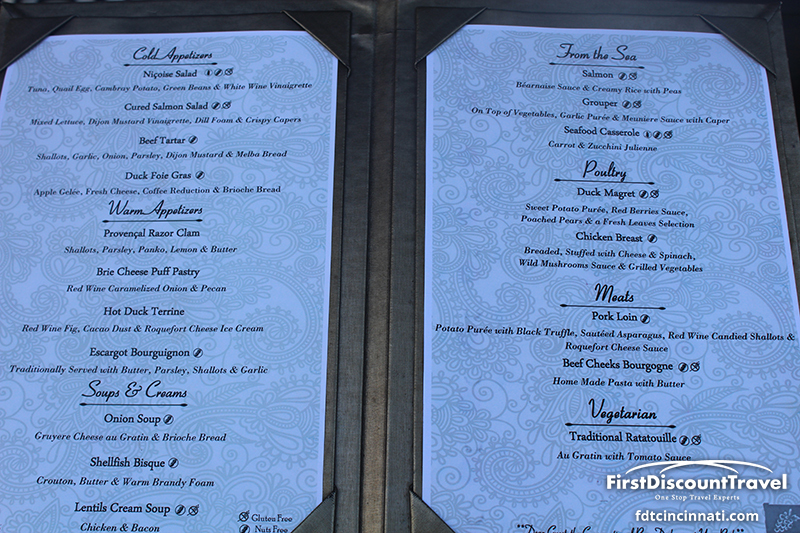 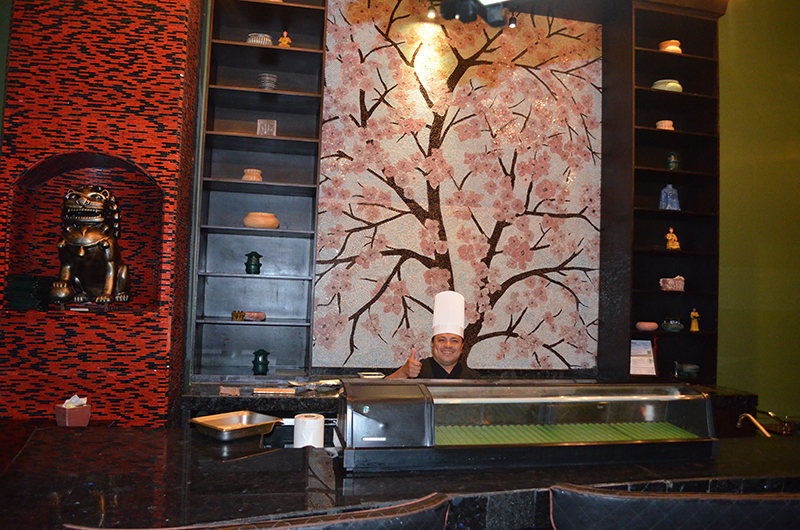 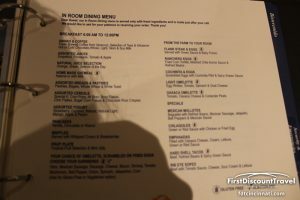 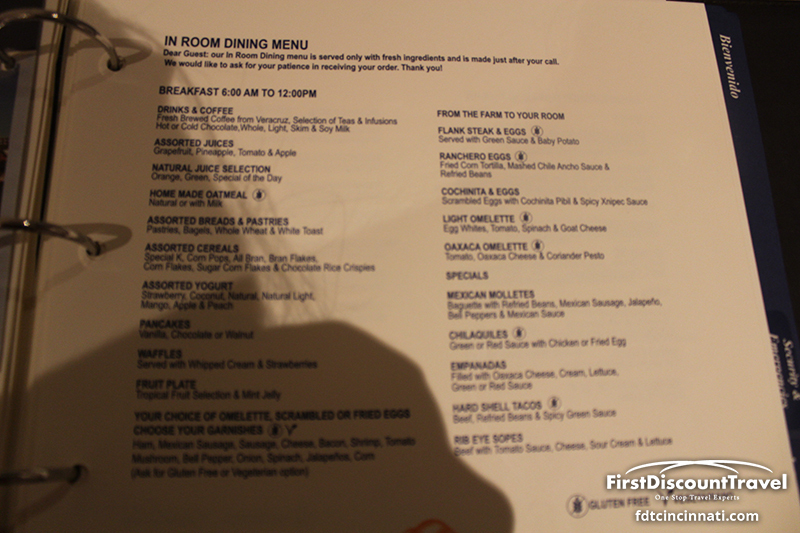 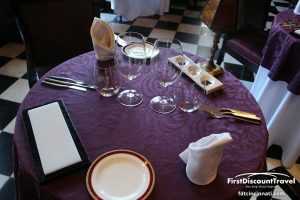 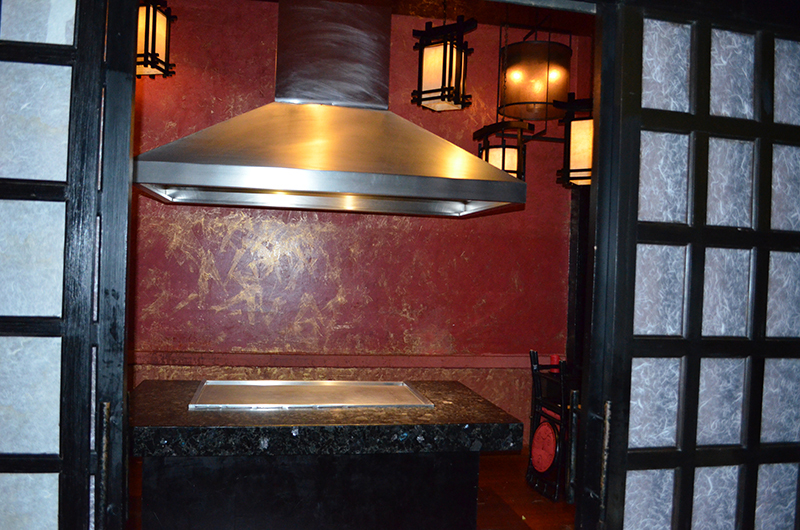 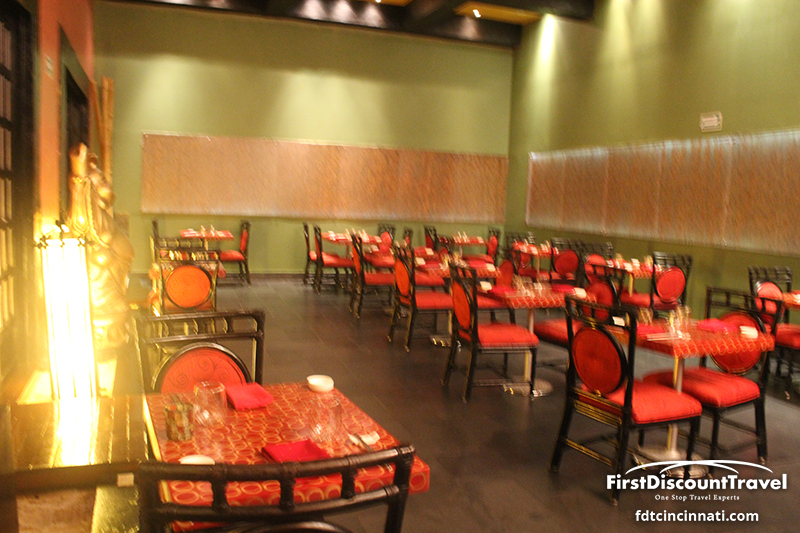 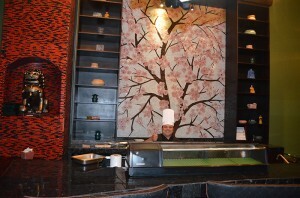 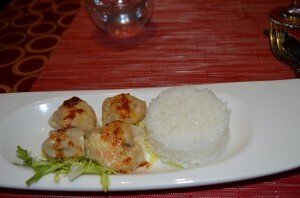 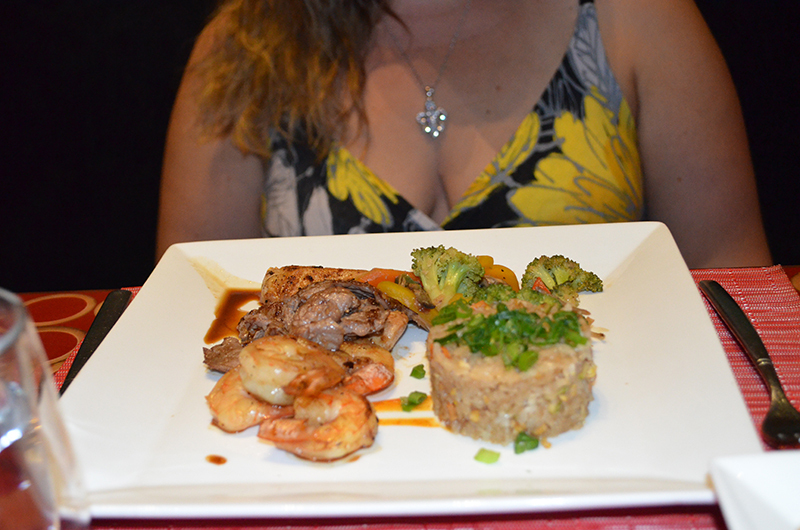 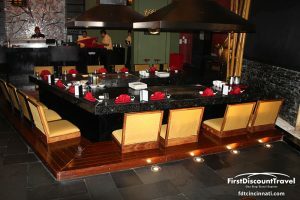 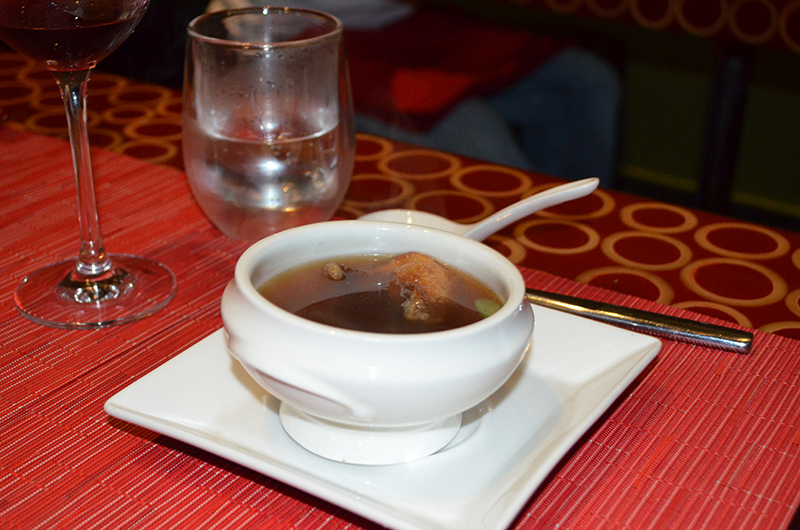 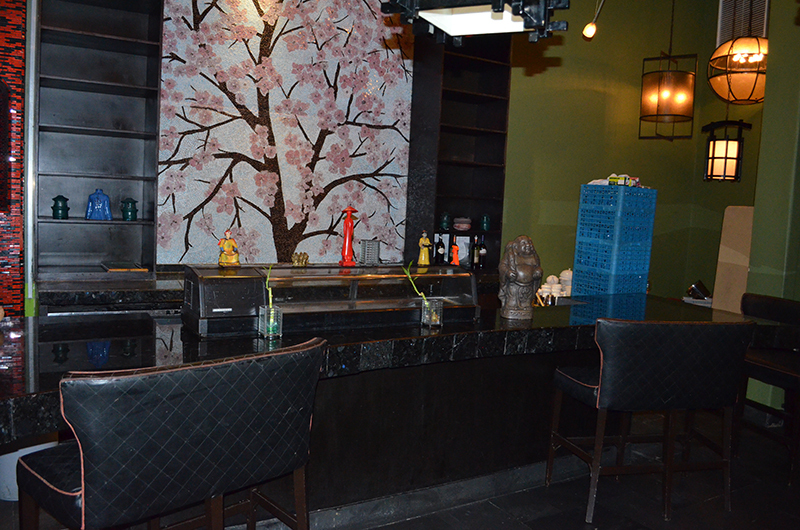 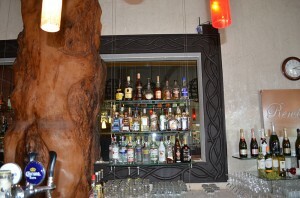 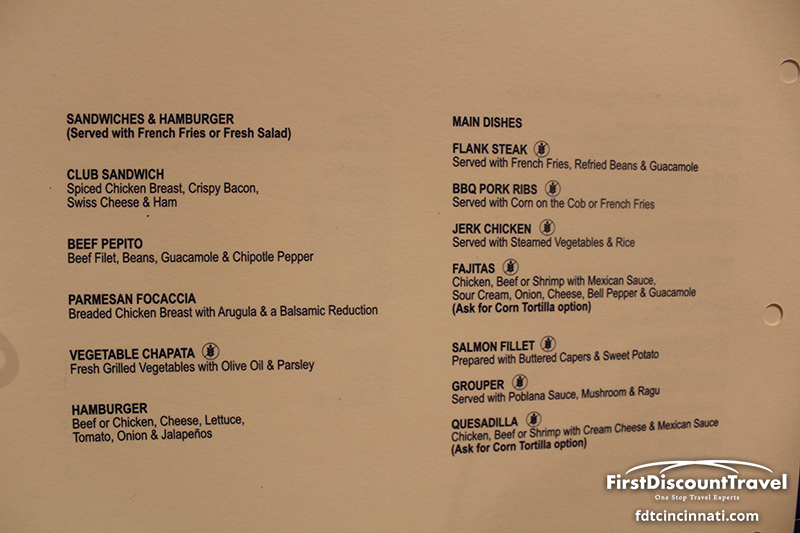 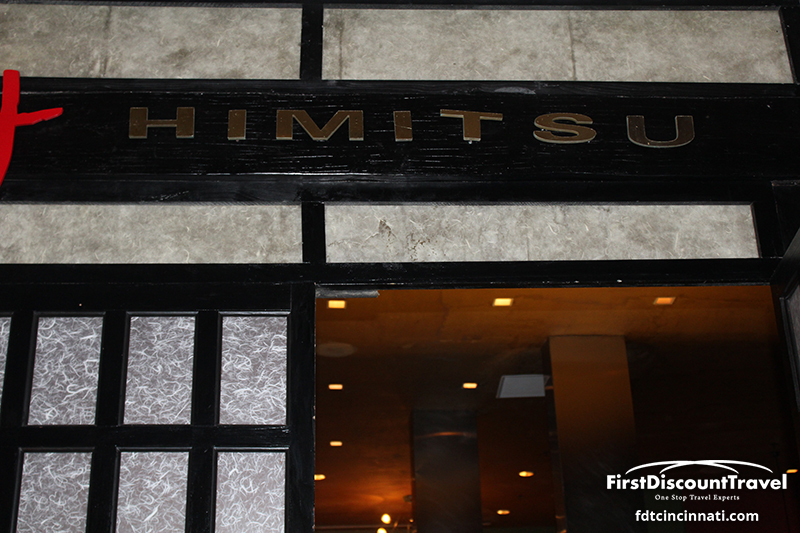 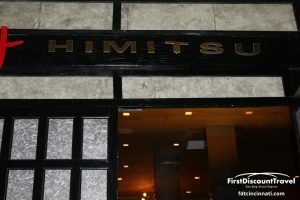 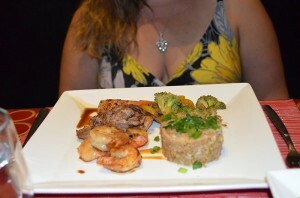 No reservations are accepted for any of the dining venues except the teppanaki tables. 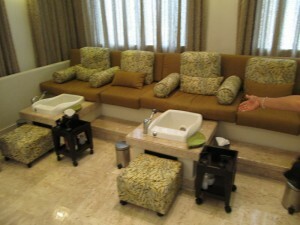 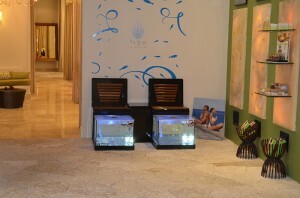 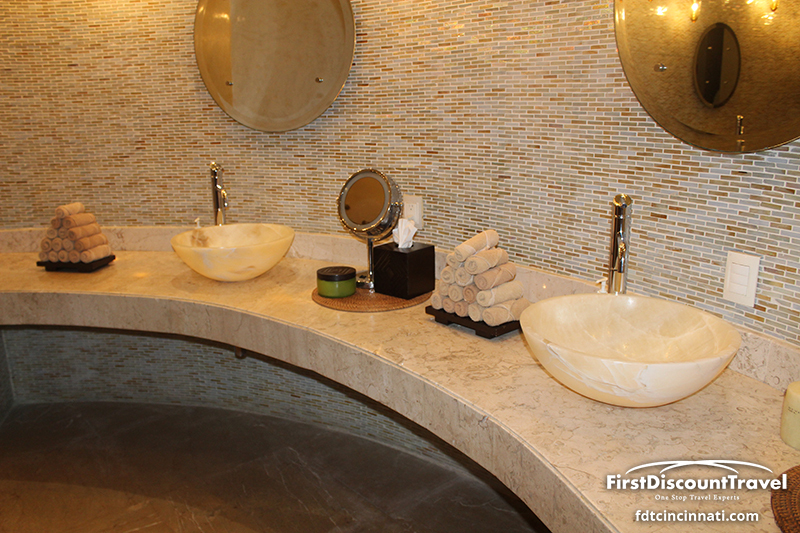 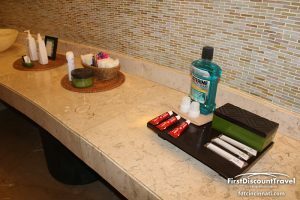 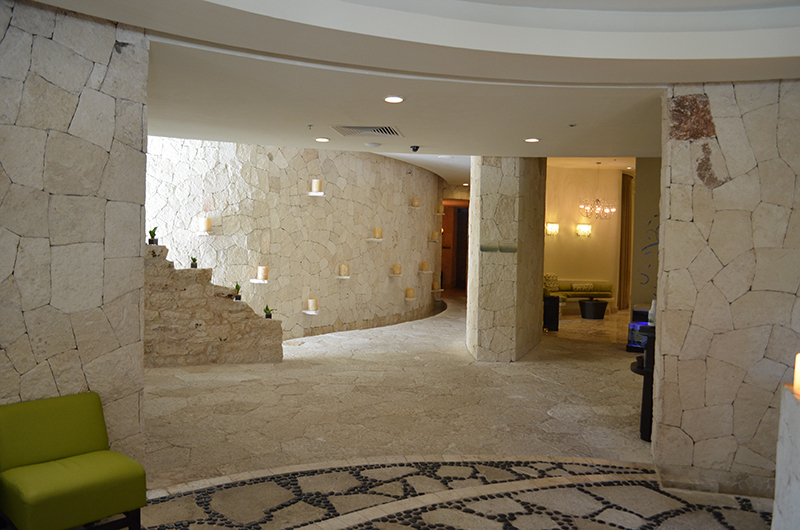 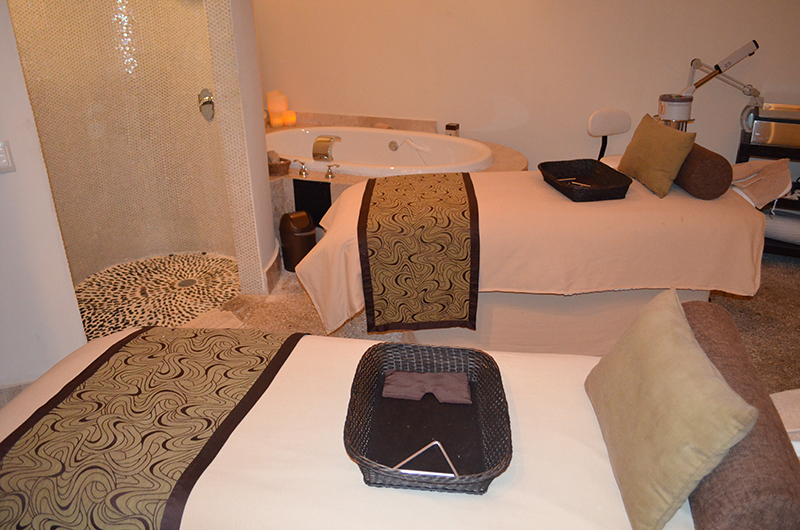 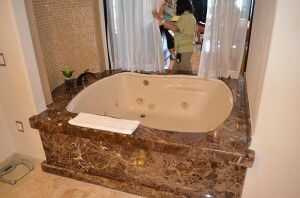 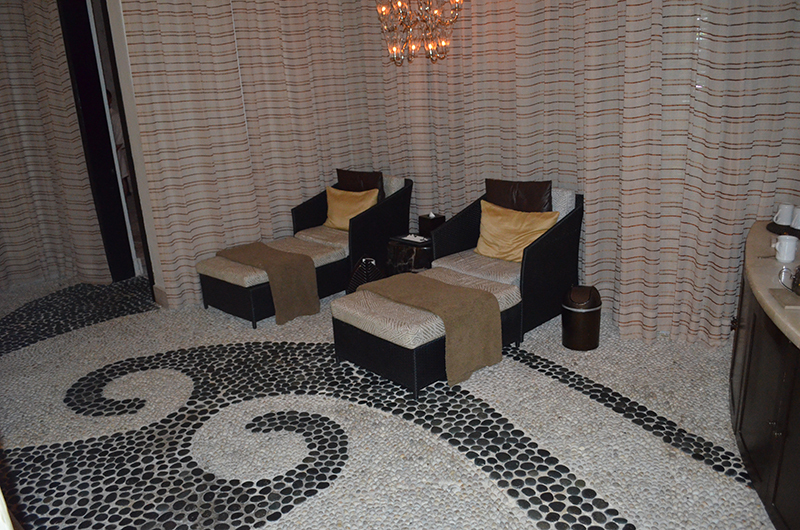 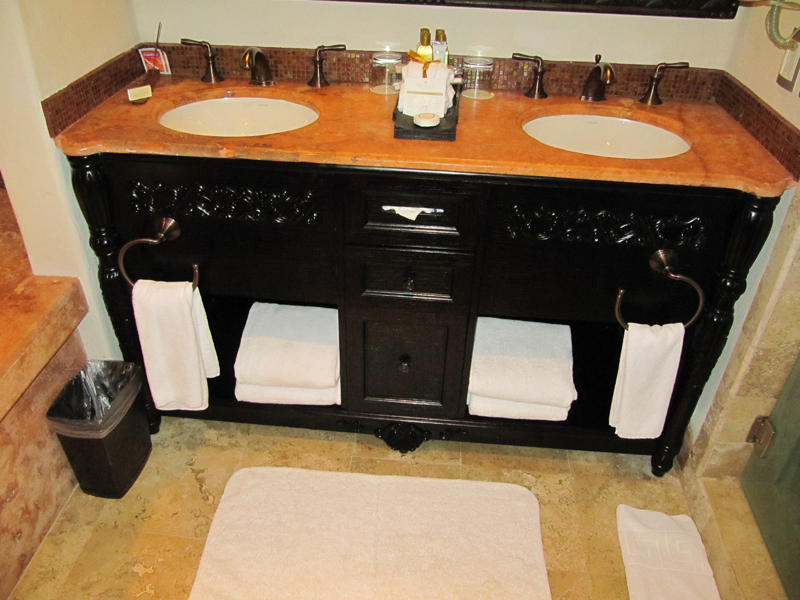 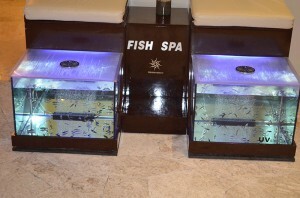 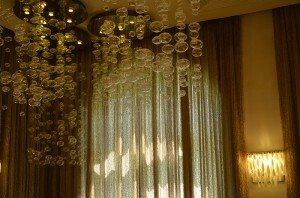 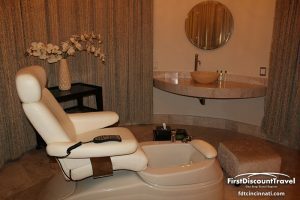 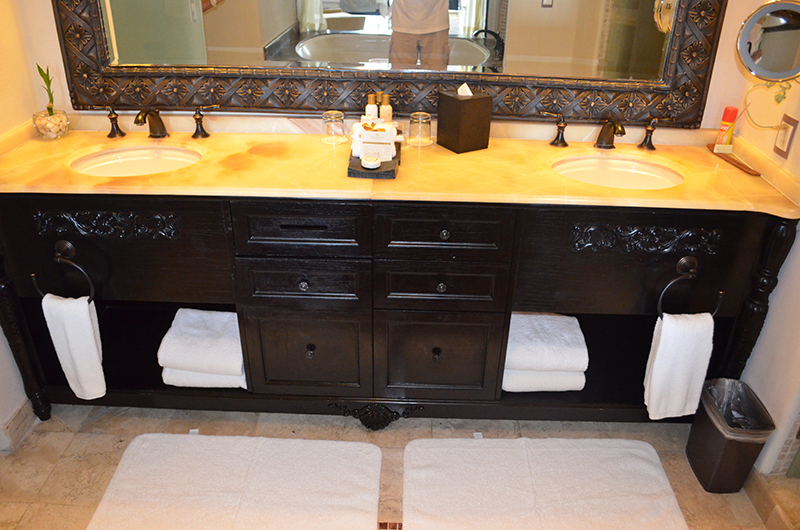 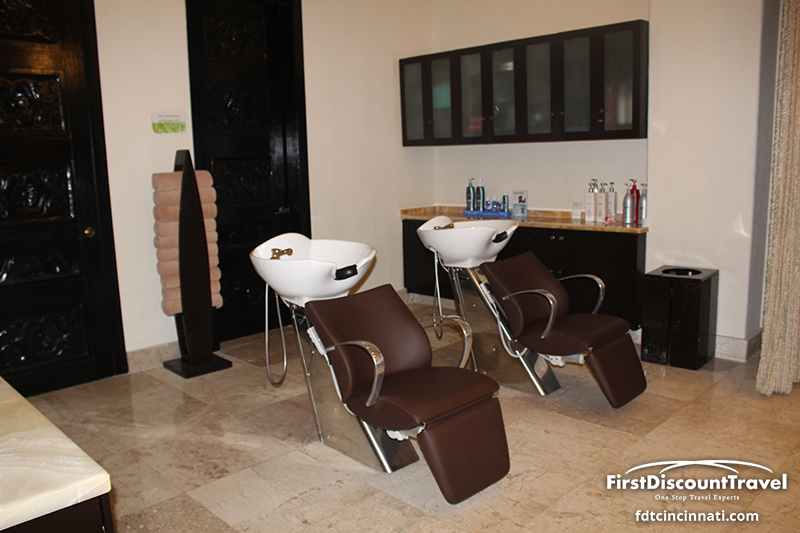 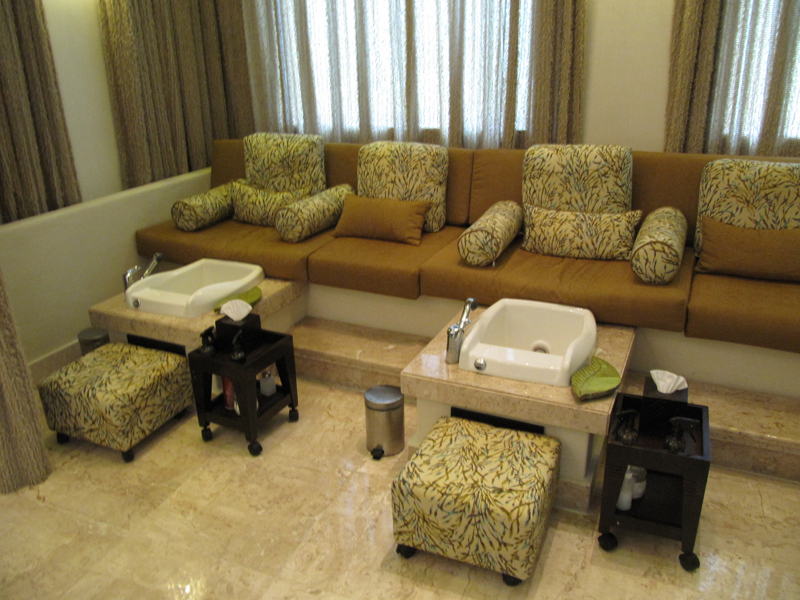 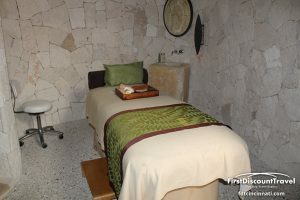 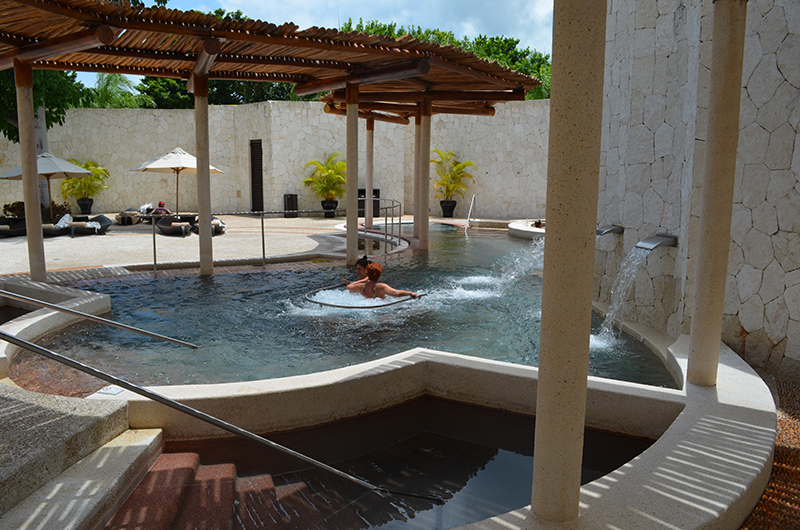 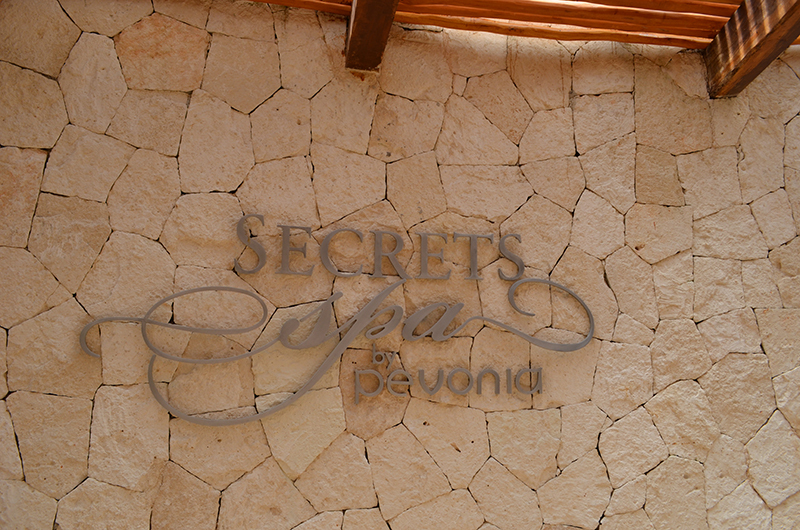 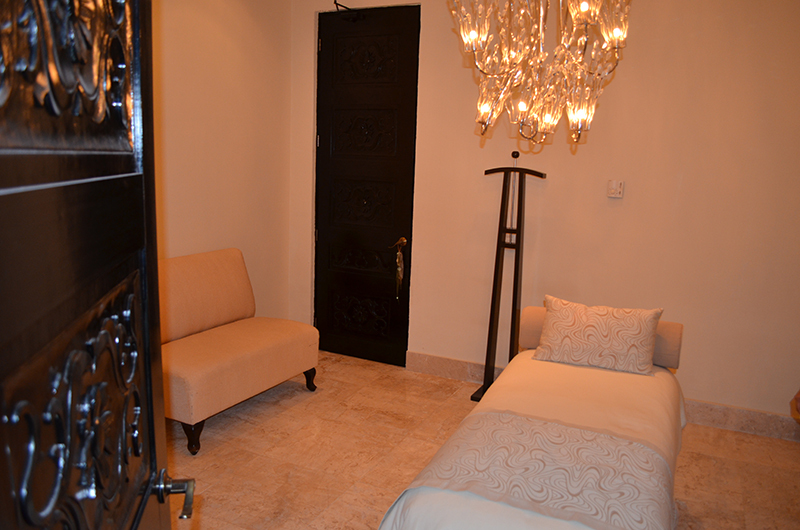 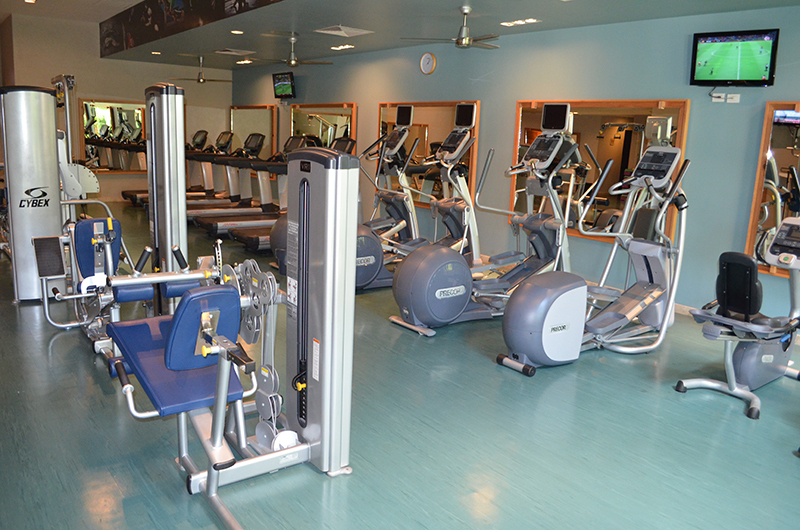 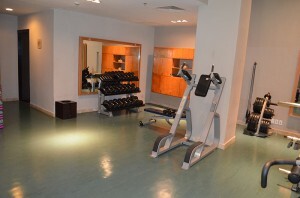 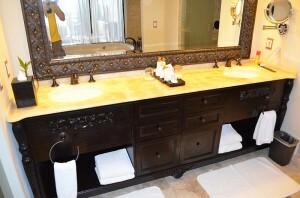 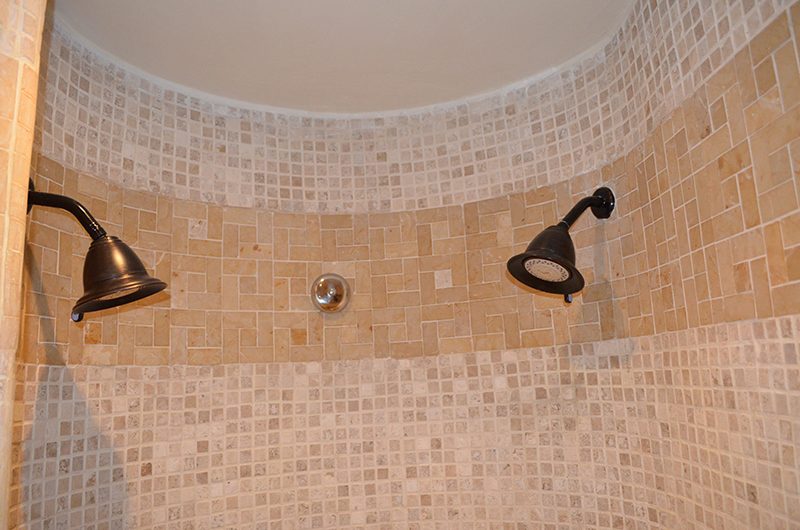 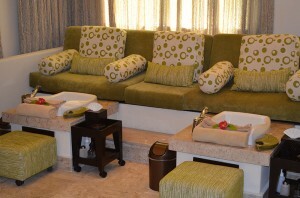 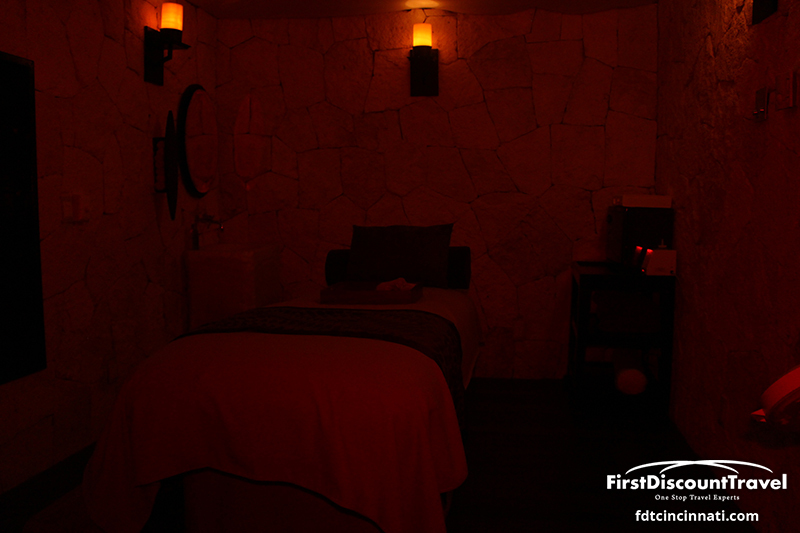 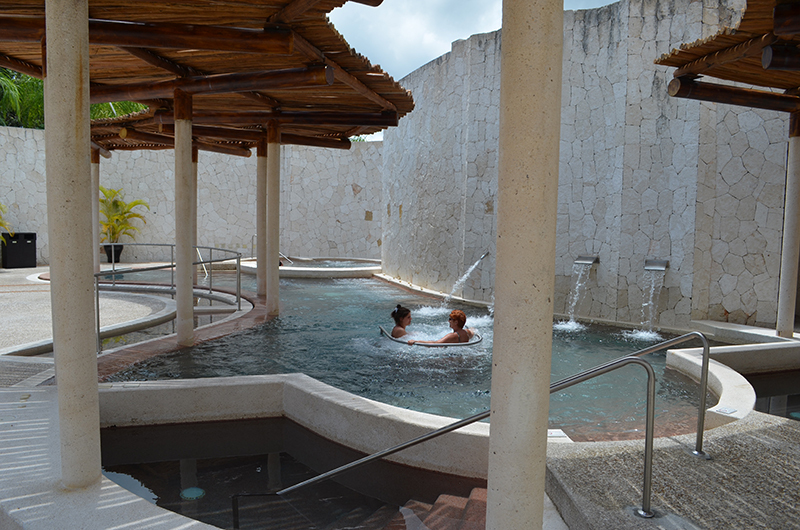 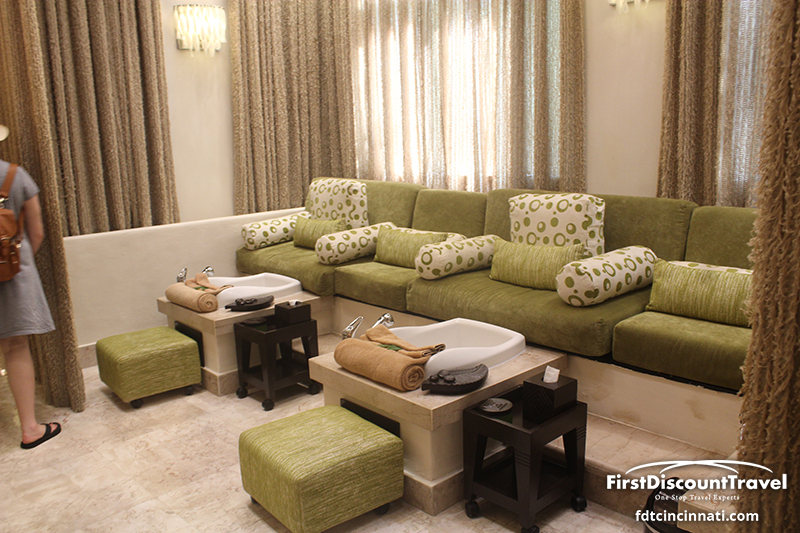 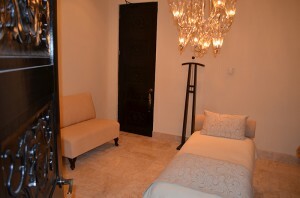 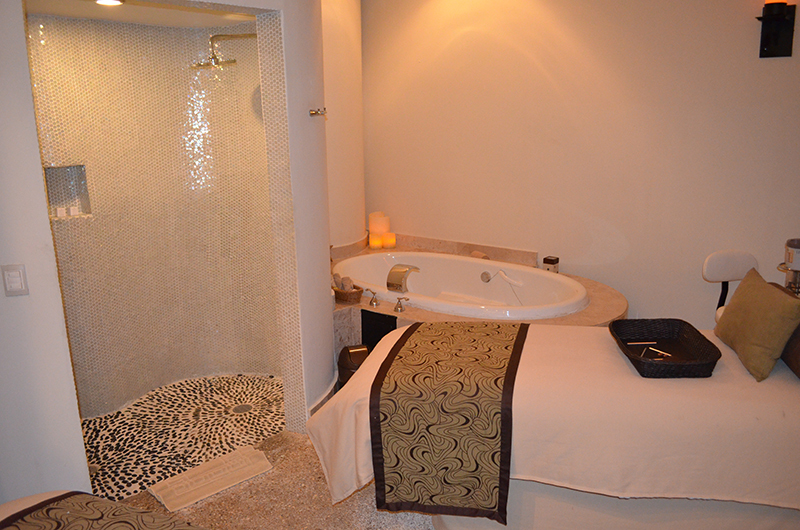 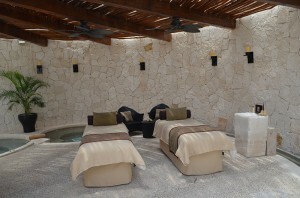 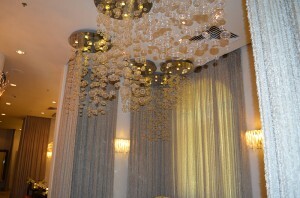 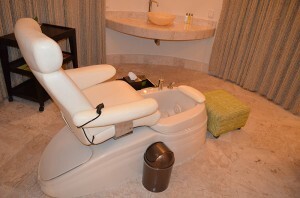 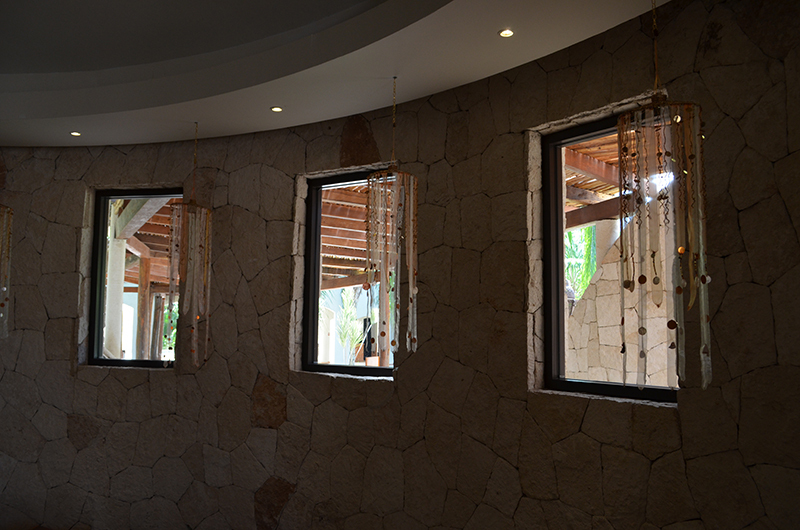 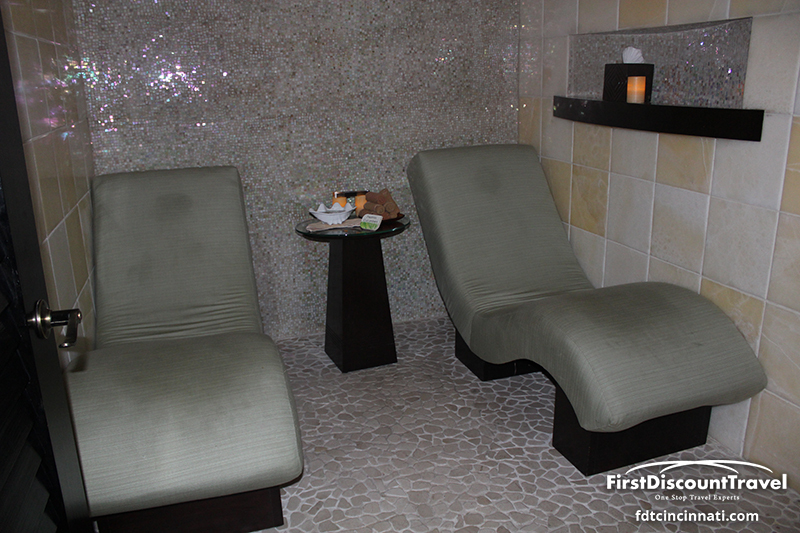 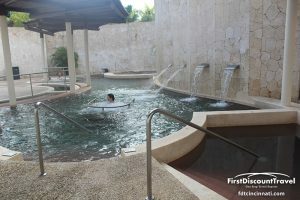 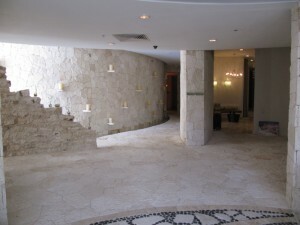 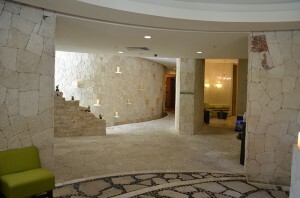 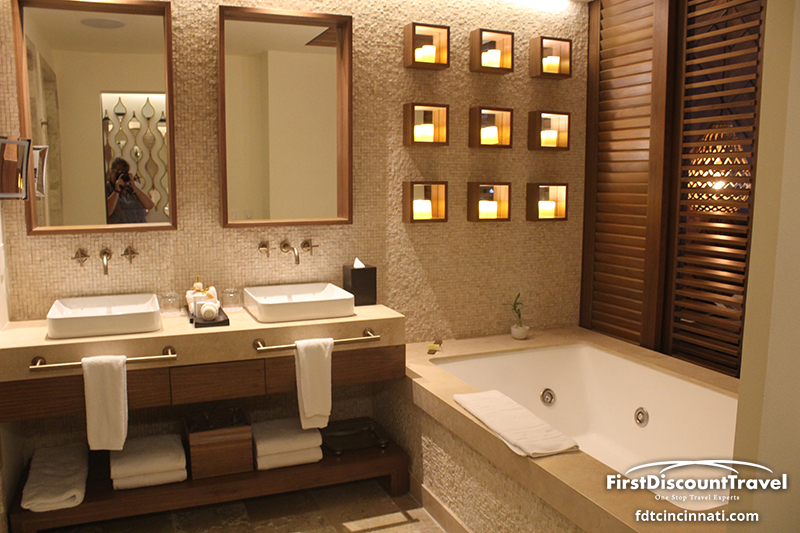 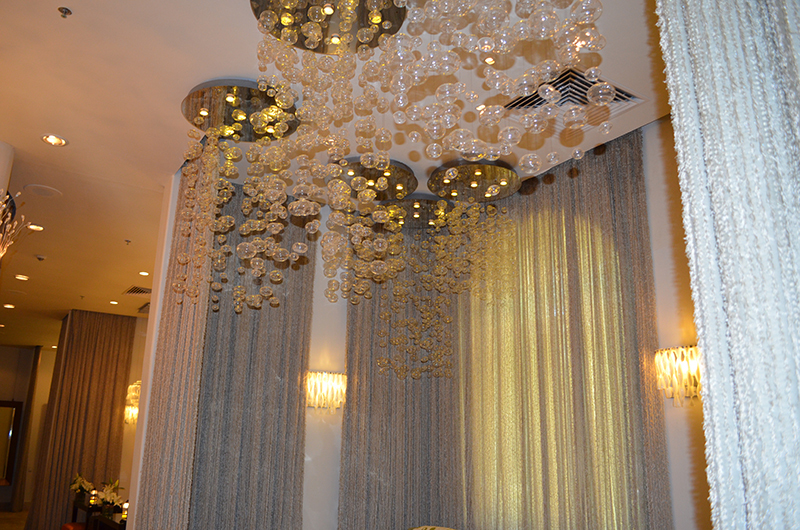 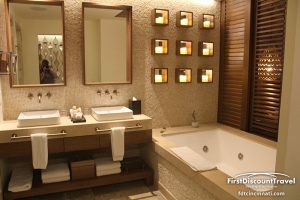 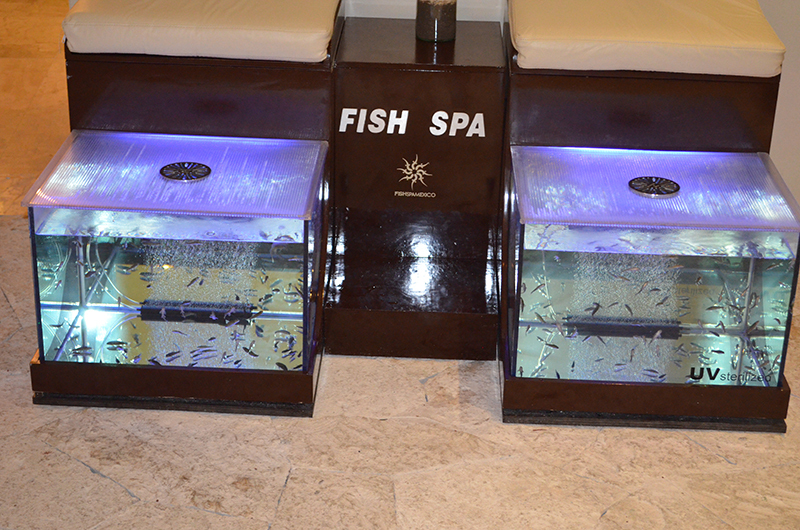 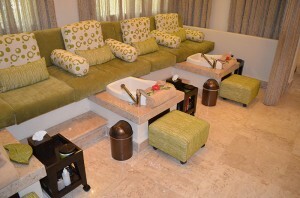 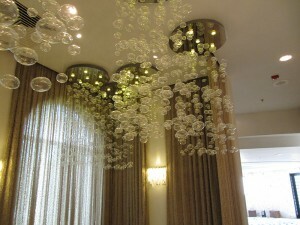 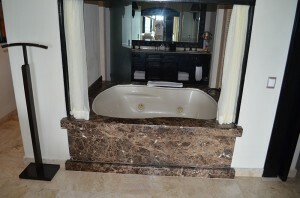 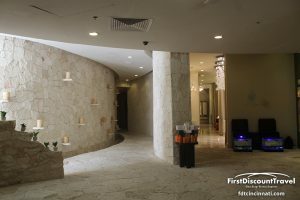 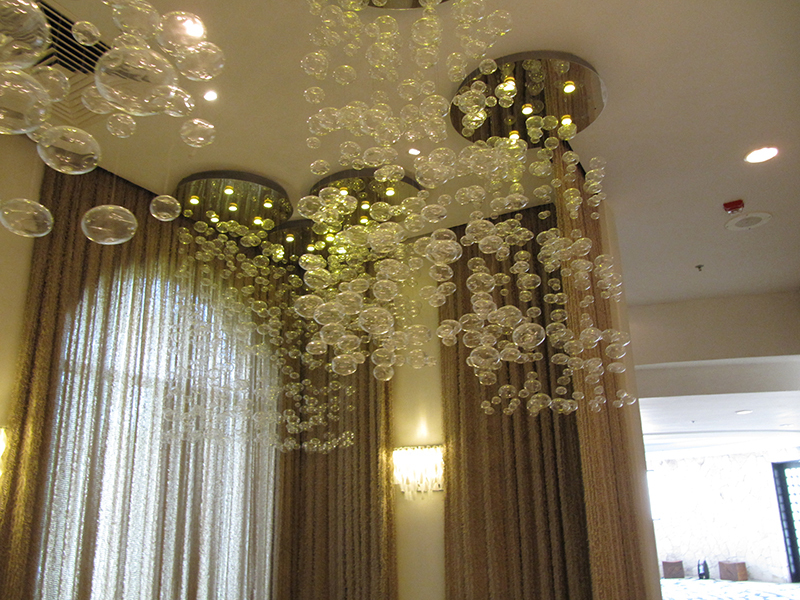 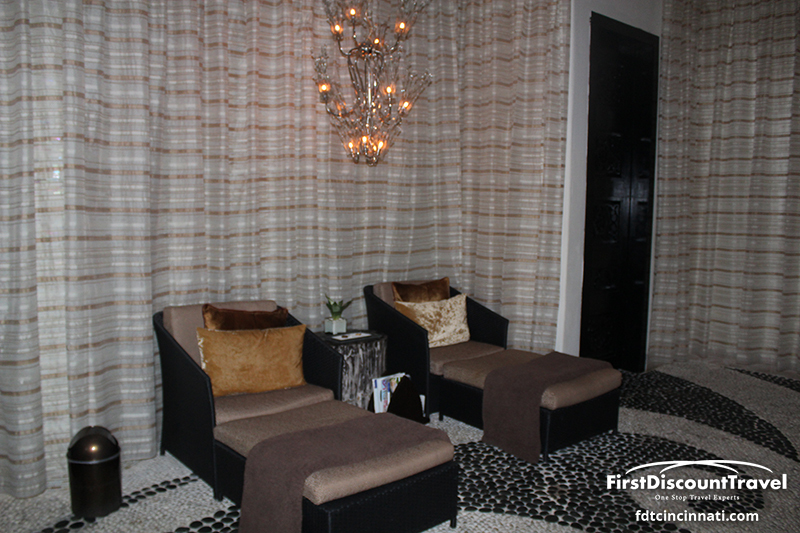 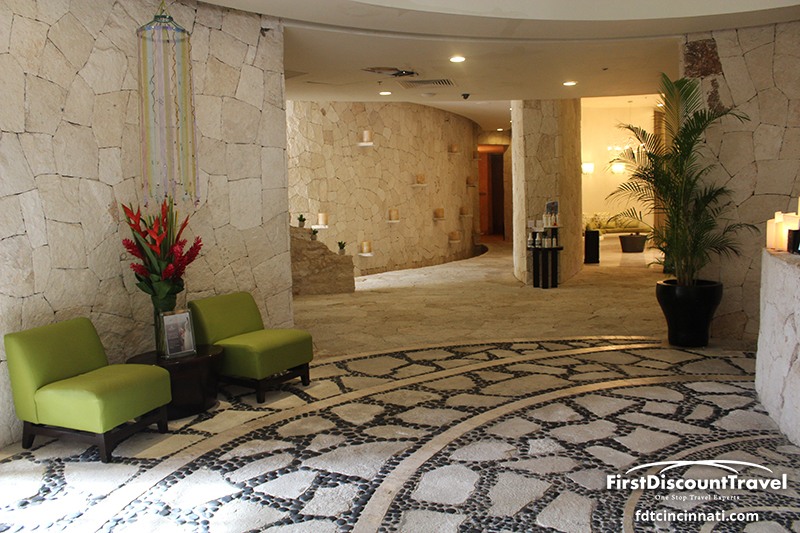 The resort has an amazing 13,000 square foot spa with 20 treatment rooms using the latest Pevonia products. 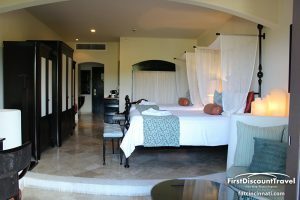 Weddings are complimentary and honeymooners receive the Eternity Honeymoon Package ($800 value) complimentary if they stay for 7 nights in a Preferred club Ocean View Junior Suite or higher. 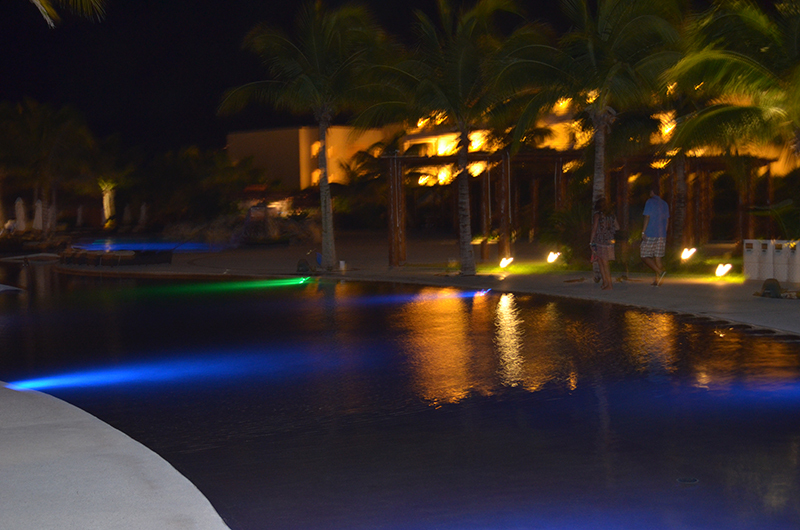 This is an amazing resort! 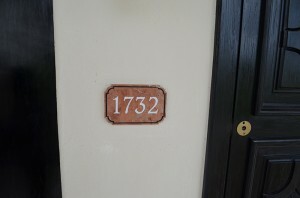 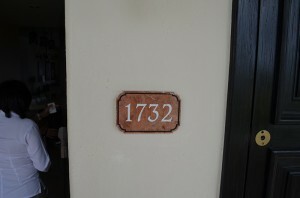 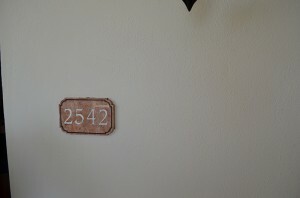 The beach is gorgeous, the pools are amazing, and the rooms are fantastic! This resort has no flaws! 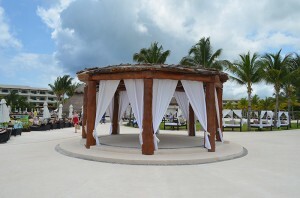 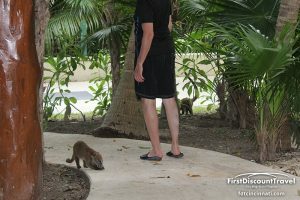 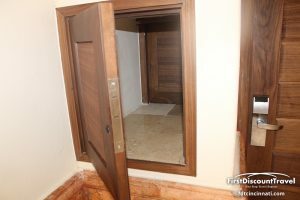 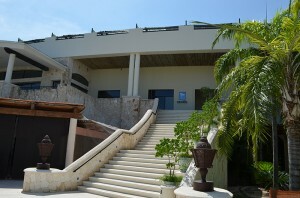 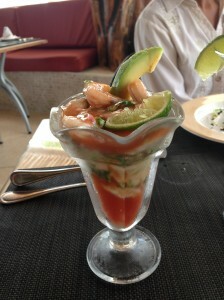 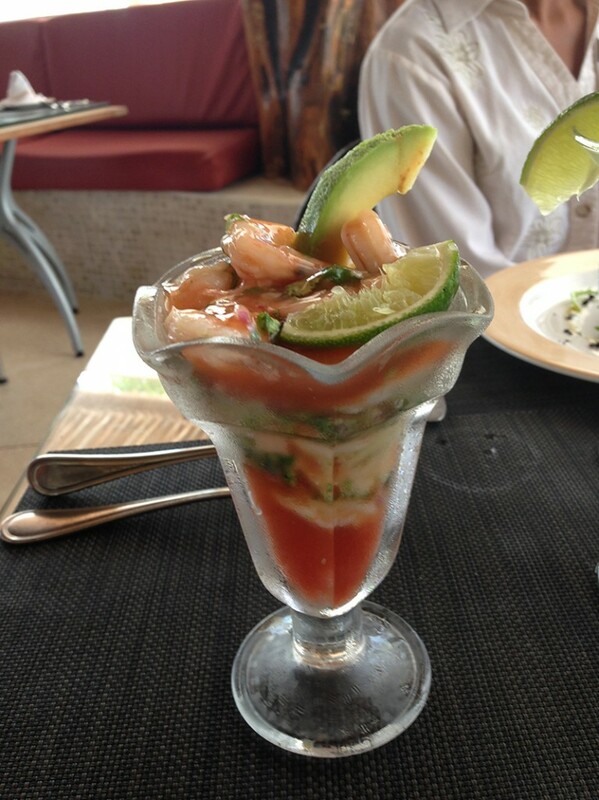 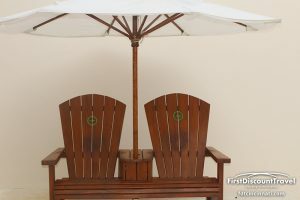 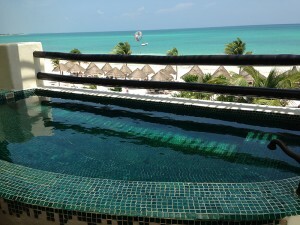 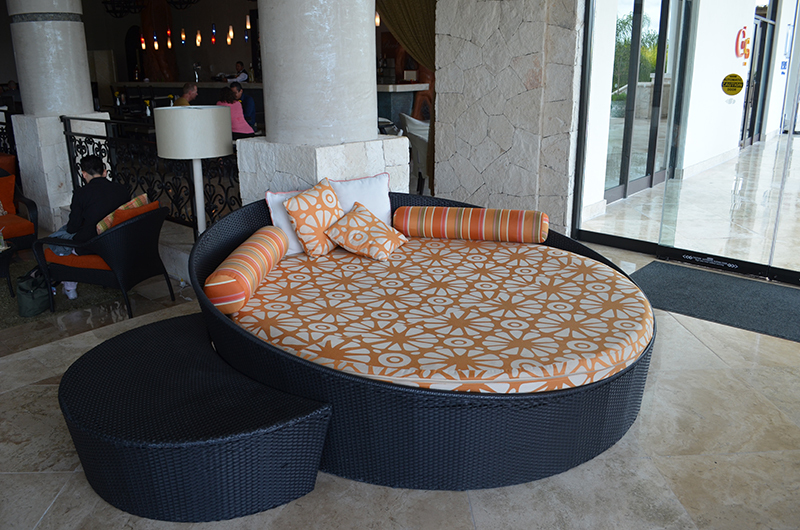 This would be my top choice for honeymooners in Mexico.